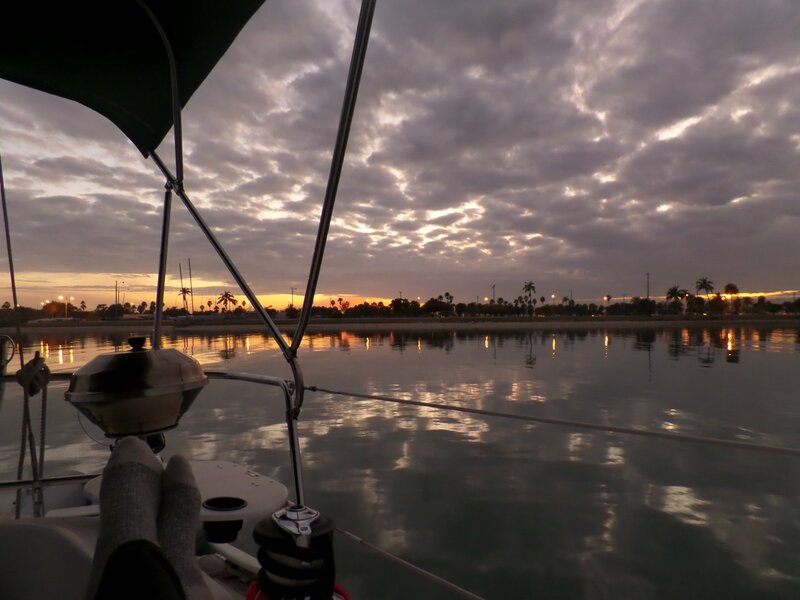 An overnight stop. 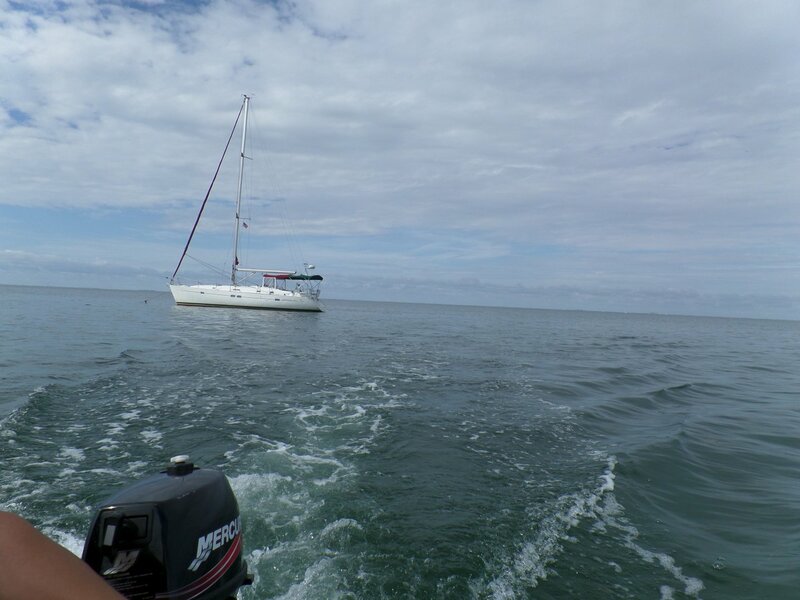 Uncharted shoal at the entrance � it was an interesting approach at low tide. 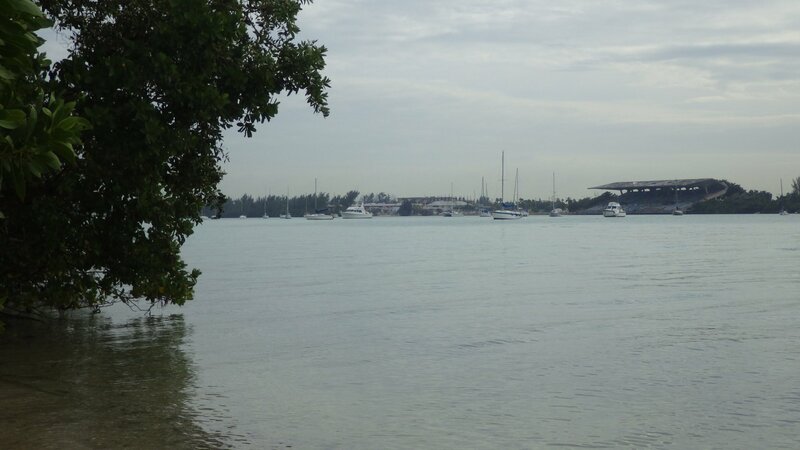 BTW, the tidal range in this area is up to 8 ft! 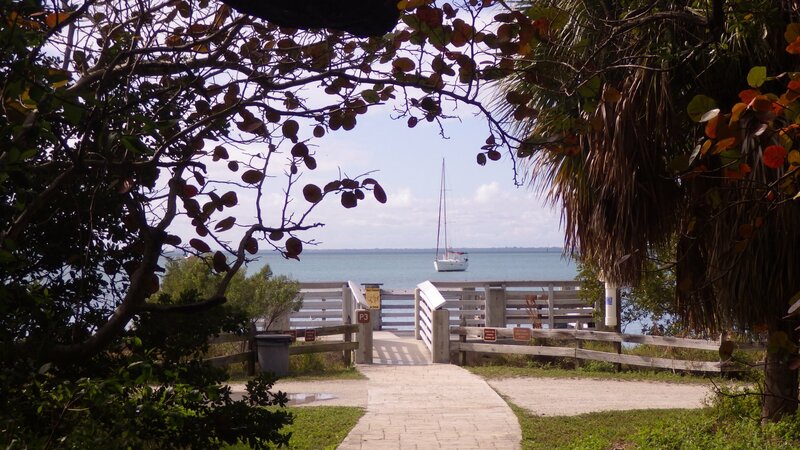 A stop just before St Augustine (aiming to arrive there in the morning). 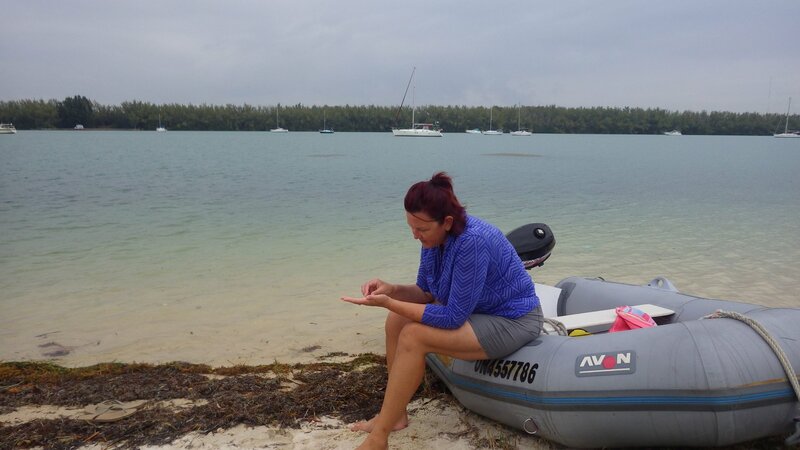 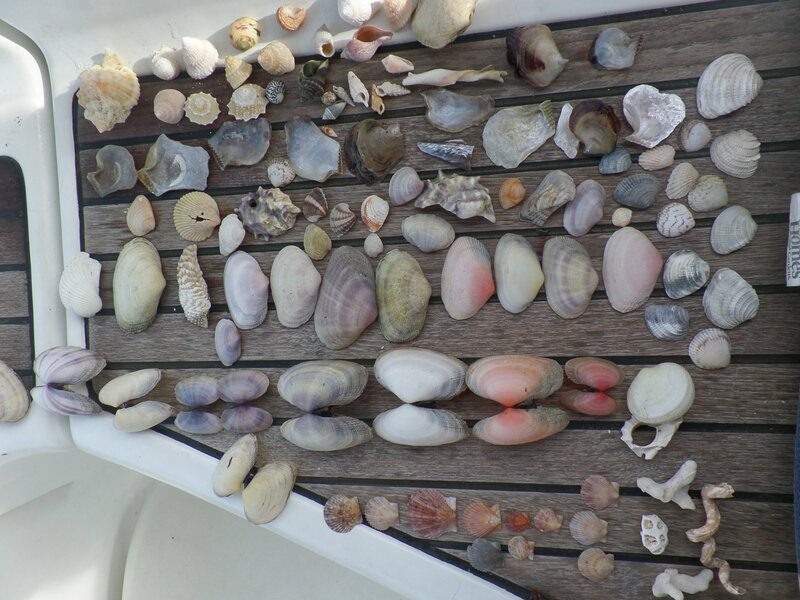 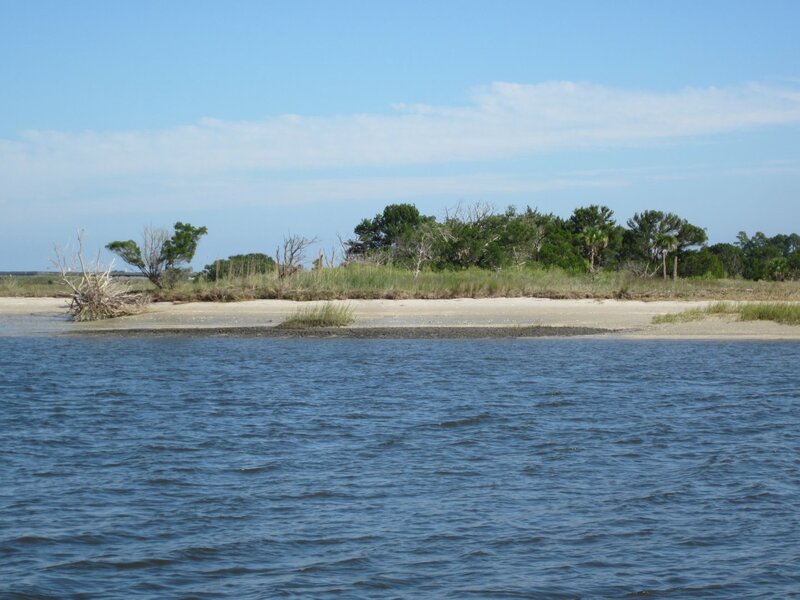 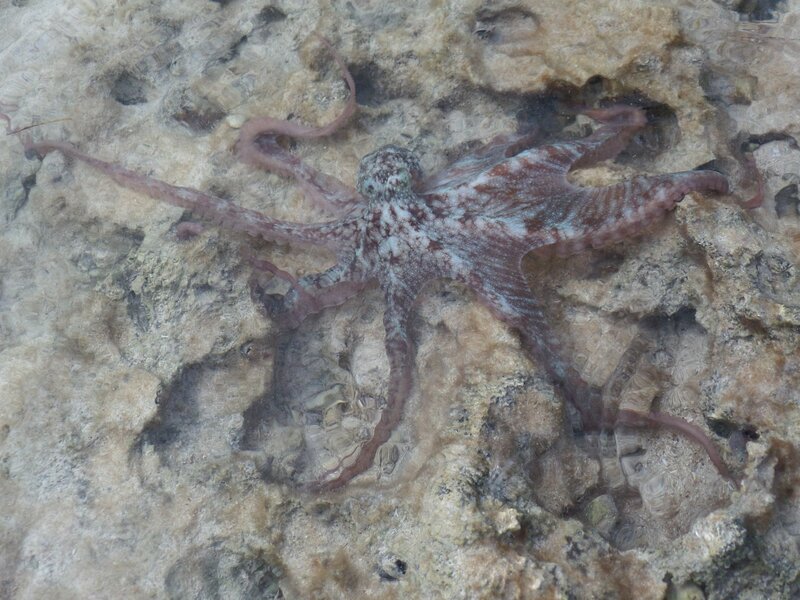 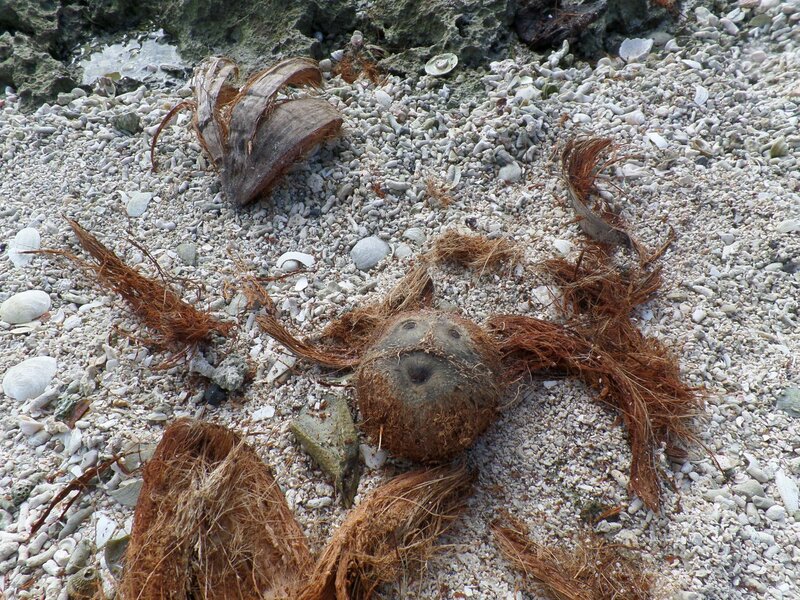 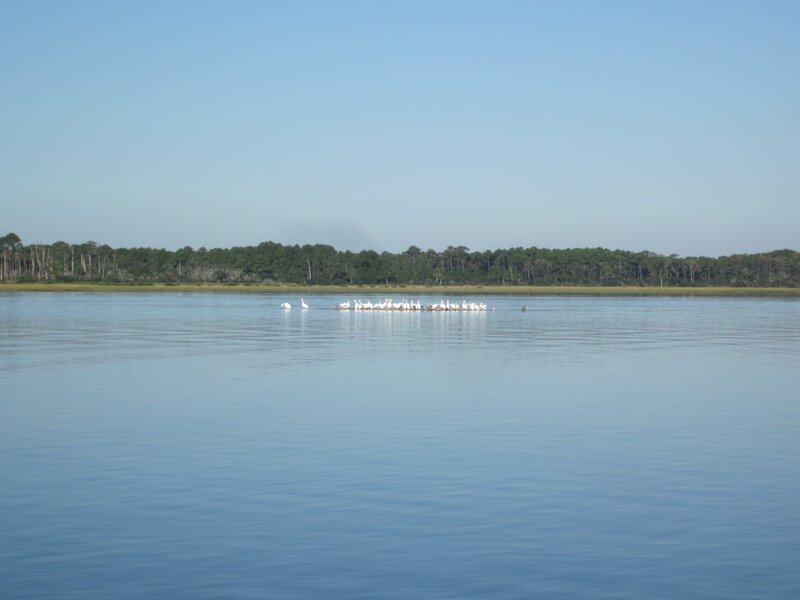 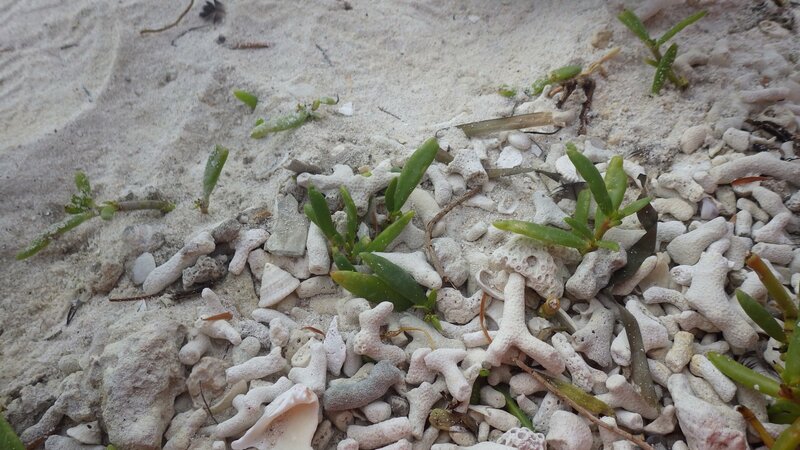 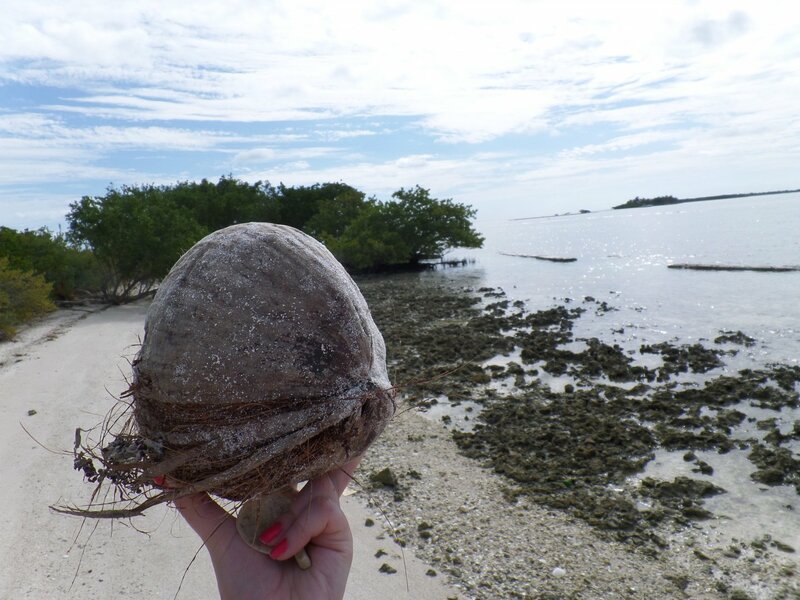 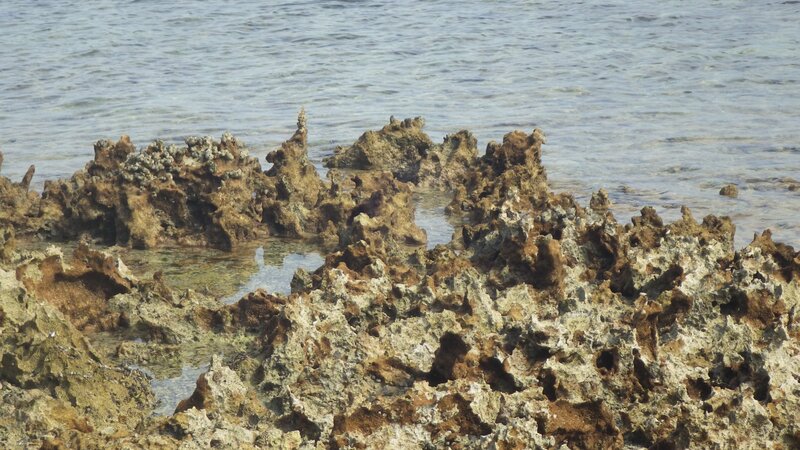 Pedaled a dinghy to the shore � mountains of oyster shells, lots of no-see-ems! 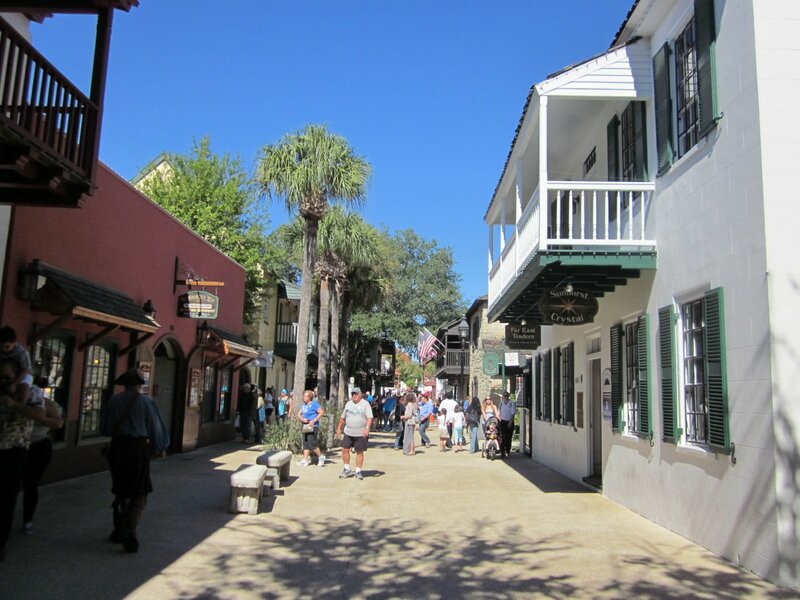 Pretty historical town, mainly tourists attractions, pleasant to walk. 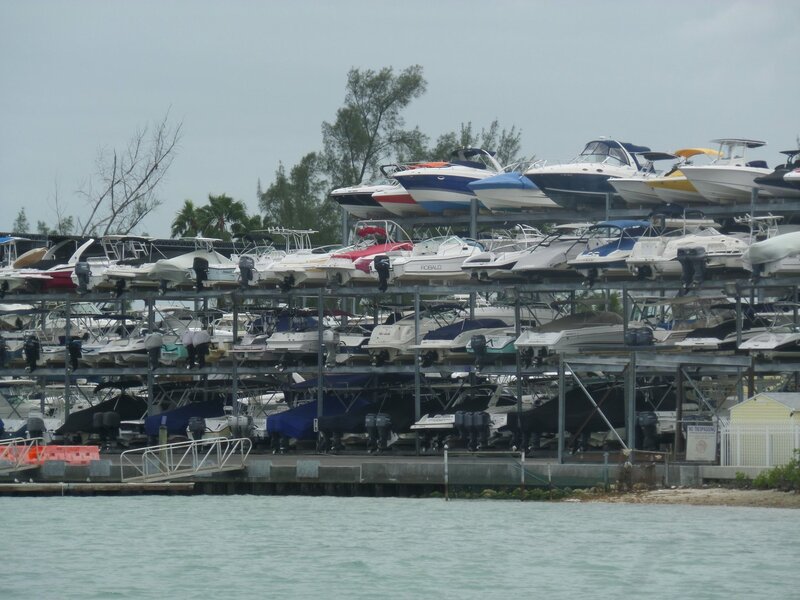 No cruisers' necessities nearby. 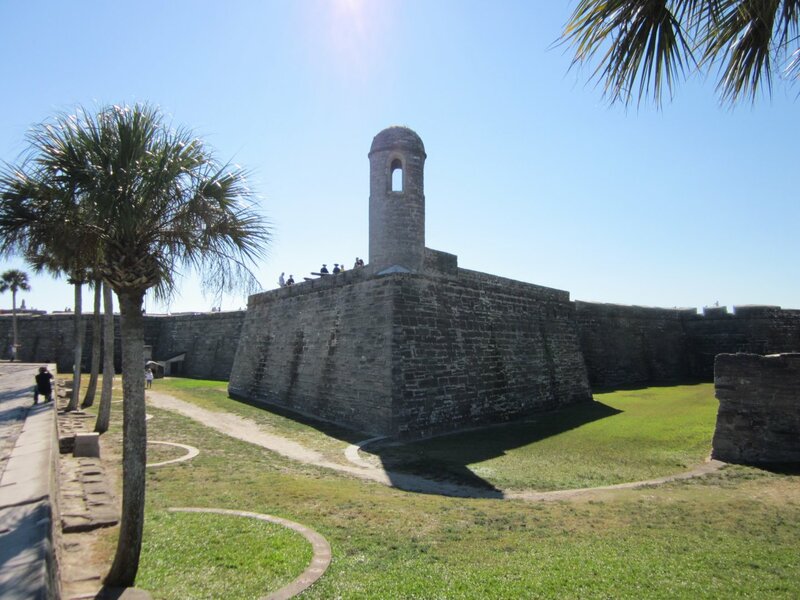 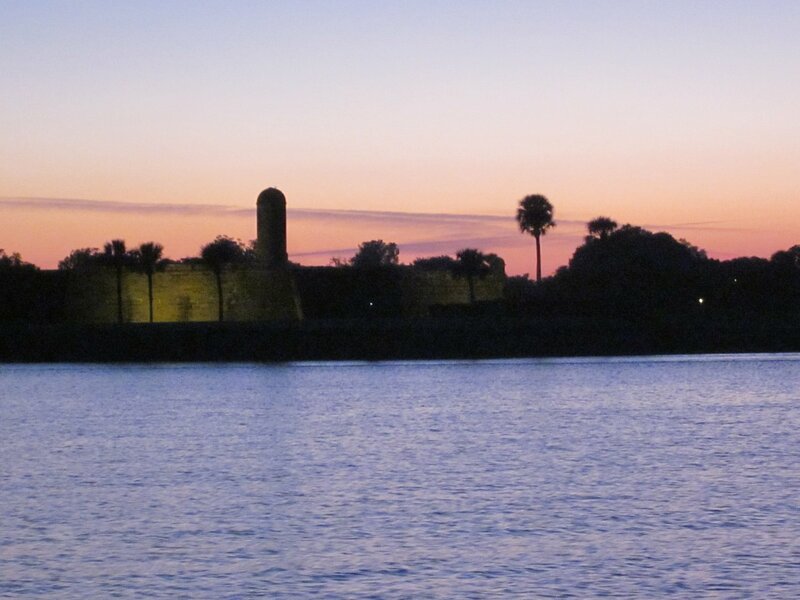 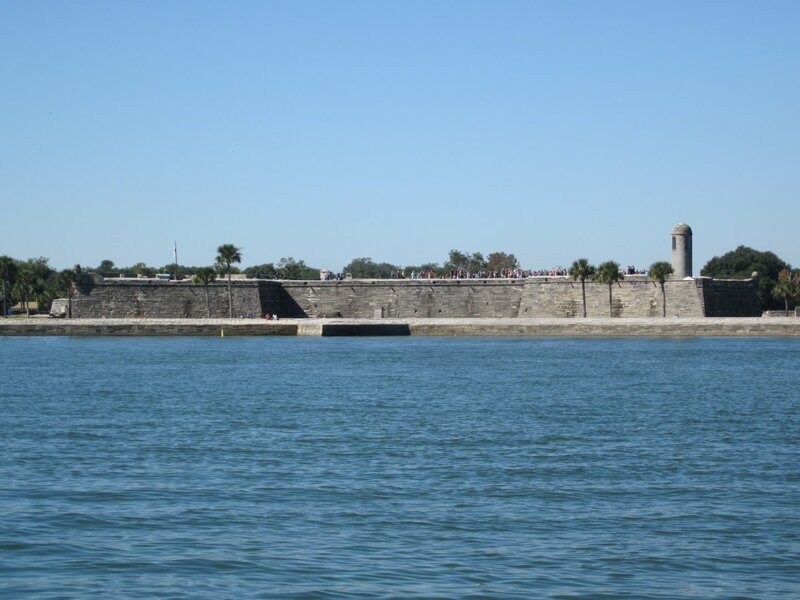 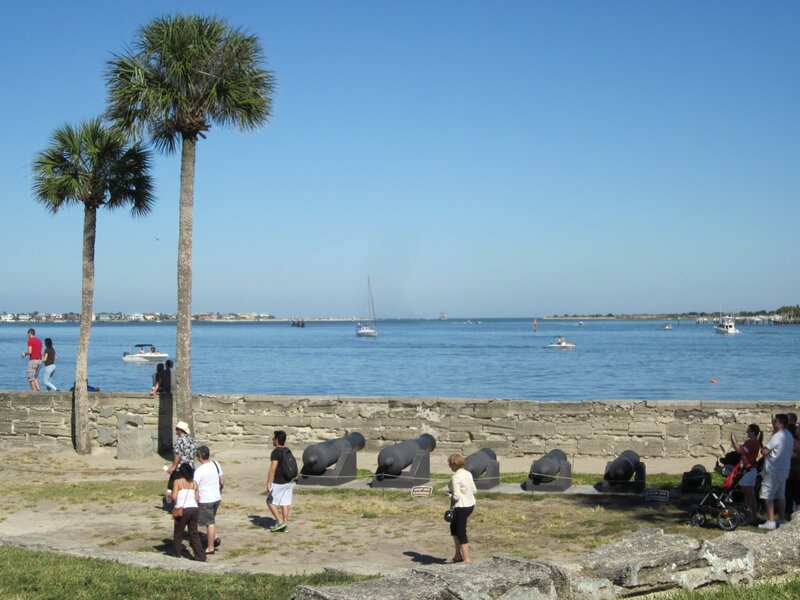 Anchored right near Castillo de San Marcos fort. 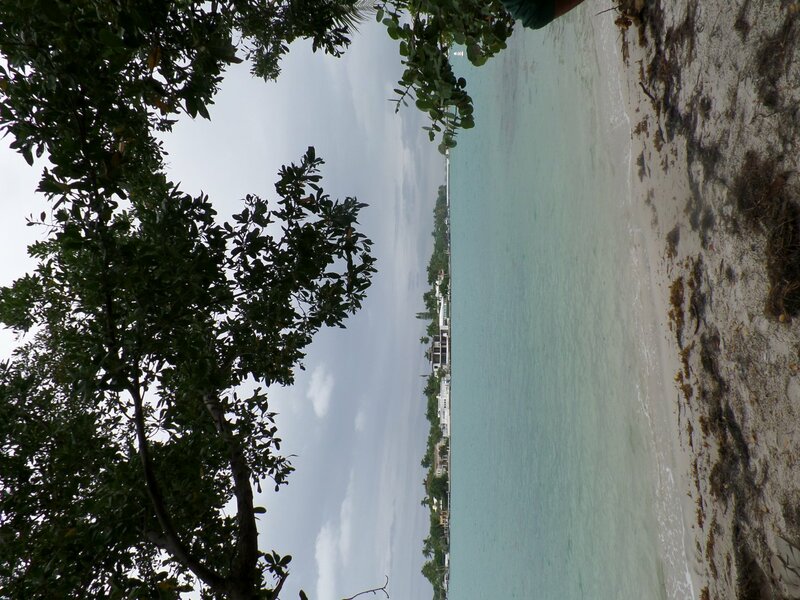 Scenic place! 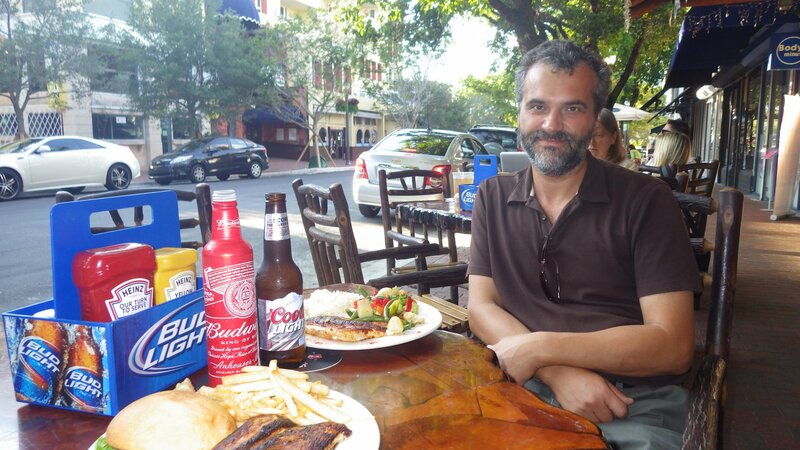 Had a modest restaurant lunch in town. 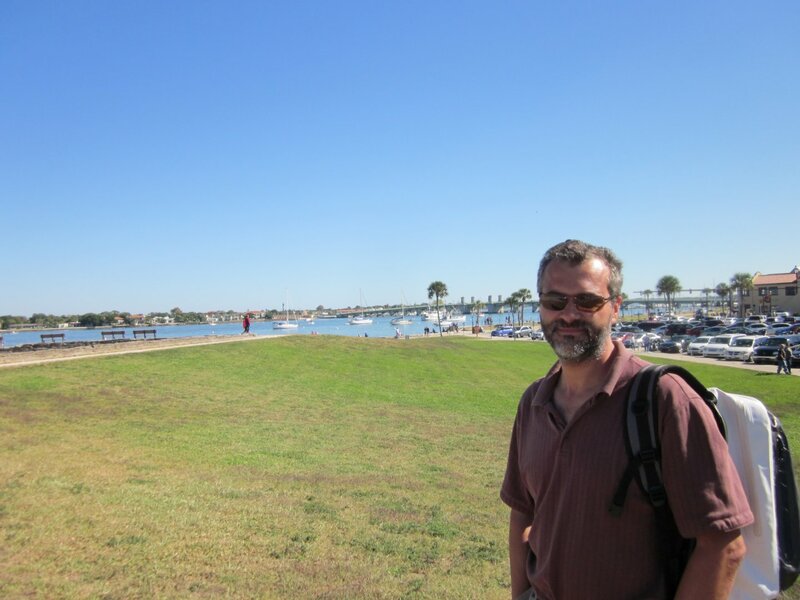 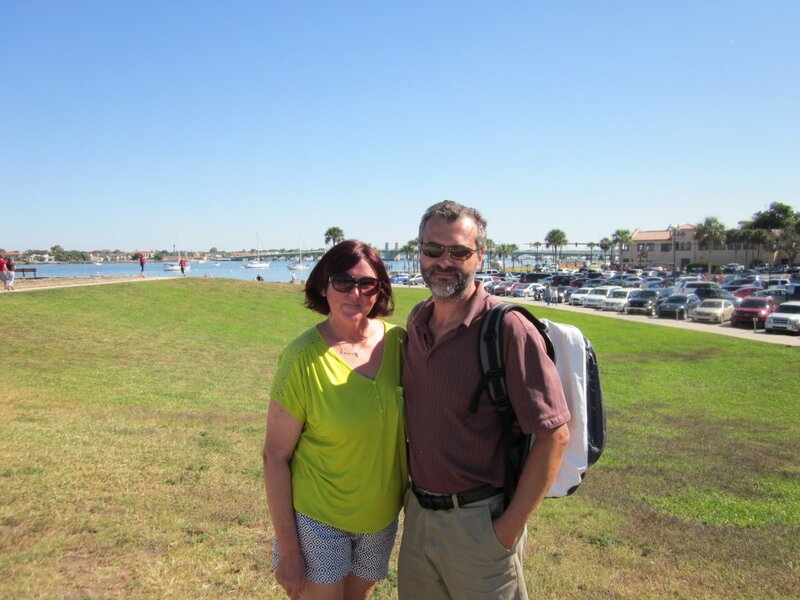 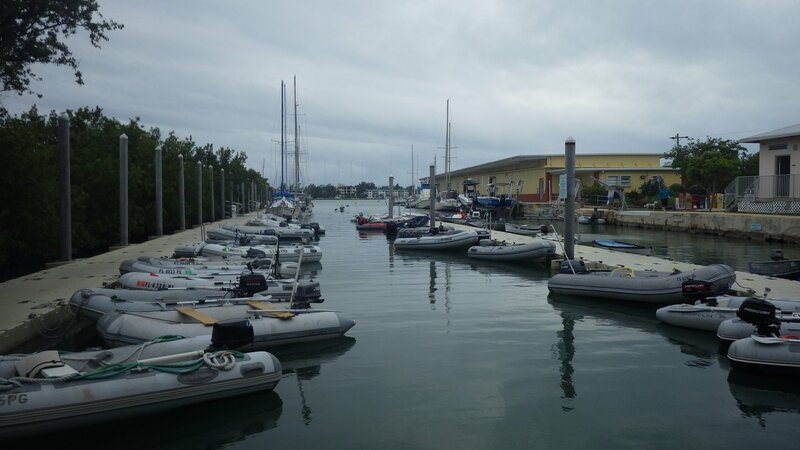 Dinghied across the harbor to a Vilano Beach dock � walked to the ocean beach, picked up groceries. 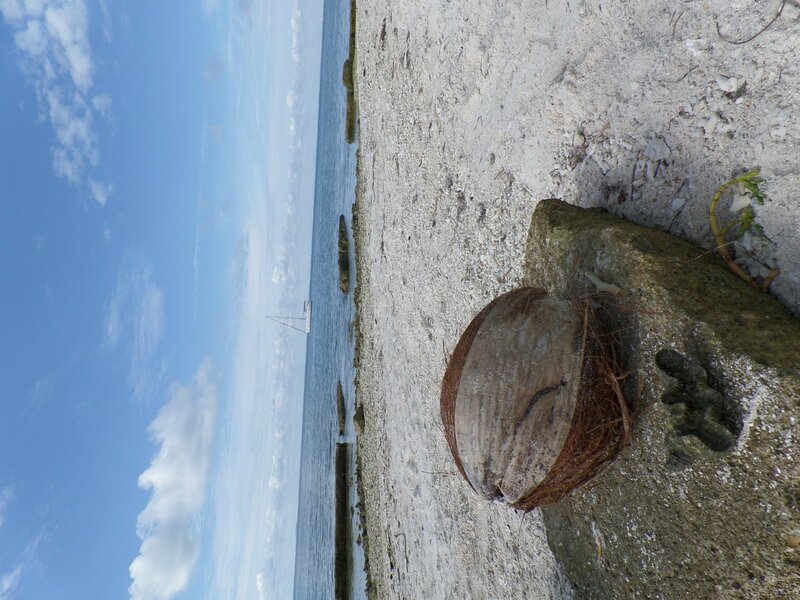 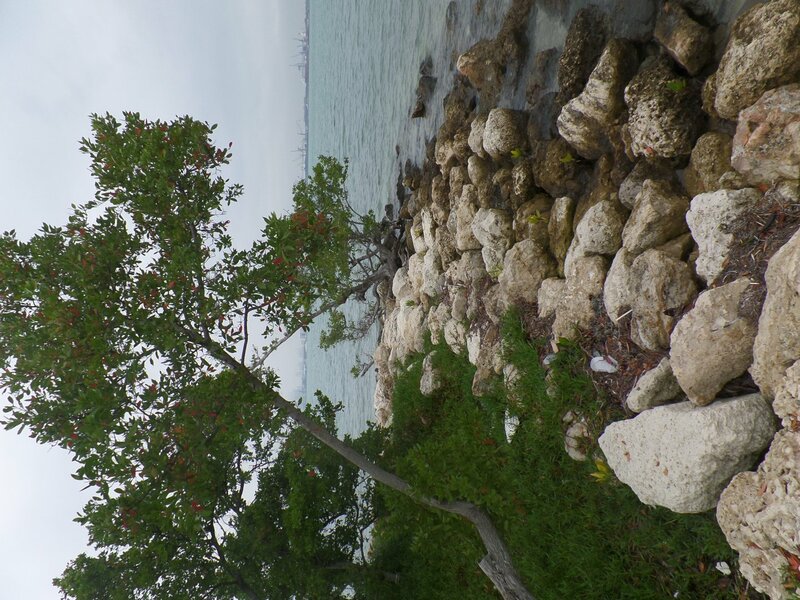 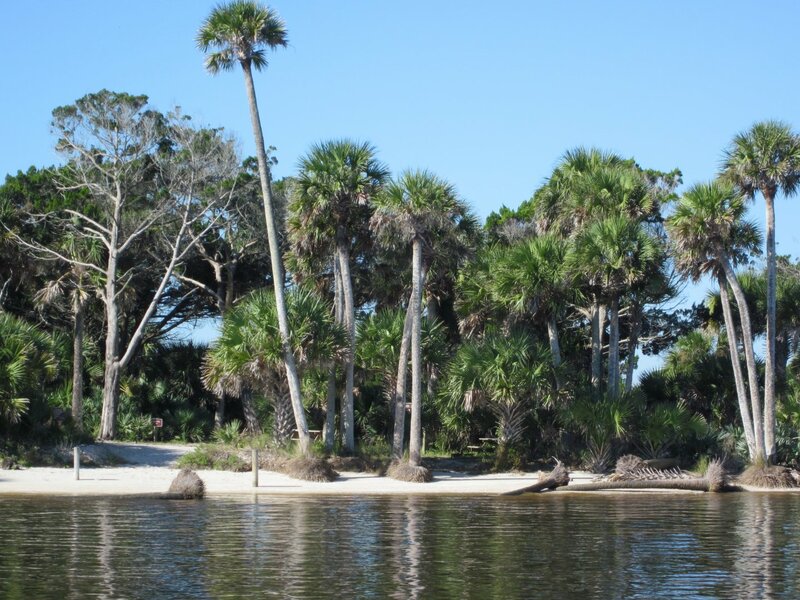 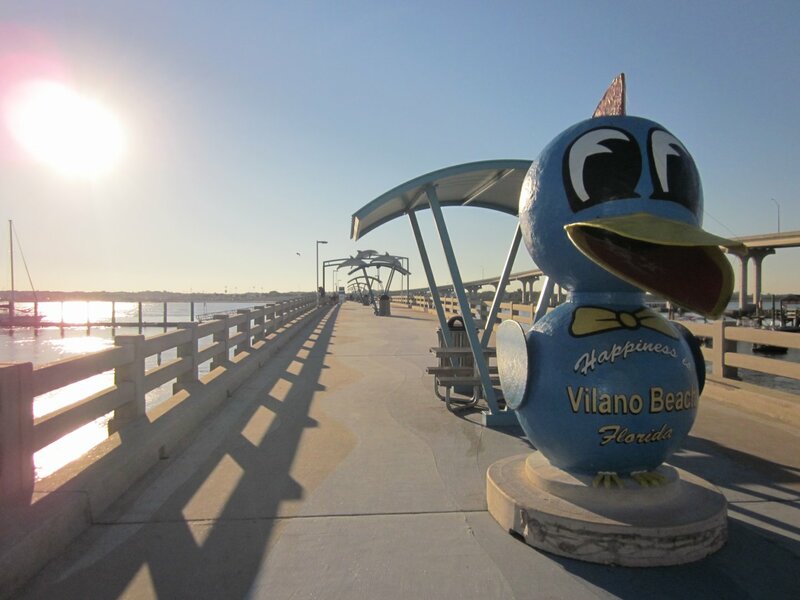 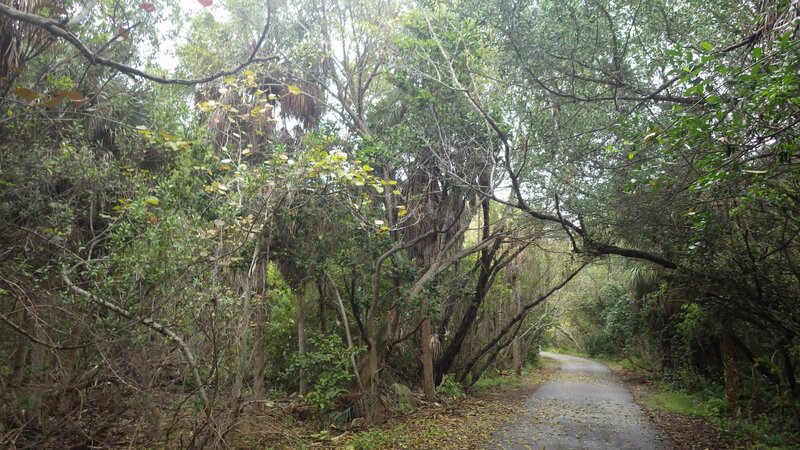 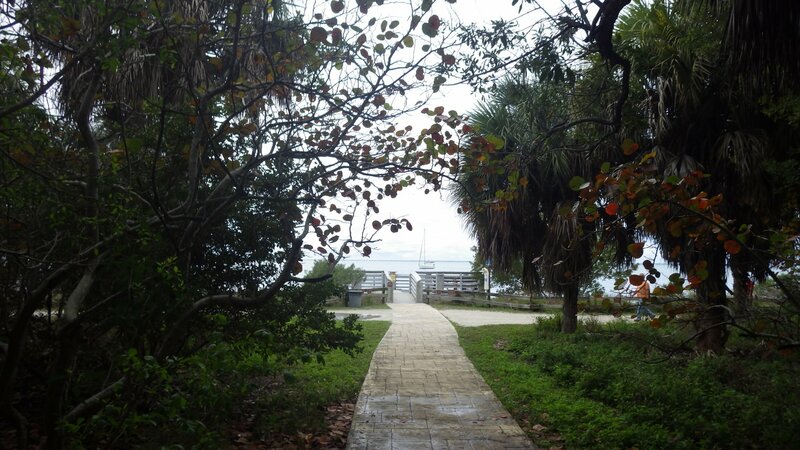 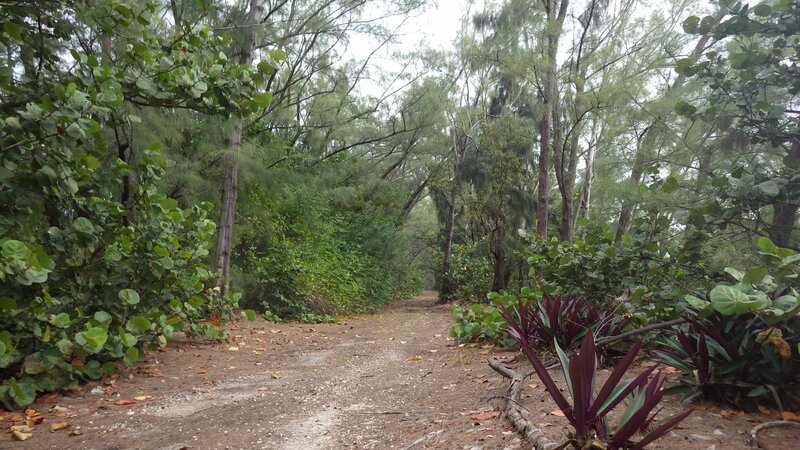 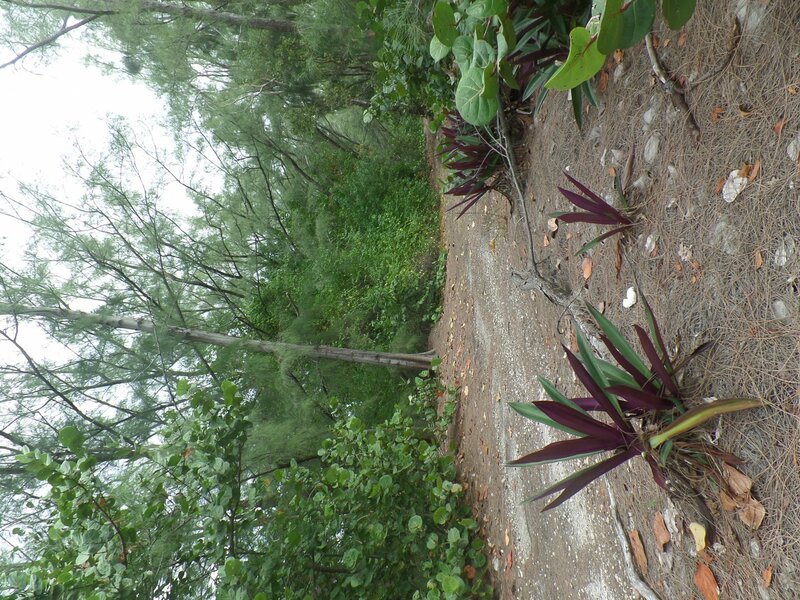 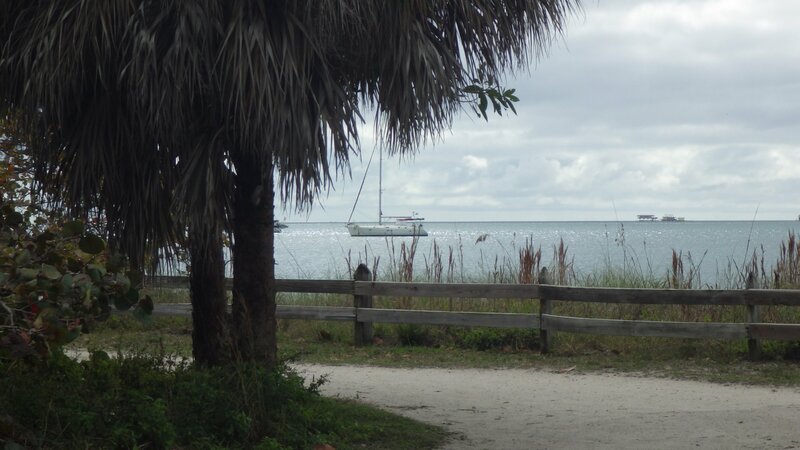 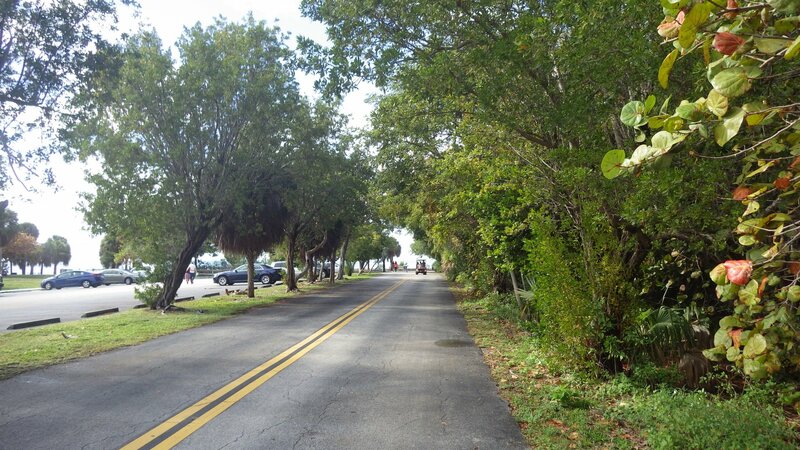 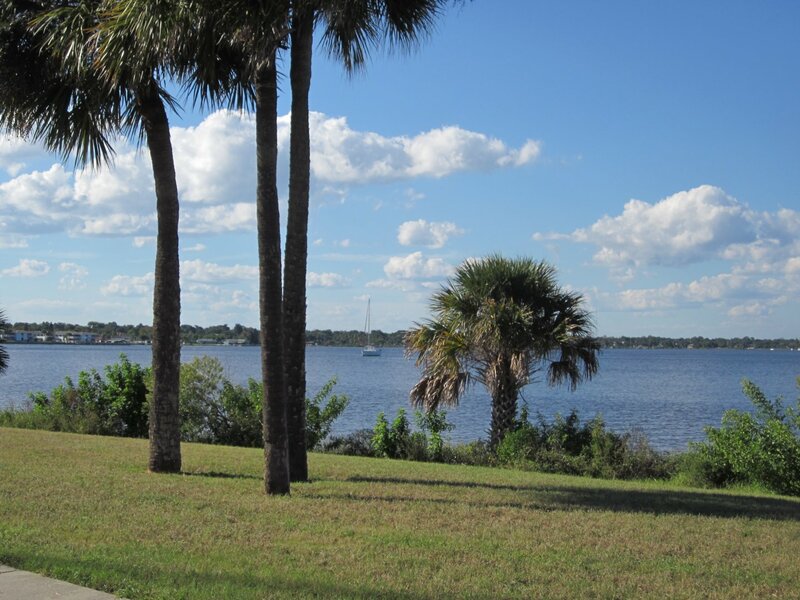 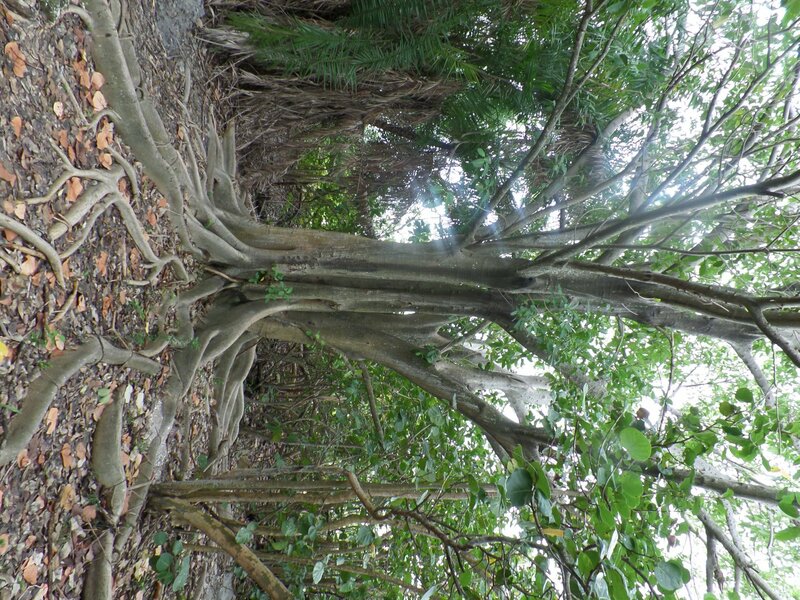 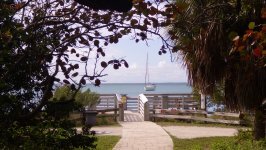 Liked the Vilano beach � humble spot with near-by necessities. 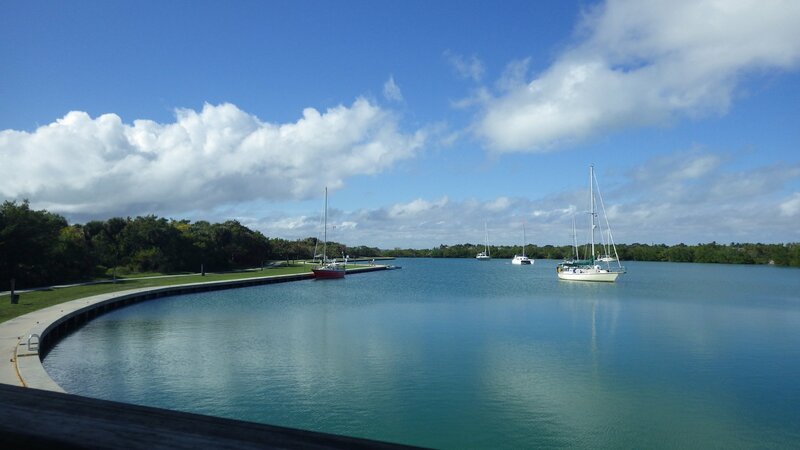 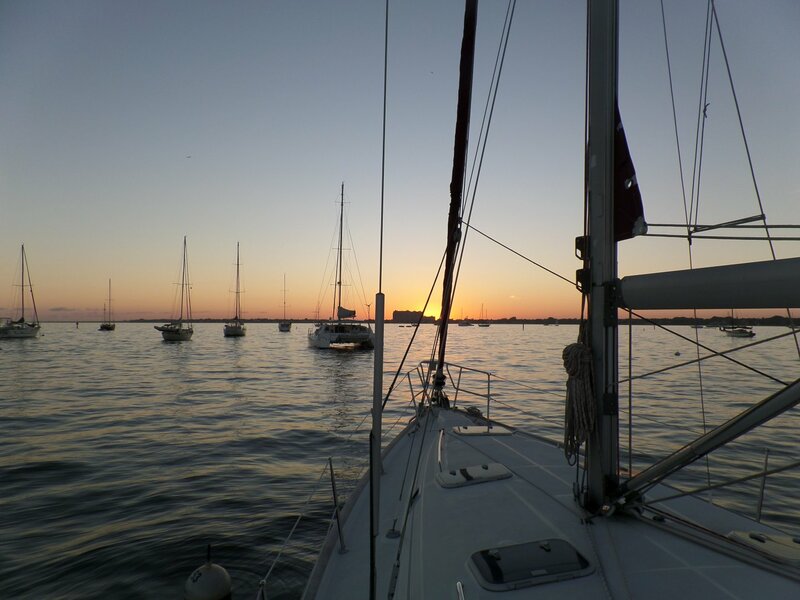 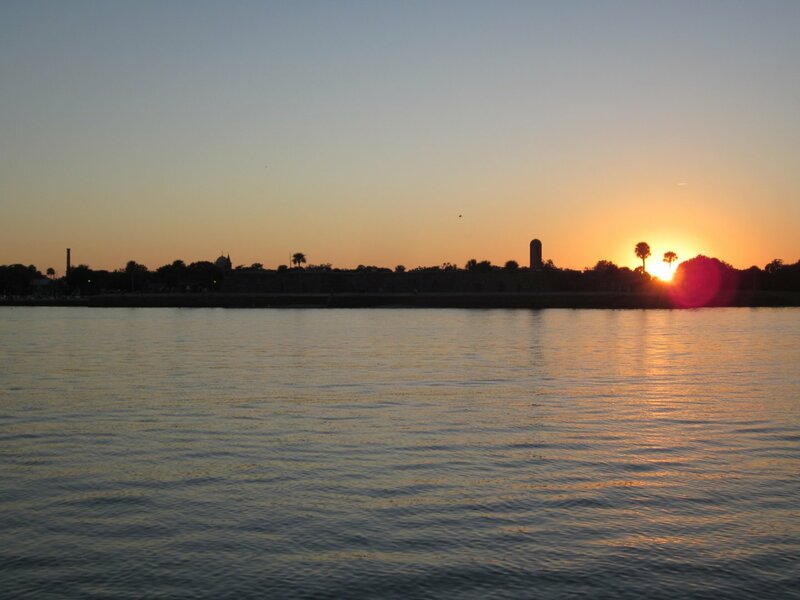 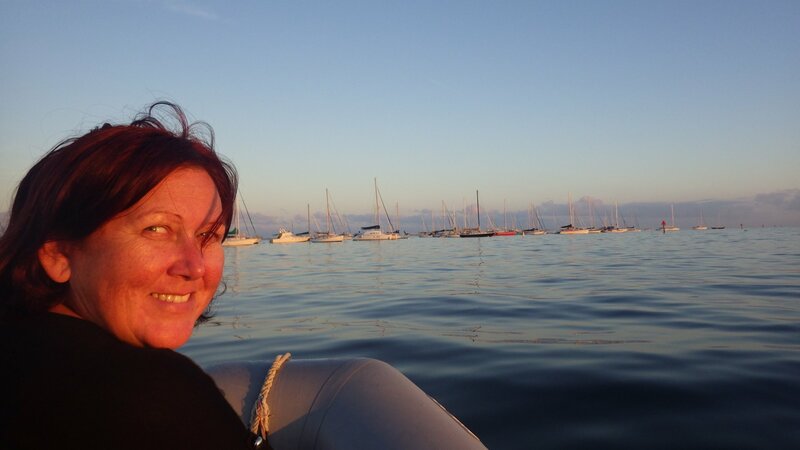 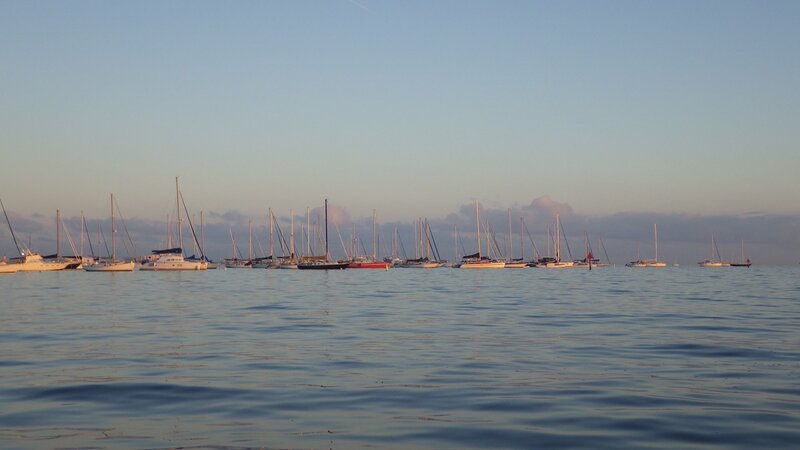 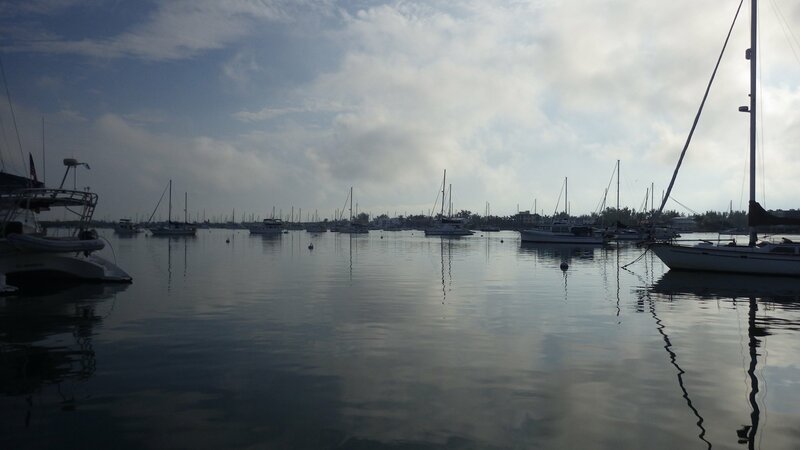 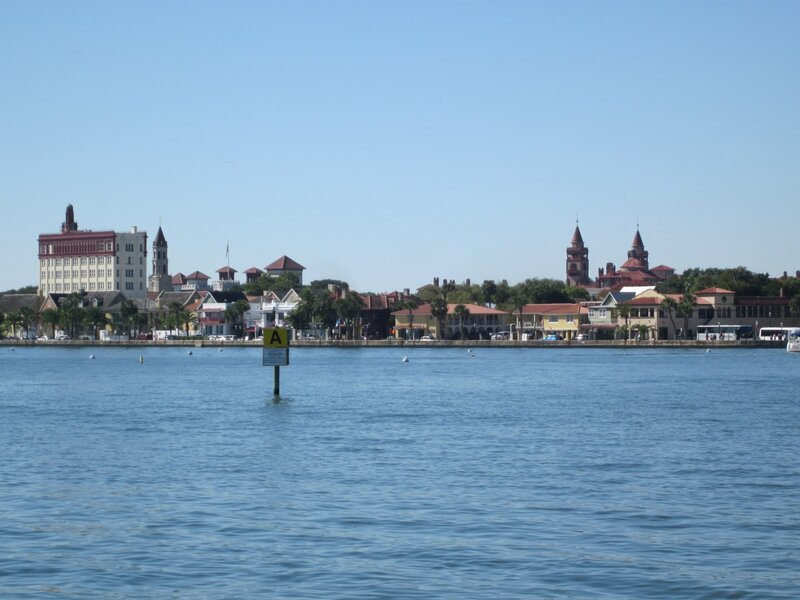 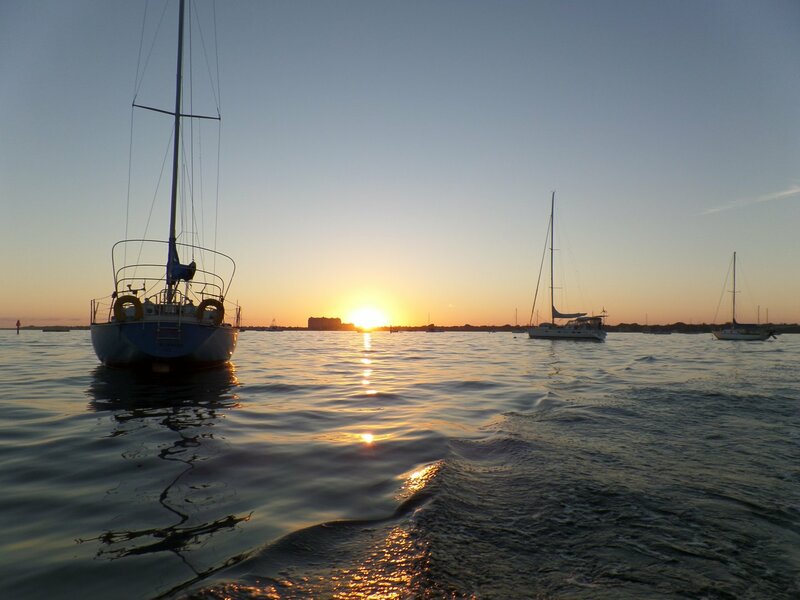 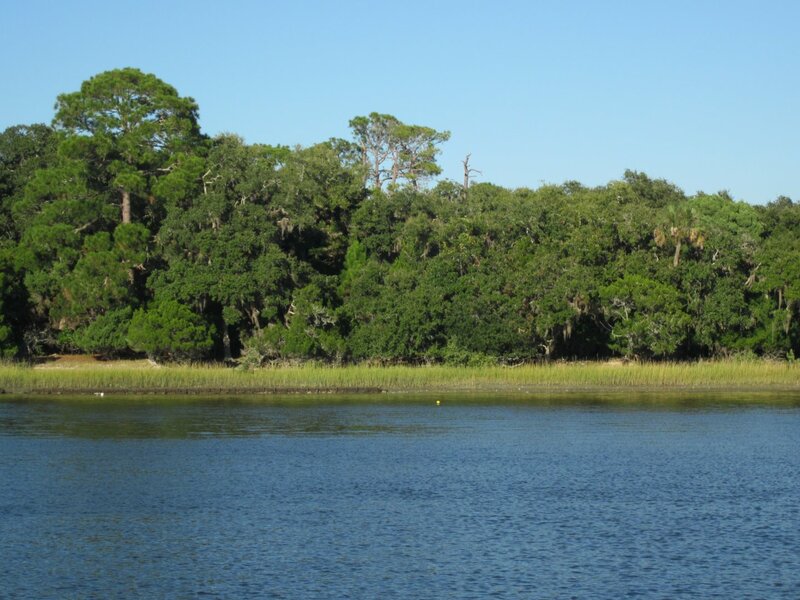 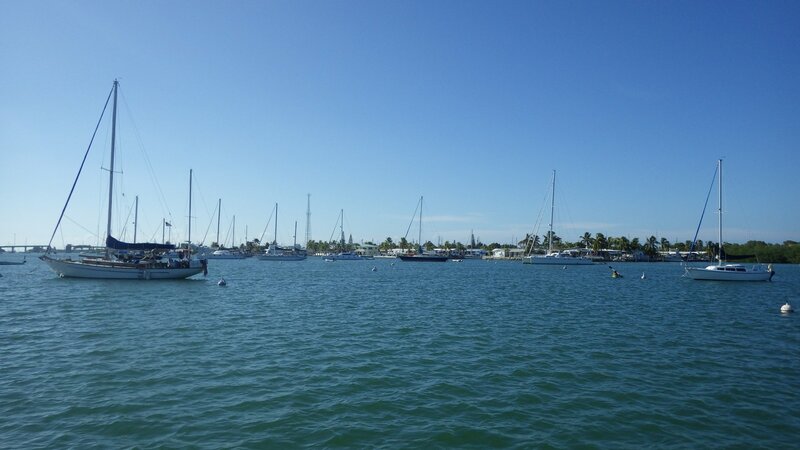 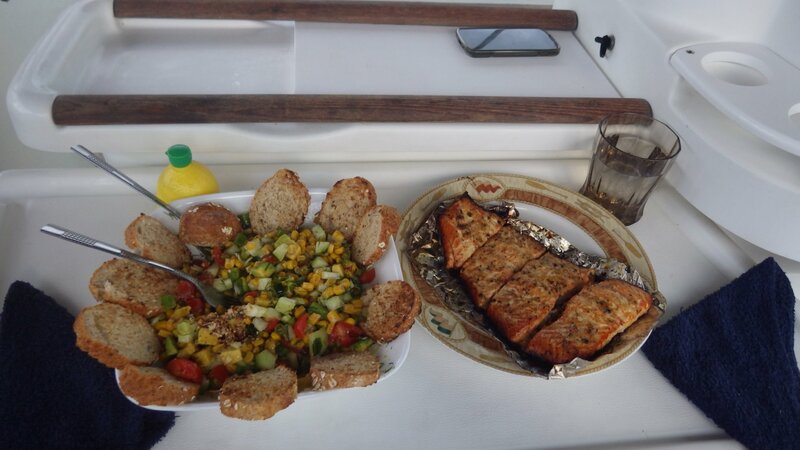 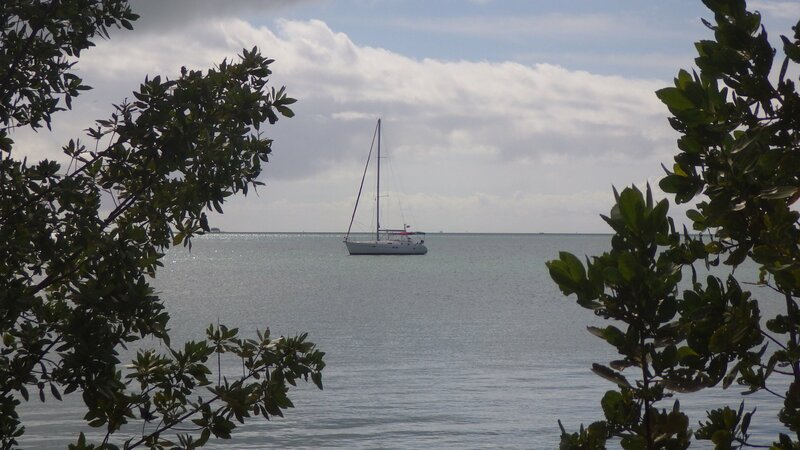 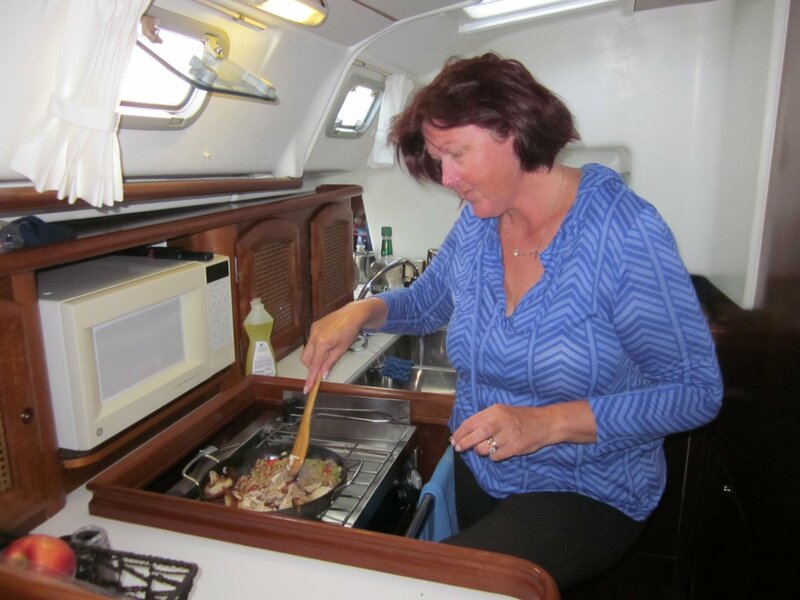 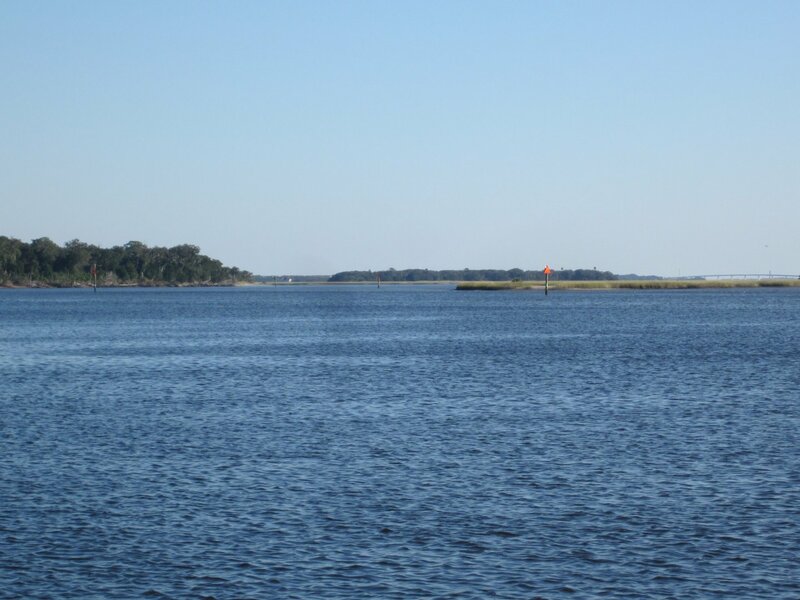 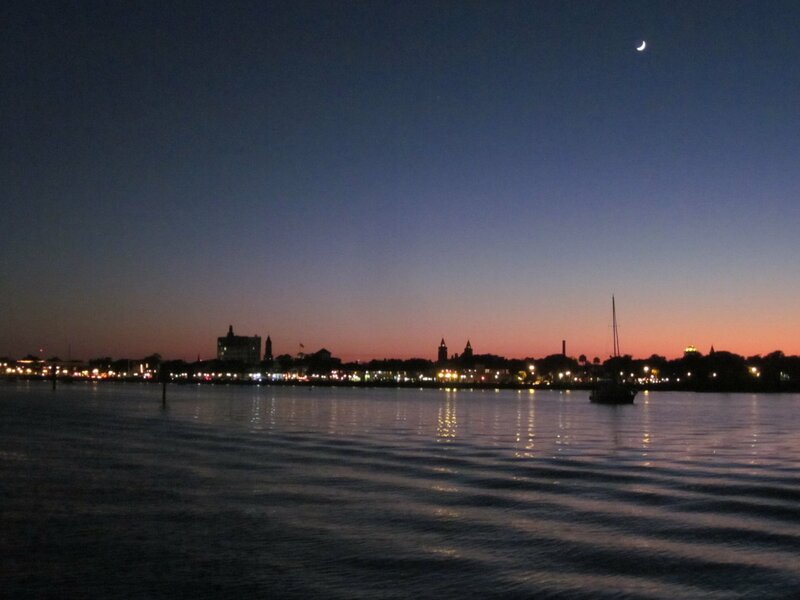 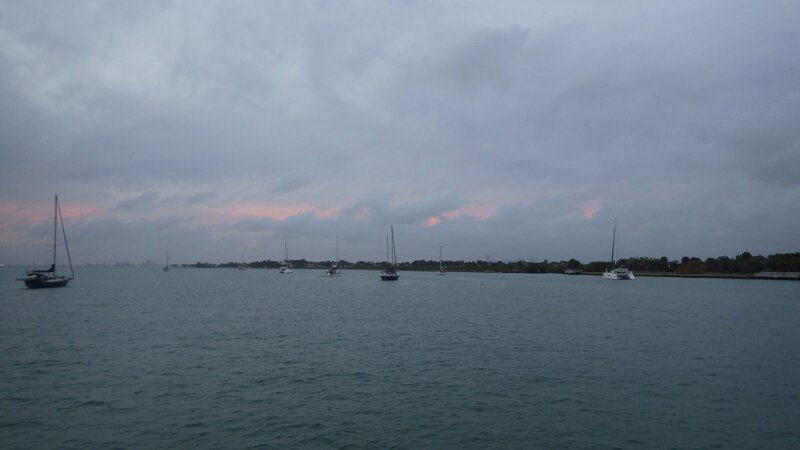 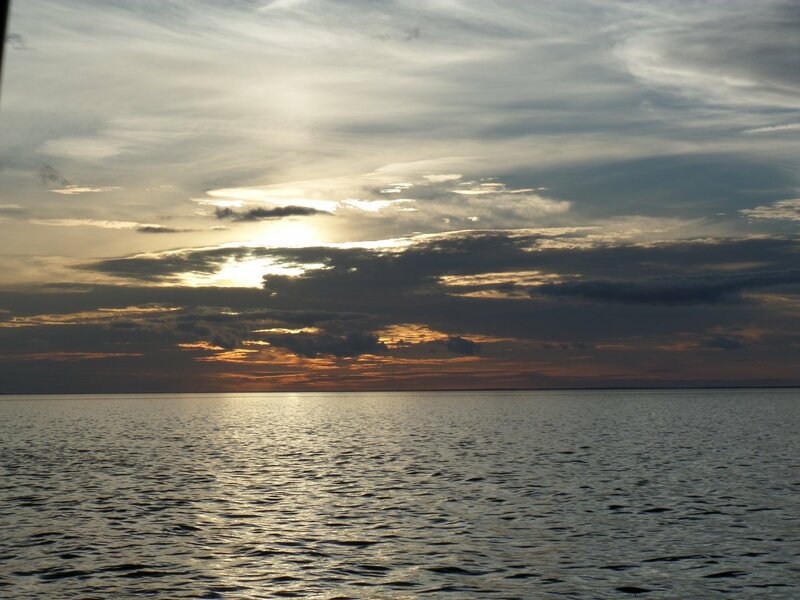 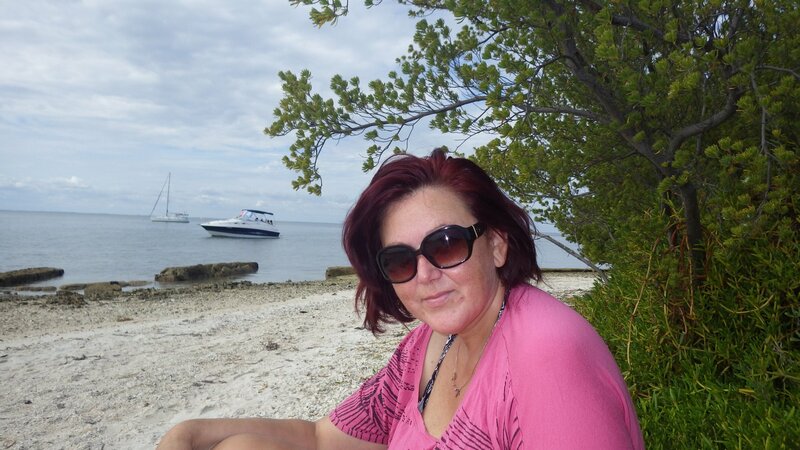 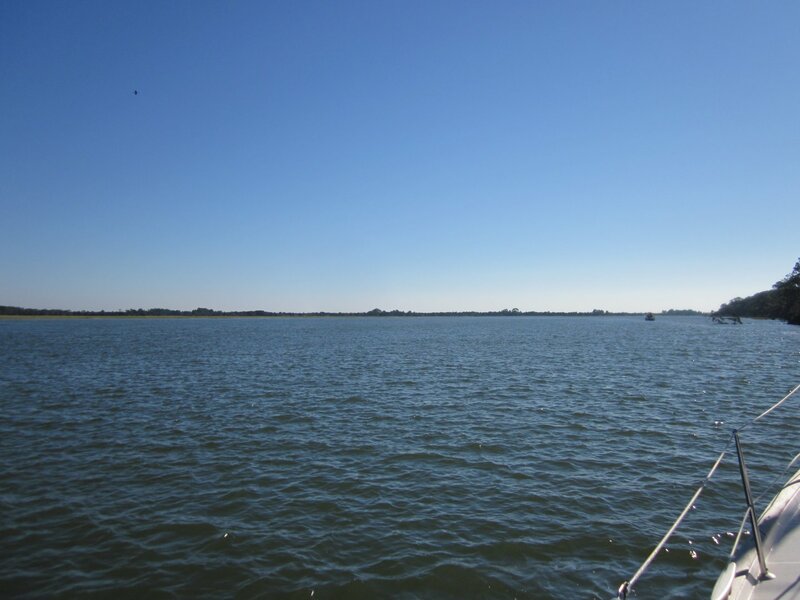 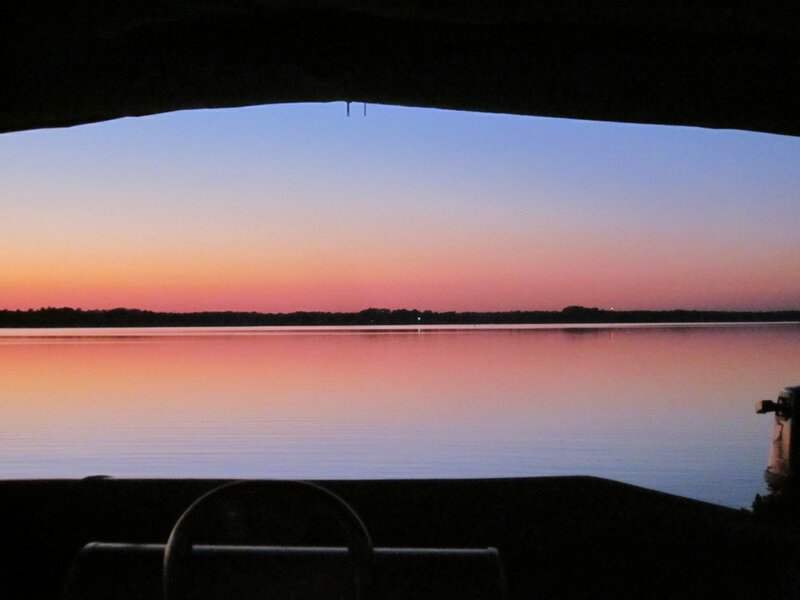 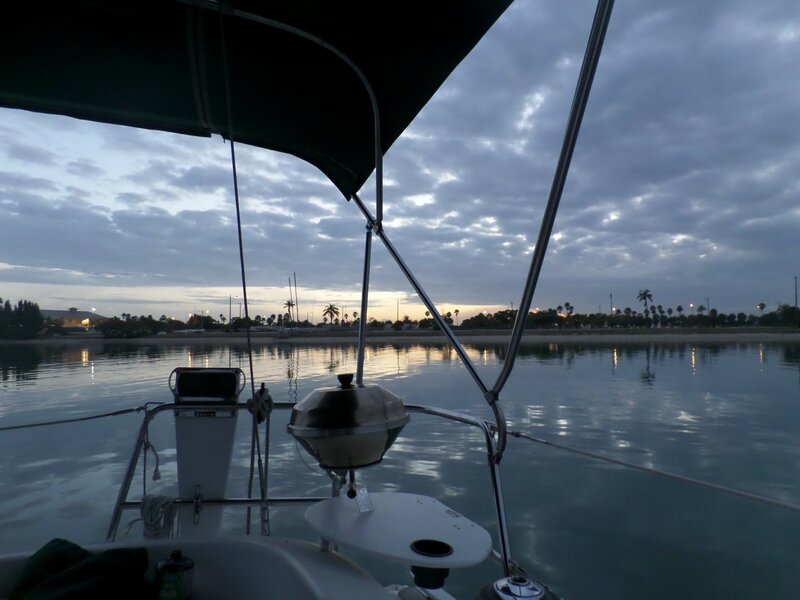 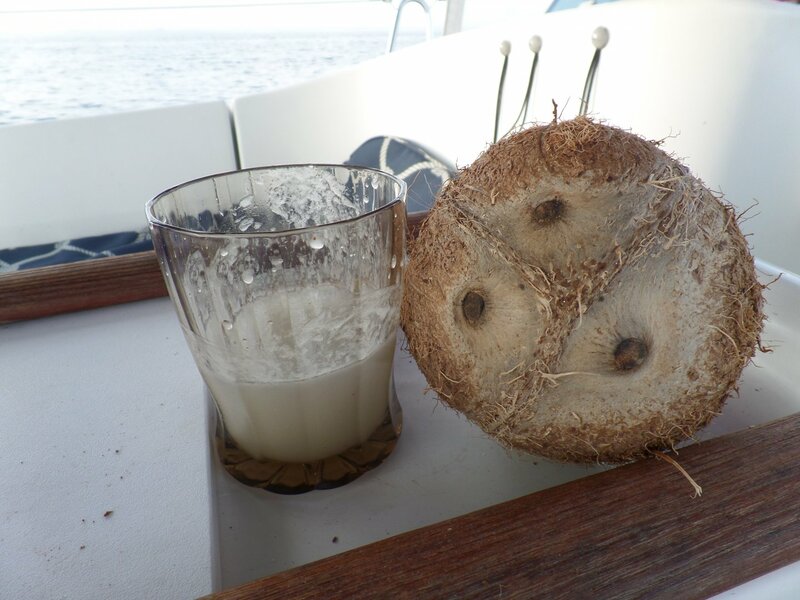 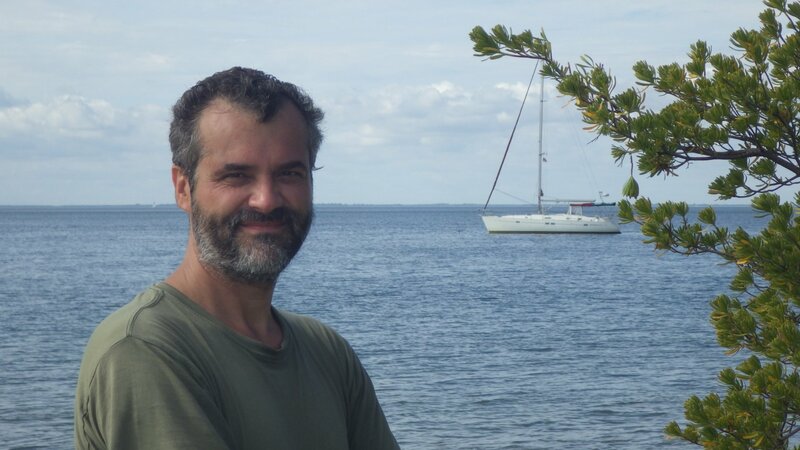 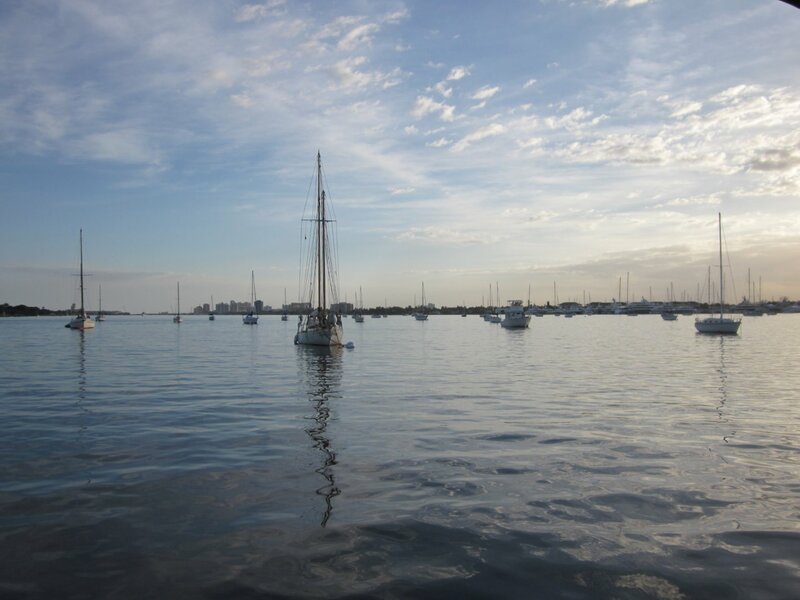 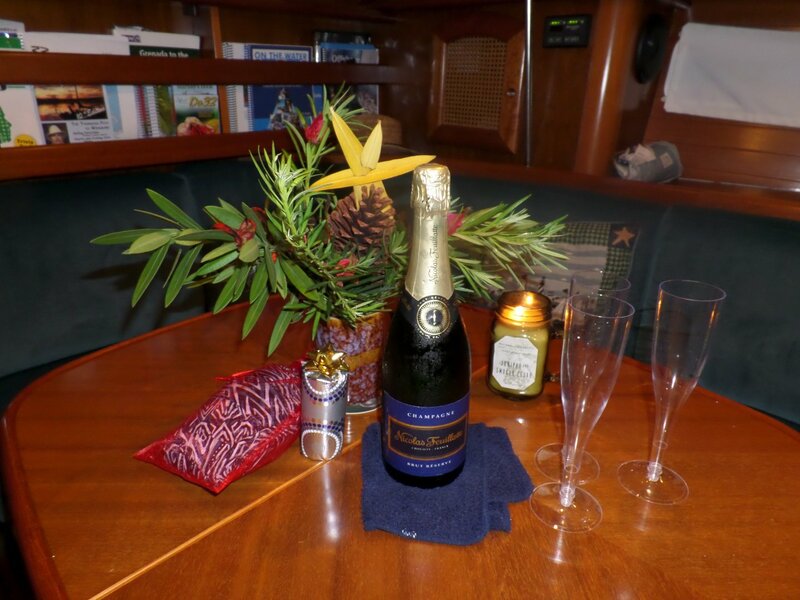 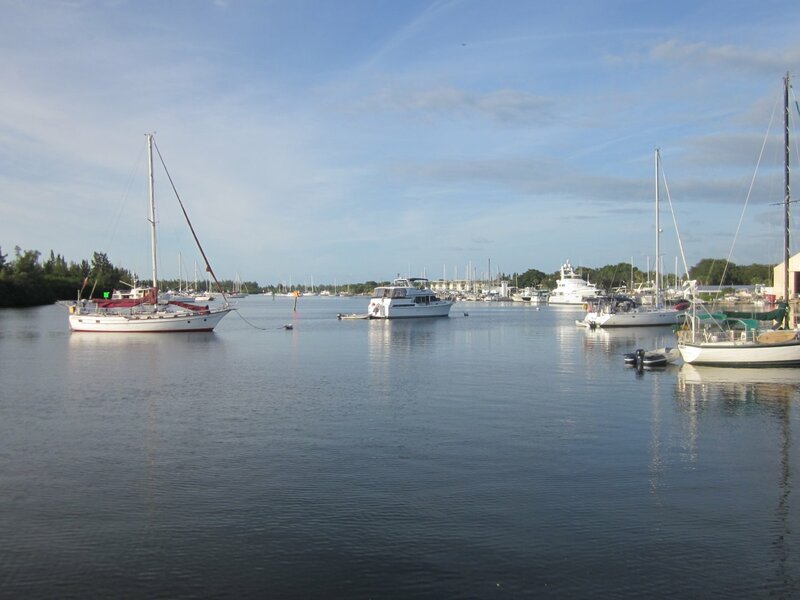 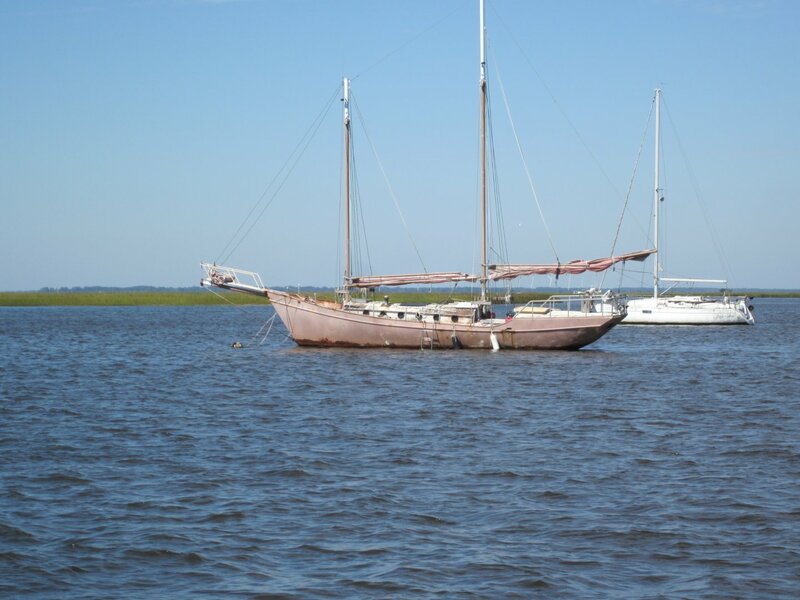 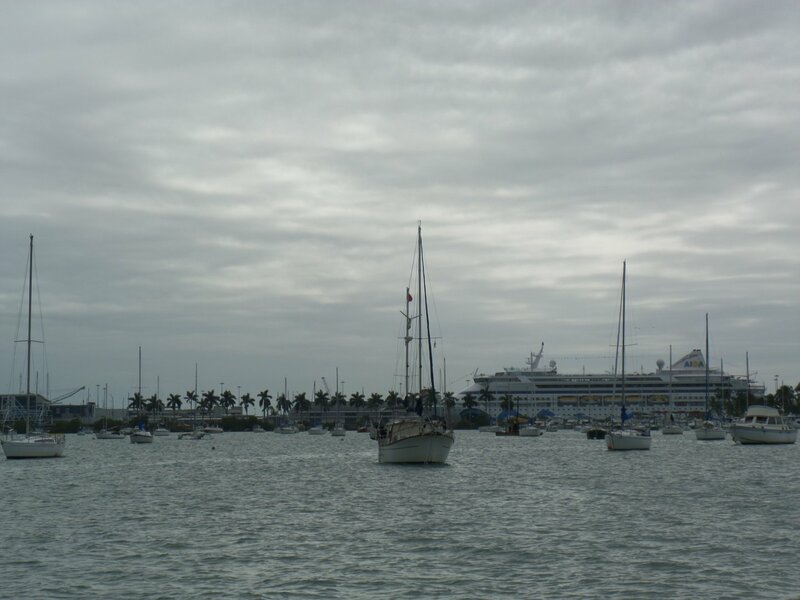 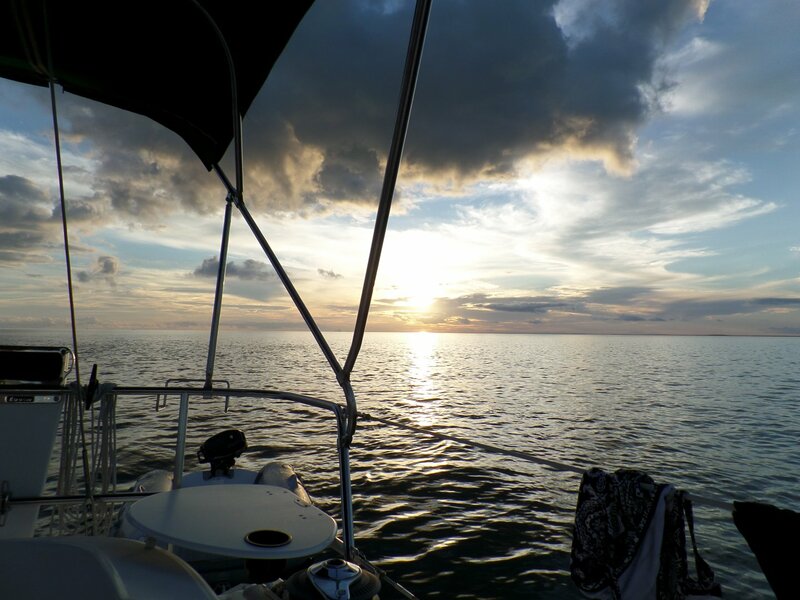 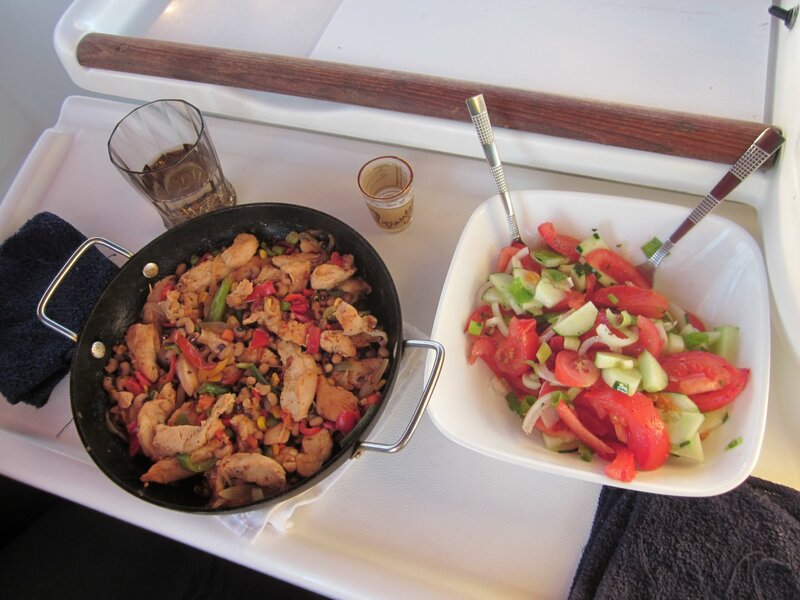 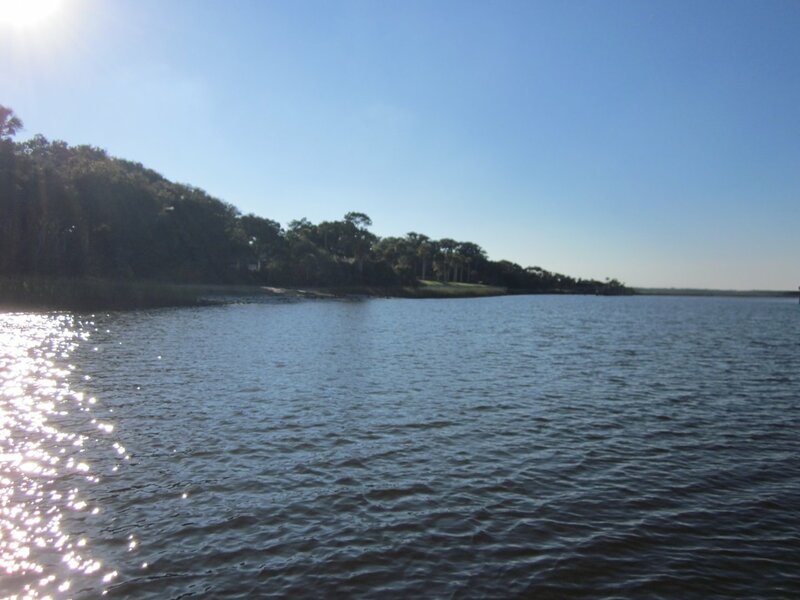 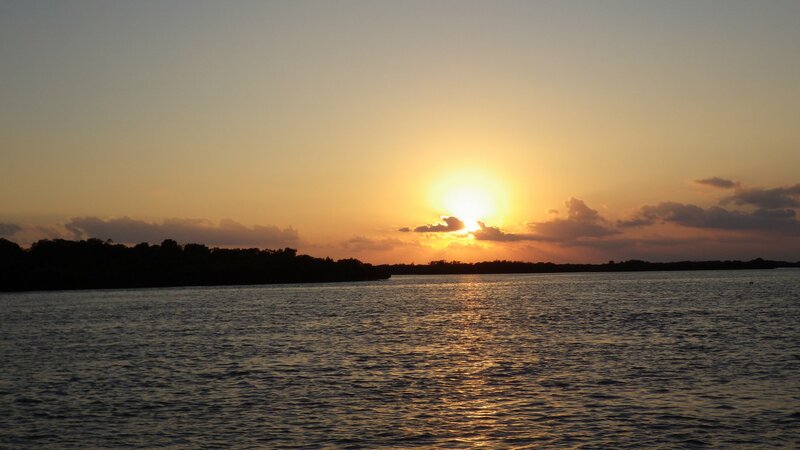 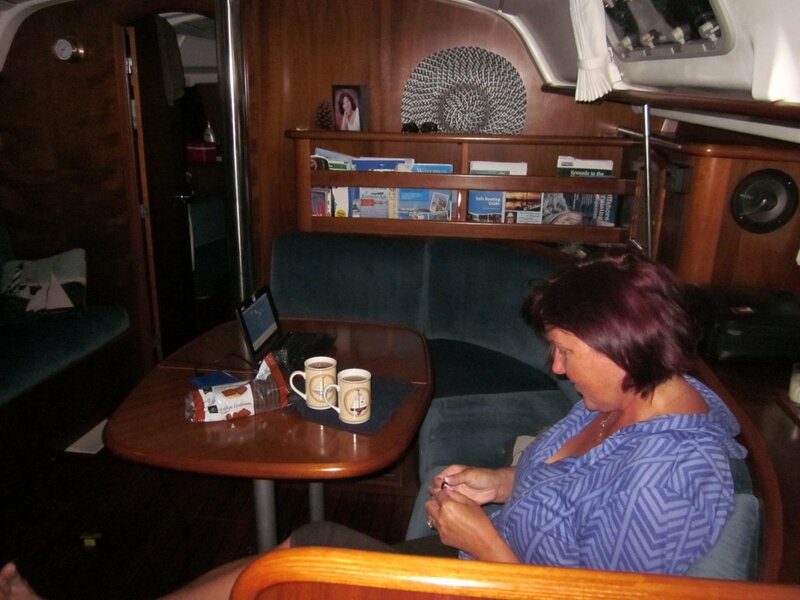 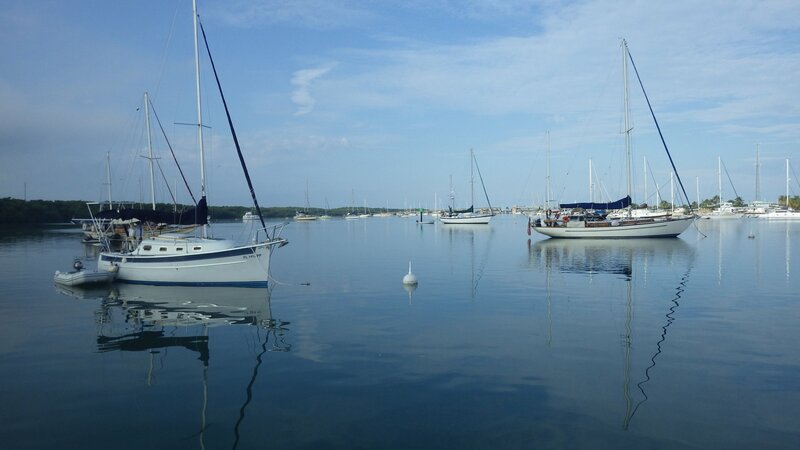 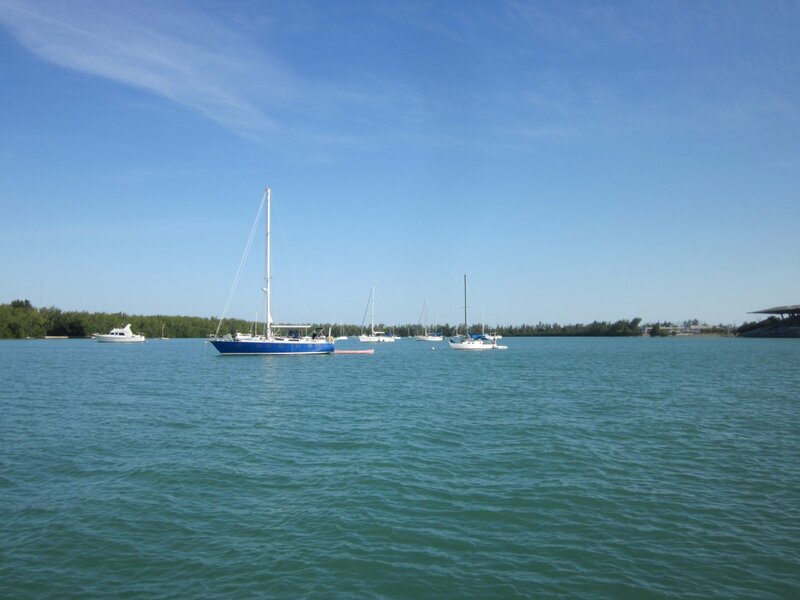 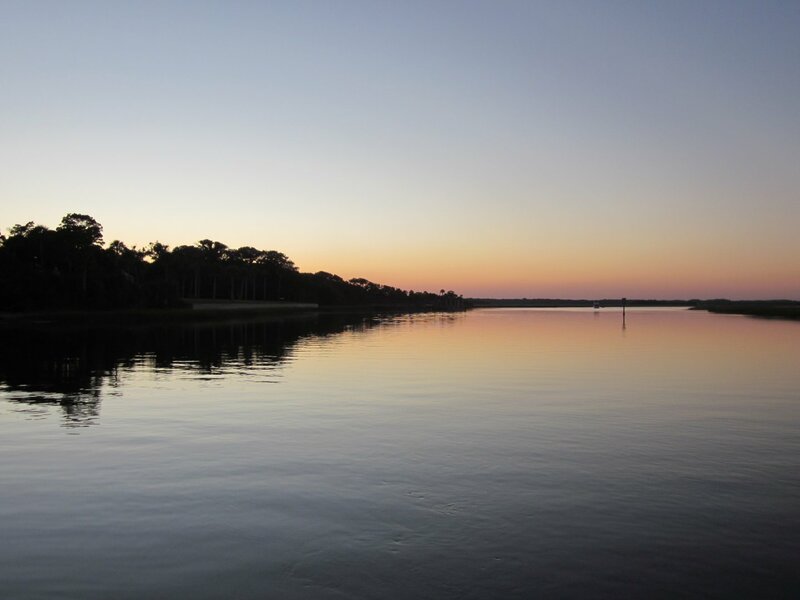 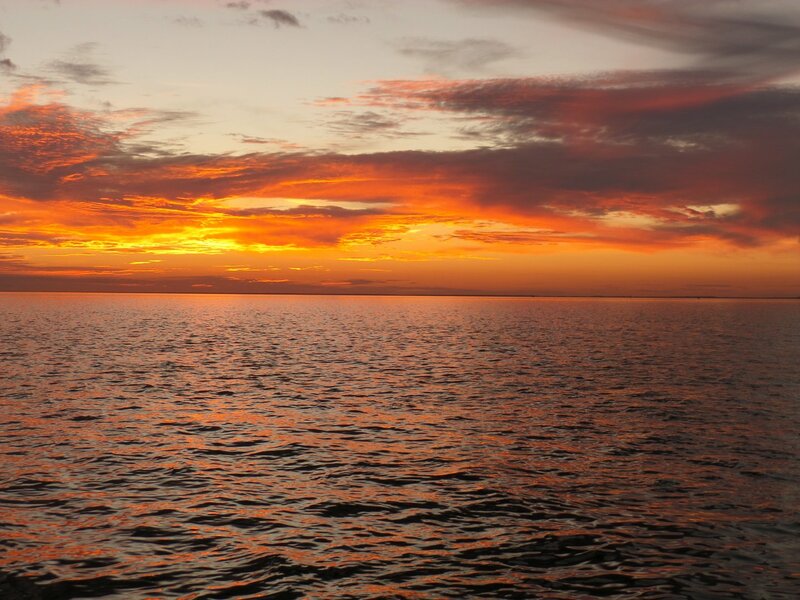 Stayed one more day at St Augustine anchorage � cleaned the hull, did other things, drinks, dinner... 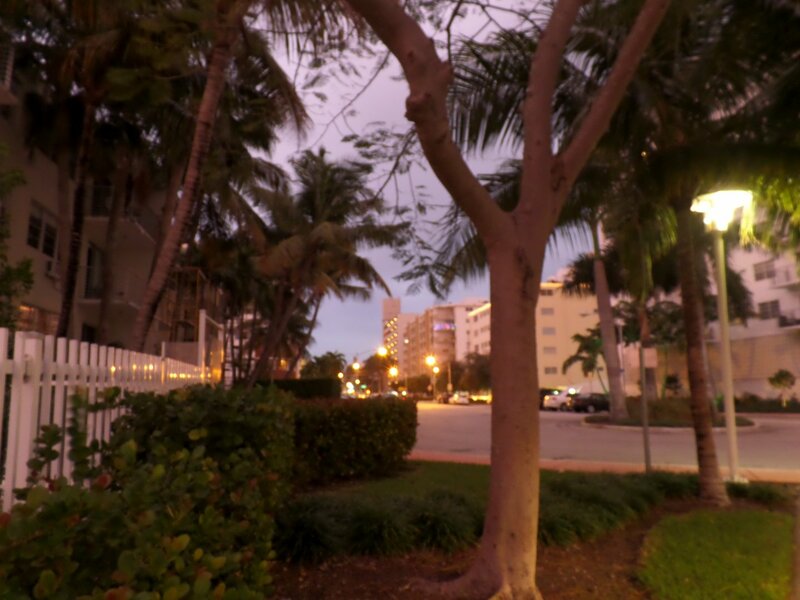 Pleasant stay. 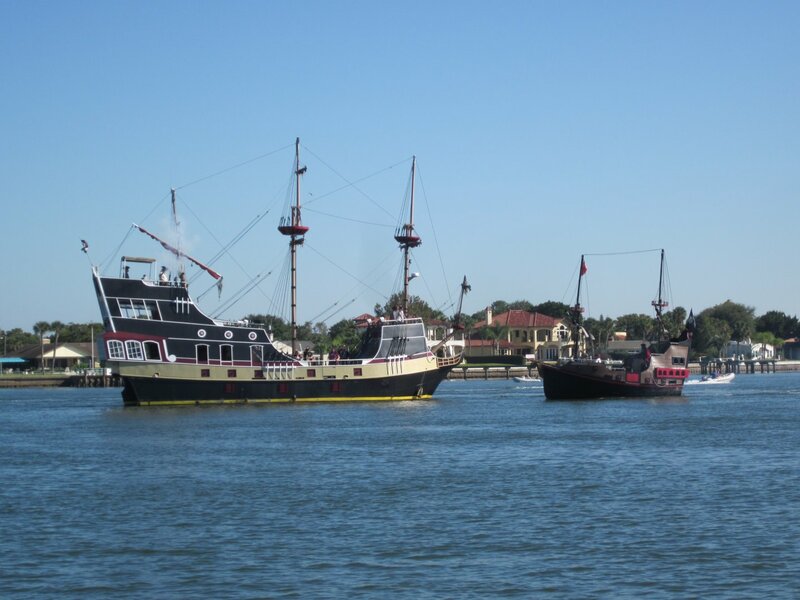 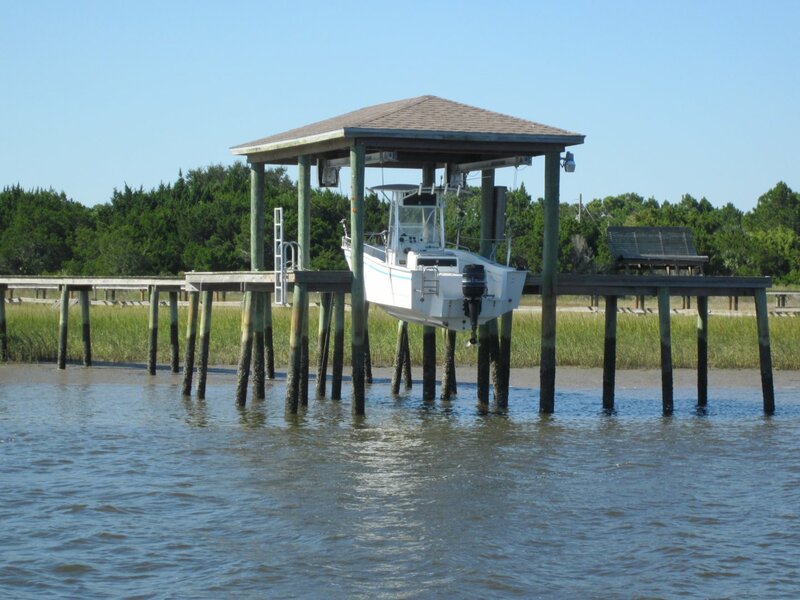 Anchored couple days at Daytona Beach, near the ICW bridge. 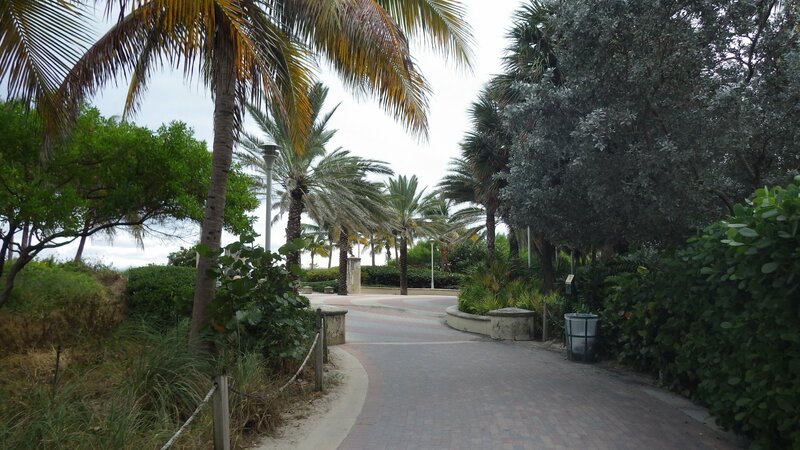 Walked around the beach area, visited quite few shops along the tourist strip, had pizza lunch. 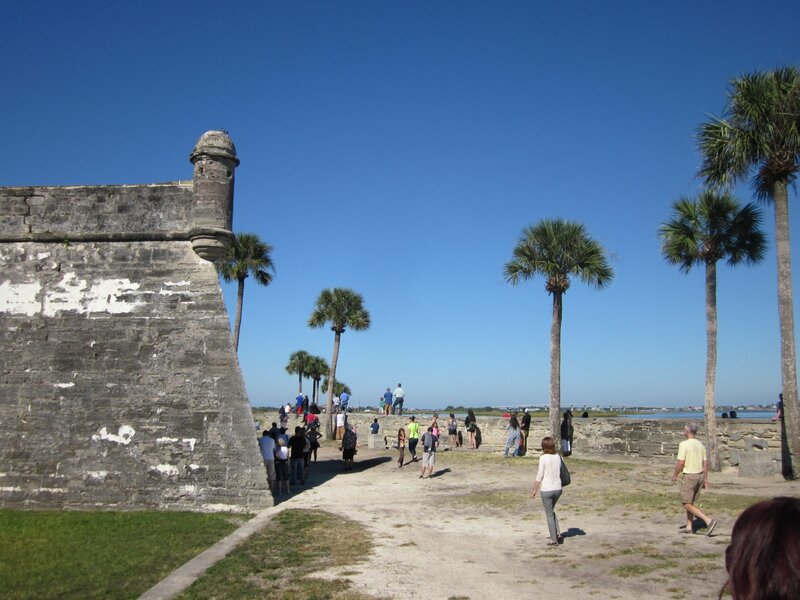 Attractive tourist place. 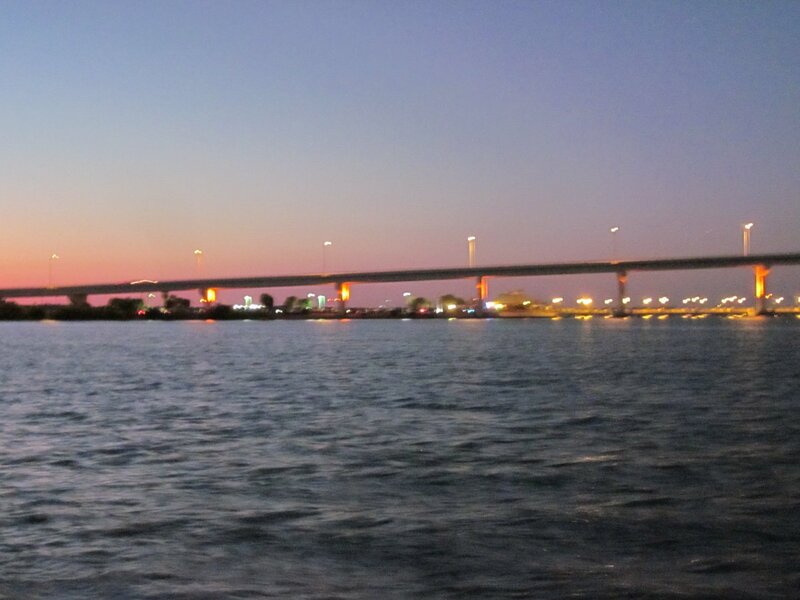 Also, a noisy place � loud night train, loud (bridge) traffic. 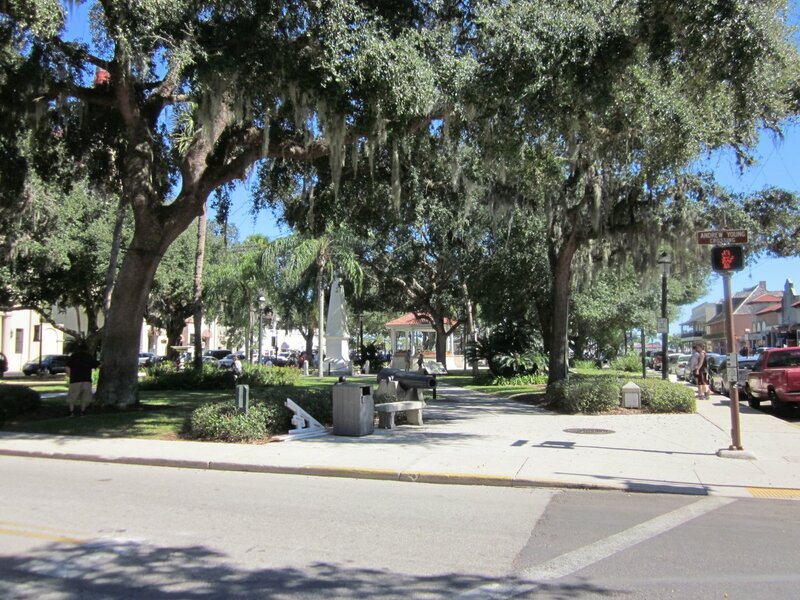 Small town � liked it. 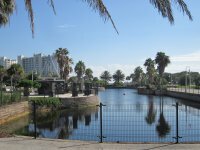 Walking distance to useful (read not-just-tourist-junk) shops � groceries (Save-a-lot), liqueur, convenience, fast-food, parks, etc. 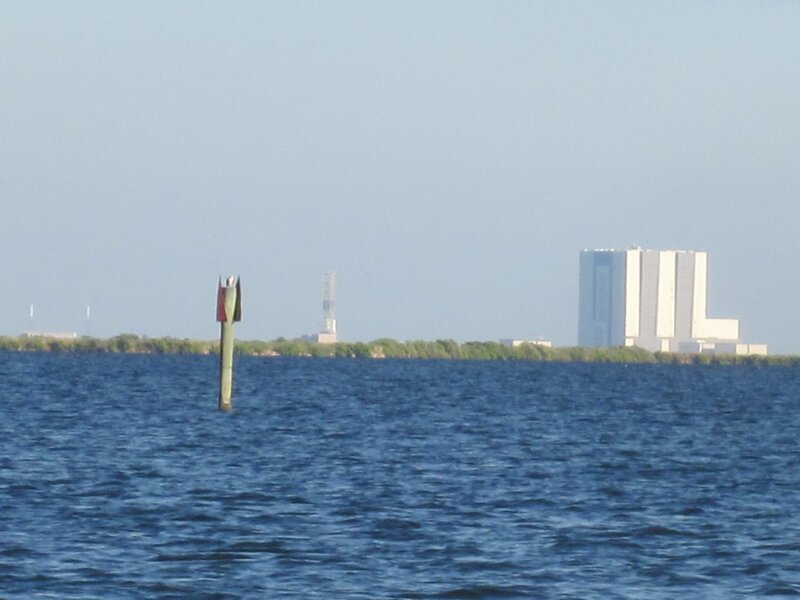 Port Canaveral spaceship launch site is visible from the anchorage. 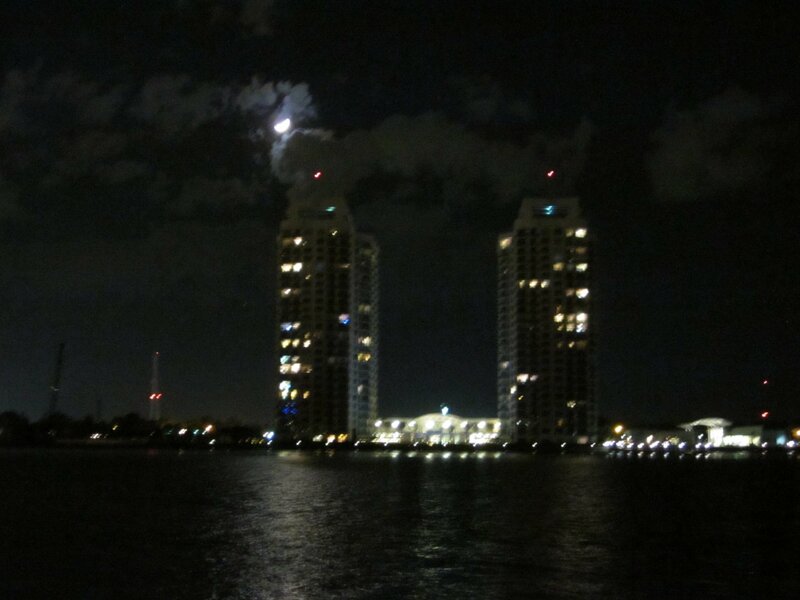 Unfortunately, we've missed the rocket launch the day earlier. 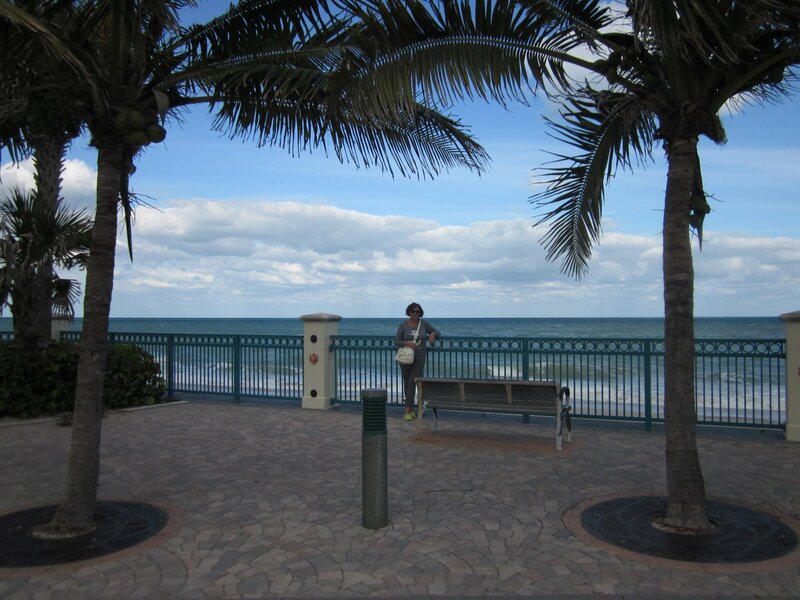 Talked to few locals along the shore � good friendly folks. 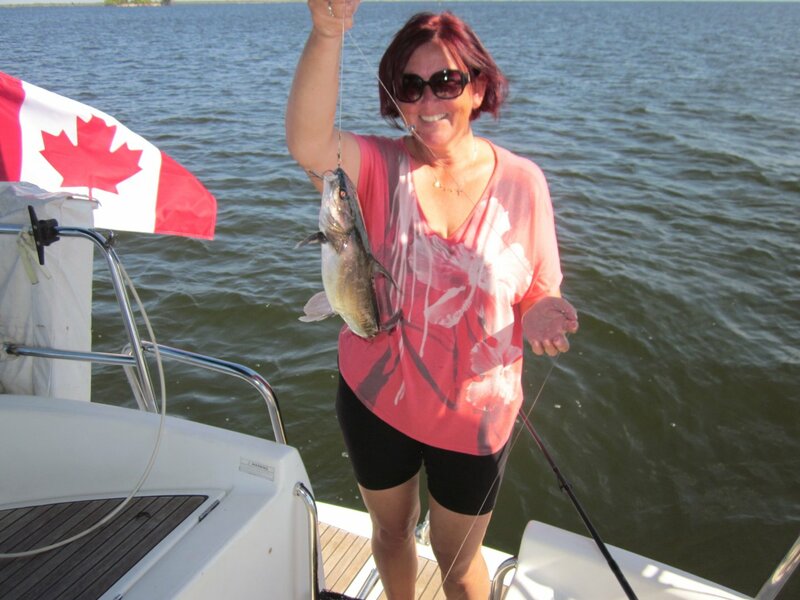 Larysa had a good fishing evening - caught enough fish for the dinner! 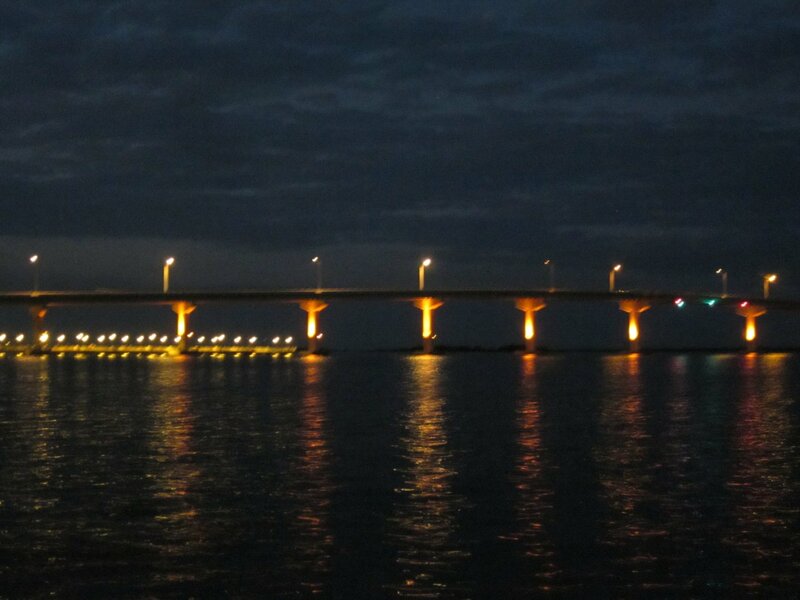 Happen to be there on the Halloween night � local bar beside the bridge had a party. 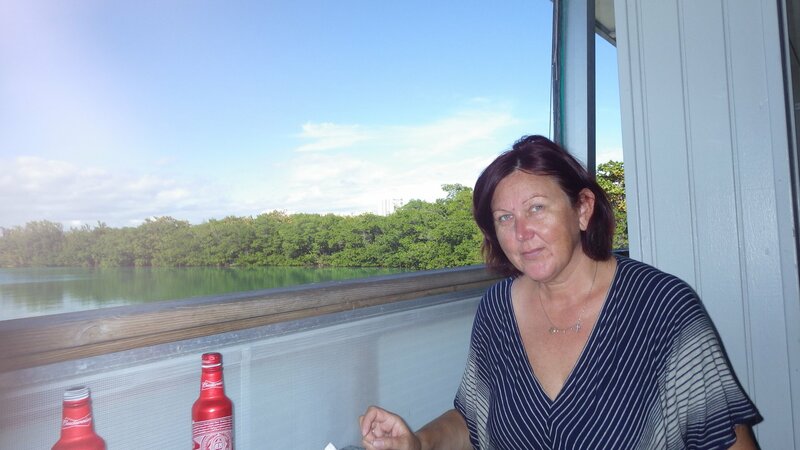 Enjoyed nice live music from the boat. 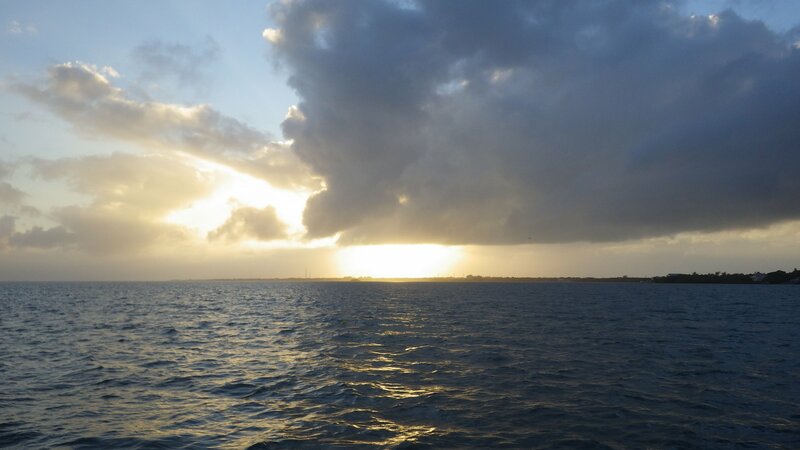 It was a windy and cold passage on the way from Titusville to Melbourne. 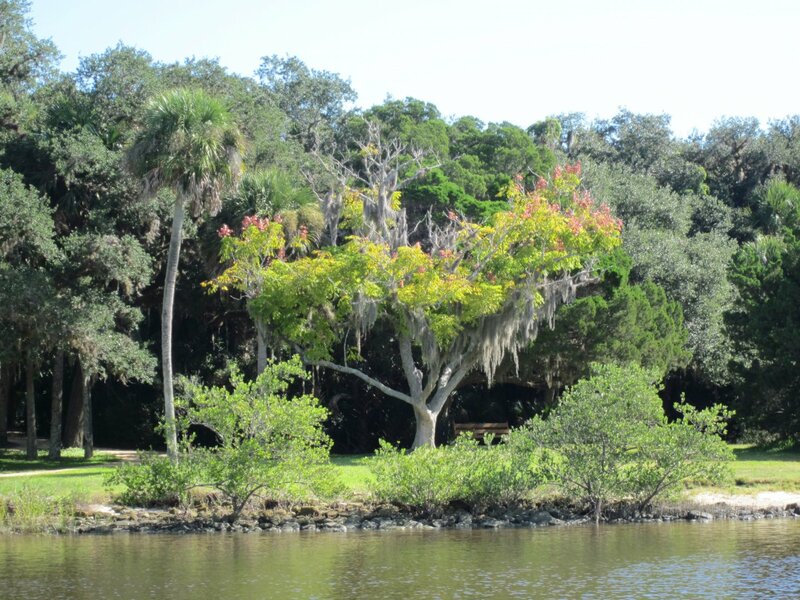 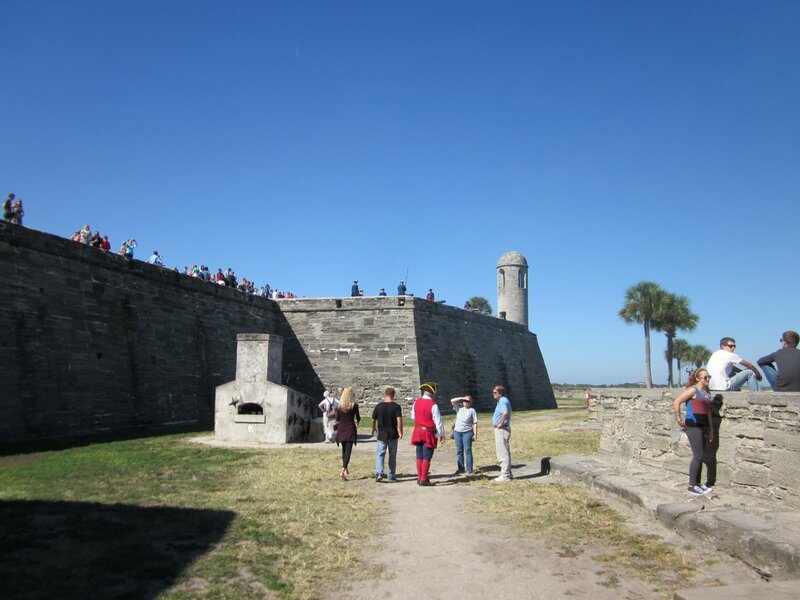 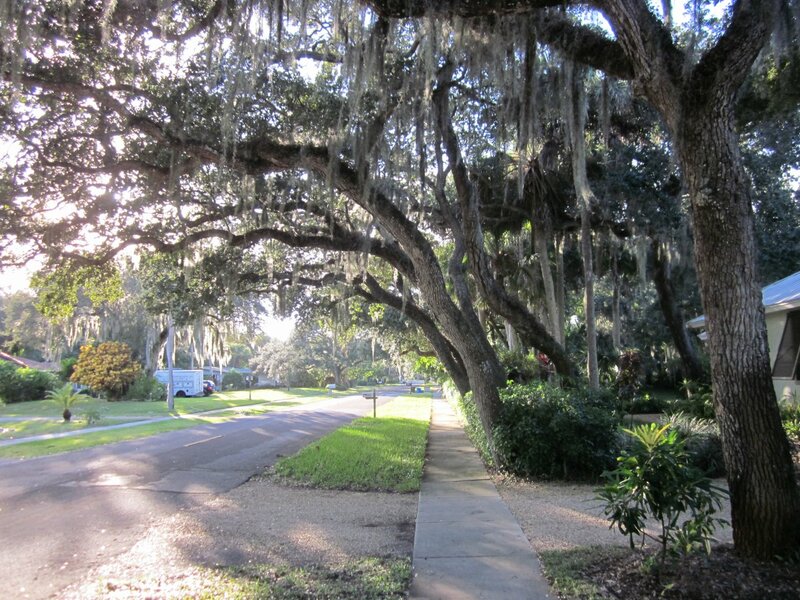 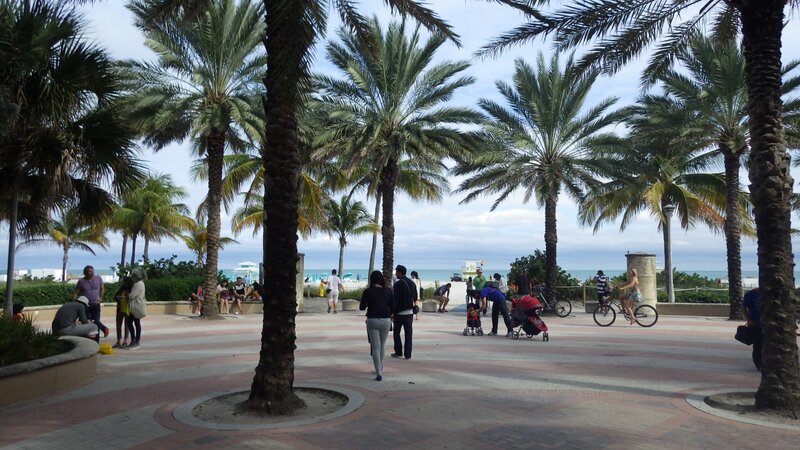 Hard to believe it's Florida in the fall � unusually cold. 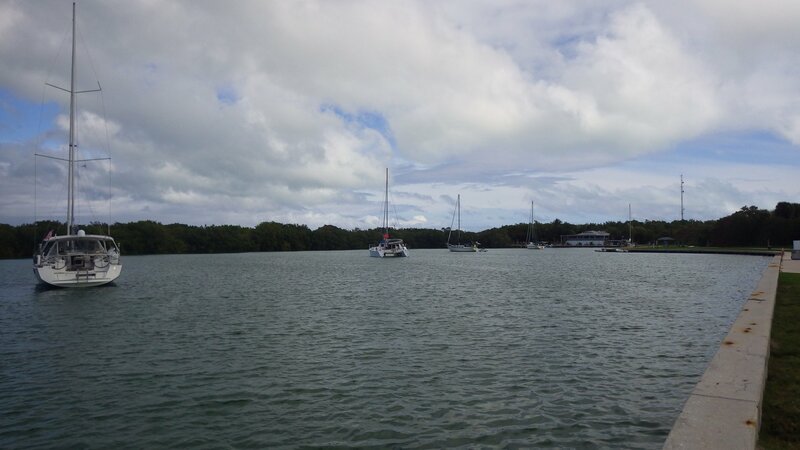 On the bright side � it was a rare chance to sail ICW (heavily reefed) and saved a bunch of diesel. 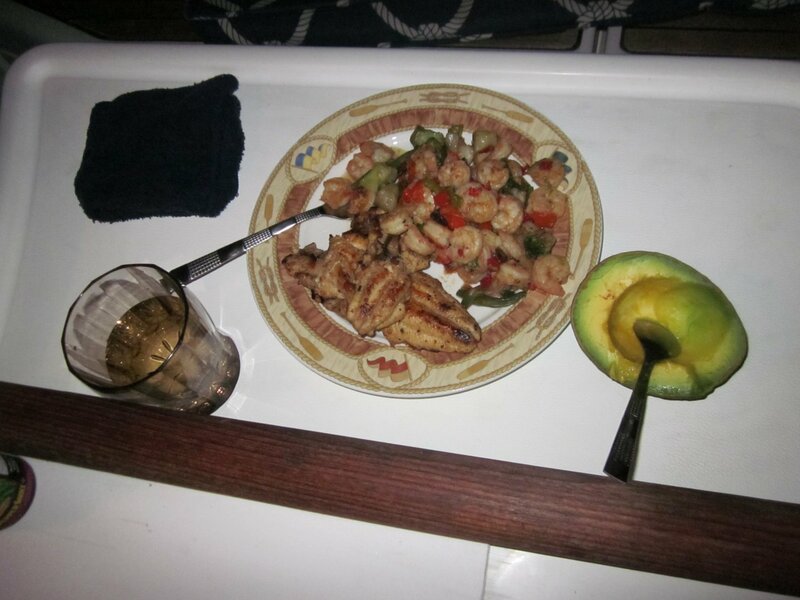 Fried chicken and vegetables for dinner was a good reward. 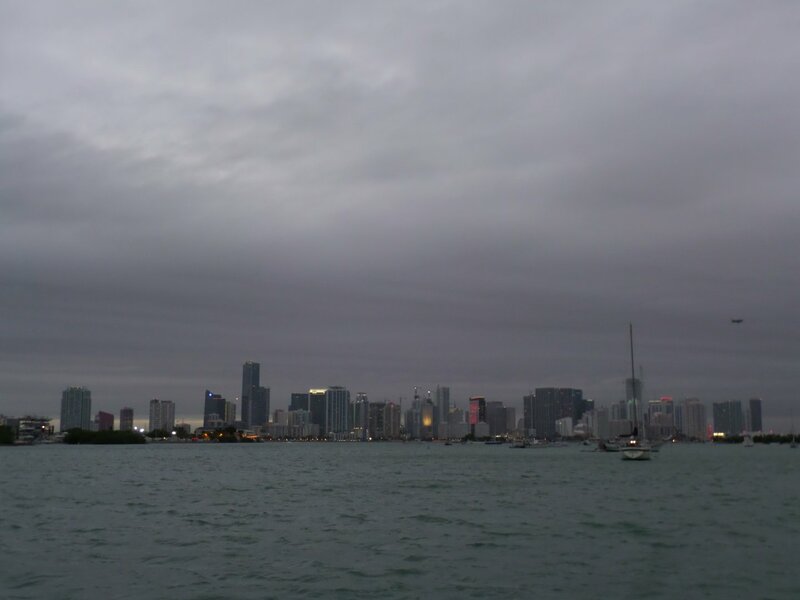 Decided not to venture out to the shore this time to see the city � weather was too unpleasant and dangerous to dinghy quite a bit of distance. 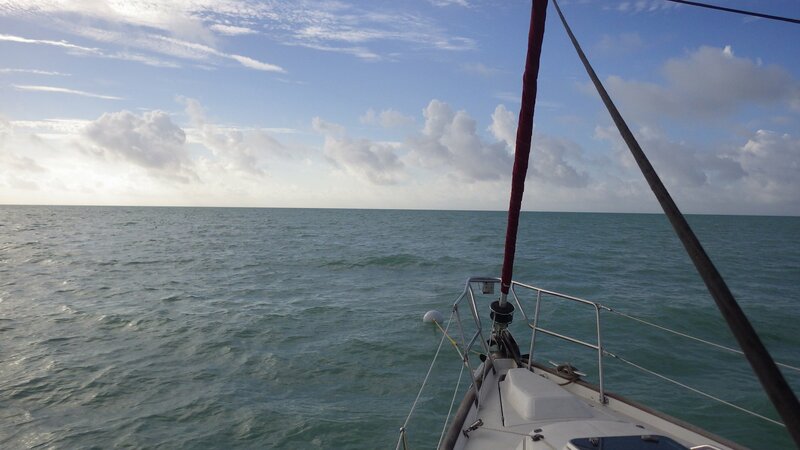 Moving on further South next morning. 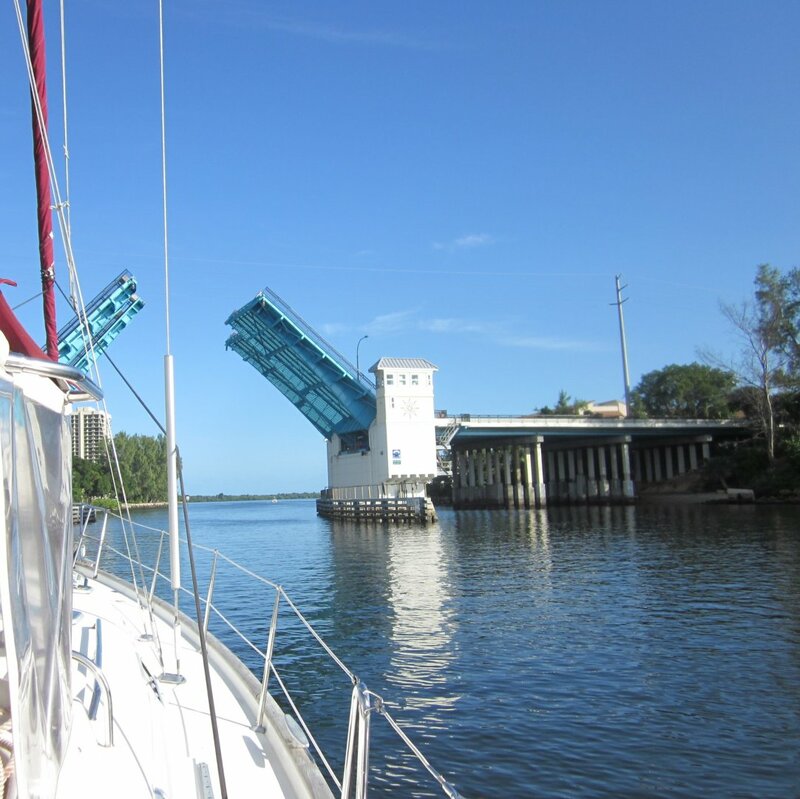 Just a quick overnight stop under the ICW bridge, trying to time our next morning arrival at Vero beach. 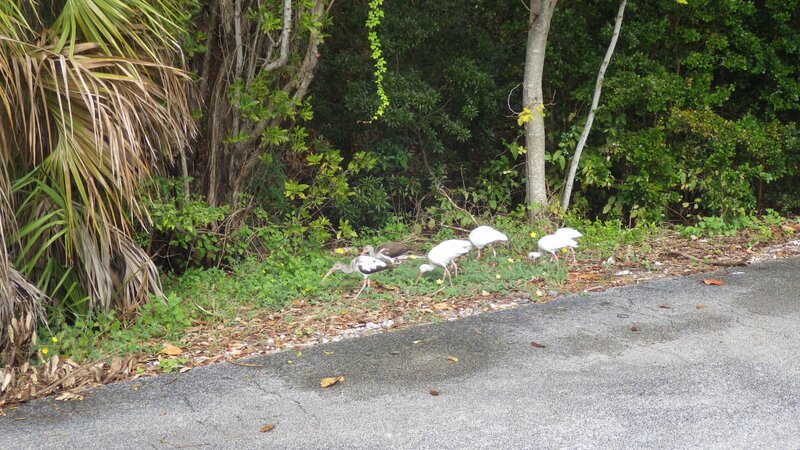 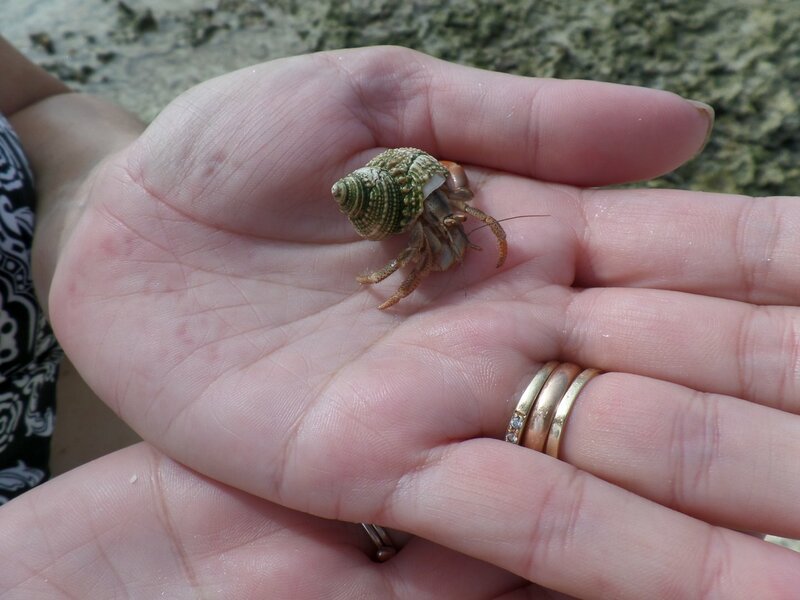 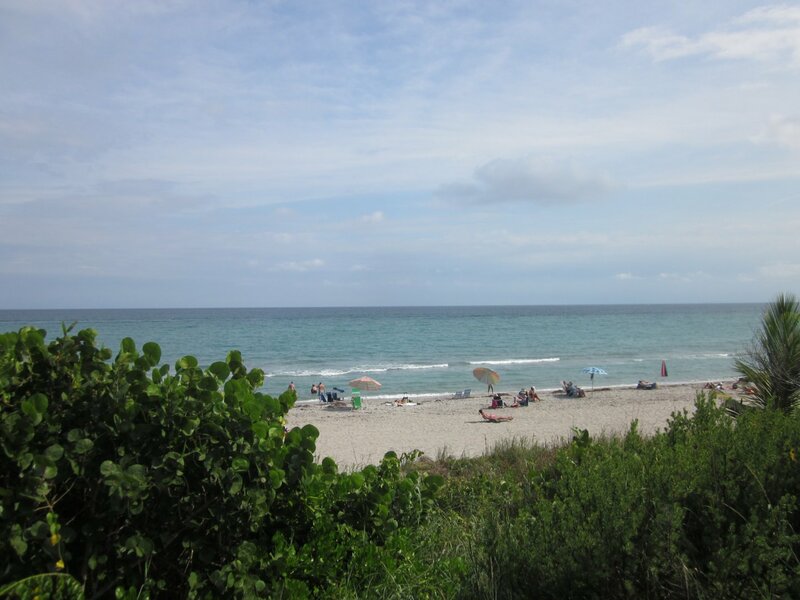 Two days in the popular cruising spot - Vero Beach. 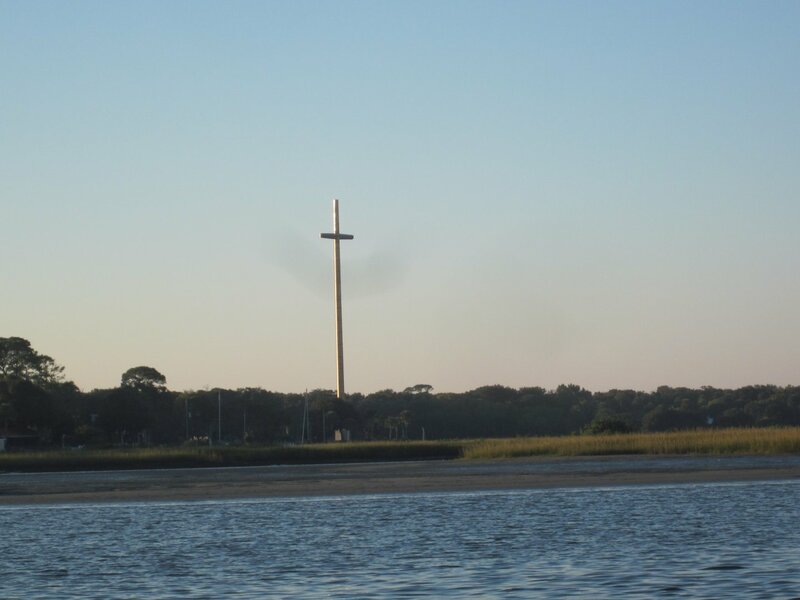 I see the reasons why it's popular. 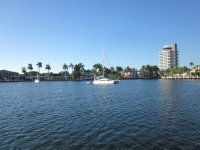 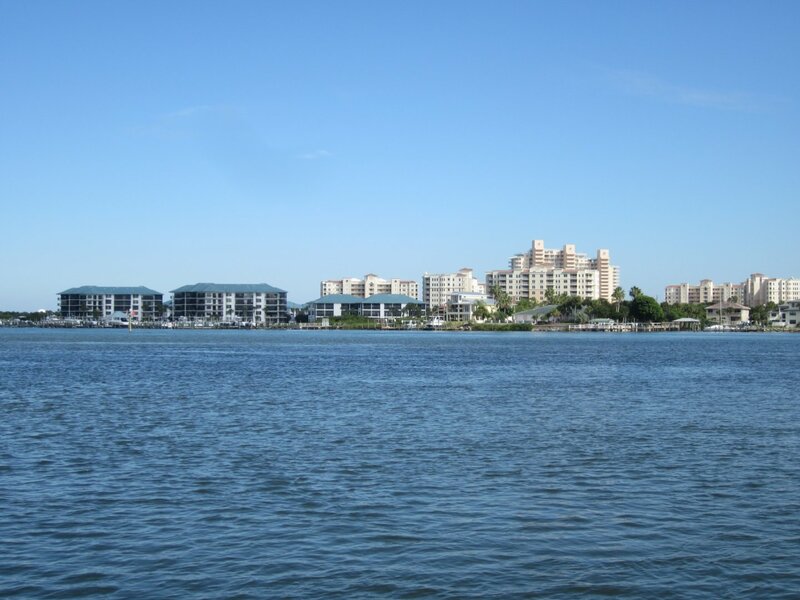 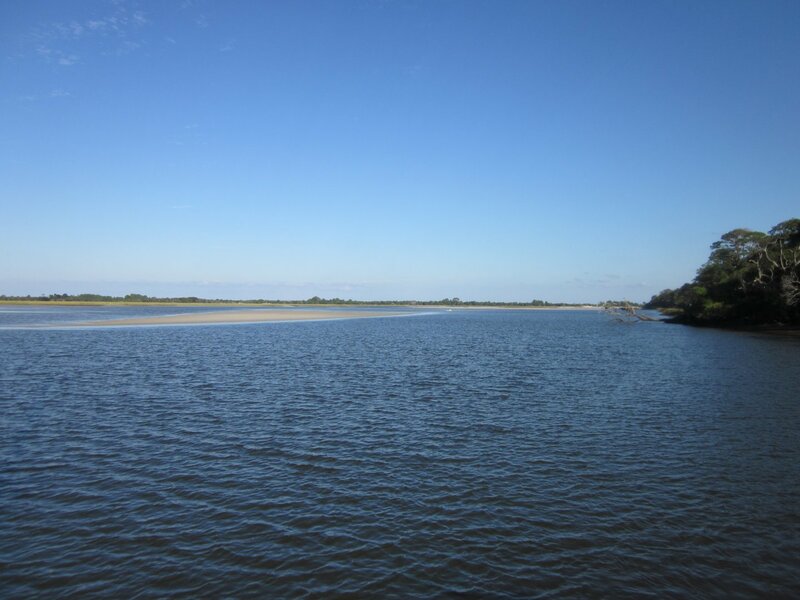 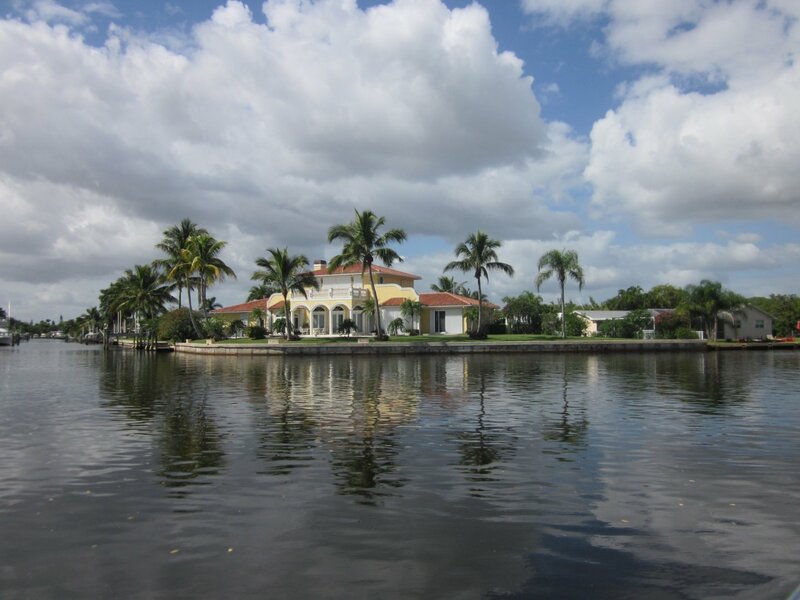 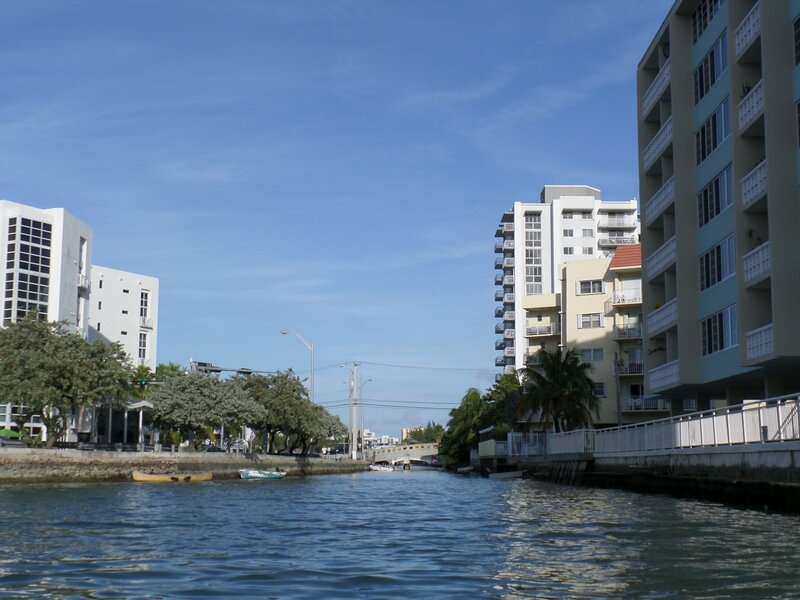 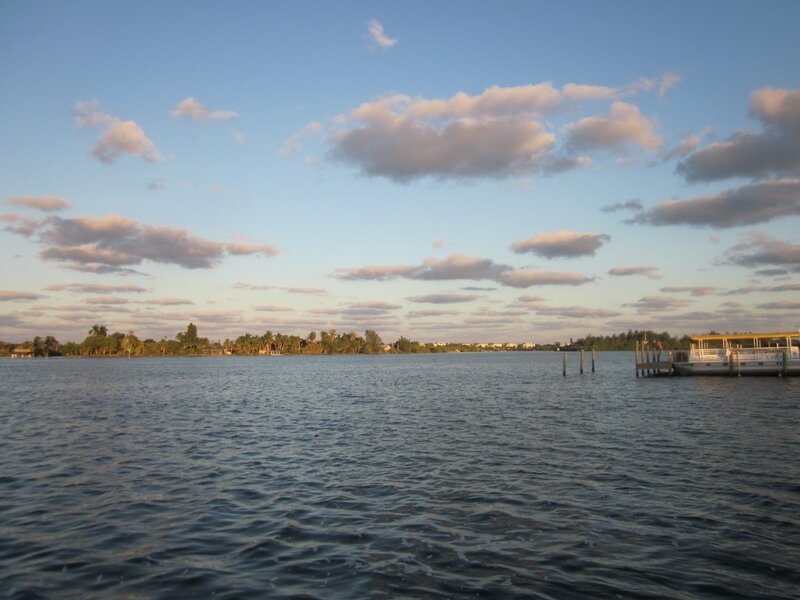 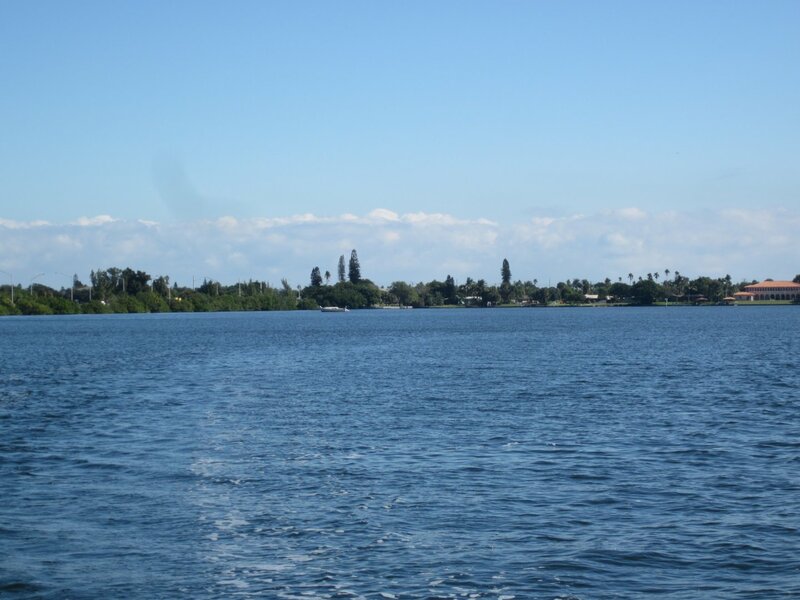 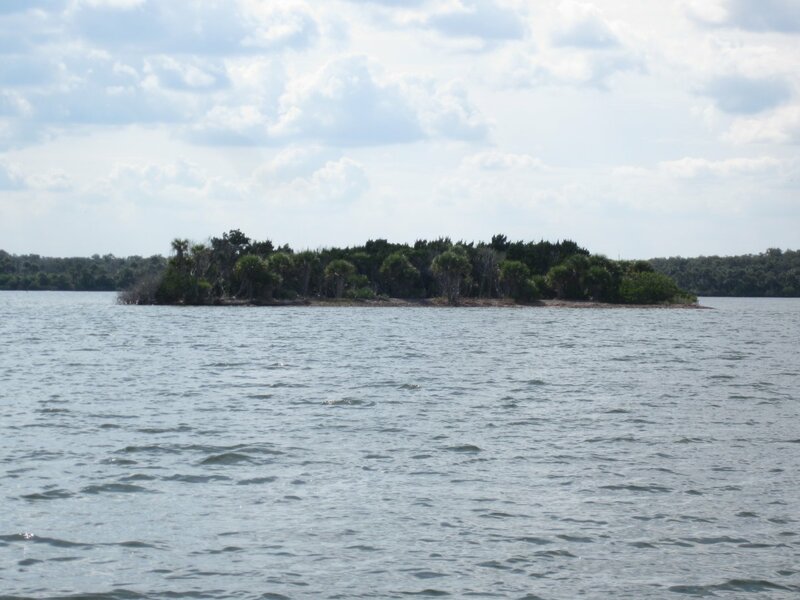 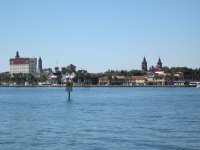 All you need (groceries, West Marine, fast food, liquor, banks, etc) are accessible - either by walks, free bus system, or by dinghy ride + reasonable walk. 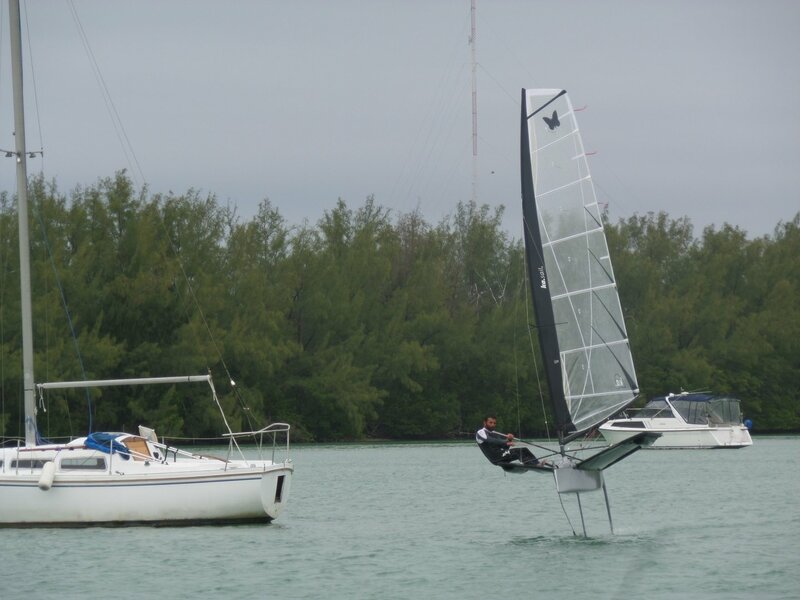 Few spots (ramps, parks) to land the dinghy. 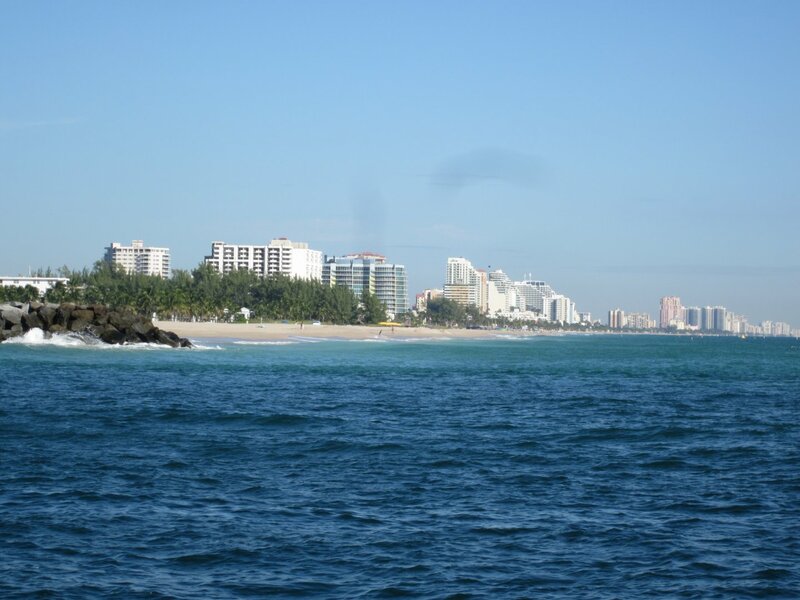 The place has the two areas � the beach side and the city side. 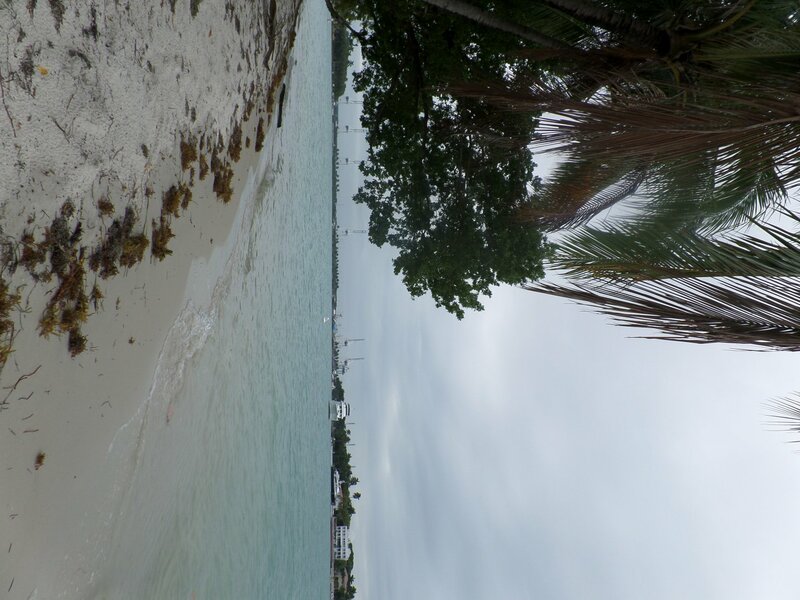 Walked the beach side. 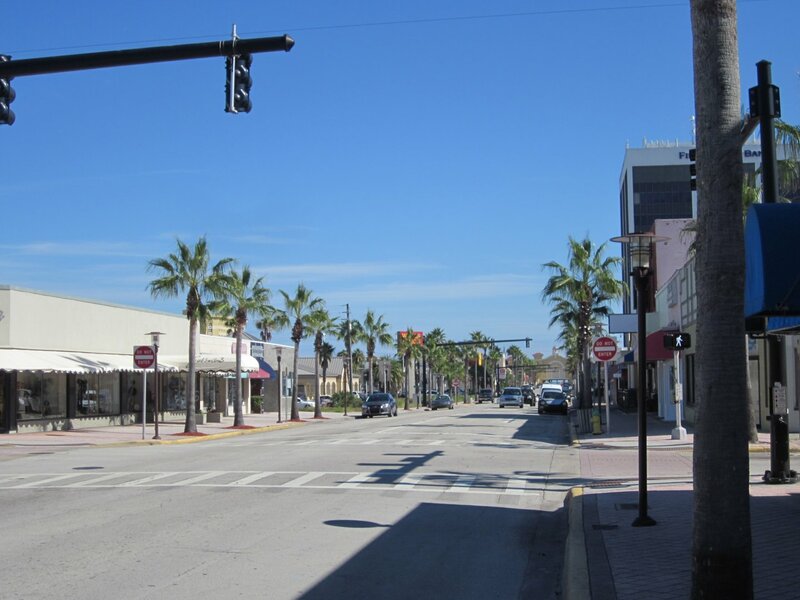 Visited town side by bus, picked up some stuff. 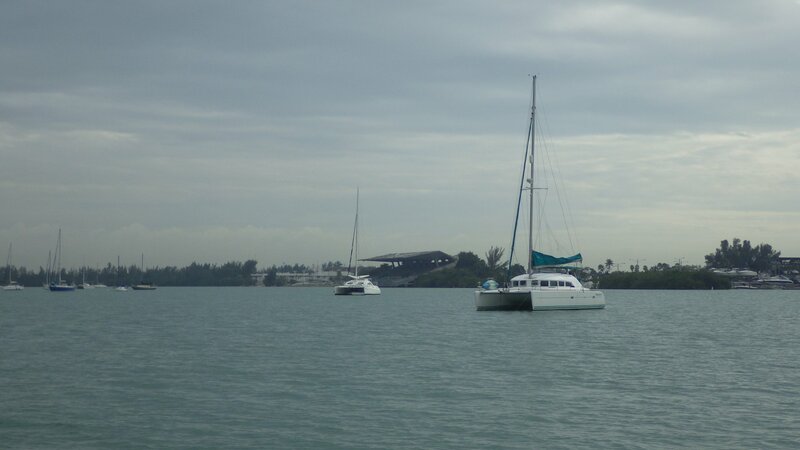 Mooring field at City Marina ($13/night) is supposedly the only way to stay here, but there are seem to be some anchorages available (didn't try). 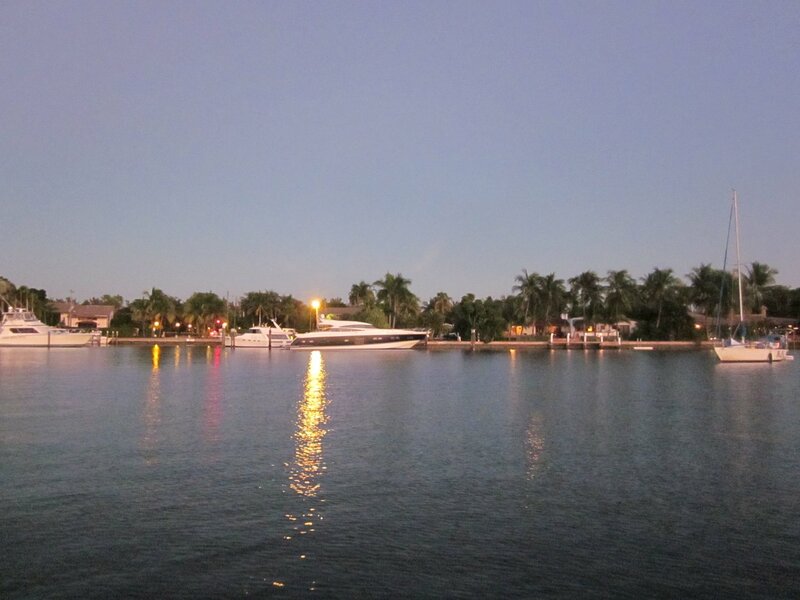 Moored at municipal marina. 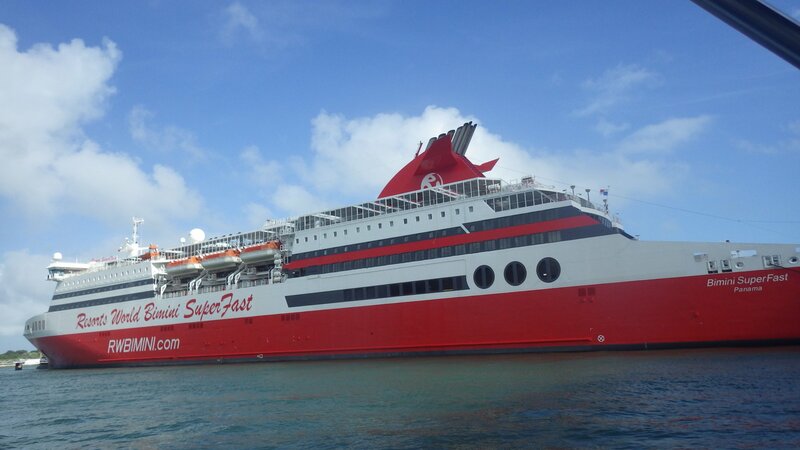 Usual services. 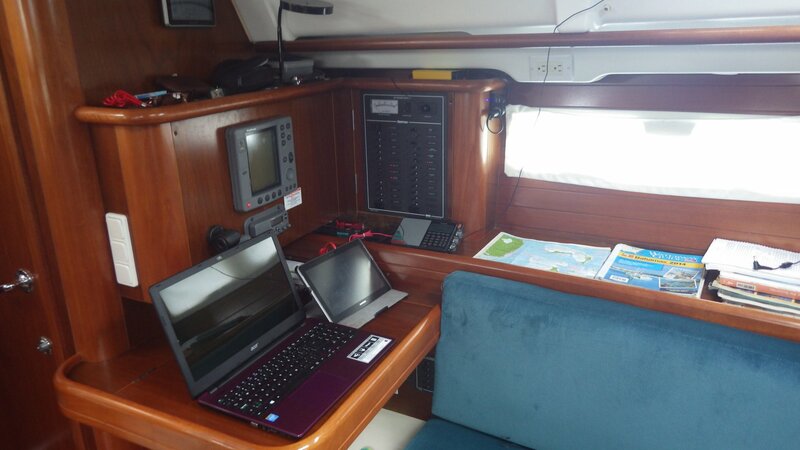 Marina's Wi-fi (protected) is barely working (from mooring). Liked the place � feels calm, comfortable. 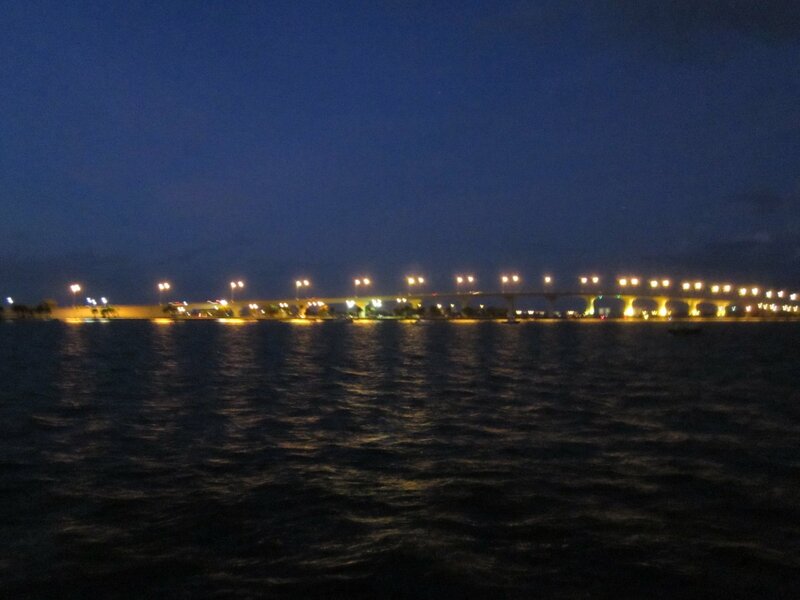 Yet another one-night ICW anchorage under the bridge, on the way South. 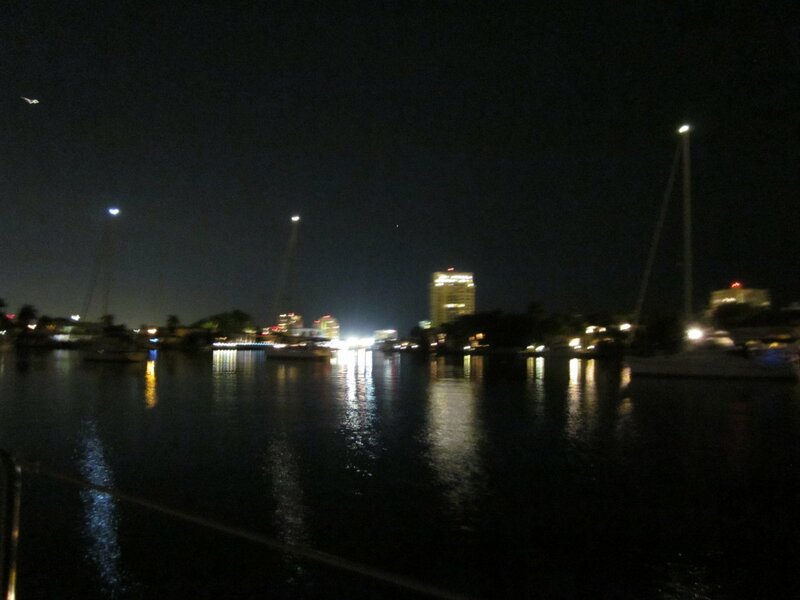 Anchored for the night at the spot where many cruisers are staging their departure to Bahamas. 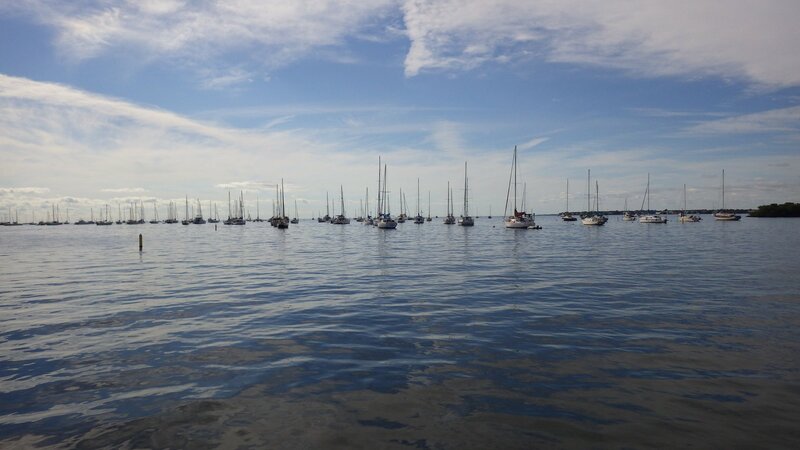 See lots of boats waiting for the suitable weather window to run across the Gulf Stream. 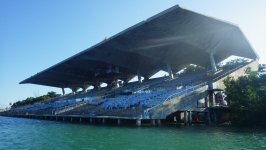 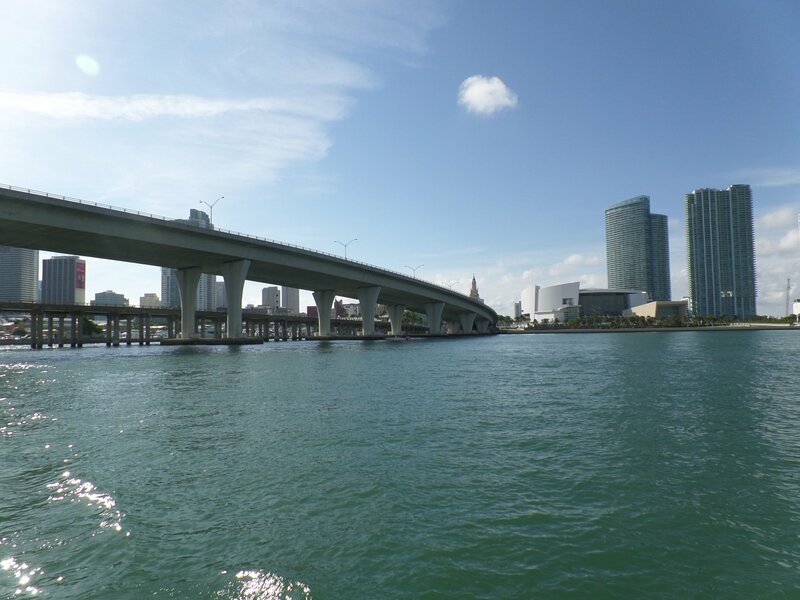 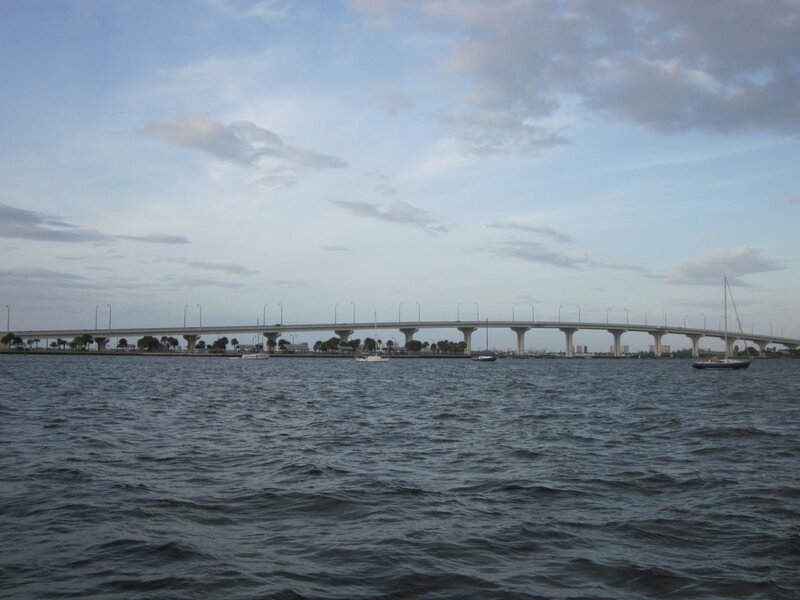 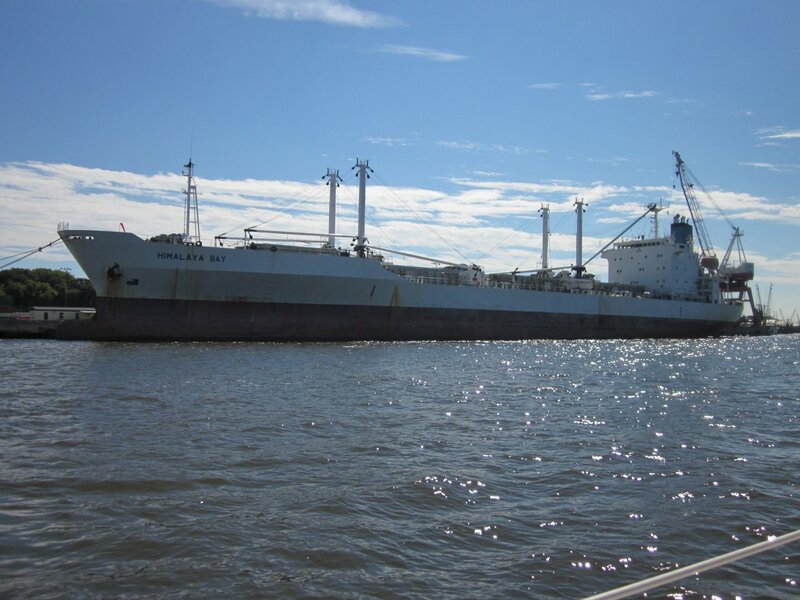 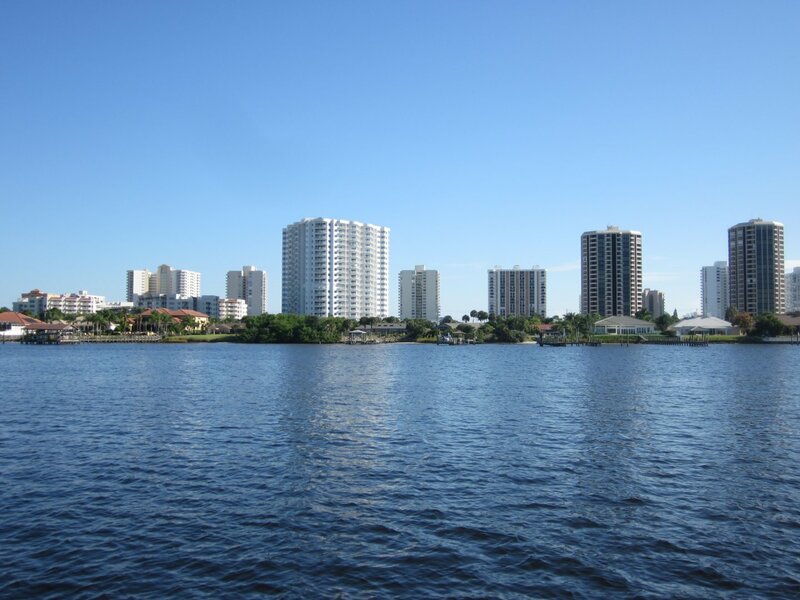 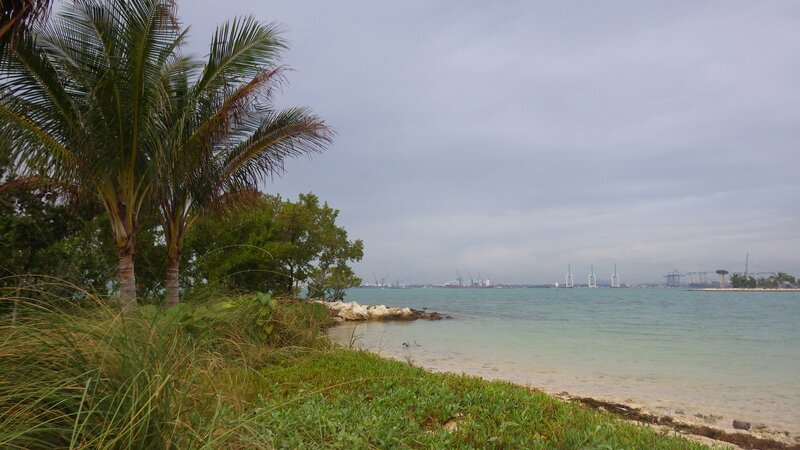 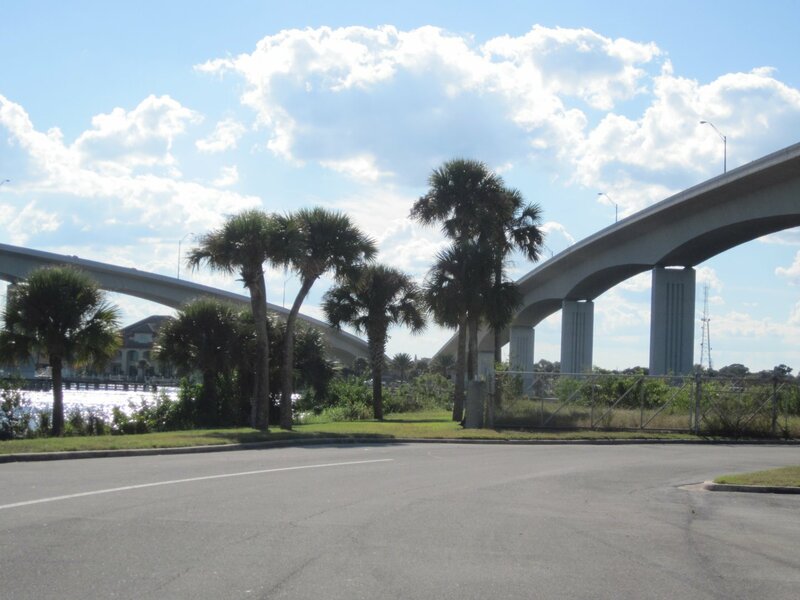 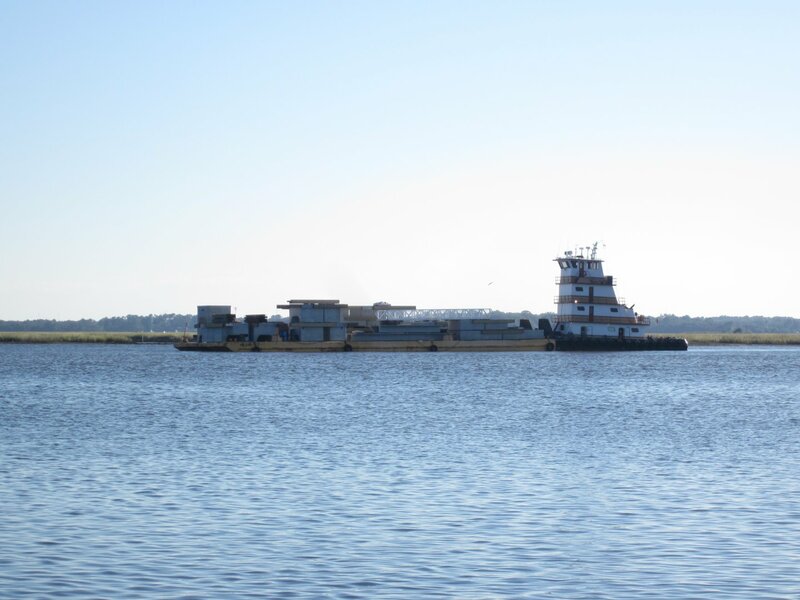 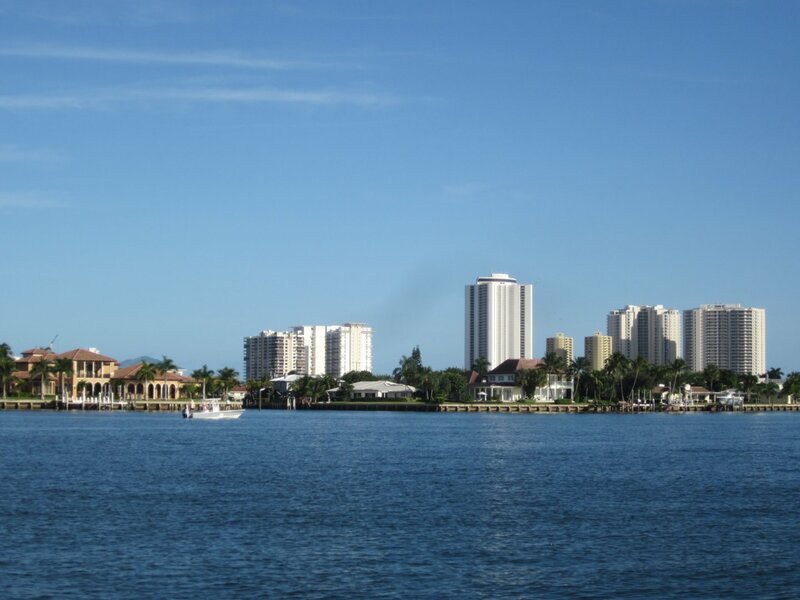 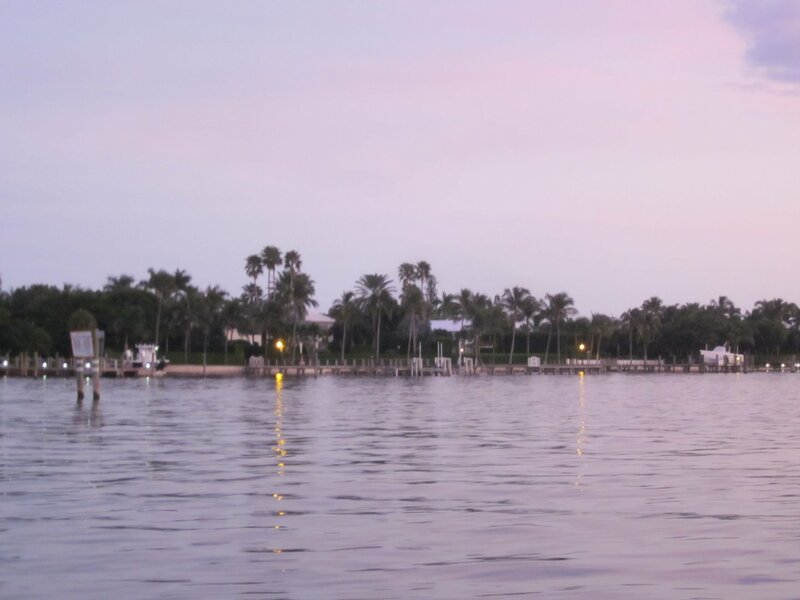 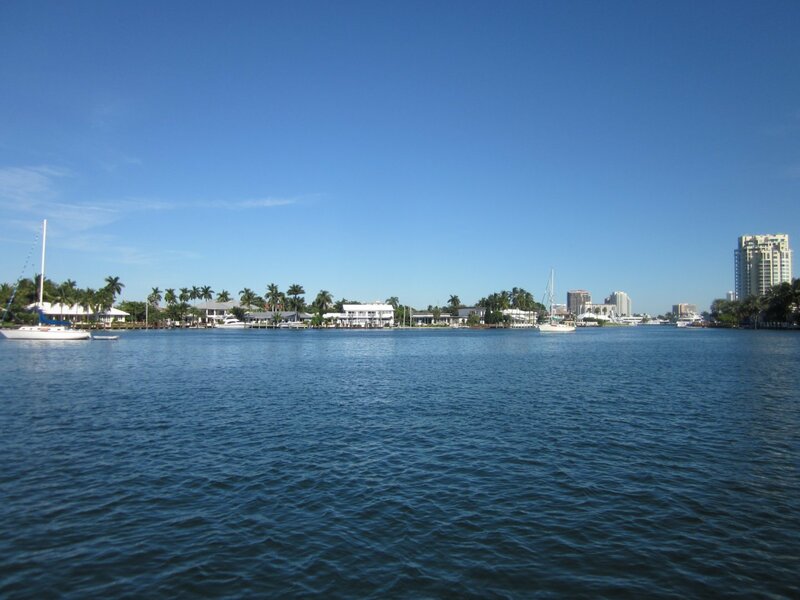 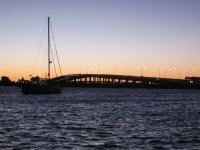 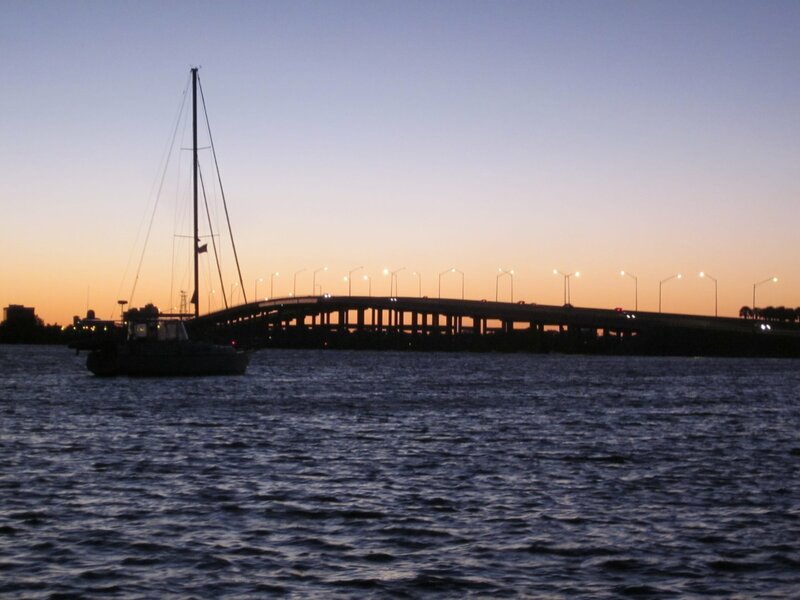 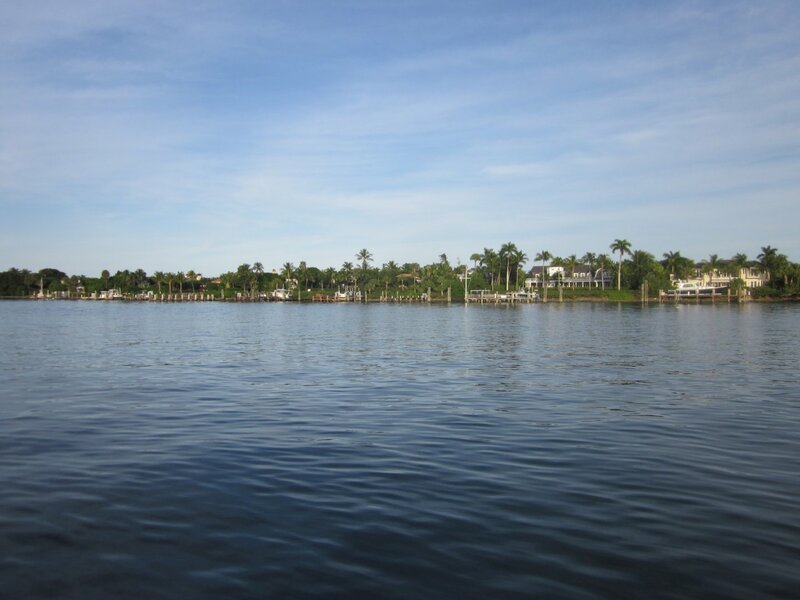 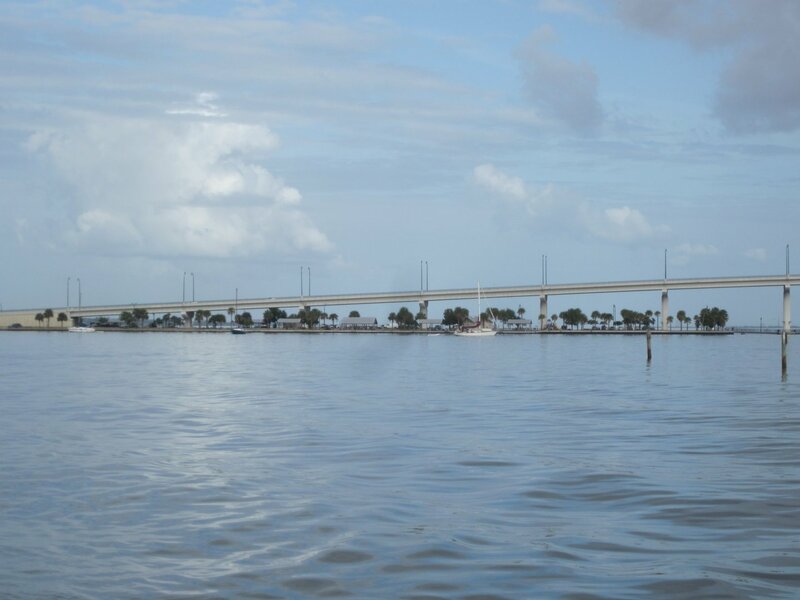 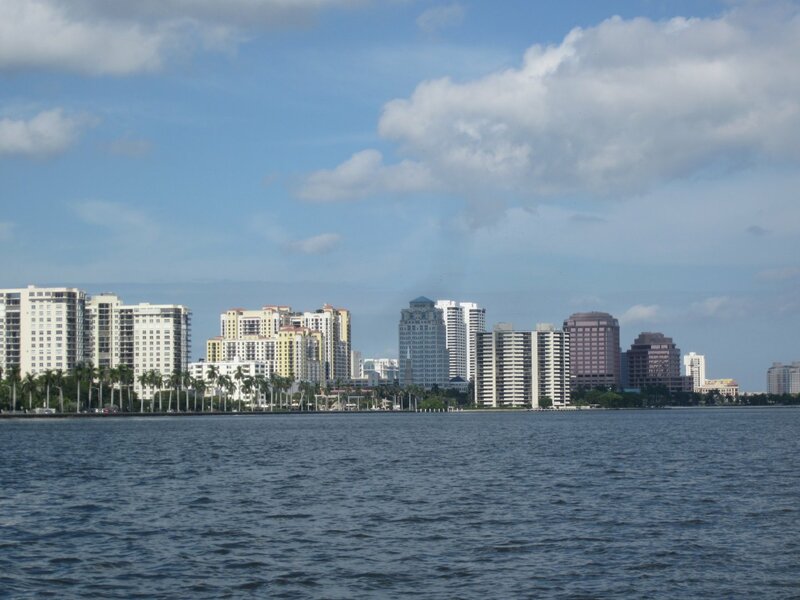 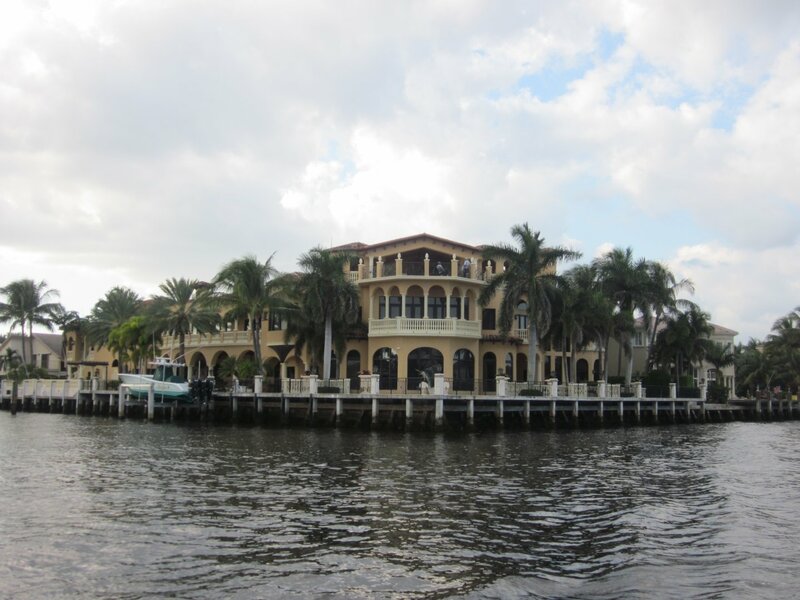 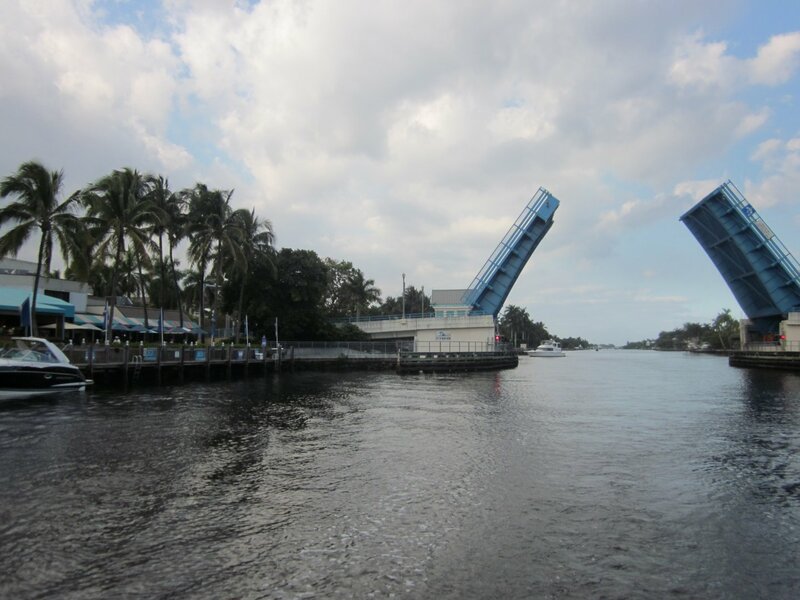 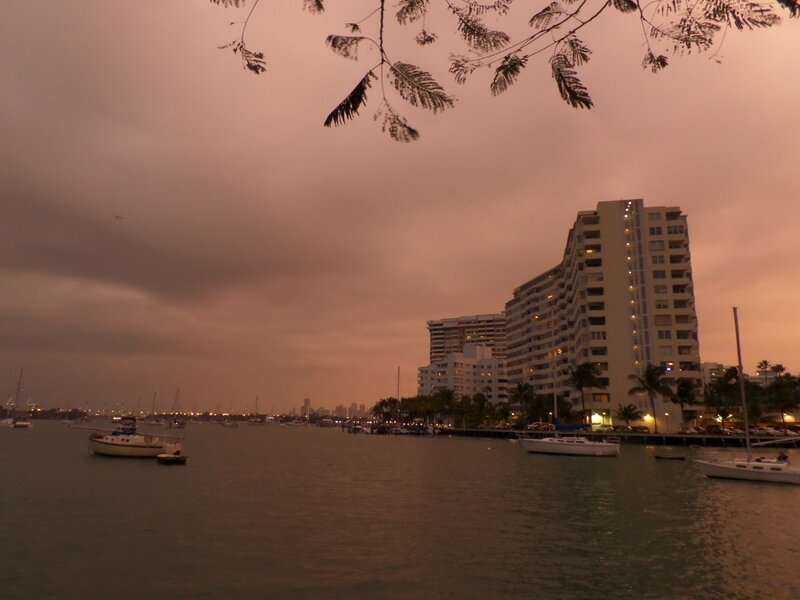 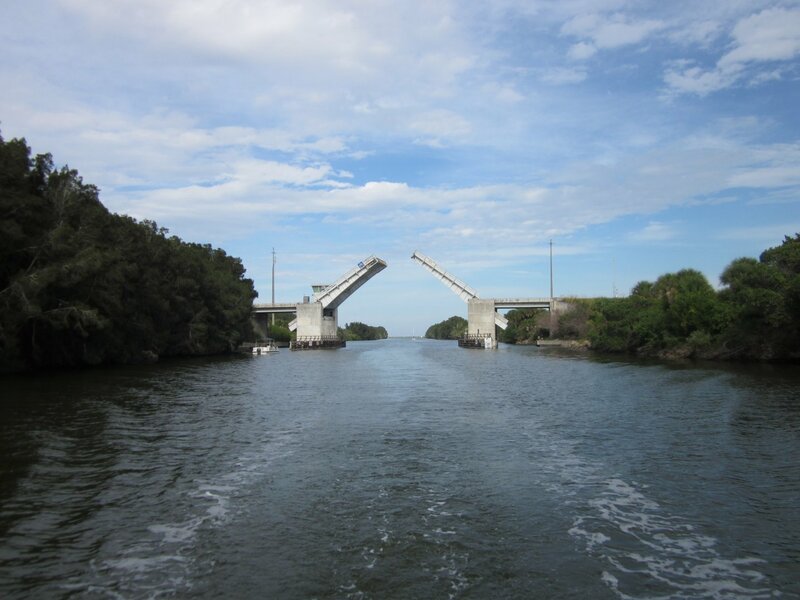 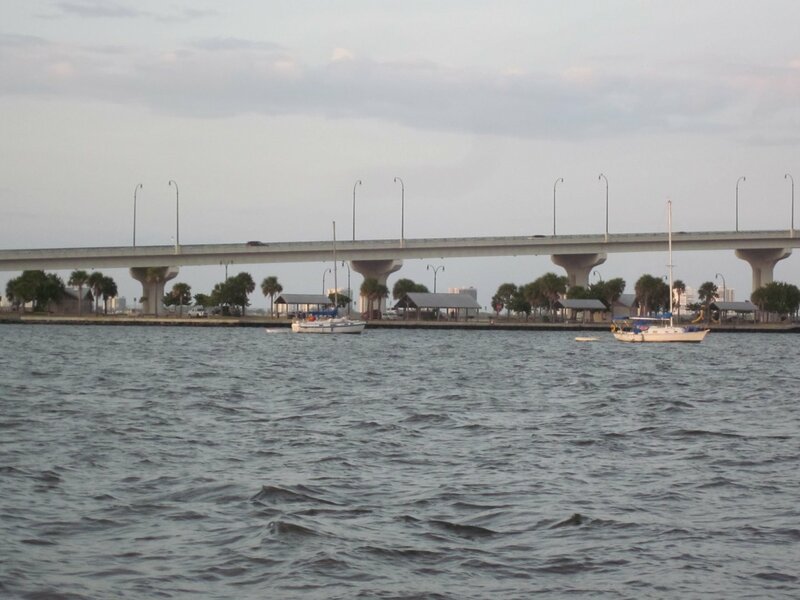 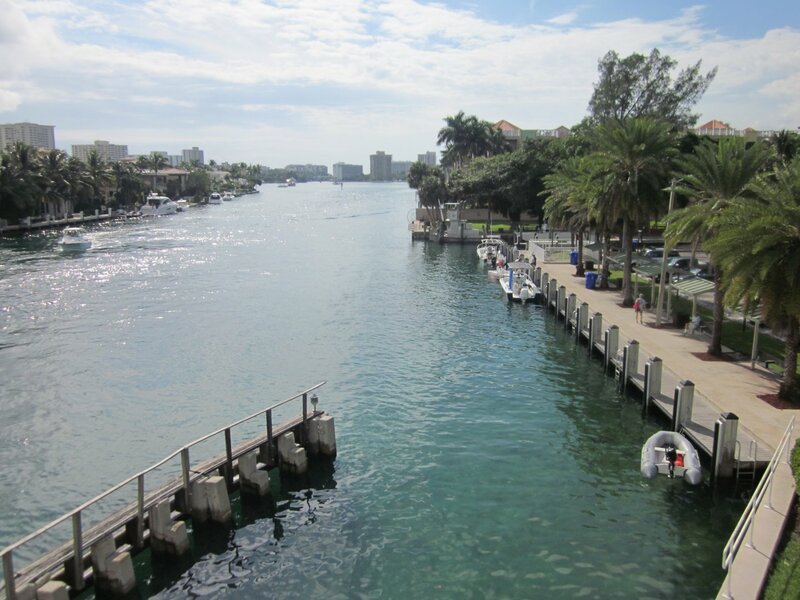 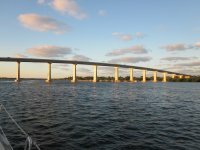 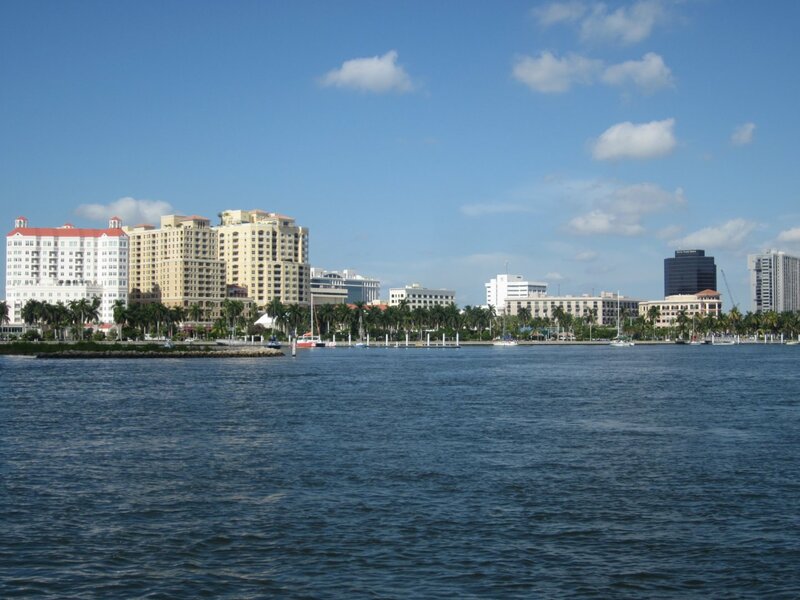 Could take an off-shore route to Ft. Lauderdale � to avoid the �bridge hell�, but the weather forecast called for at least several days of not suitable weather, so decided to dredge the Bridge Hell instead of waiting � so leaving next morning. 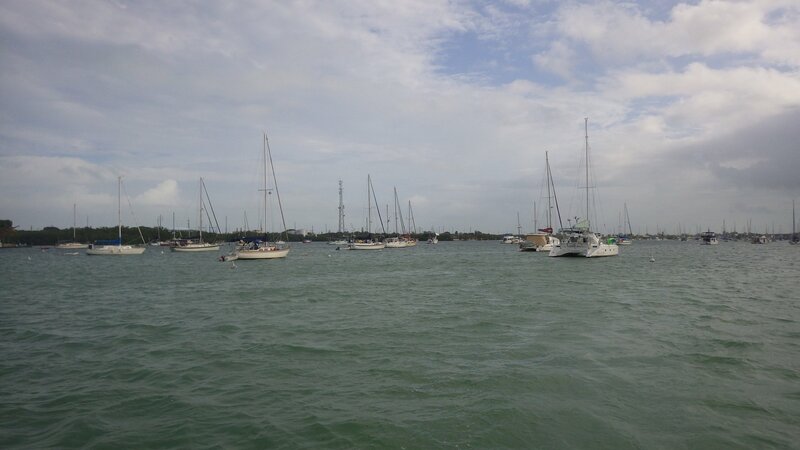 At first, seemed to be a very tight anchorage with lots of boats, difficult to find a spot to drop a hook. 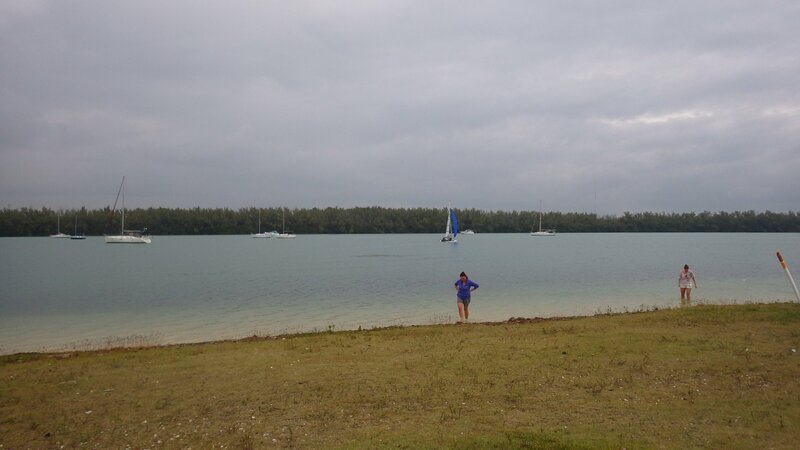 Turned out most were locals having fun is shallow water during the day. 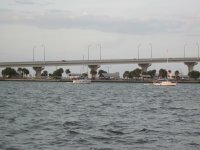 It was very entertaining to see lots of people playing. 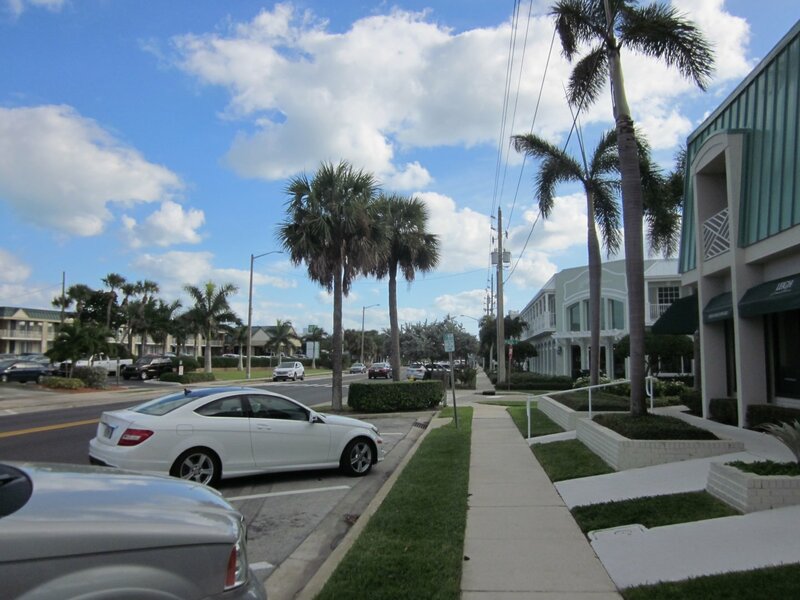 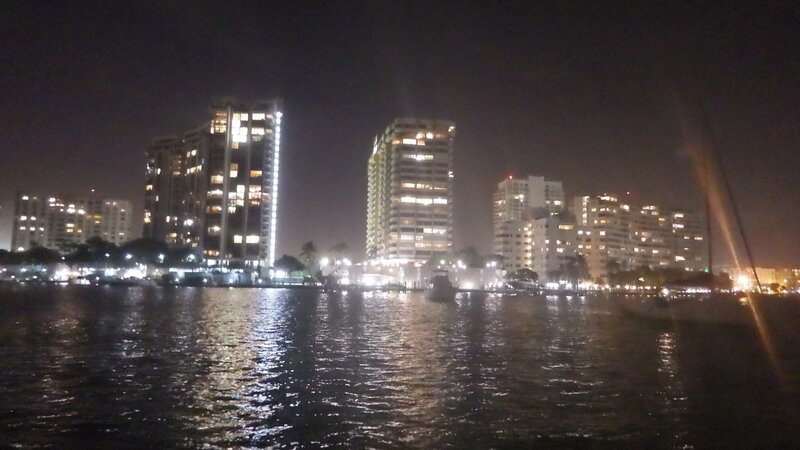 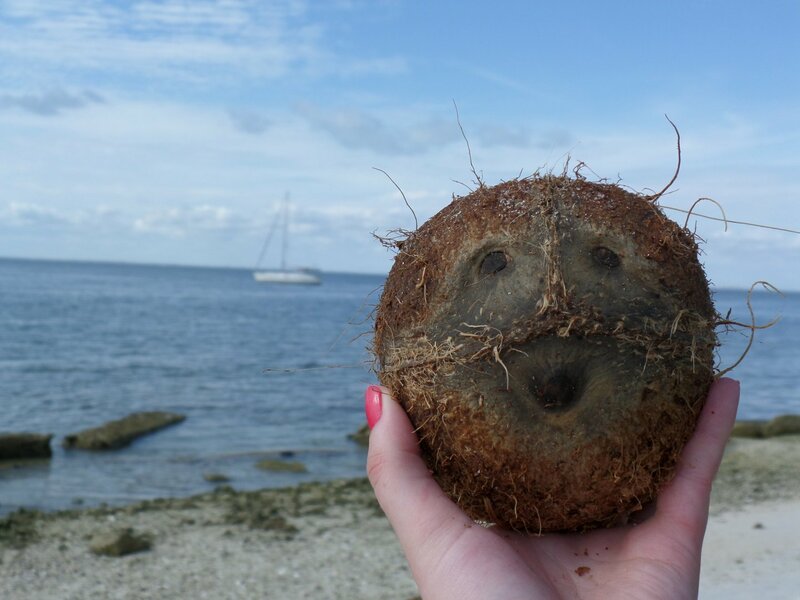 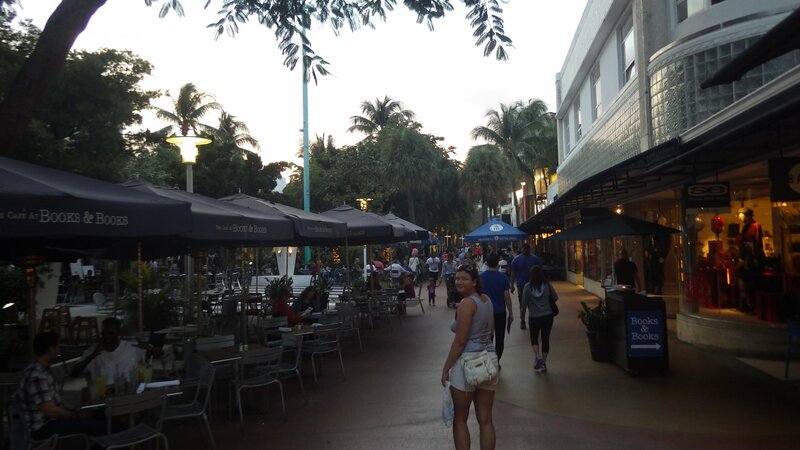 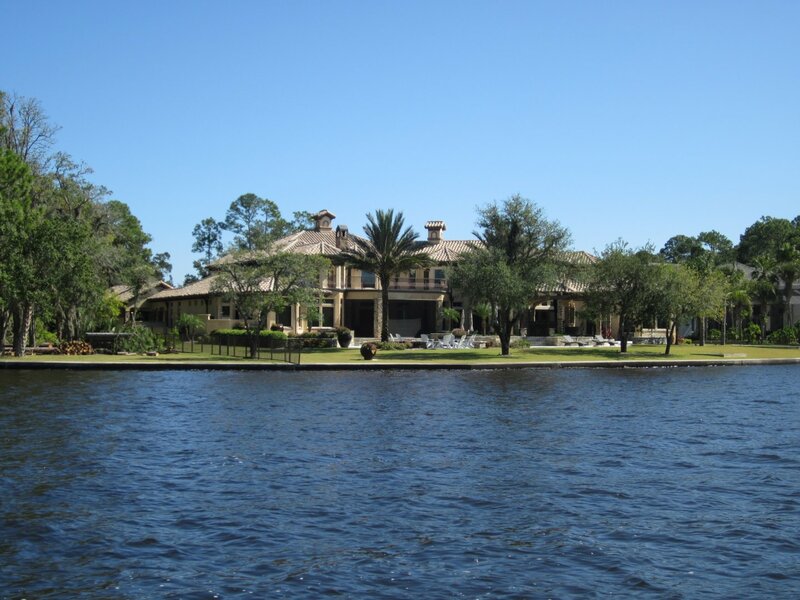 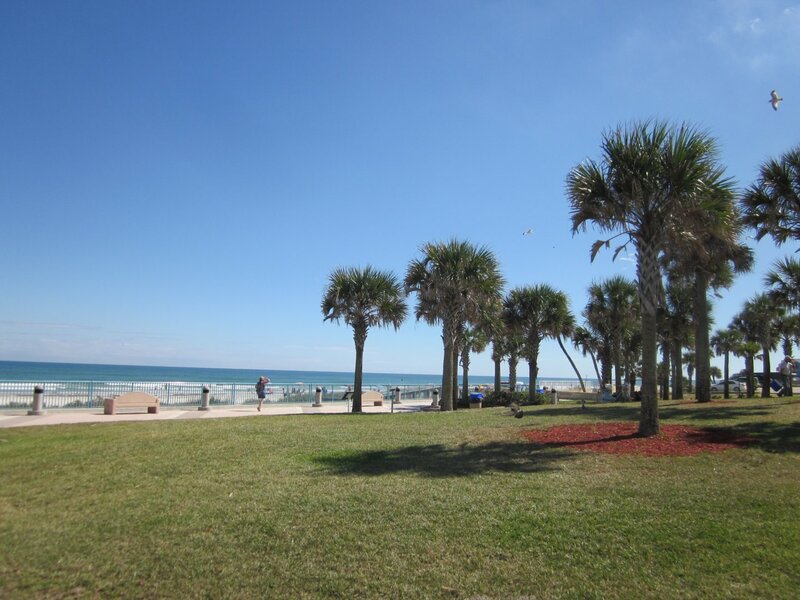 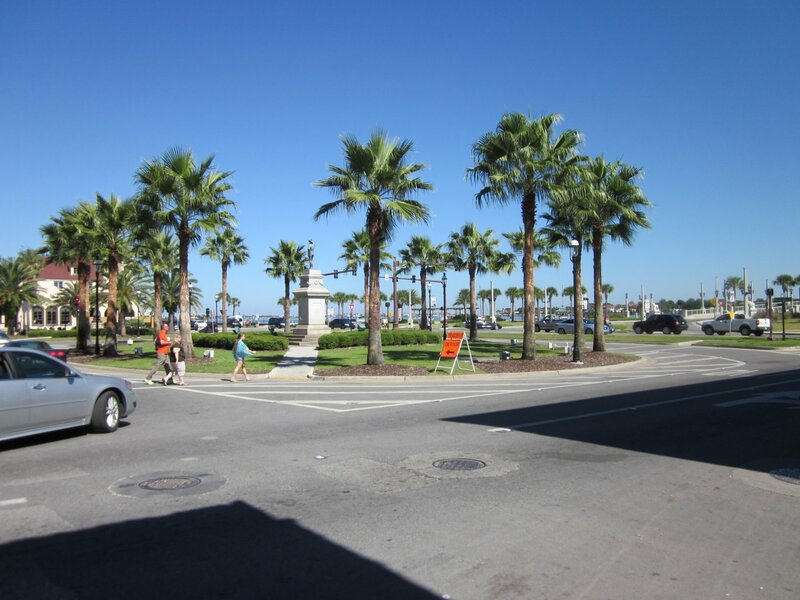 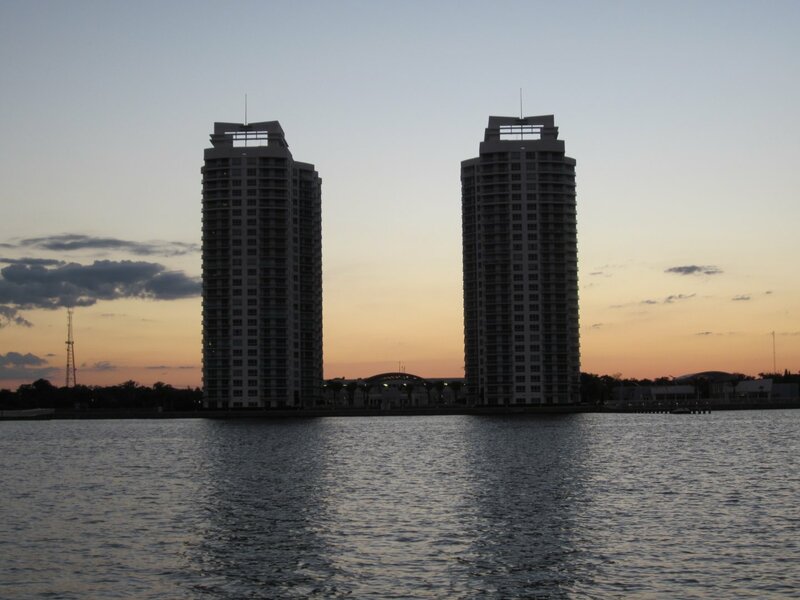 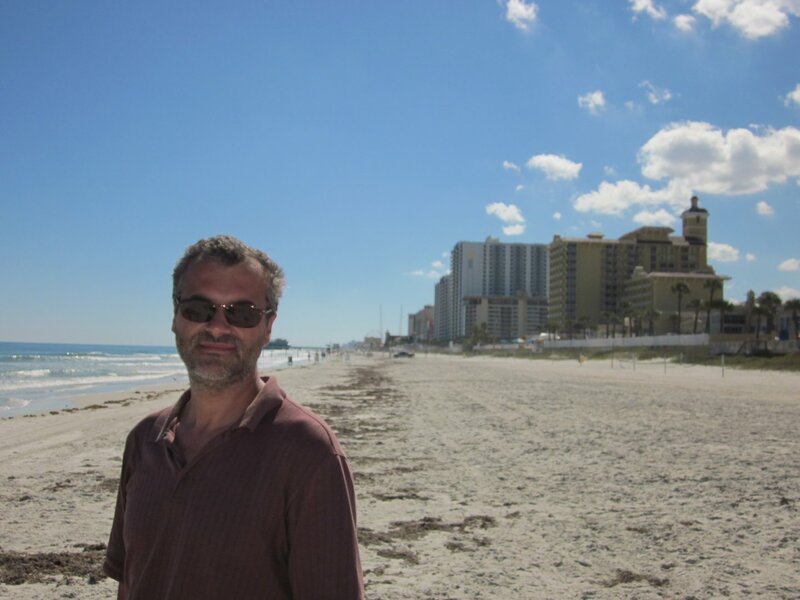 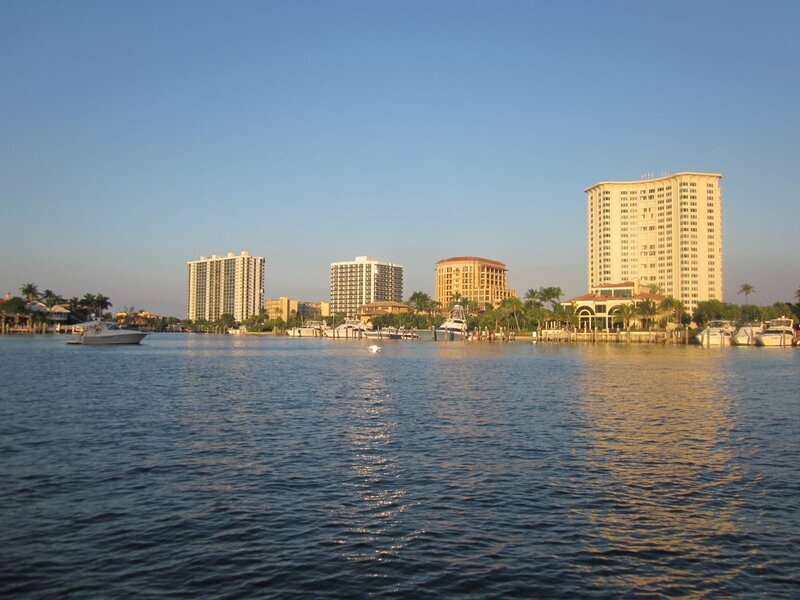 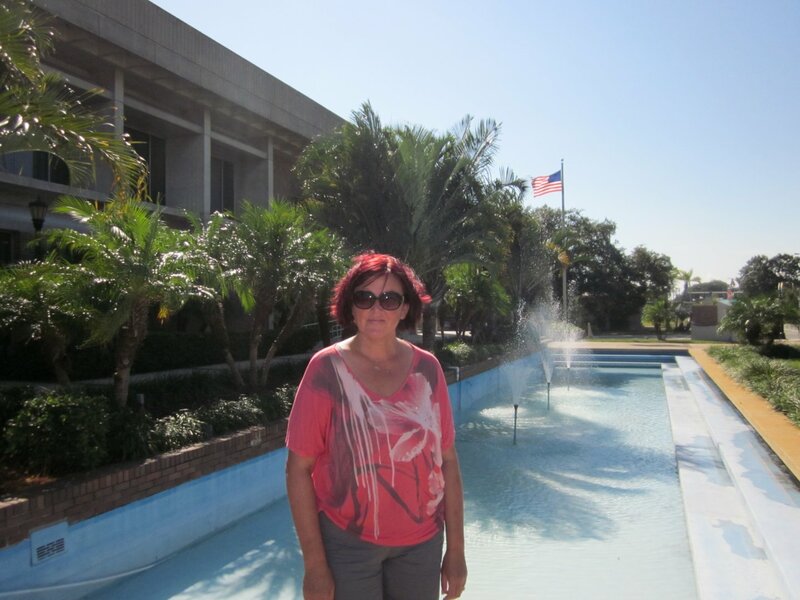 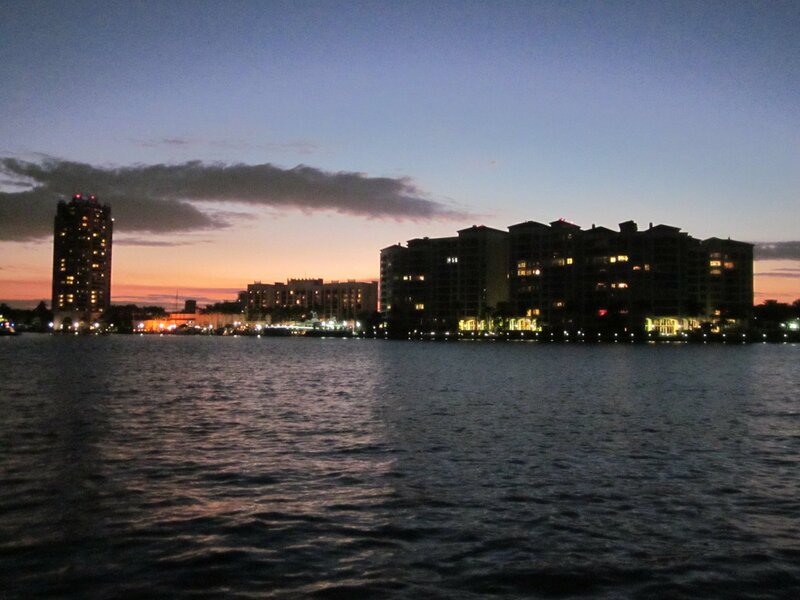 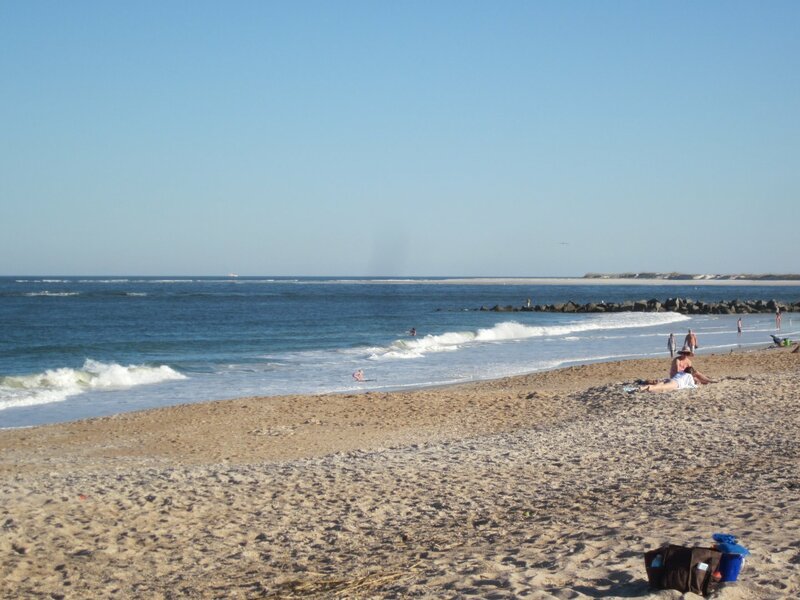 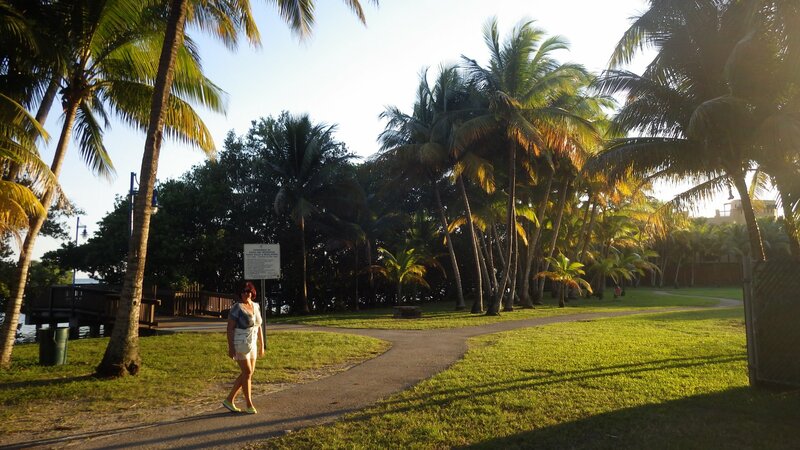 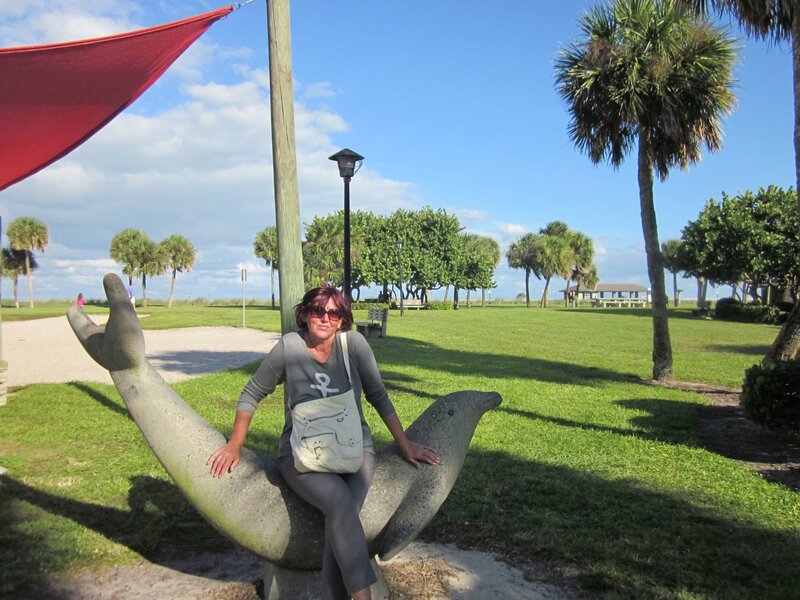 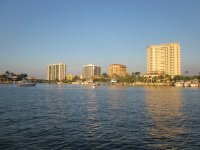 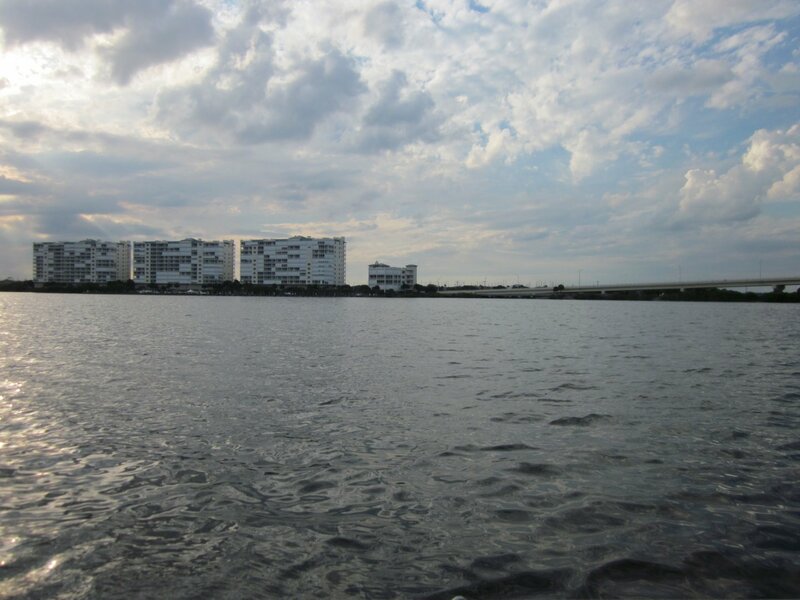 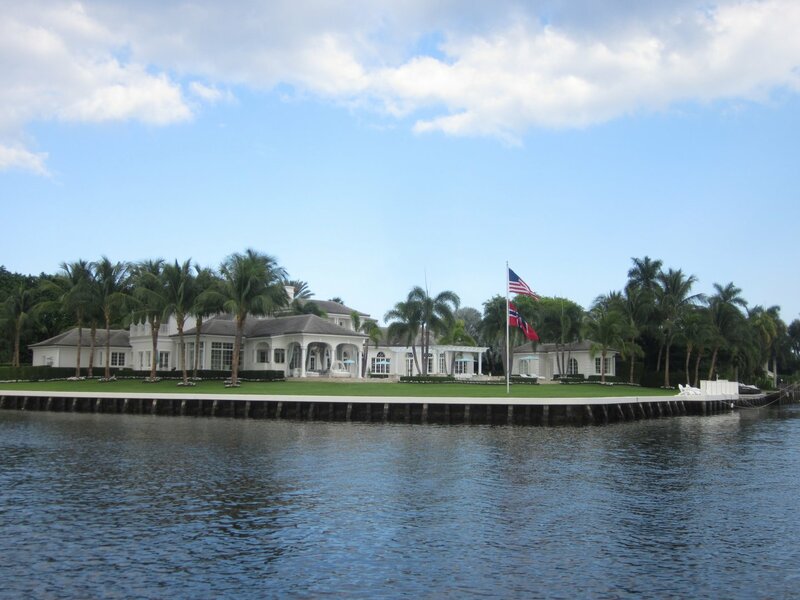 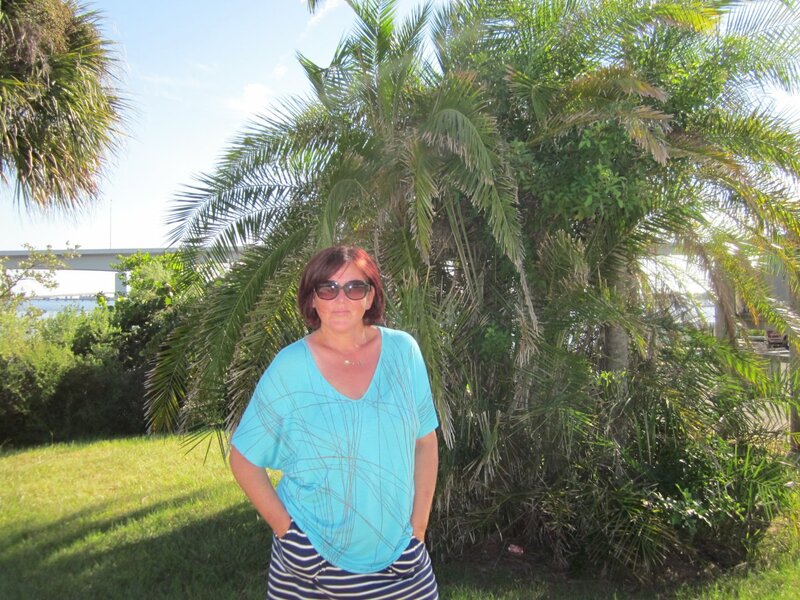 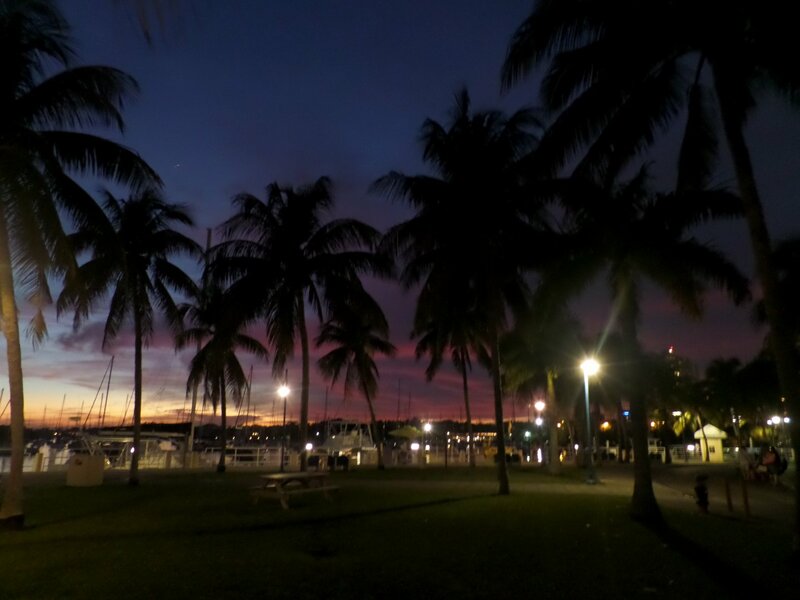 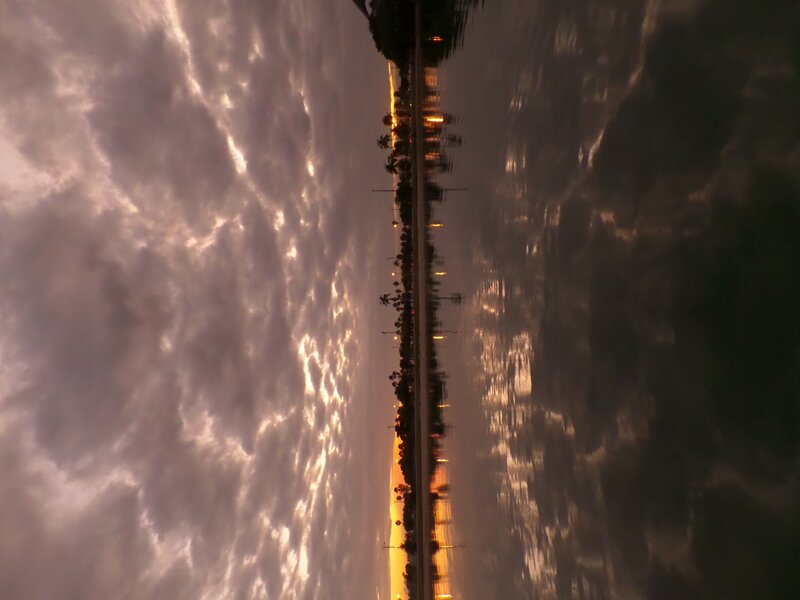 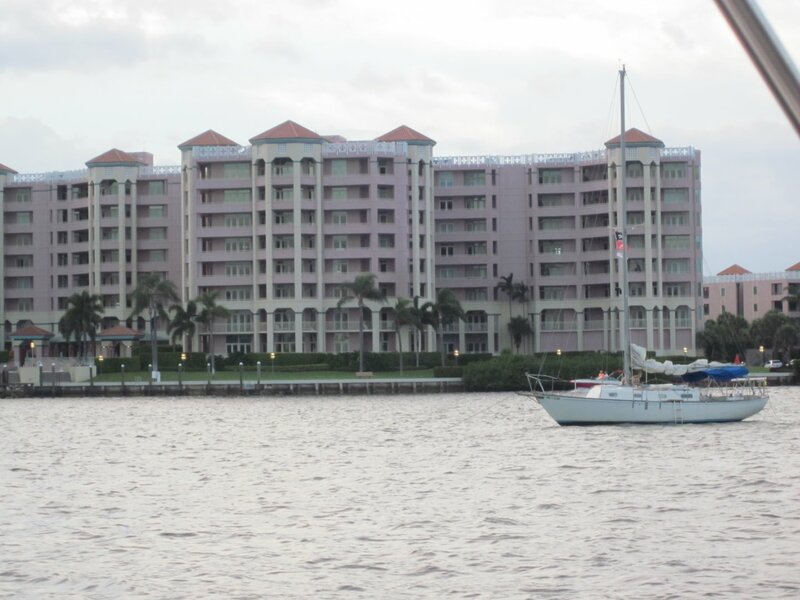 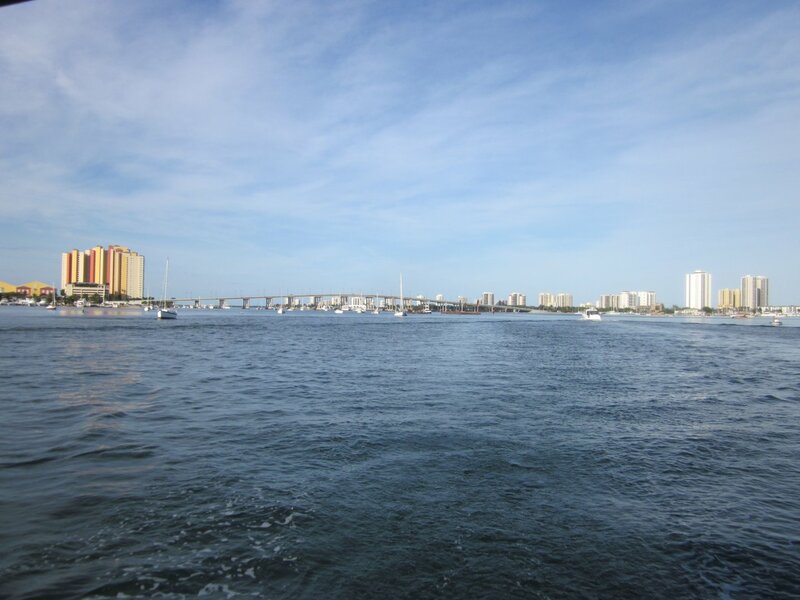 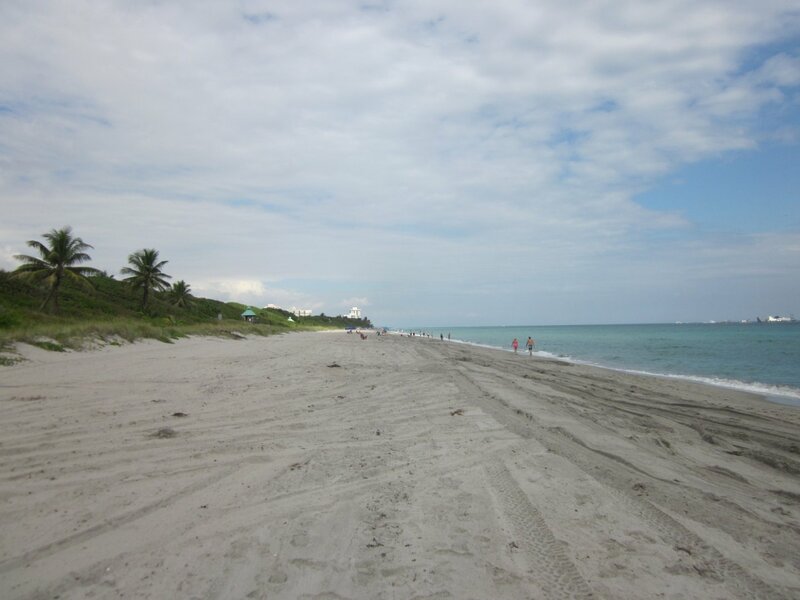 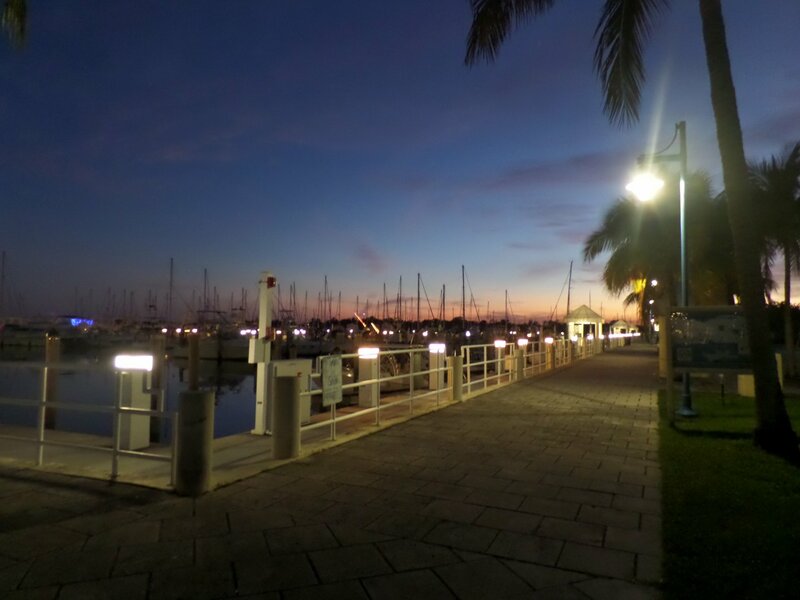 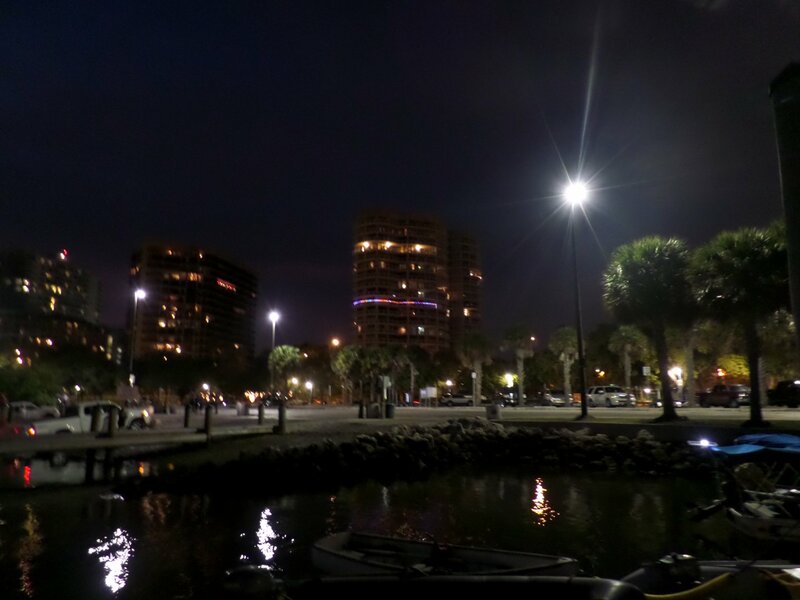 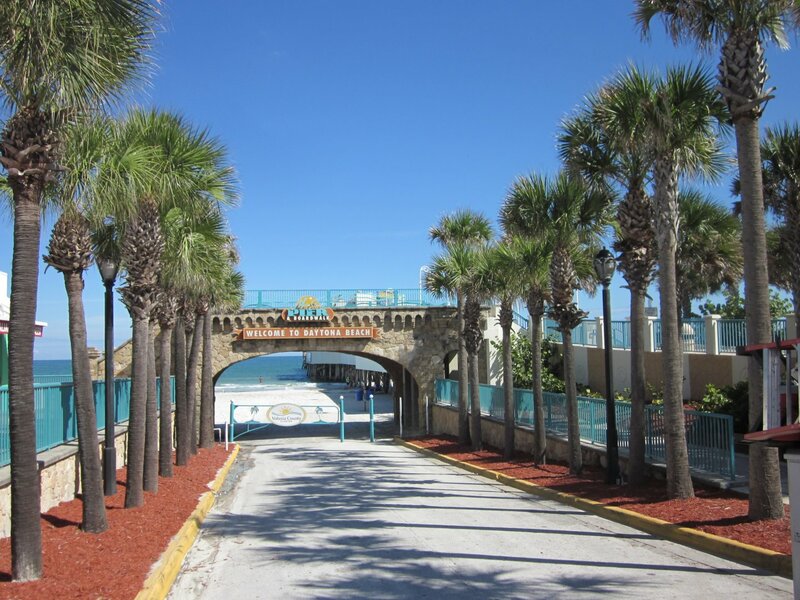 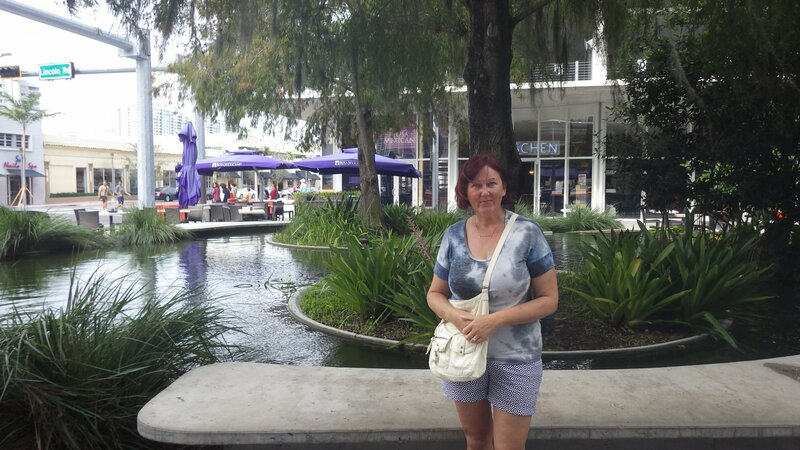 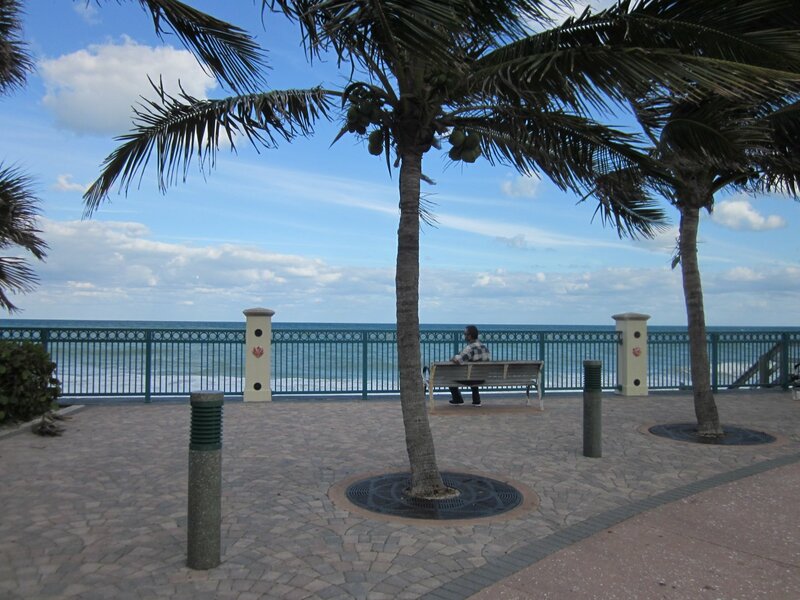 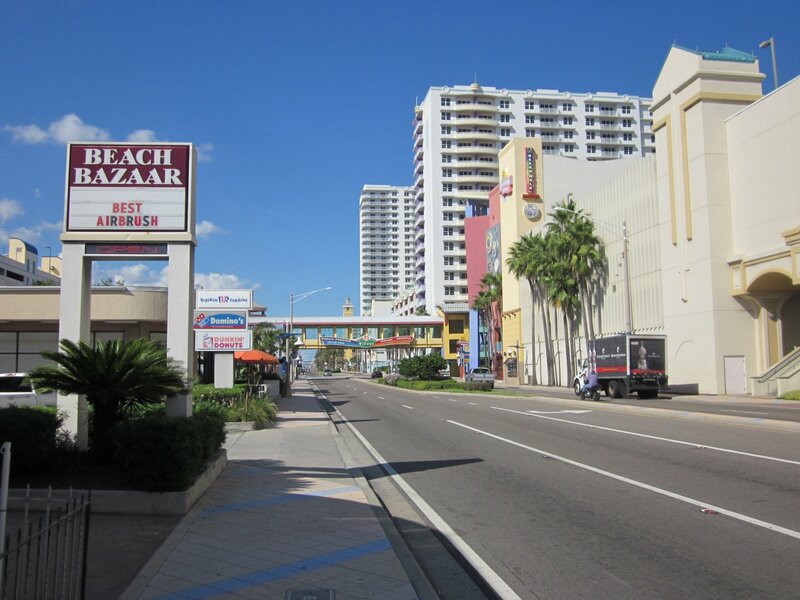 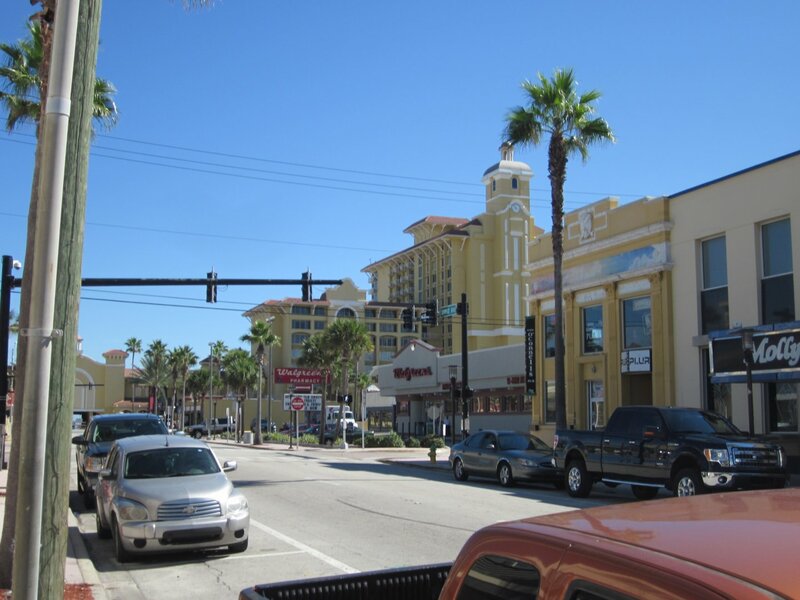 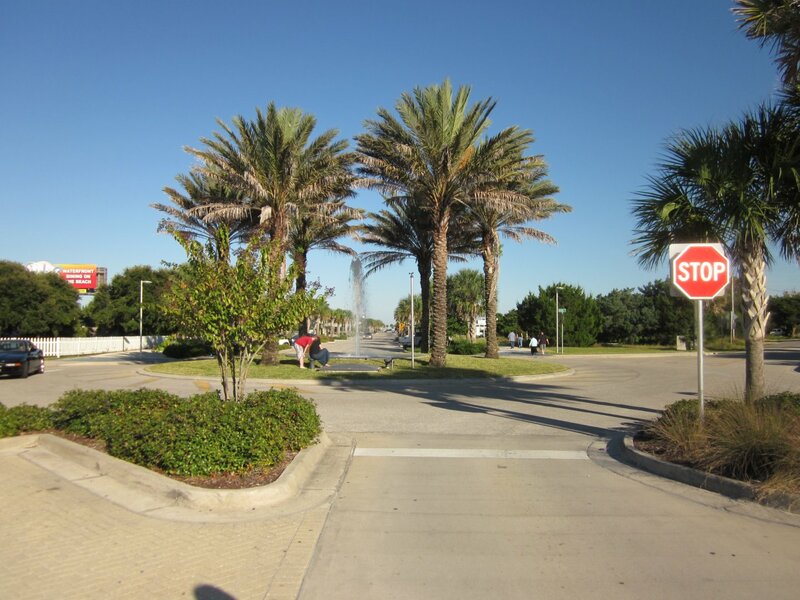 Spend couple nights in Boca � walked around the place, and had a very pleasant time at the beach. 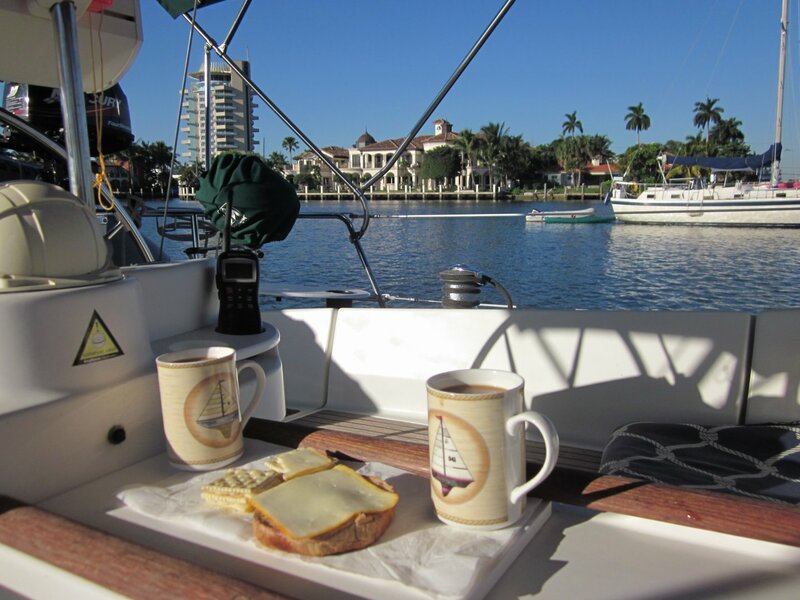 Sent couple of days at the Lake Silvia anchorage in Ft. Lauderdale. 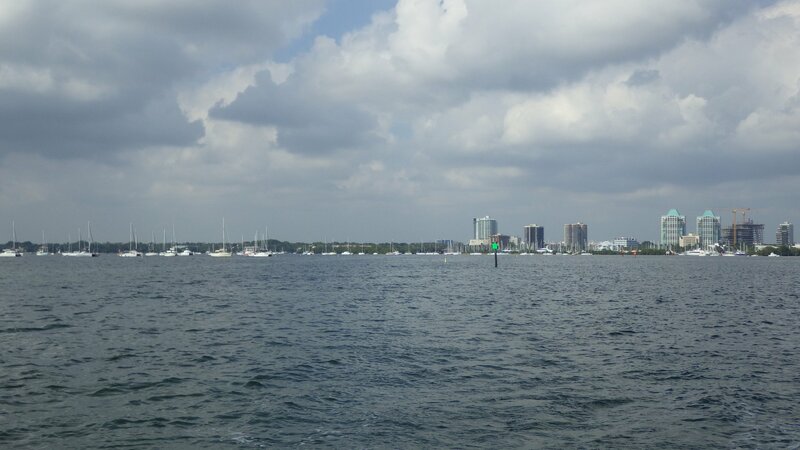 Since we have traveled to this city before, we didn't feel the need to explore much - just as stroll around neighborhood, got some marine supplies and groceries. 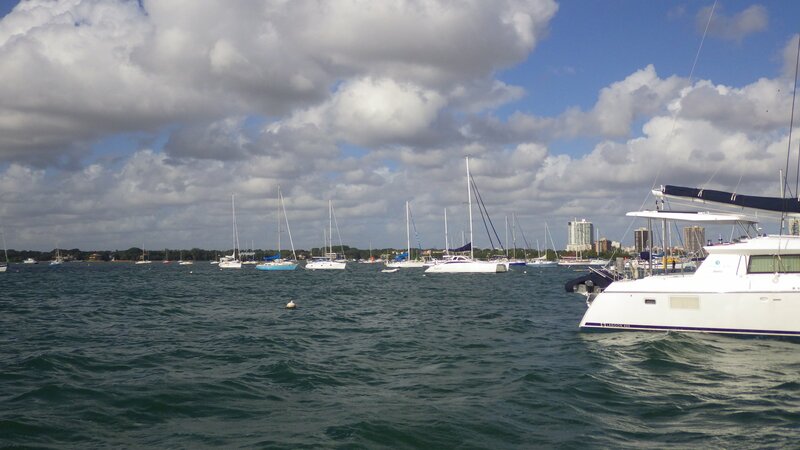 Then spent a day on the boat puttering around, fixing some stuff and just enjoying the nice weather day. 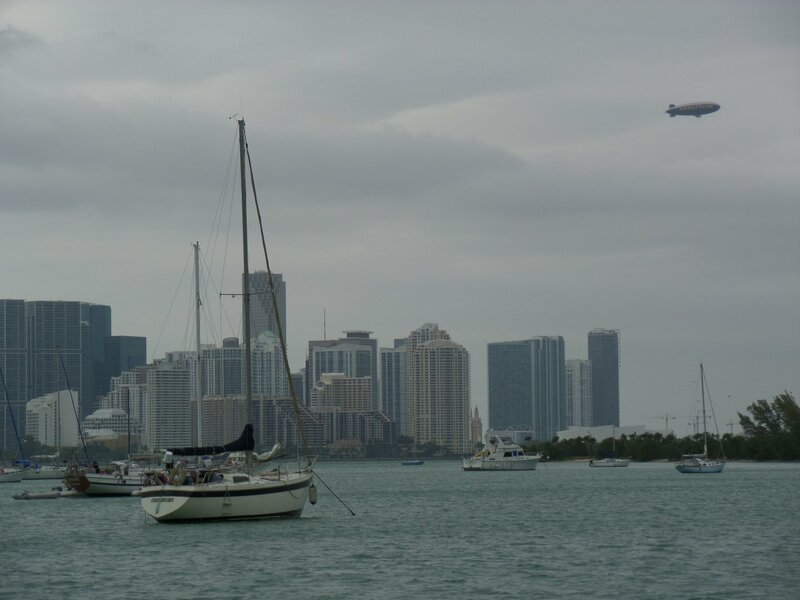 Also, didn�t want to miss a favorable weather window to make an outside passage to Miami � heading out next morning. 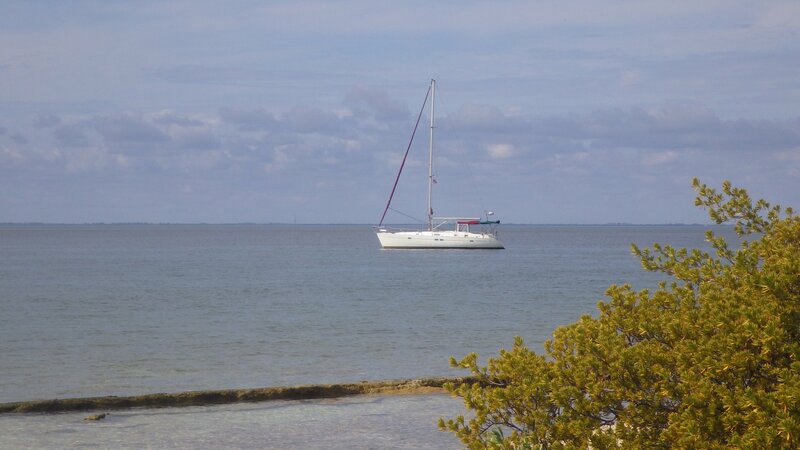 Anchored here on several occasions. 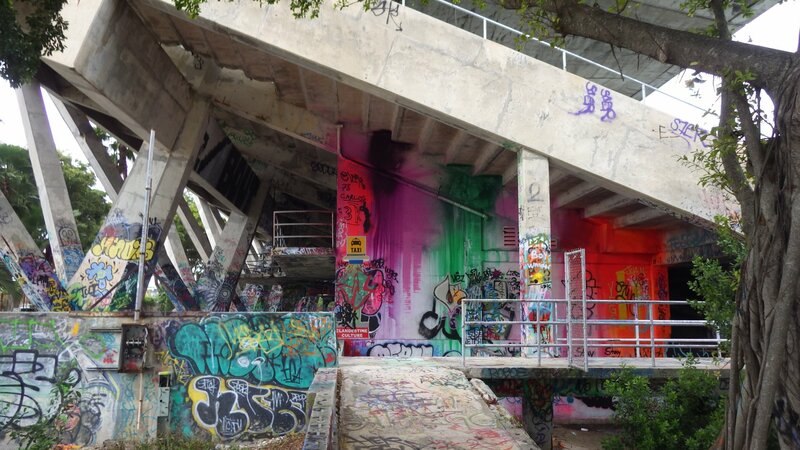 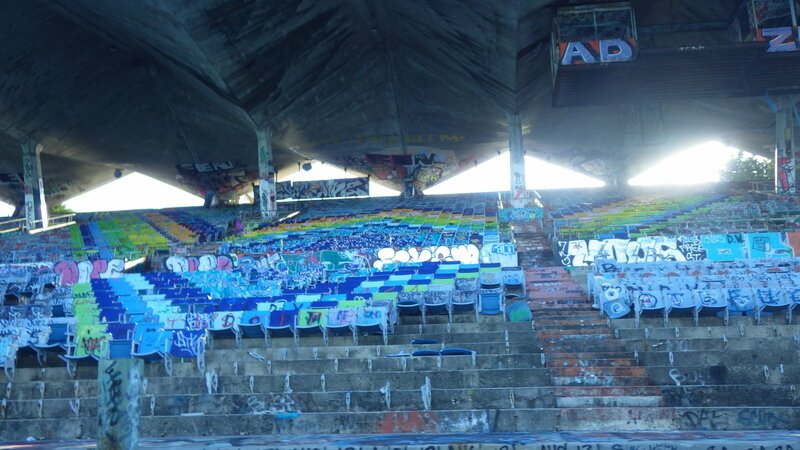 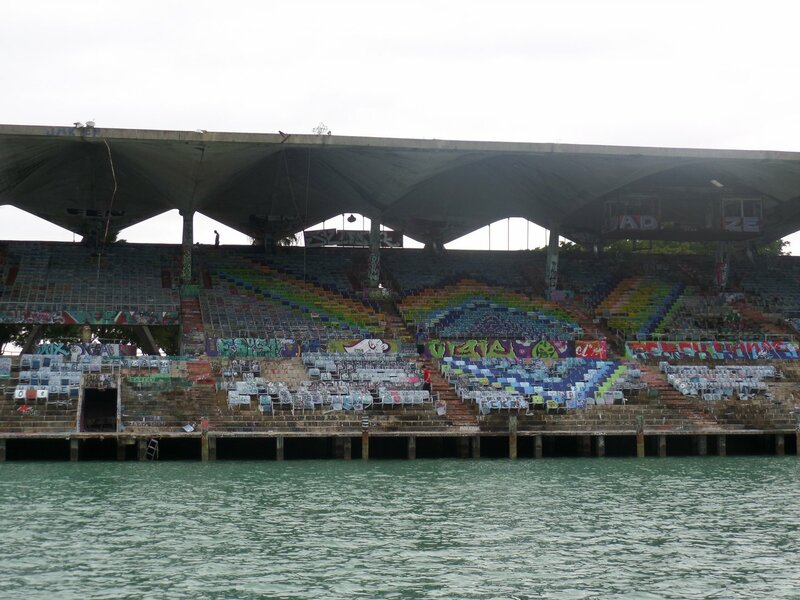 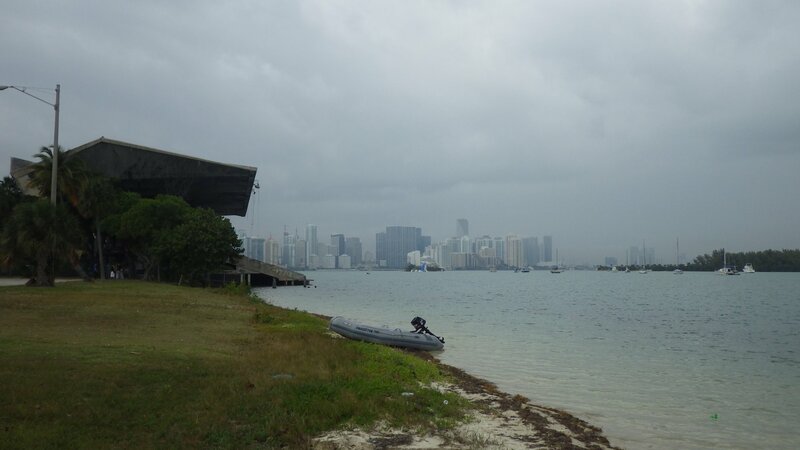 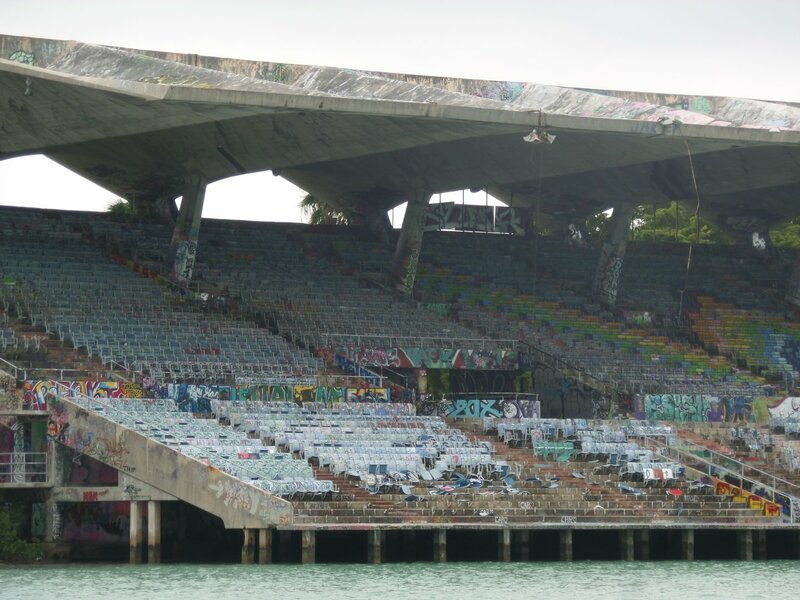 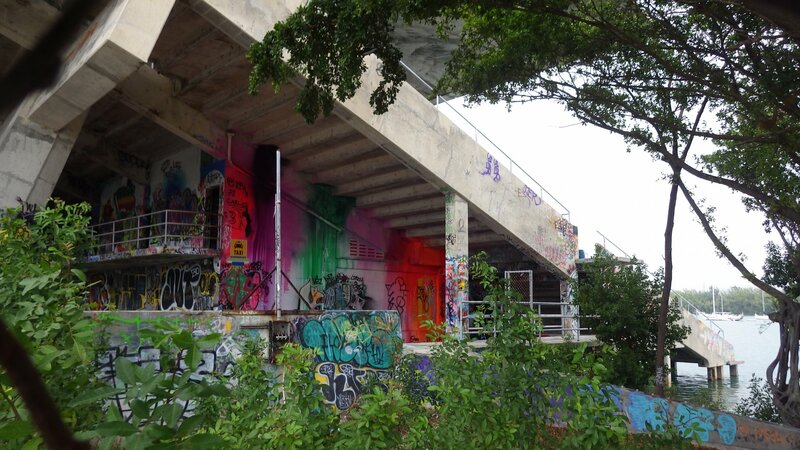 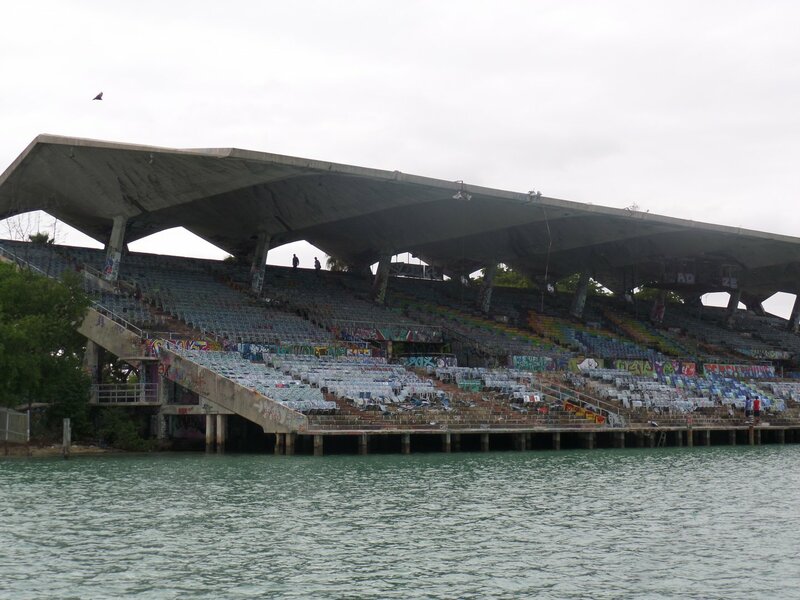 Interesting place � well protected from winds, amazing view of Miami skyline, and the abandoned Marine Stadium looks like from some post-apocalyptic movie. 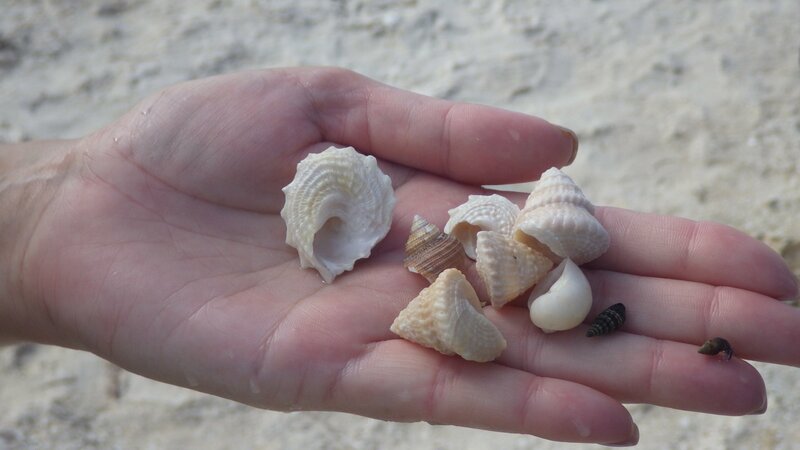 Not much amenities at the shore. 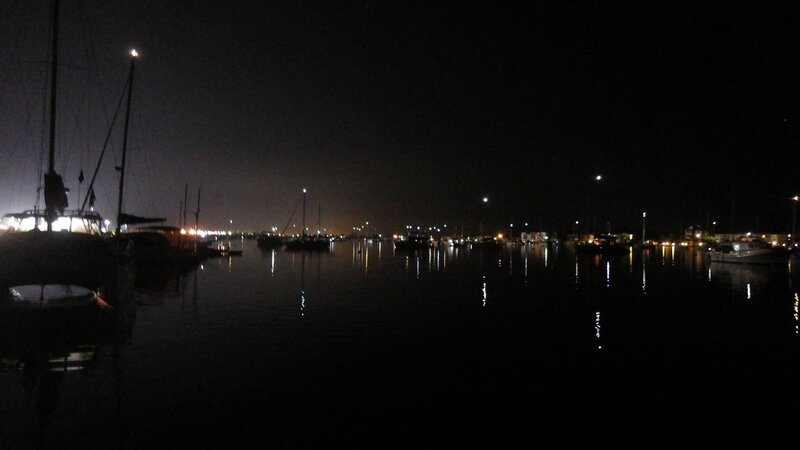 Although the place is quite noisy, at night in particular. 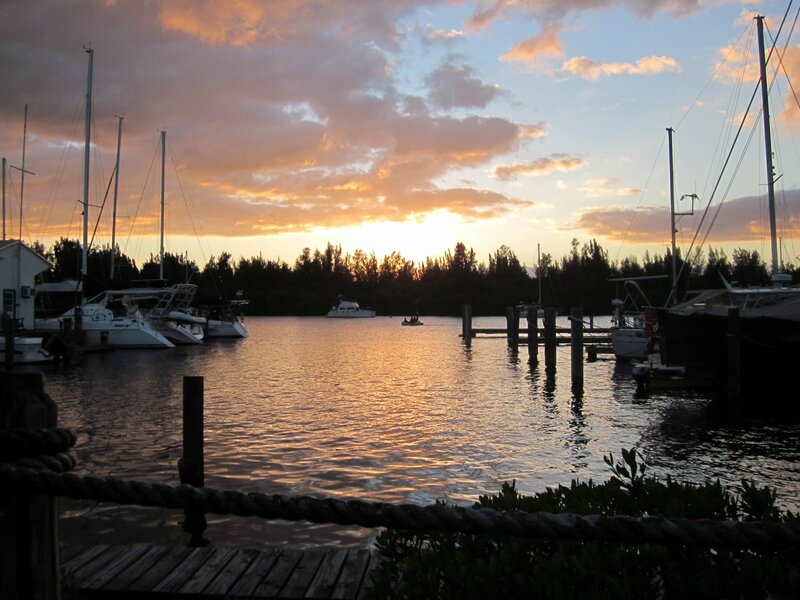 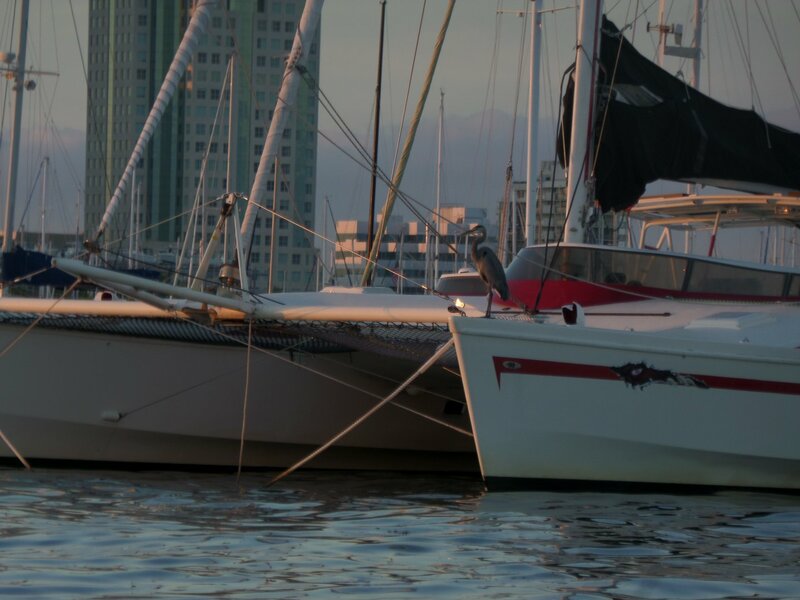 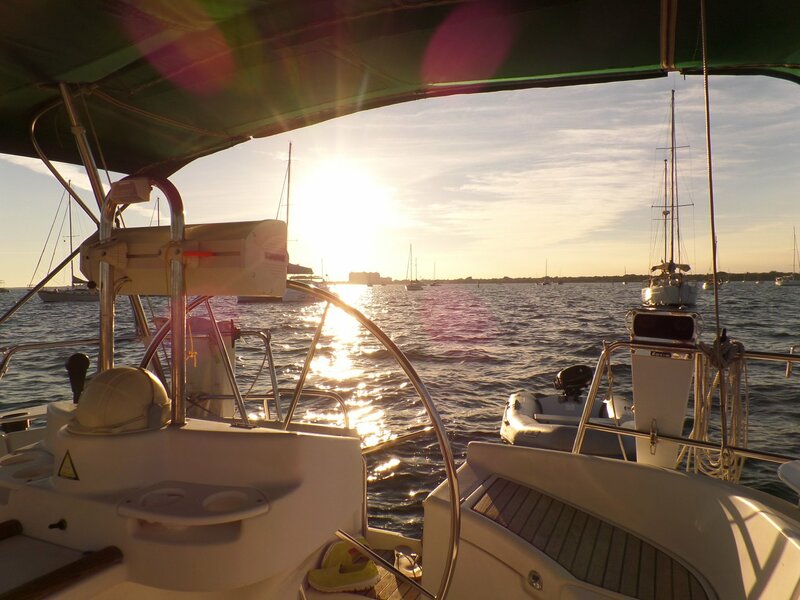 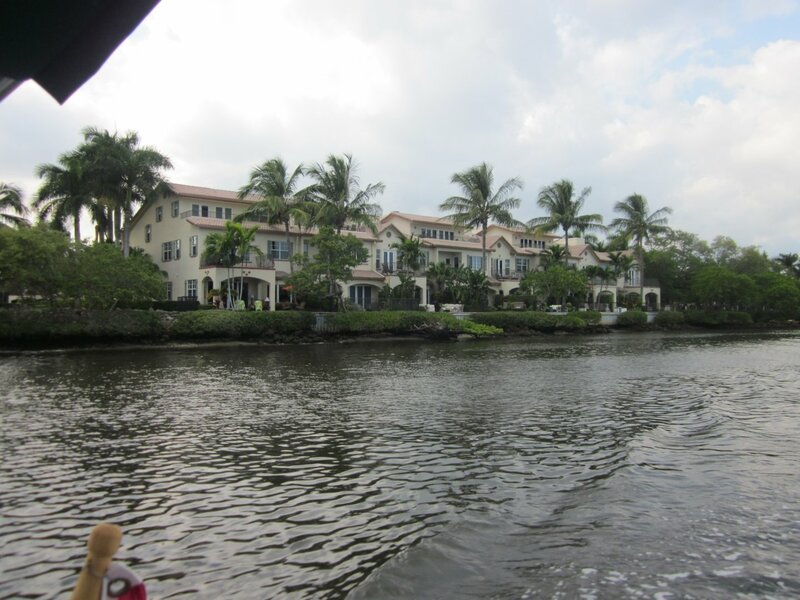 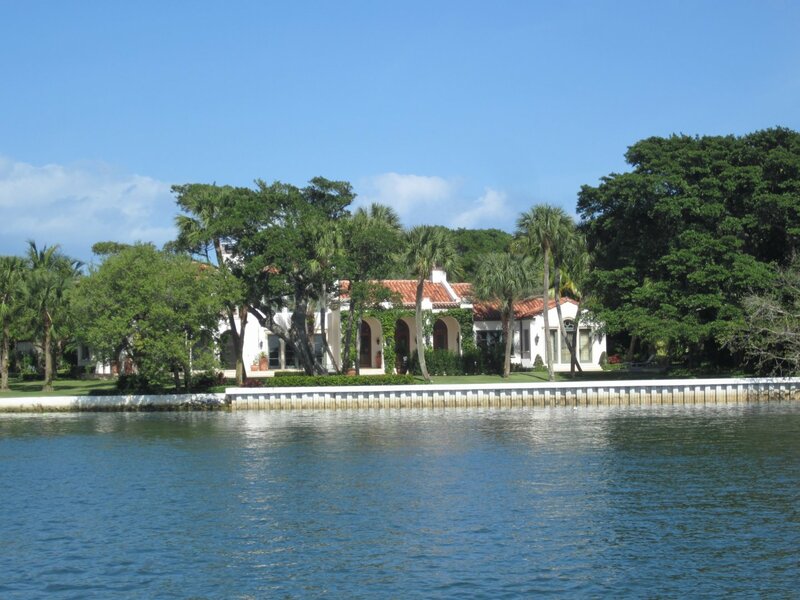 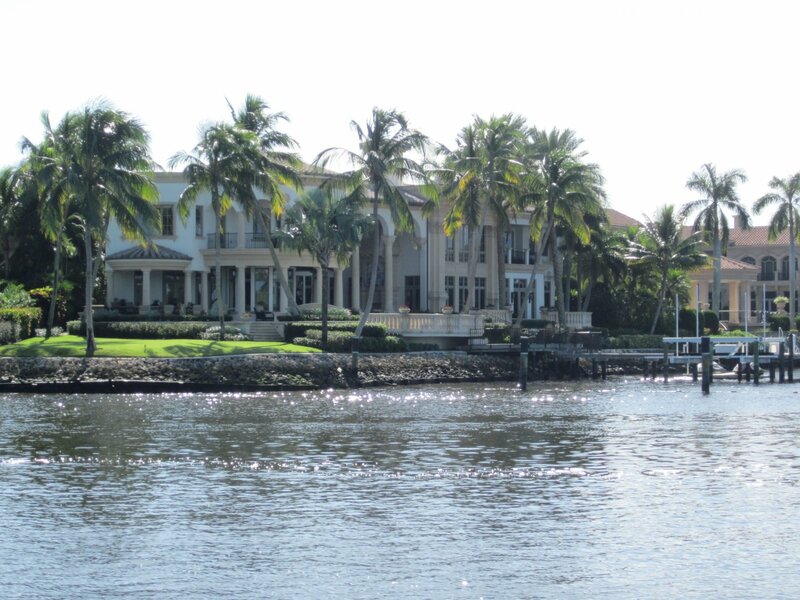 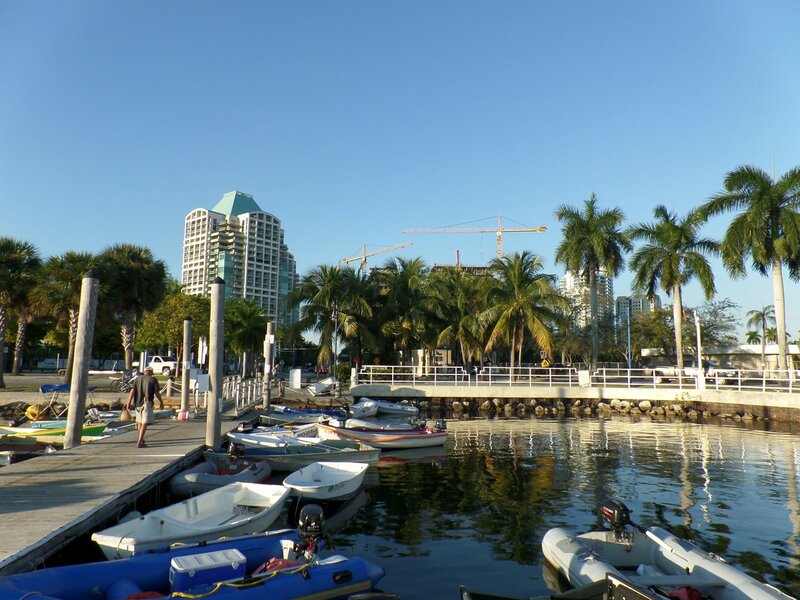 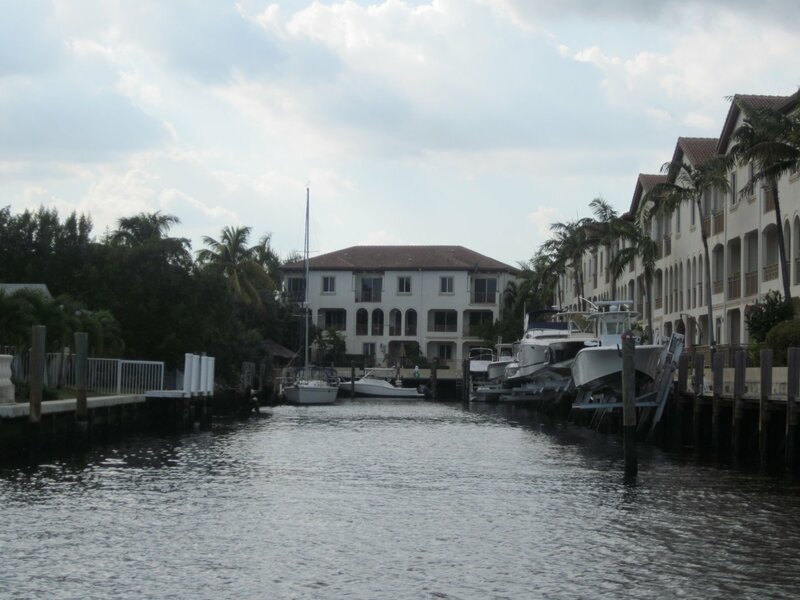 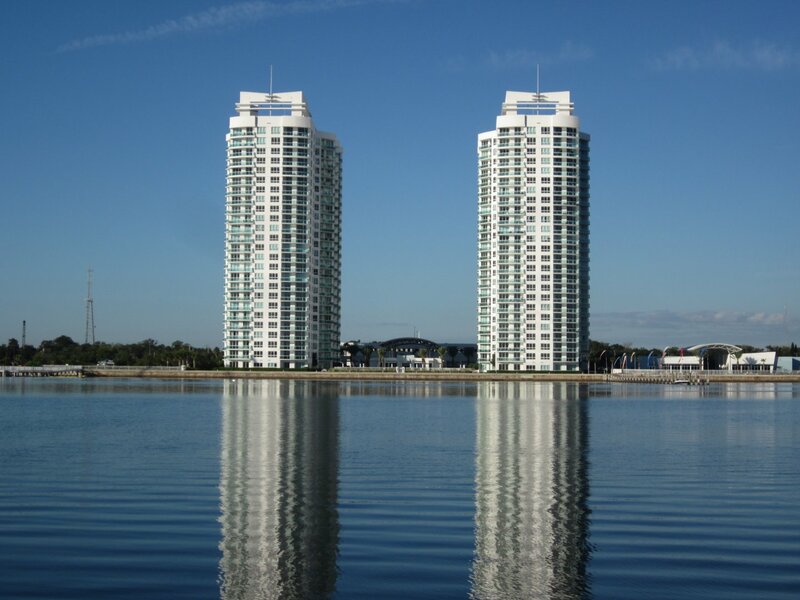 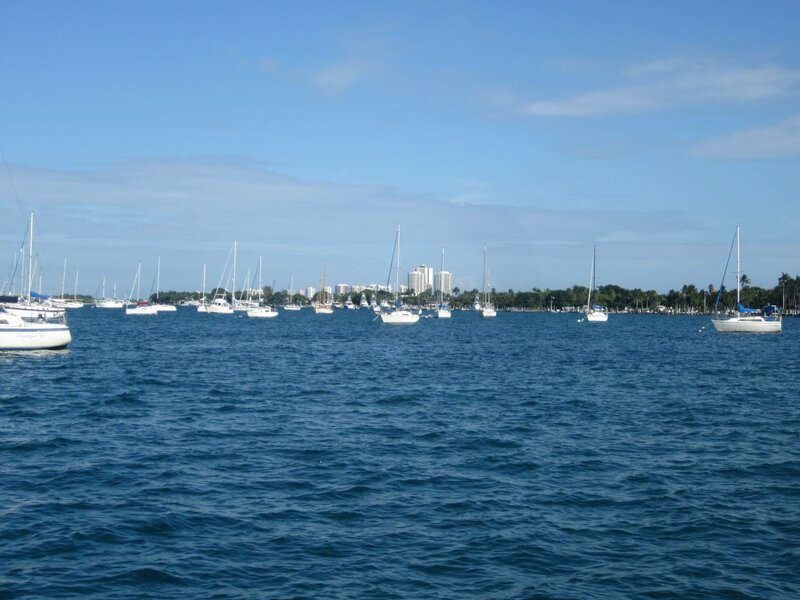 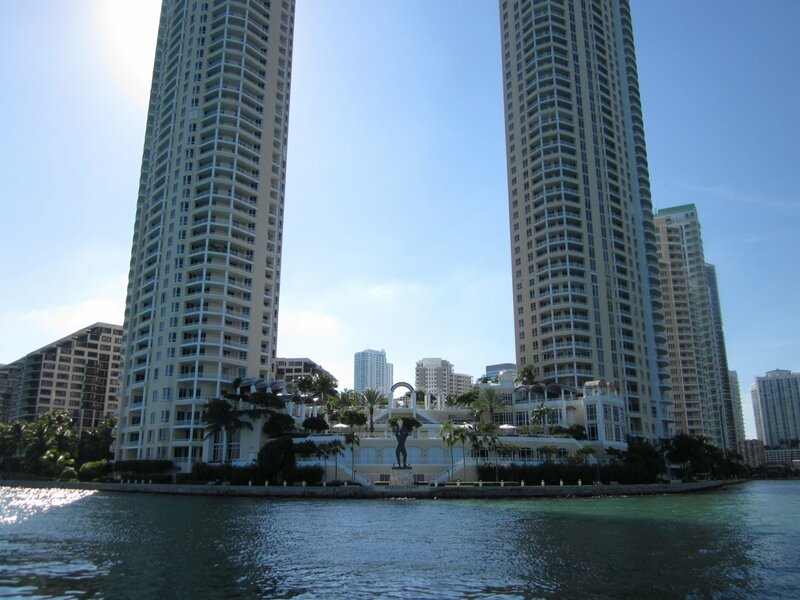 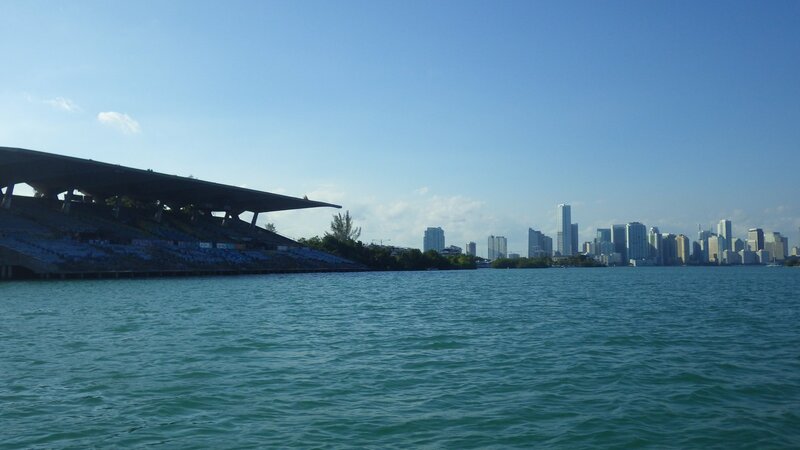 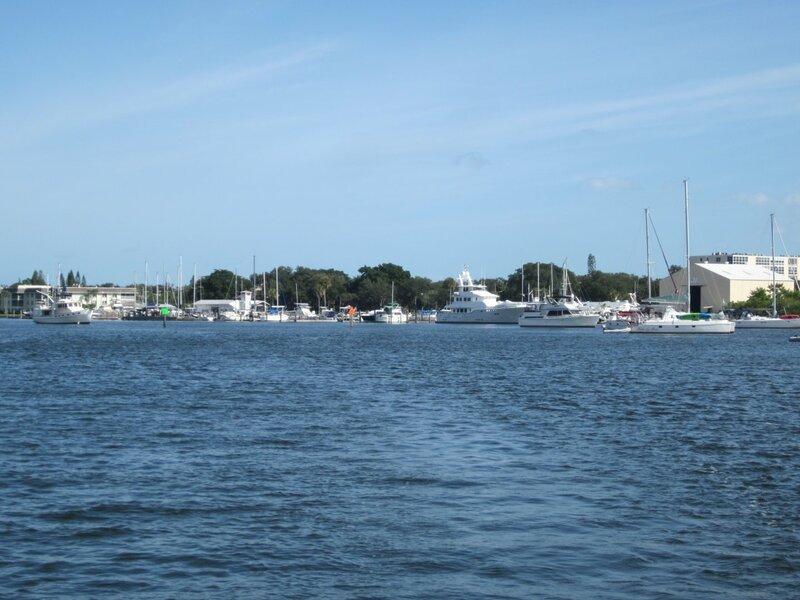 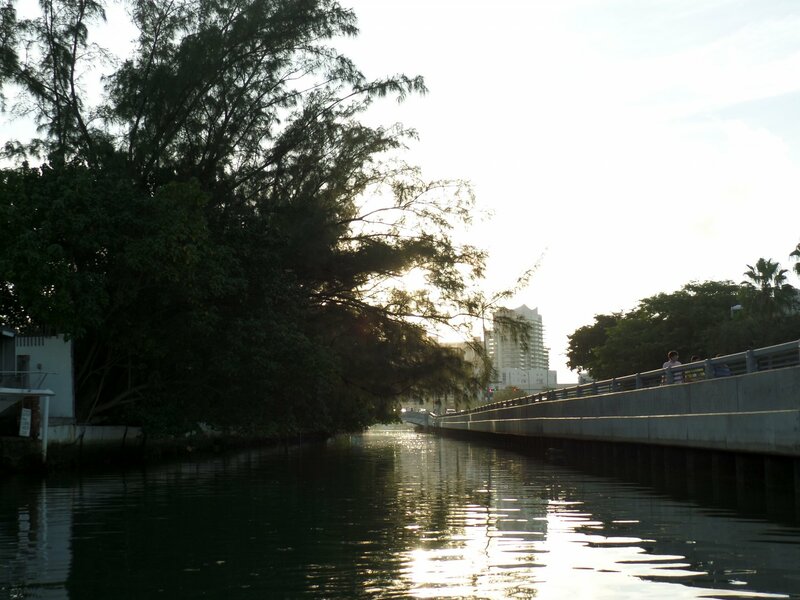 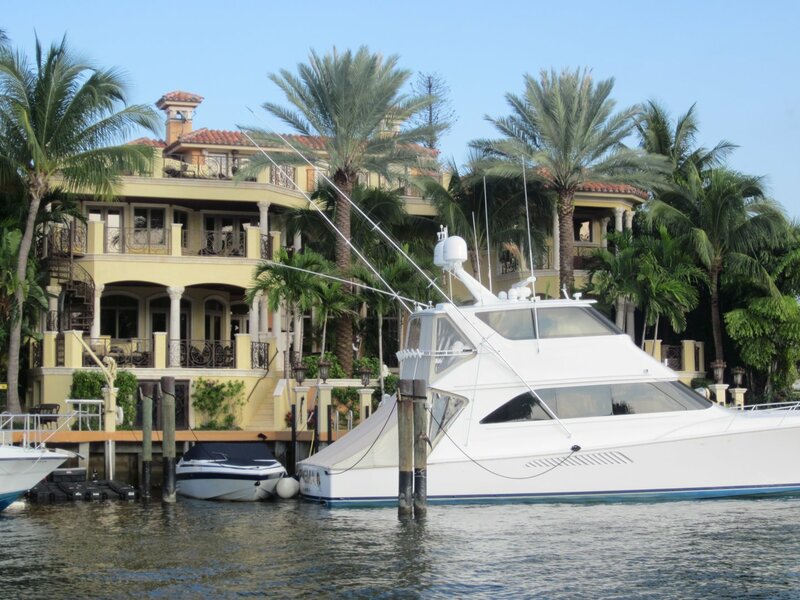 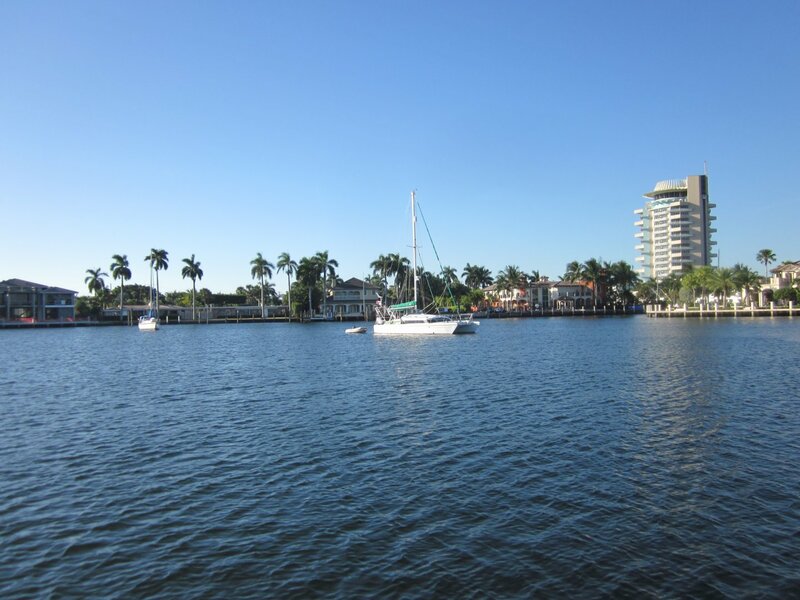 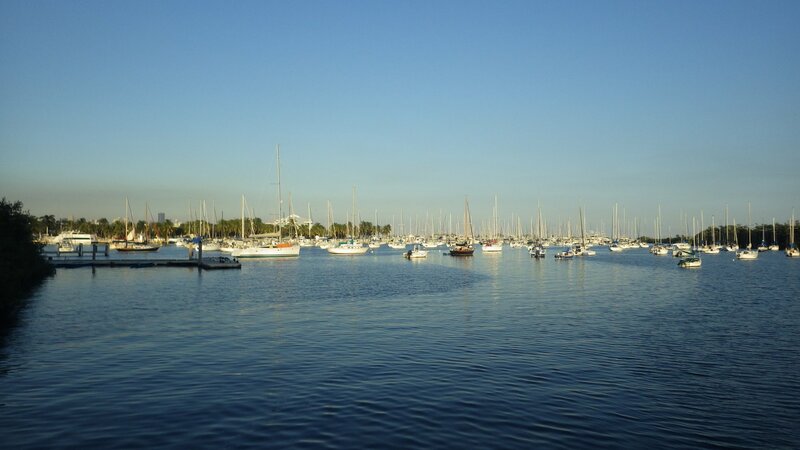 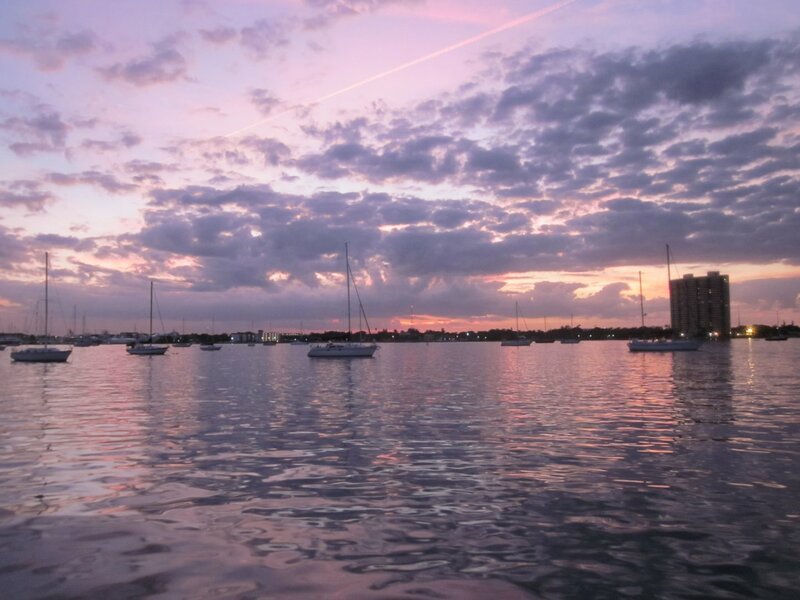 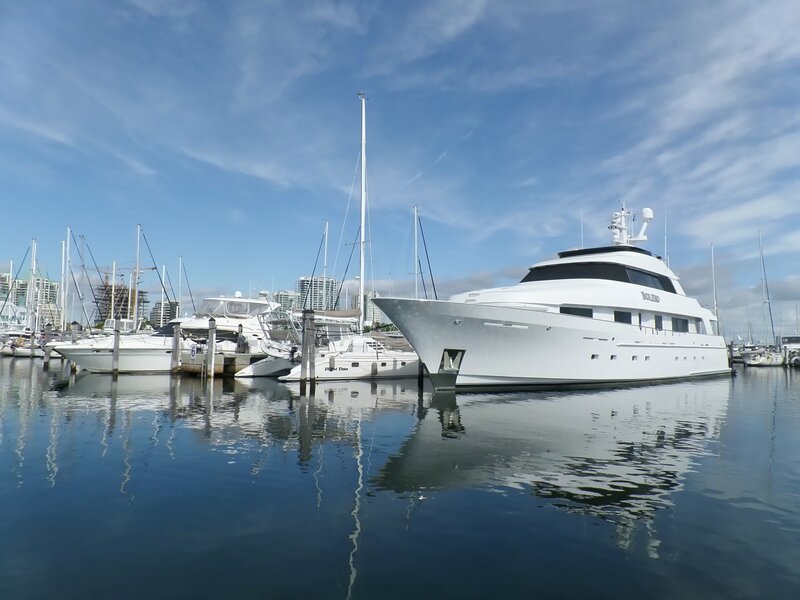 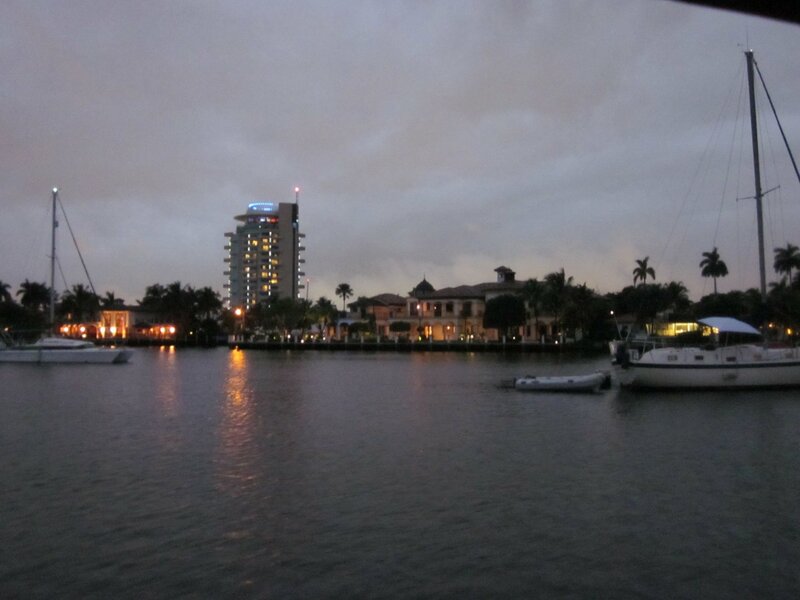 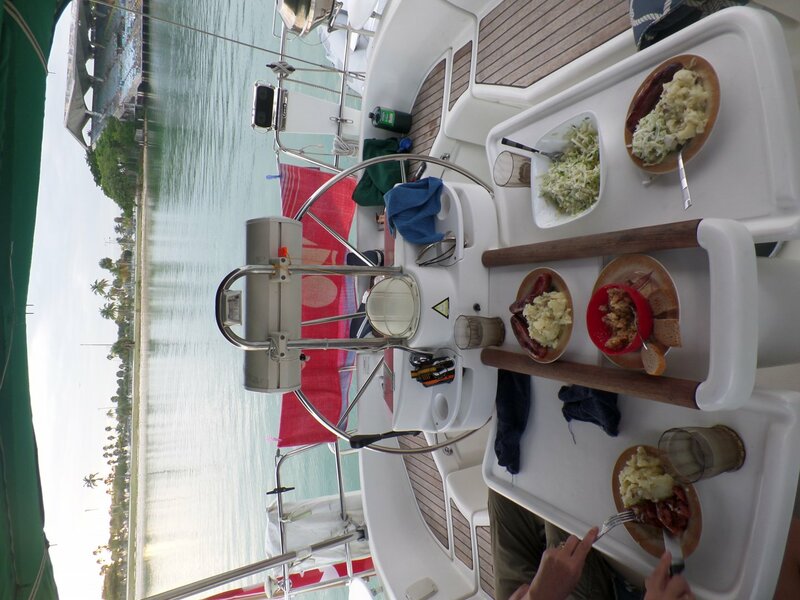 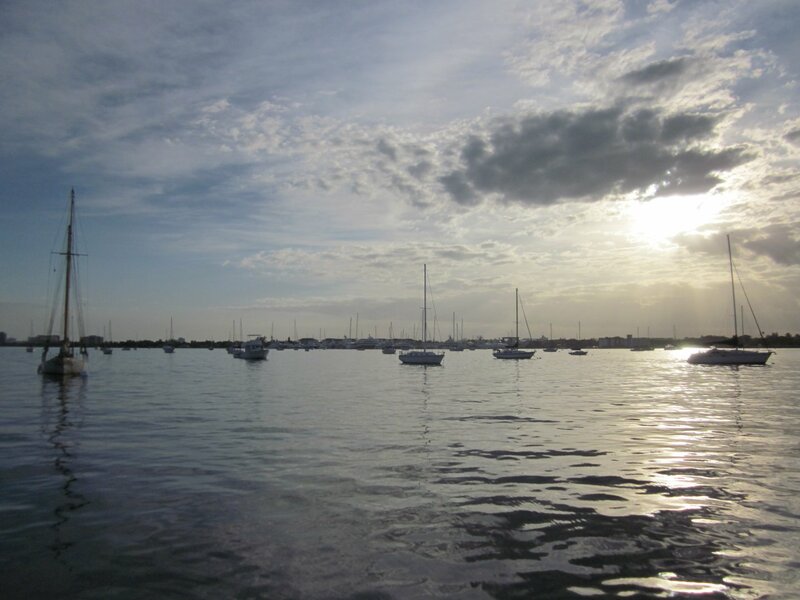 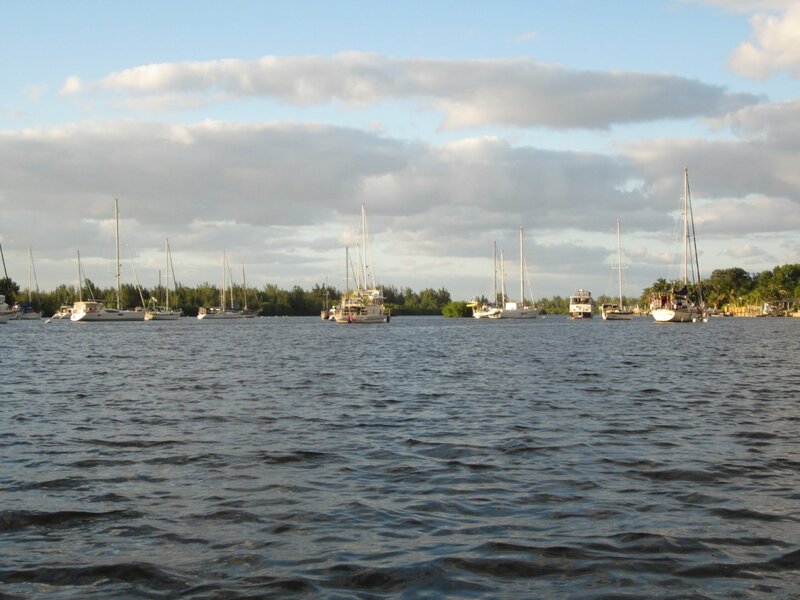 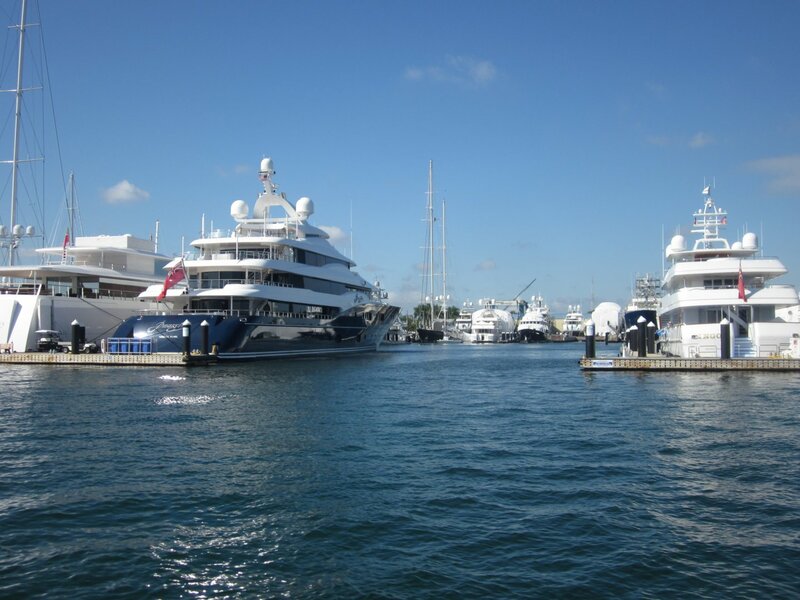 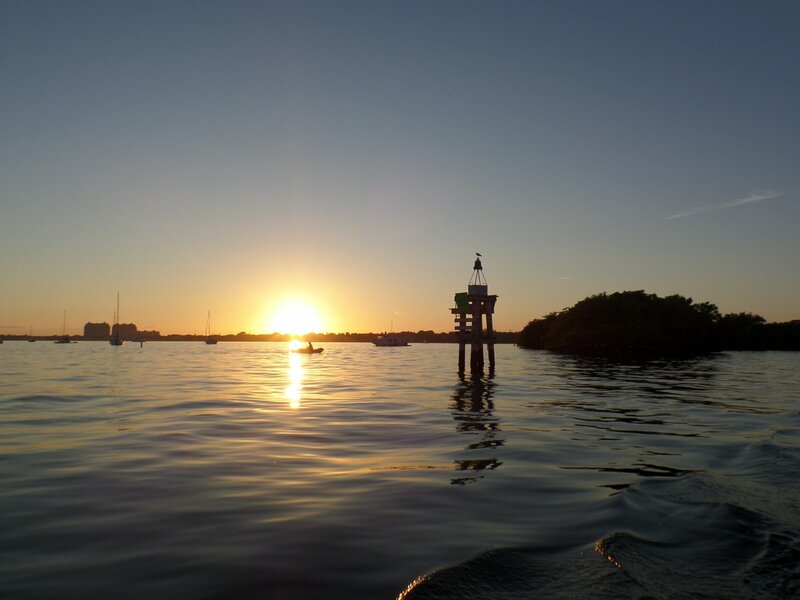 Stayed in Coconut Grove area of Miami (Dinner Key Marina) on few occasions, mooring and anchorage � both are very open. 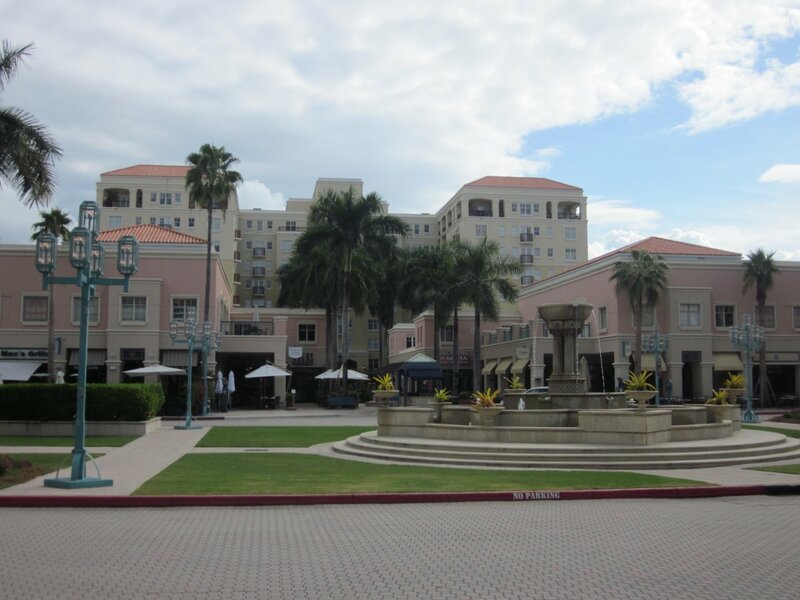 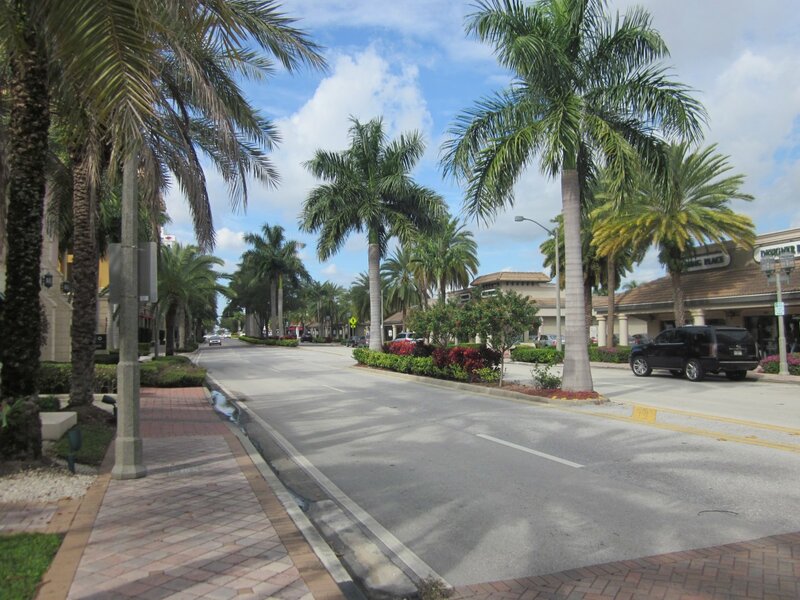 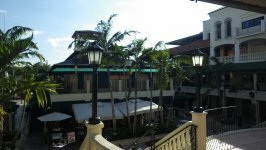 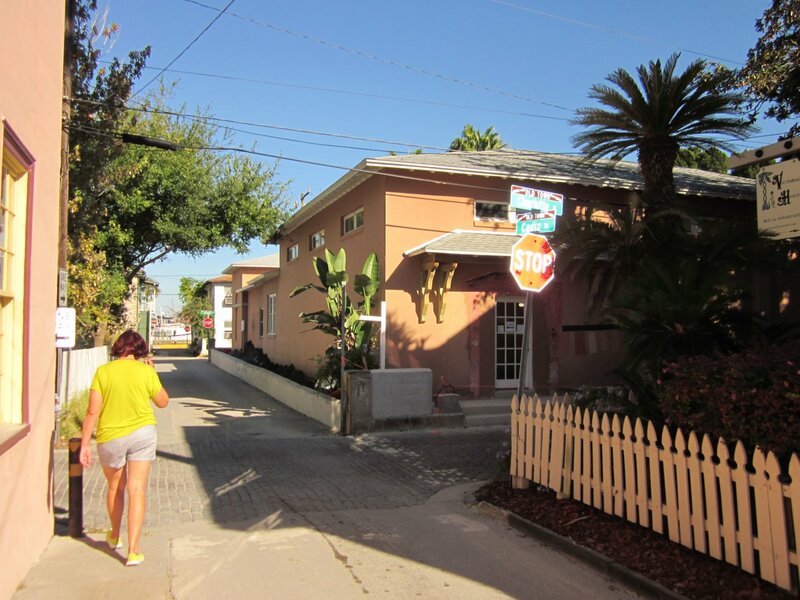 Pleasant city area (Coco Walk), shops and services nearby, transit access to city of Miami and airport. 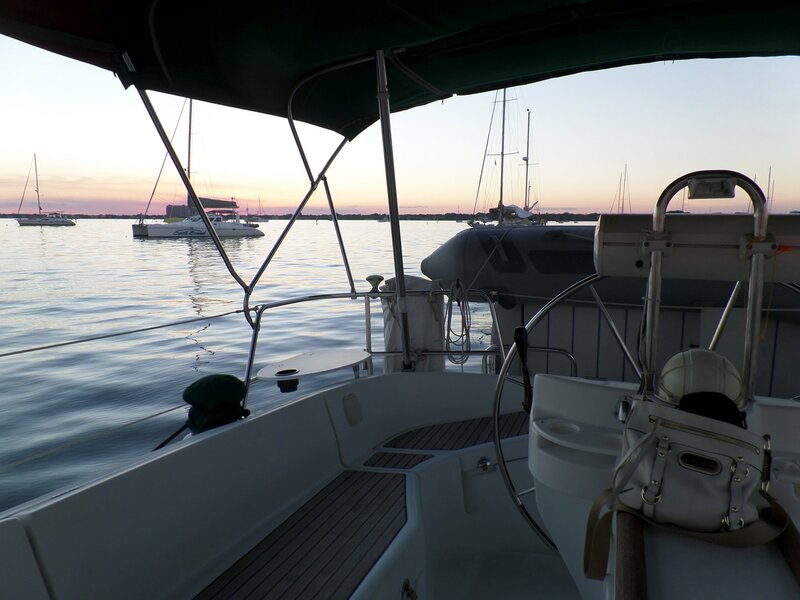 Left yacht at the mooring during our 2-week trip home to Whitby, ON in earlier December. 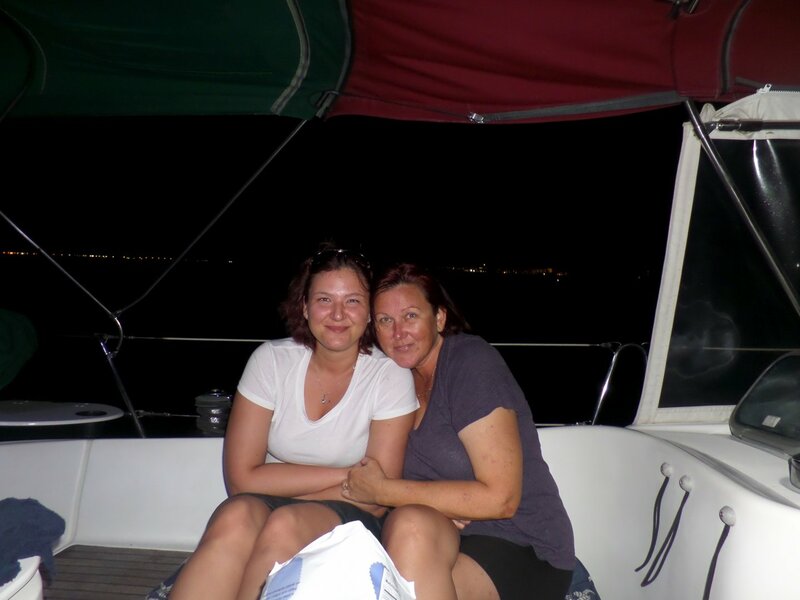 Our daughter came back with us to stay for a week during Christmas holidays. 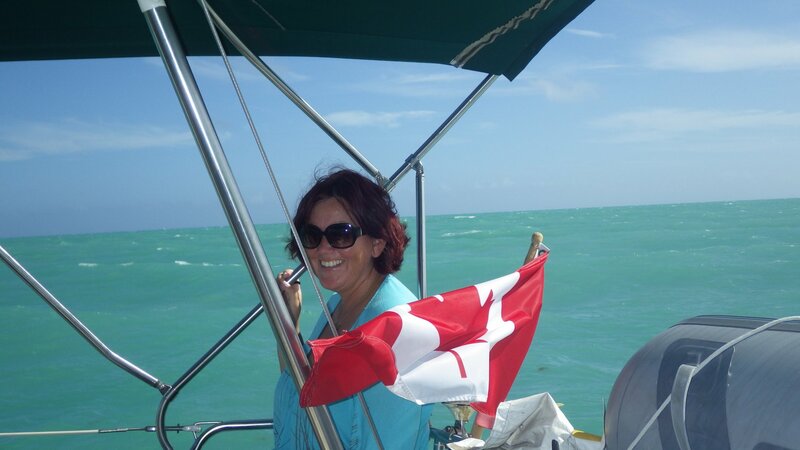 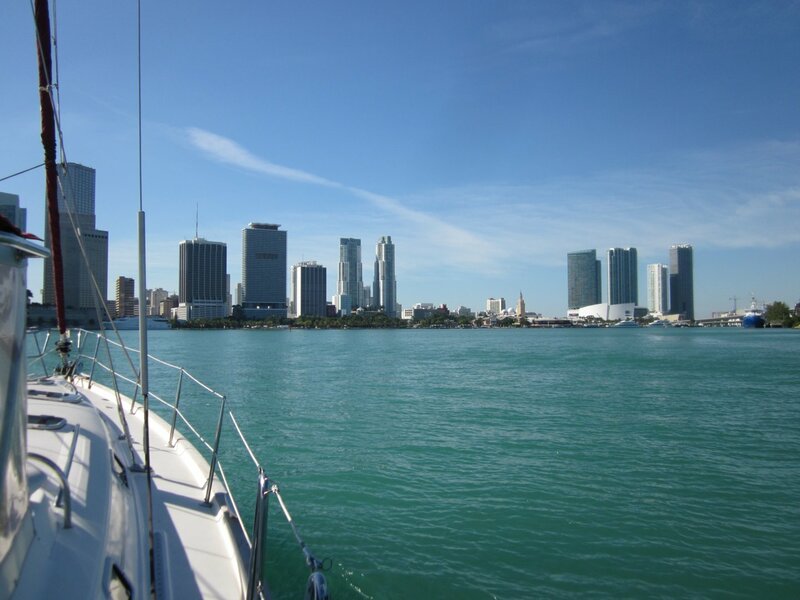 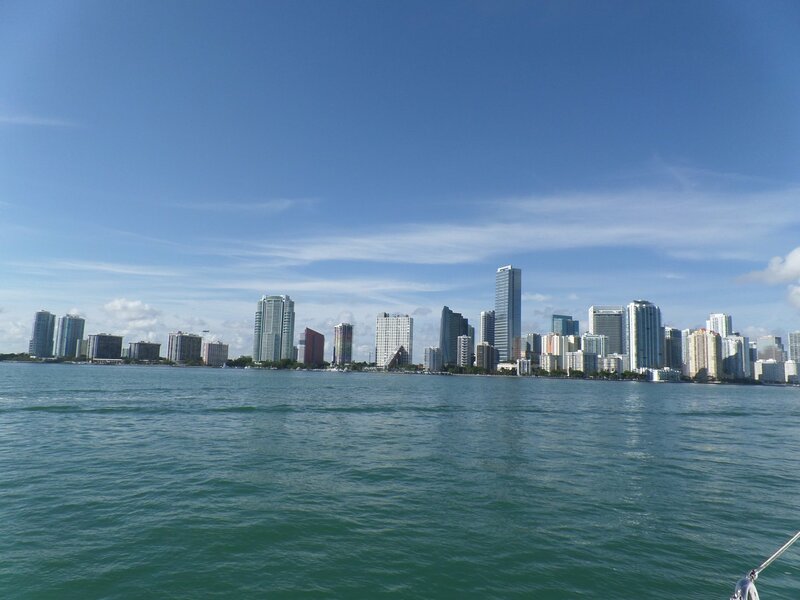 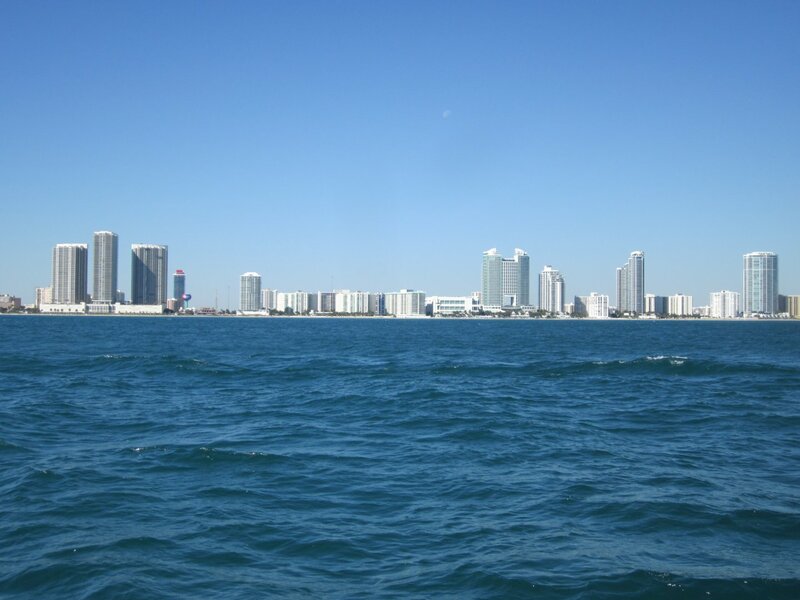 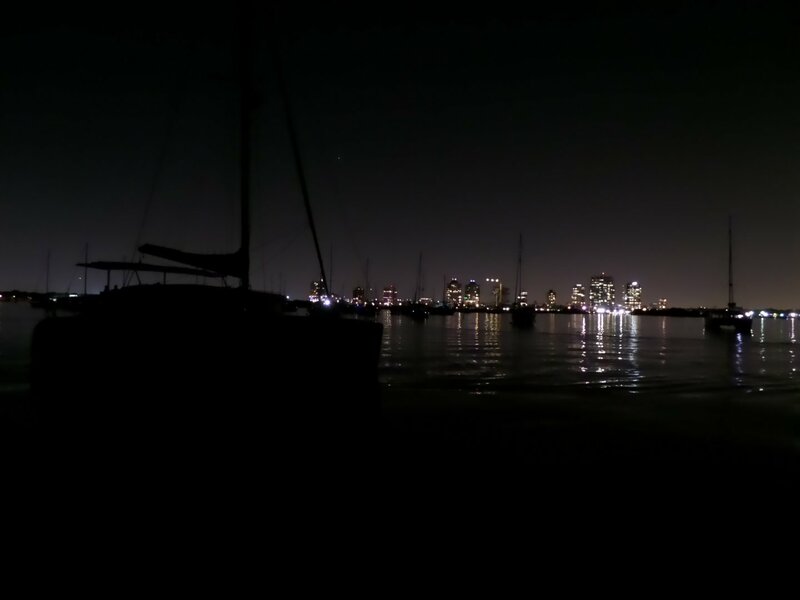 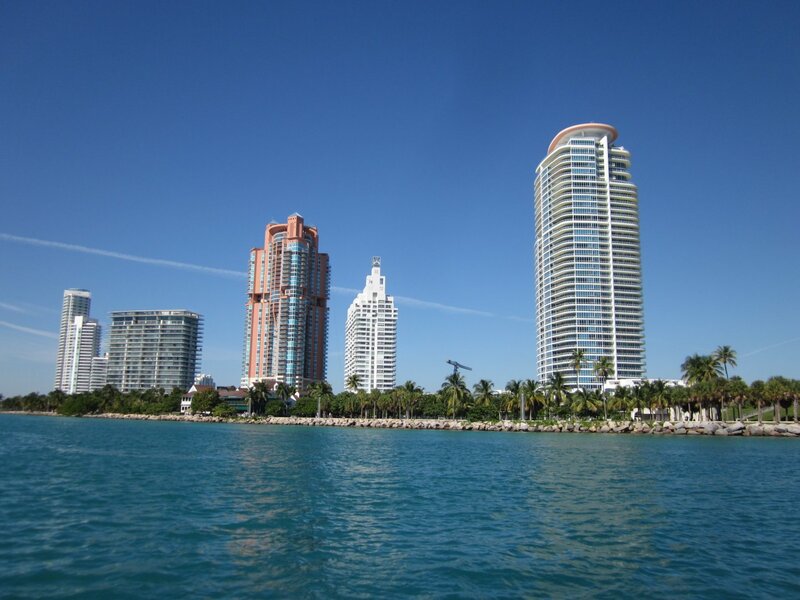 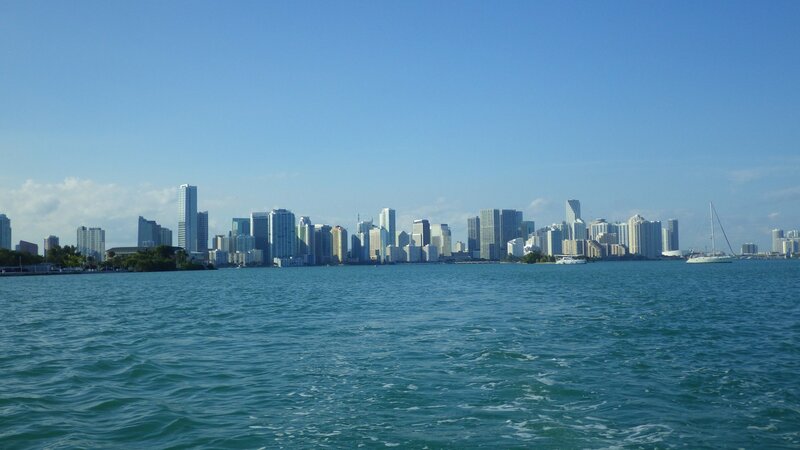 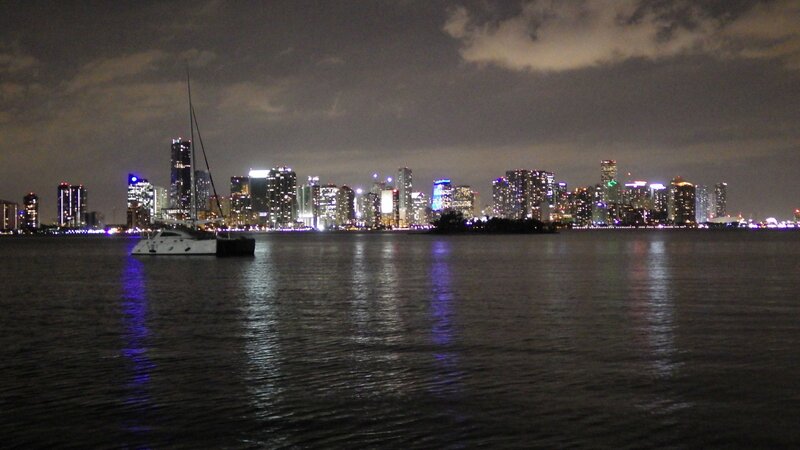 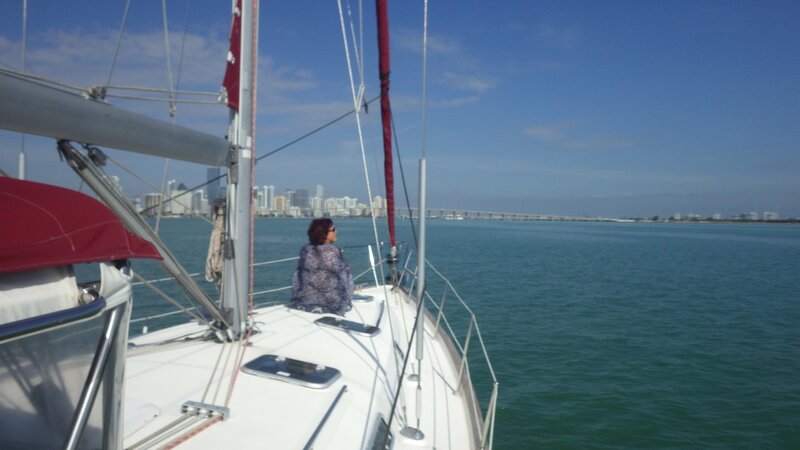 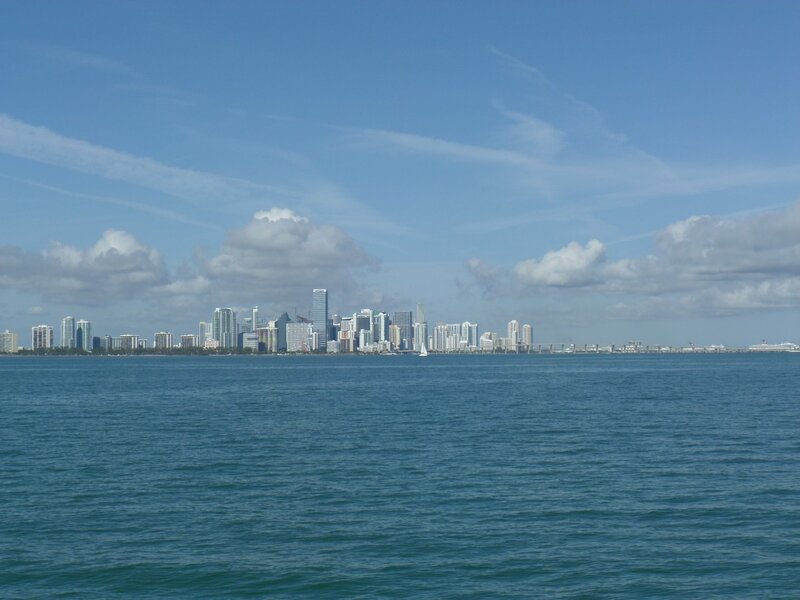 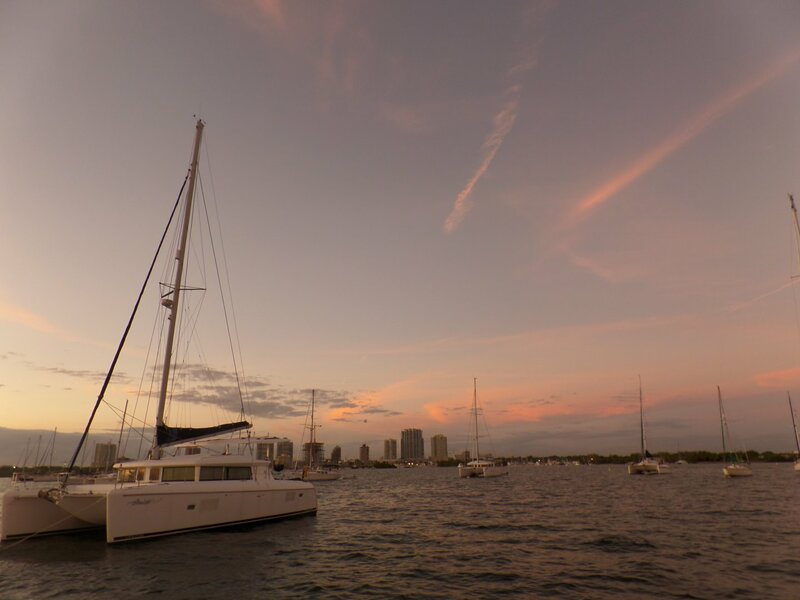 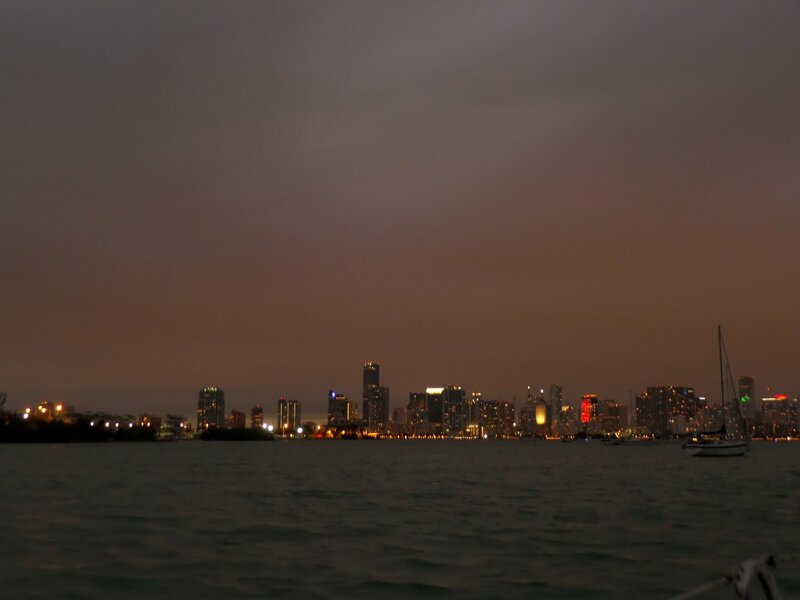 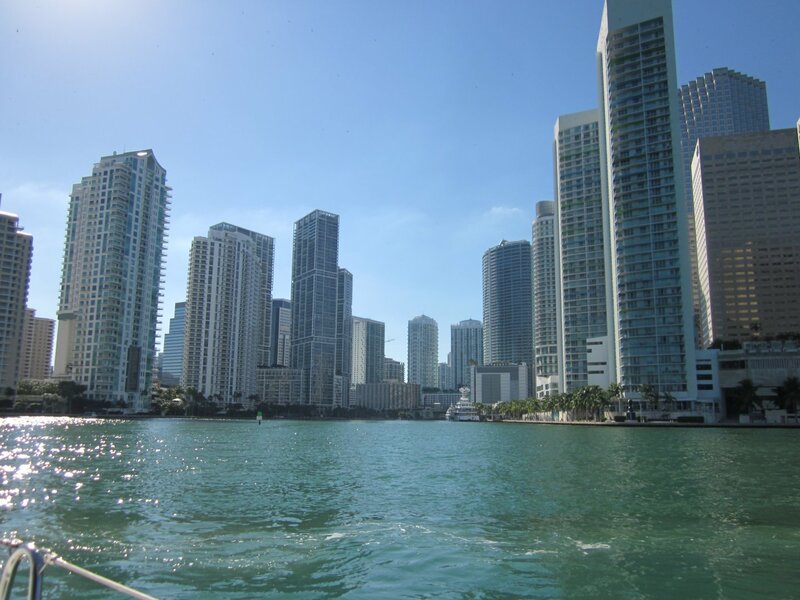 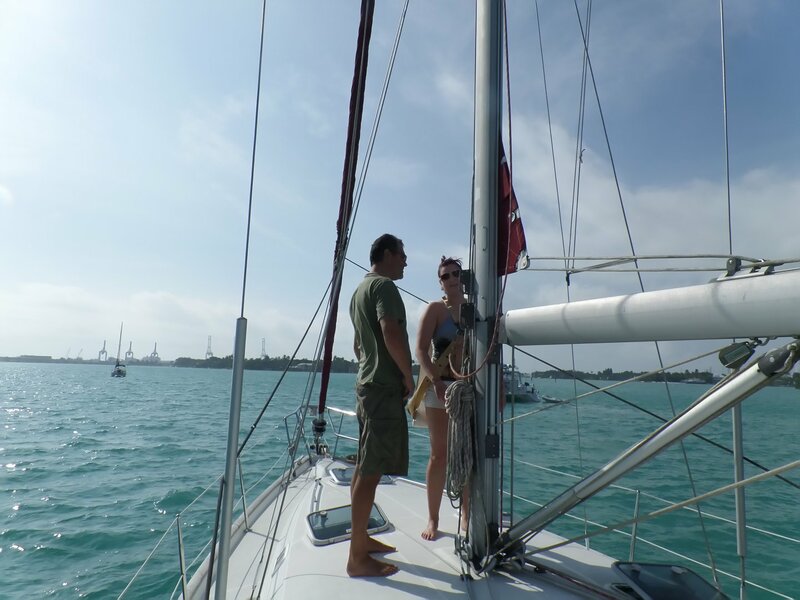 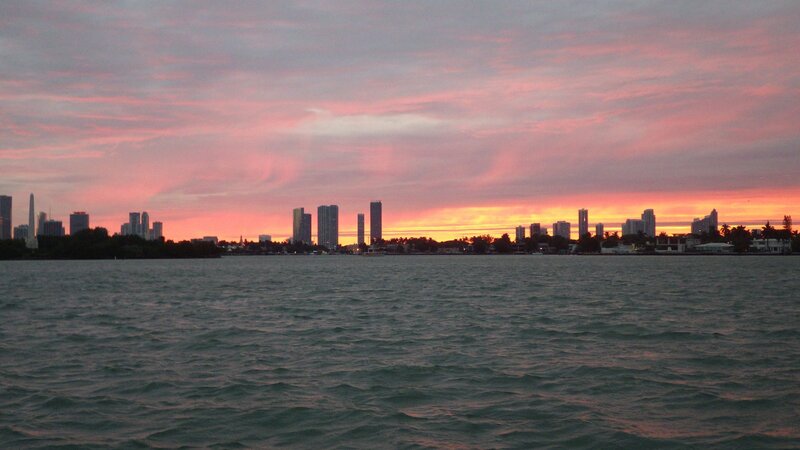 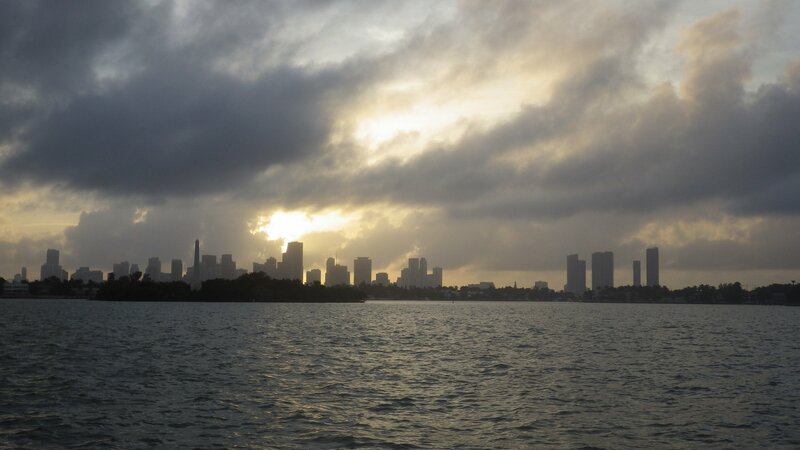 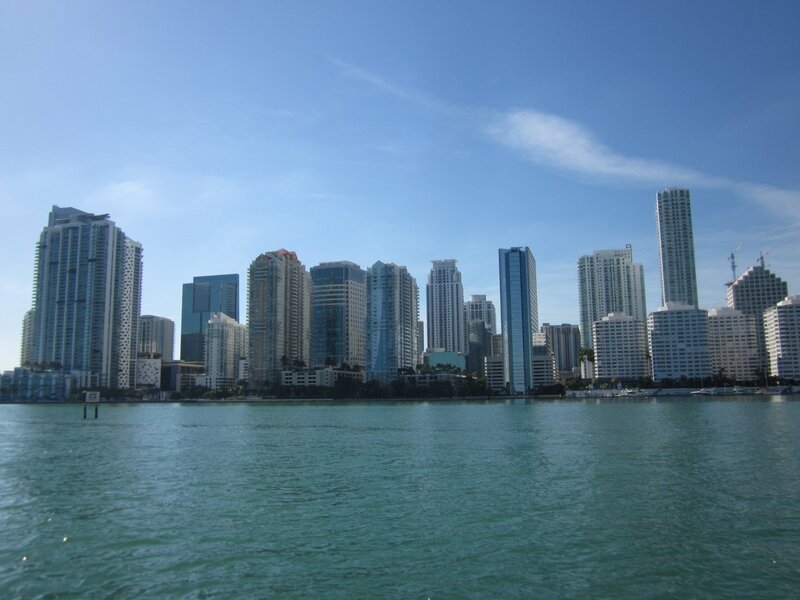 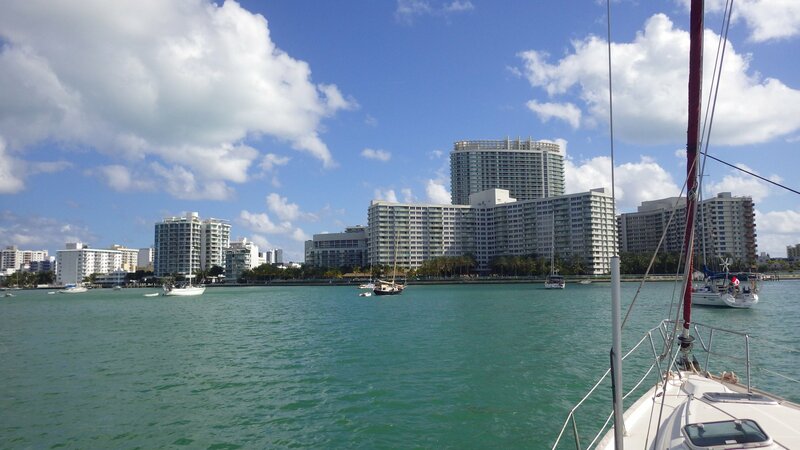 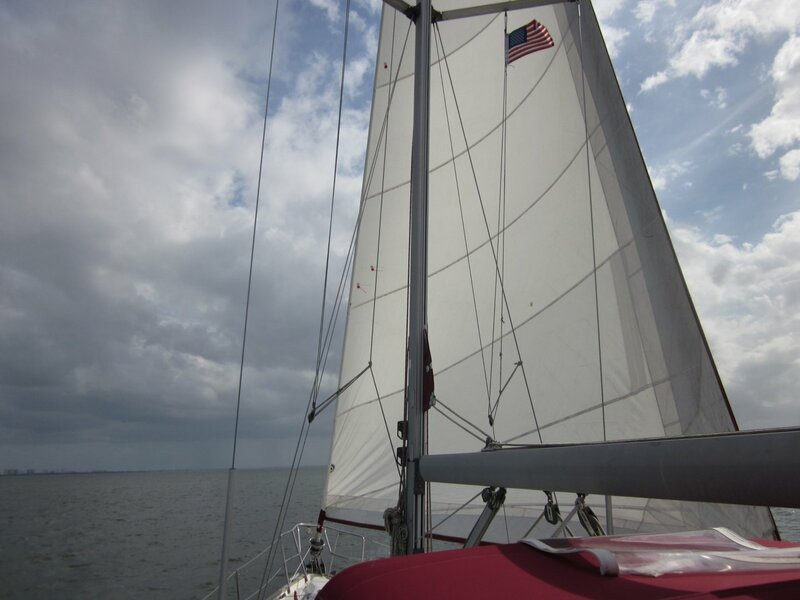 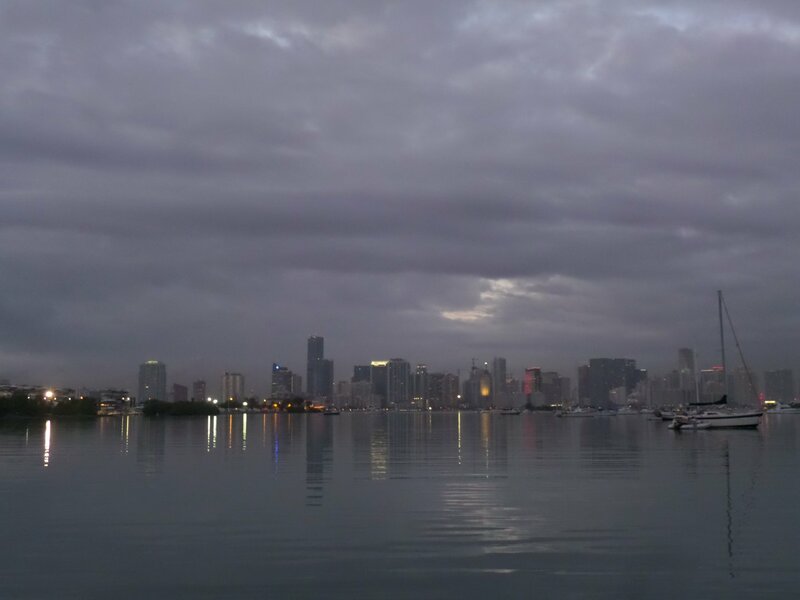 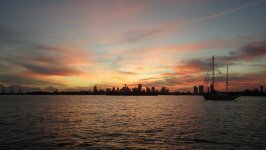 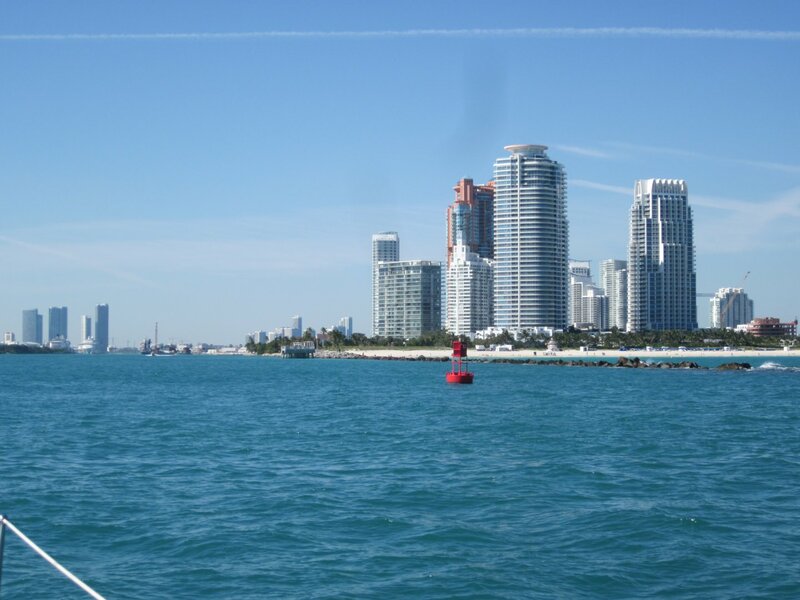 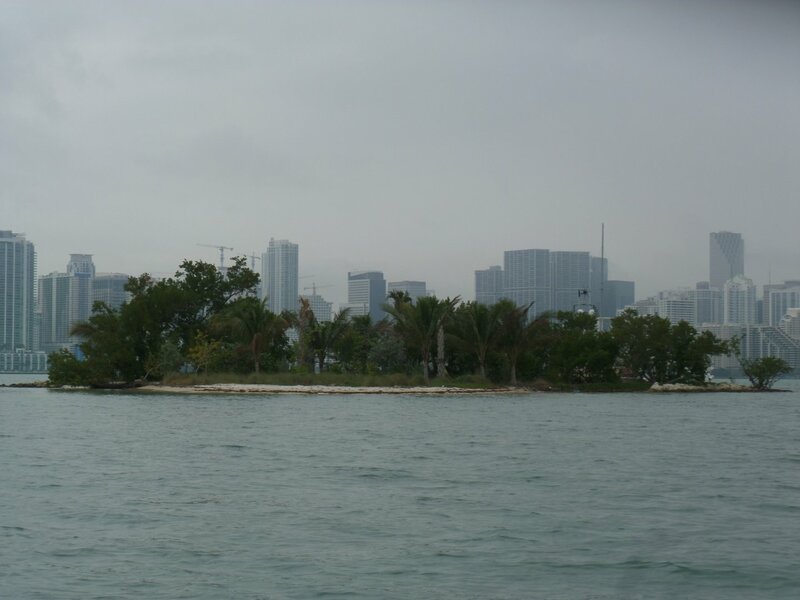 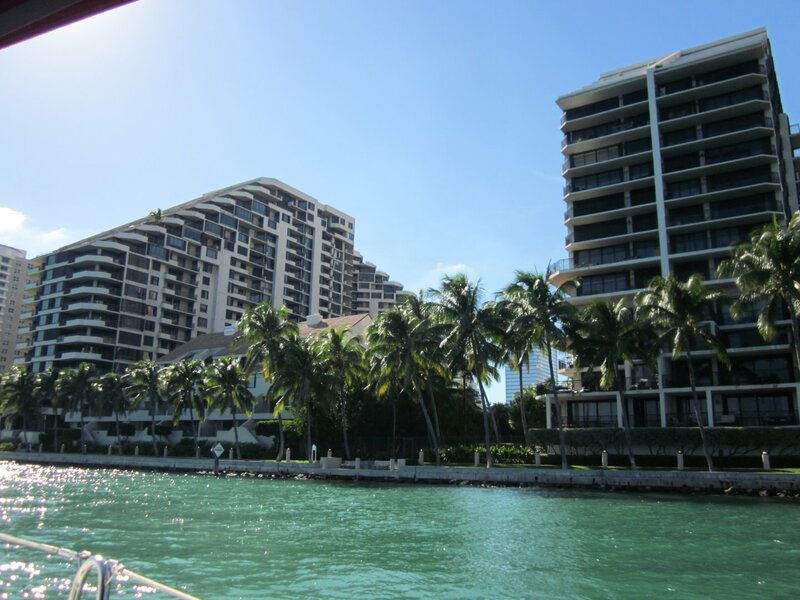 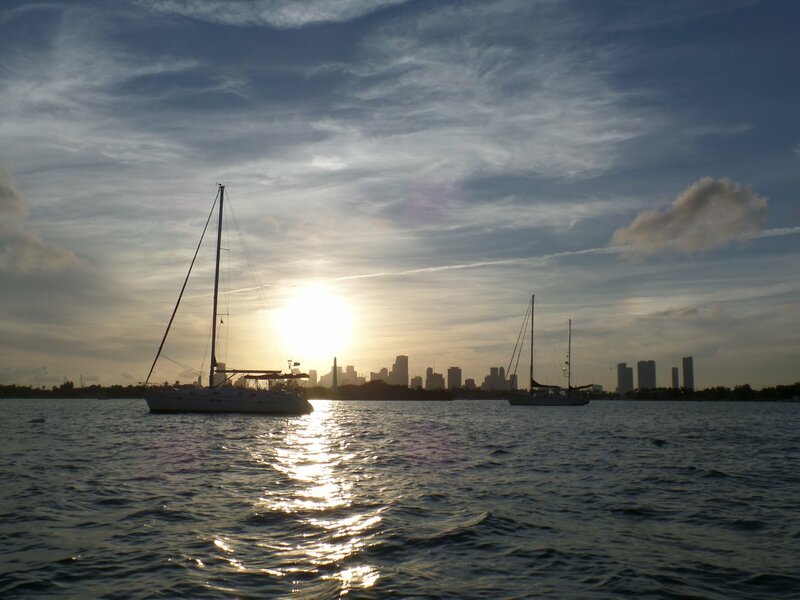 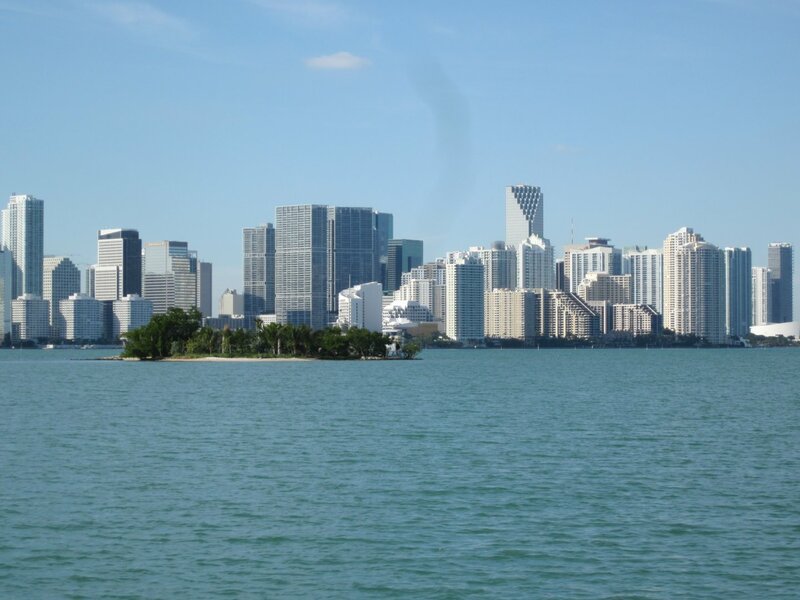 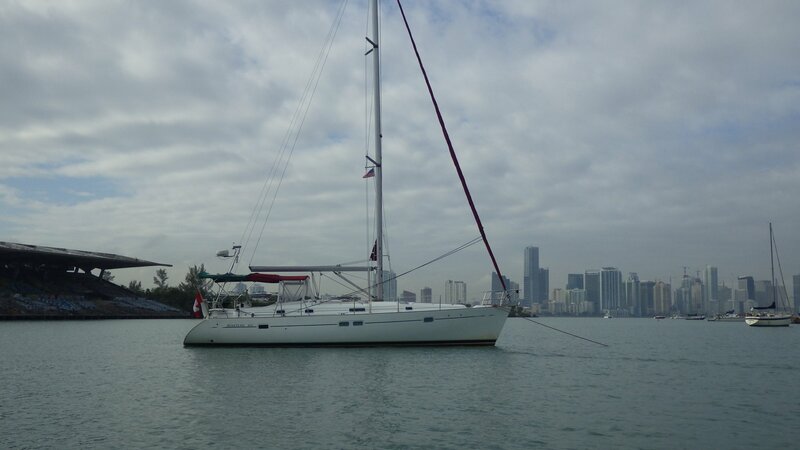 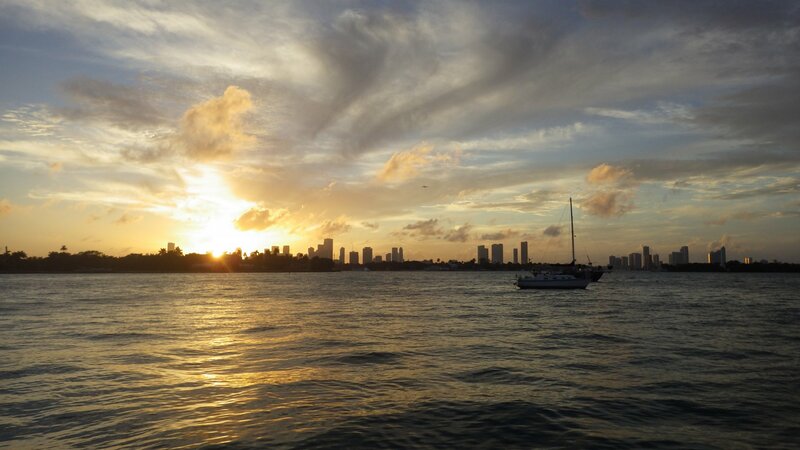 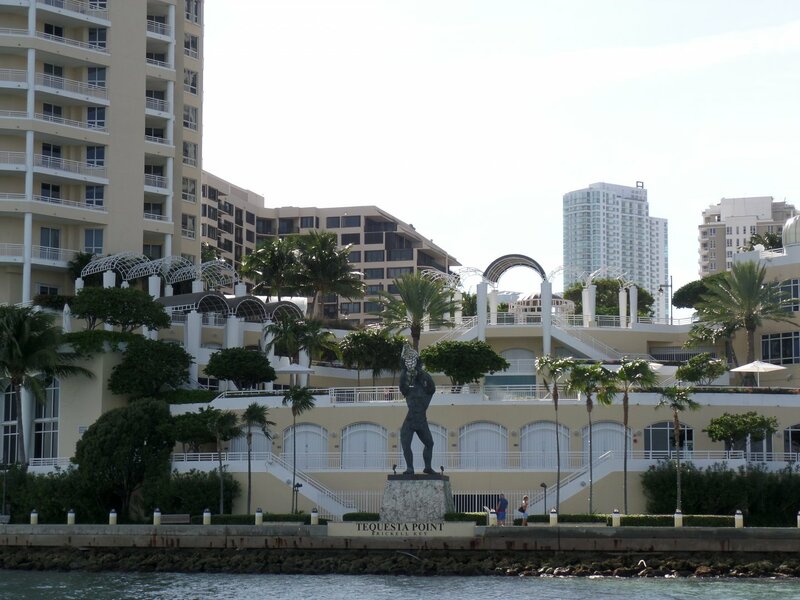 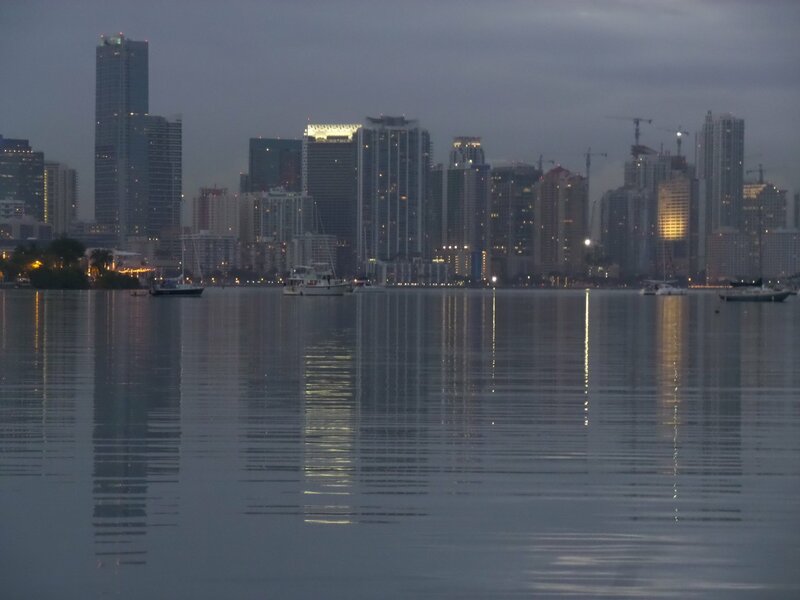 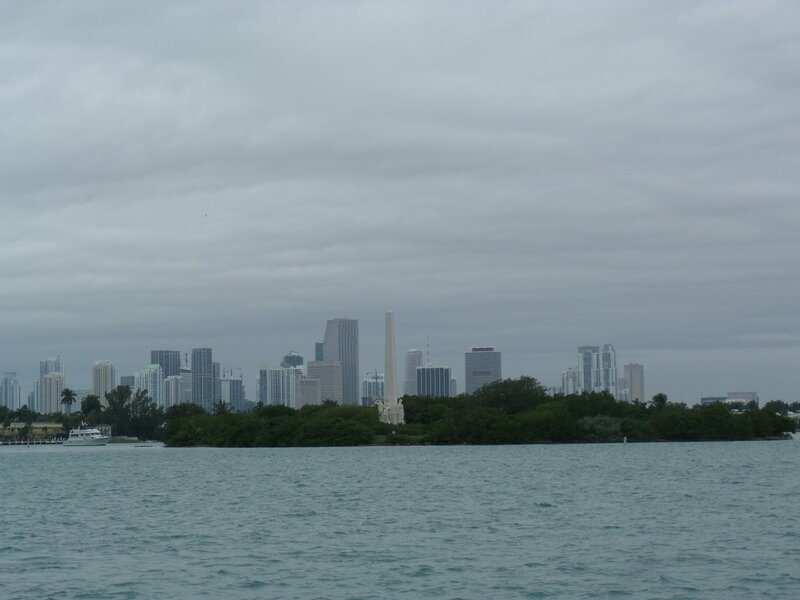 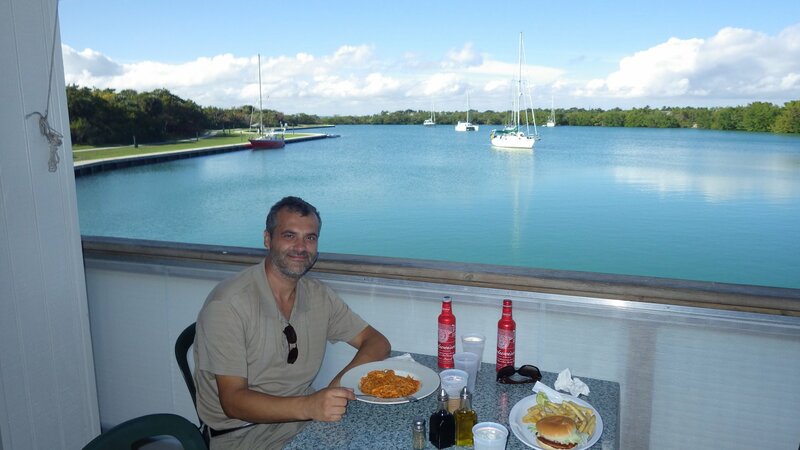 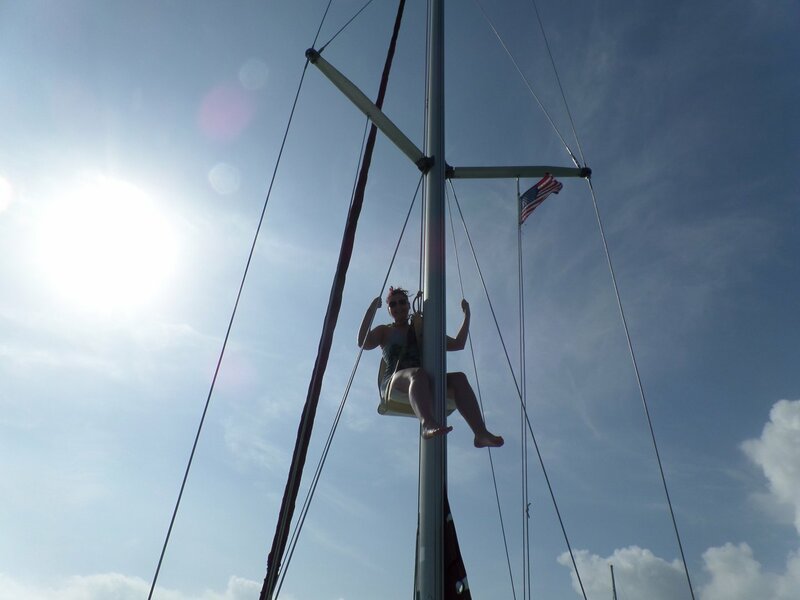 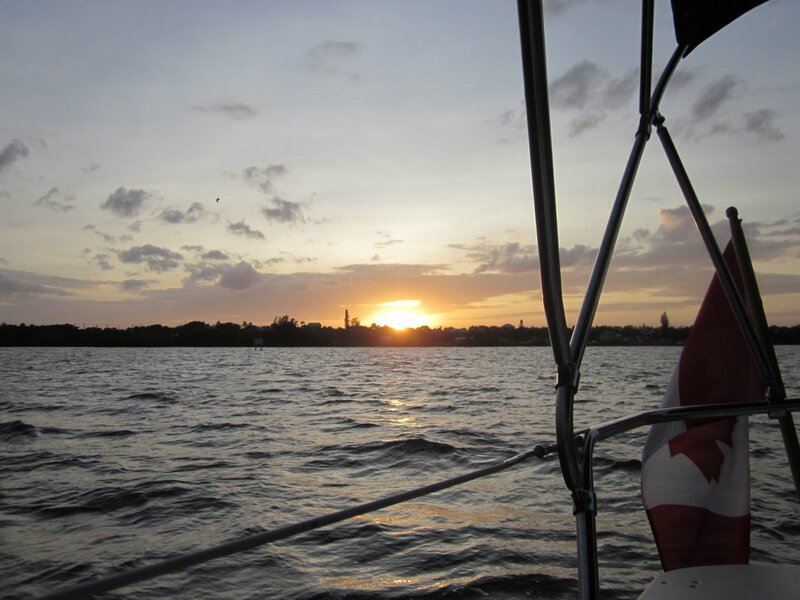 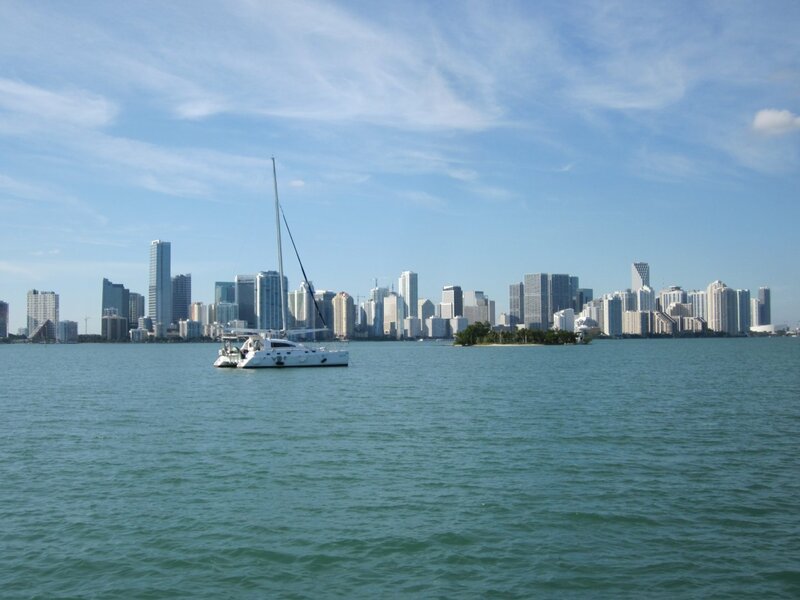 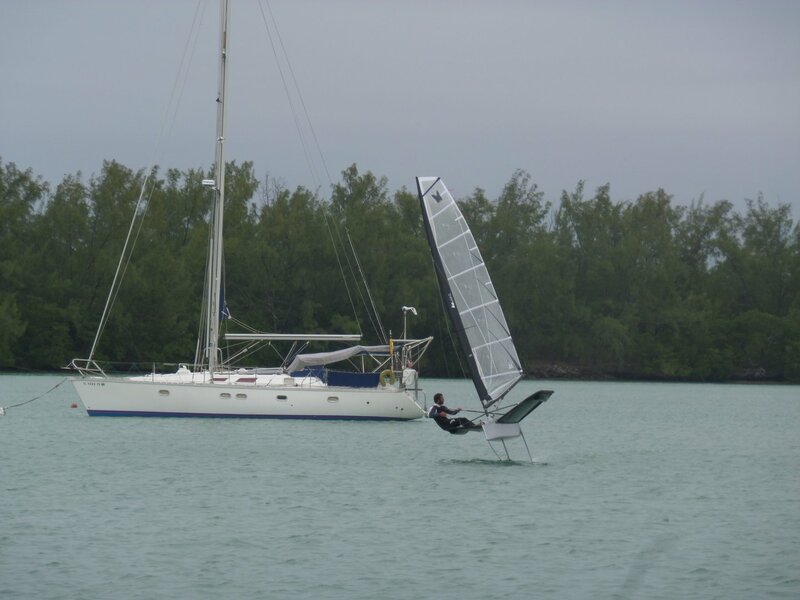 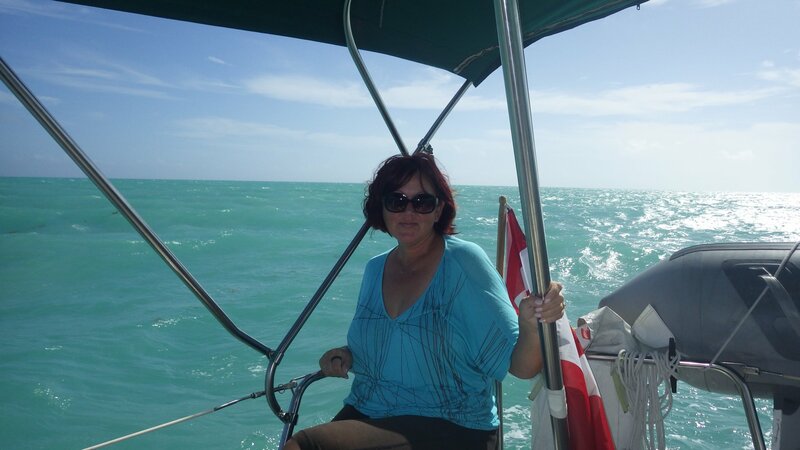 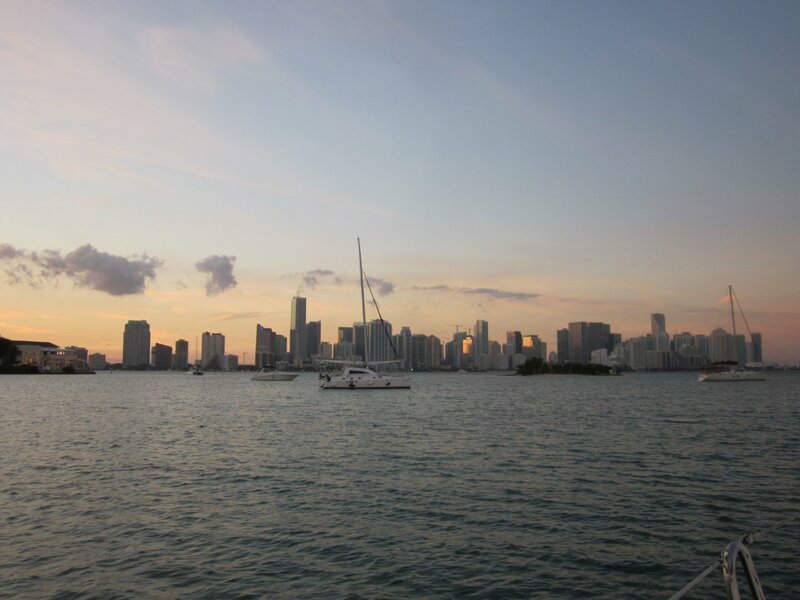 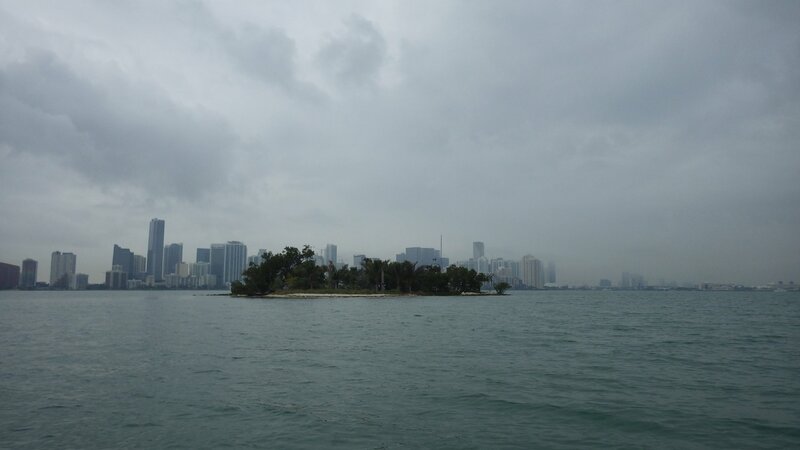 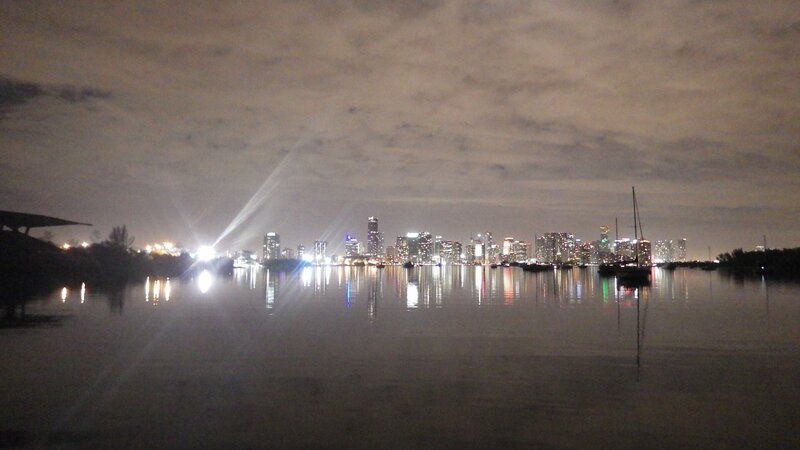 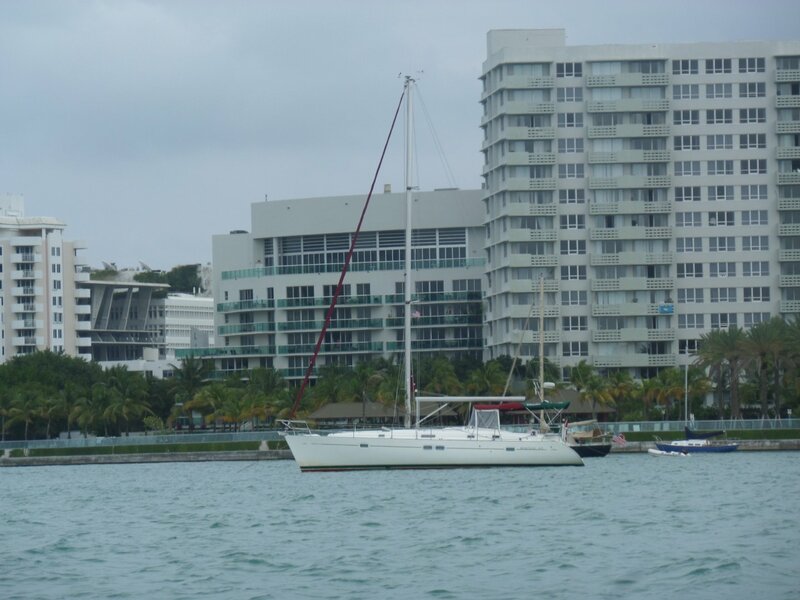 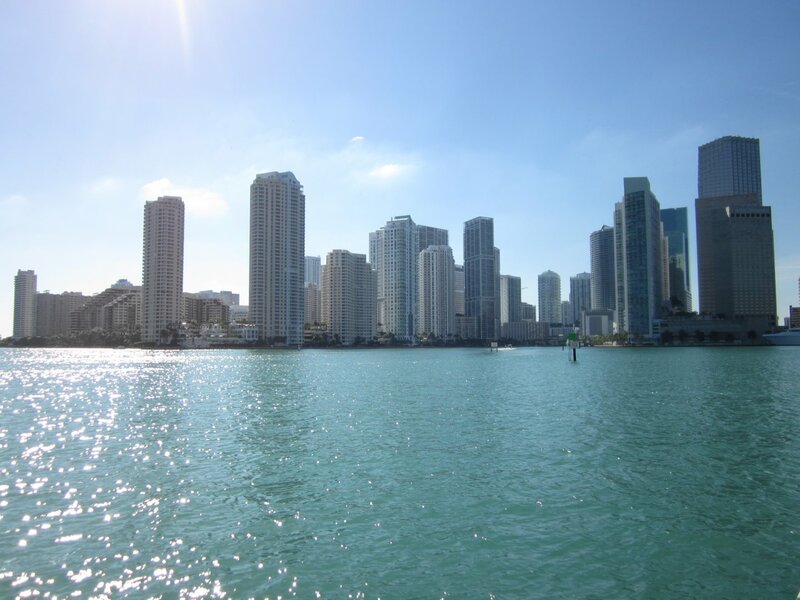 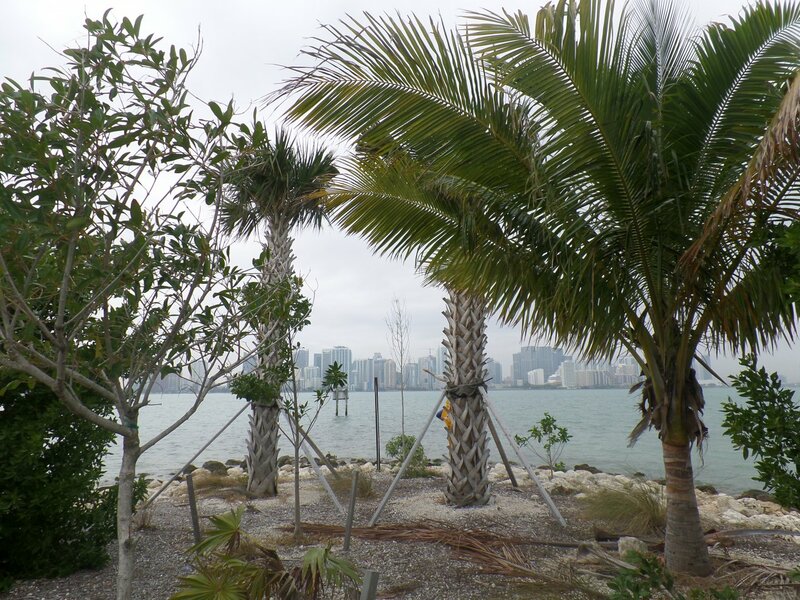 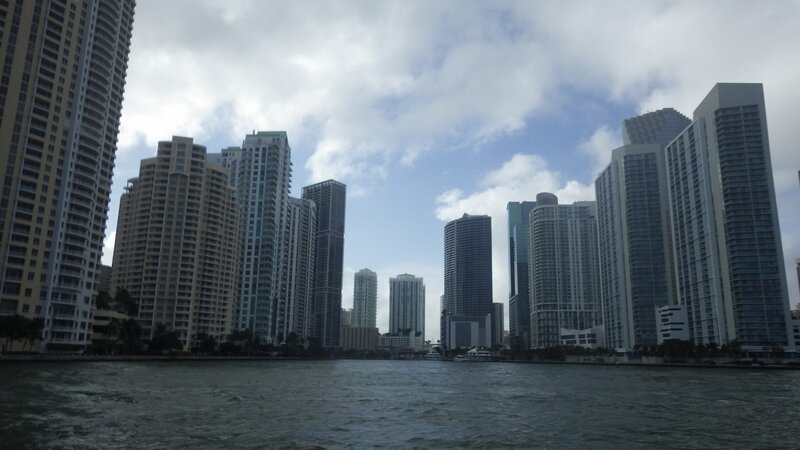 We had a good time, sailing Biscayne Bay and visiting Miami area. 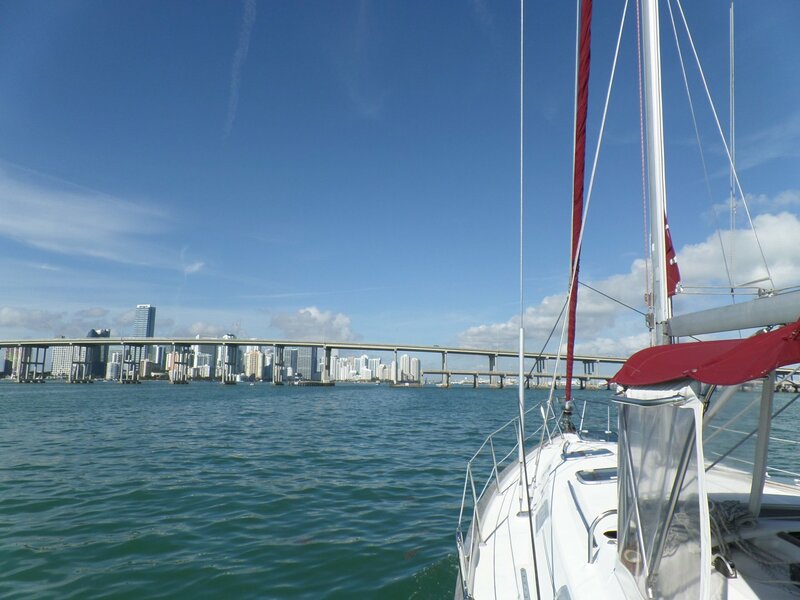 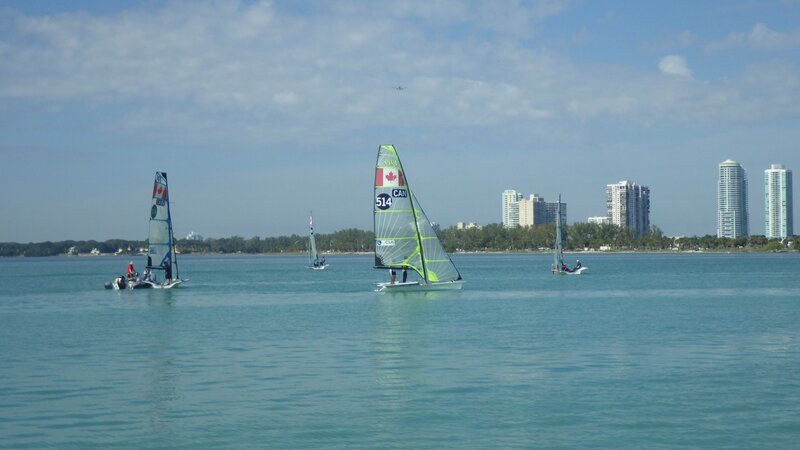 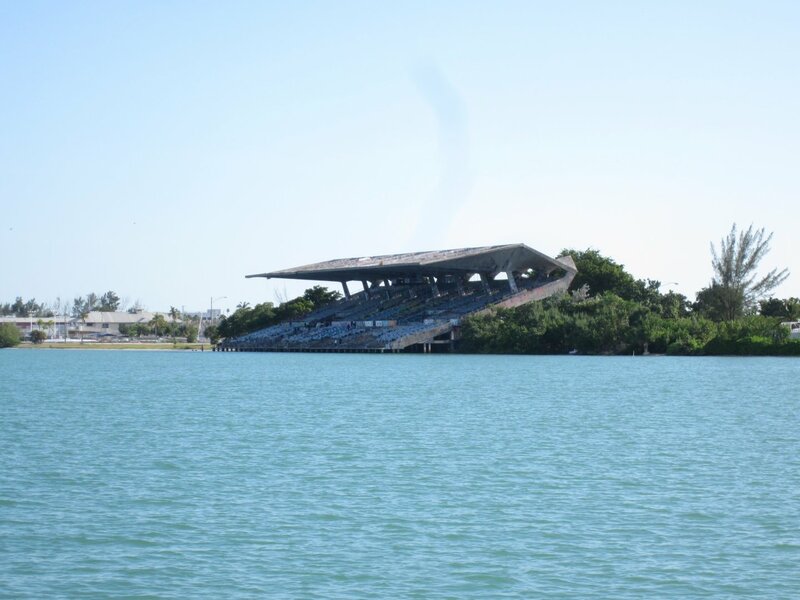 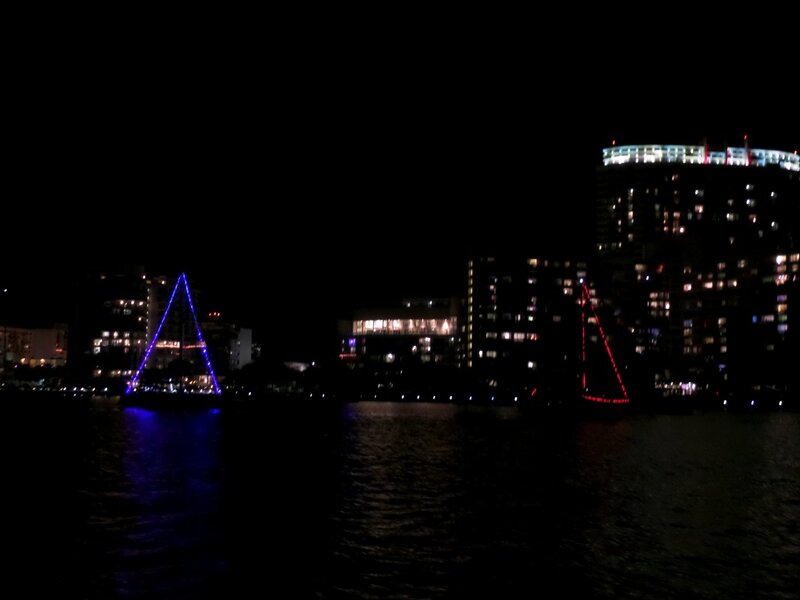 Sailed to the Biscayne National (Water) Park. 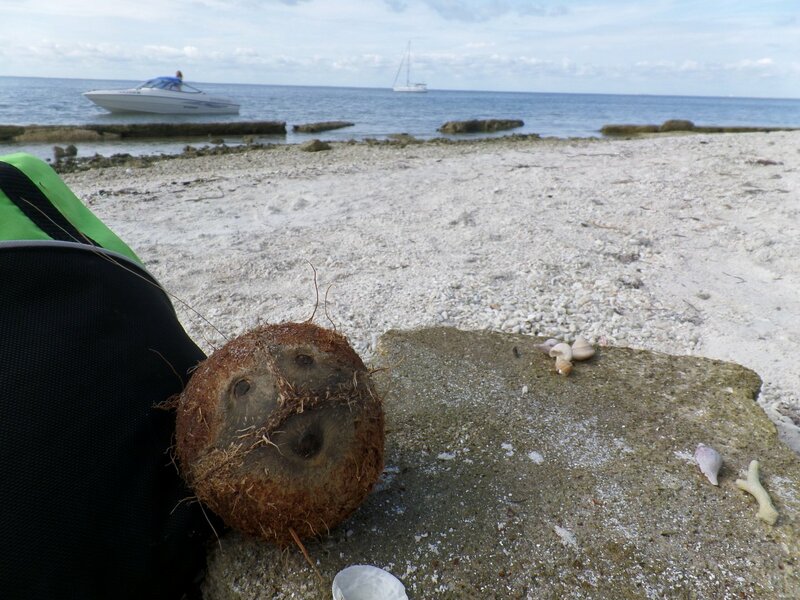 Picked up a charted mooring buoy in the middle of the sea, to explore coral reefs and underwater life. 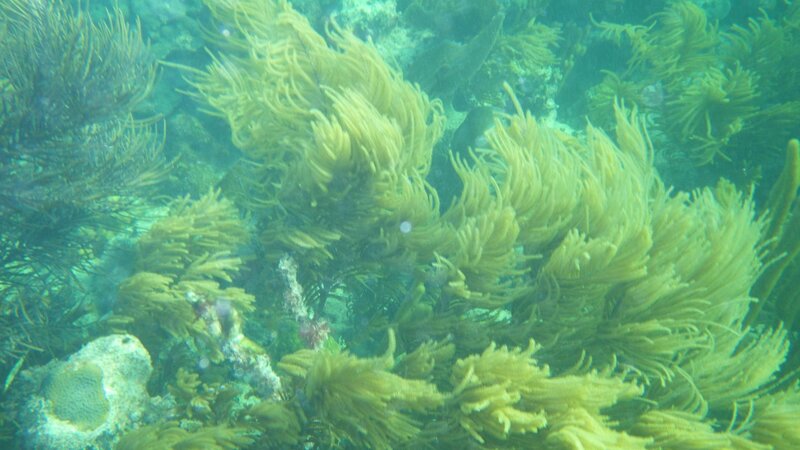 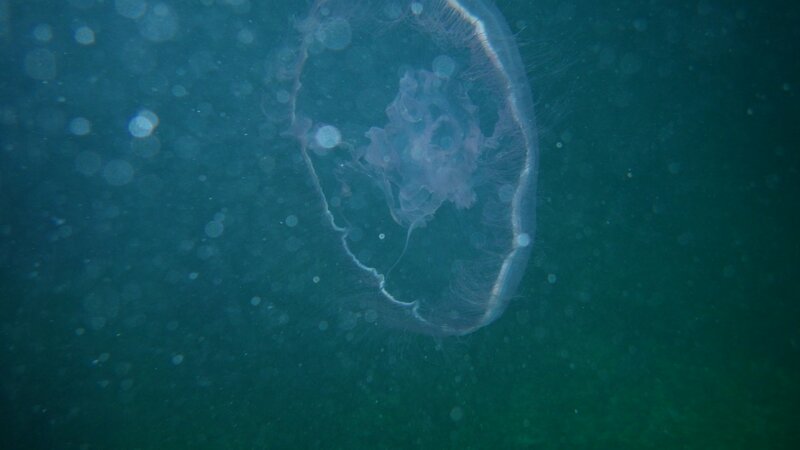 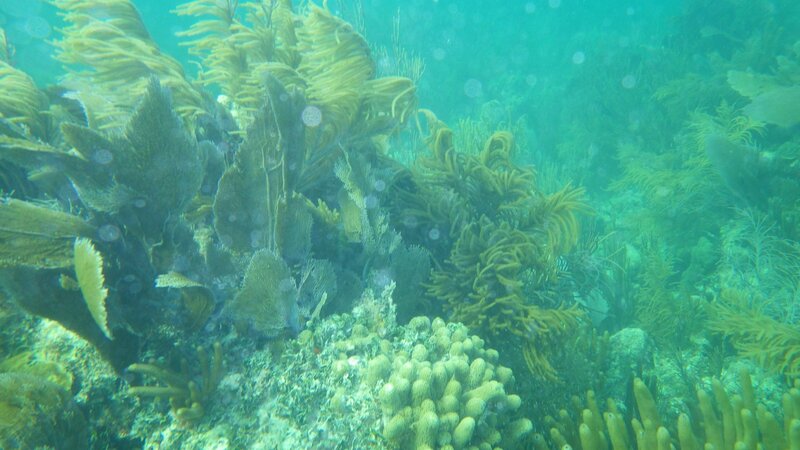 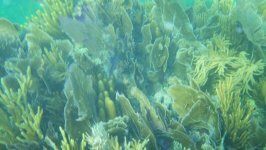 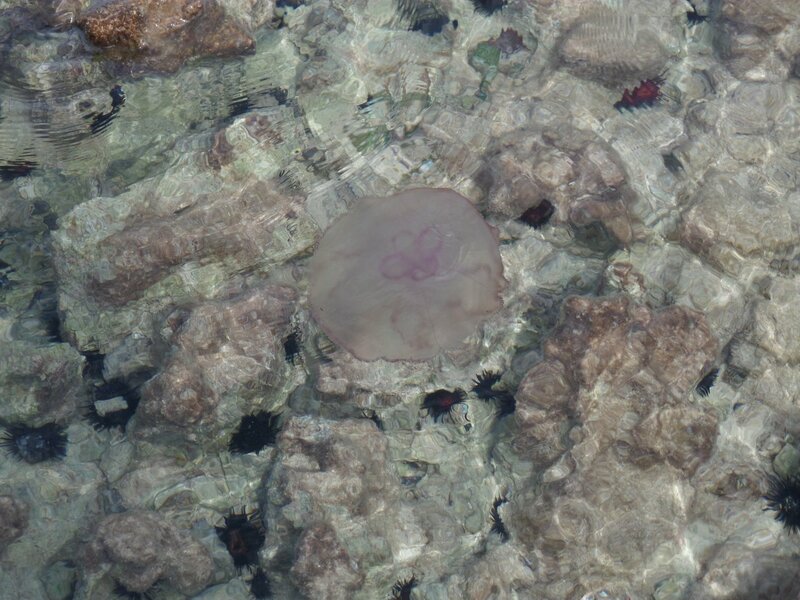 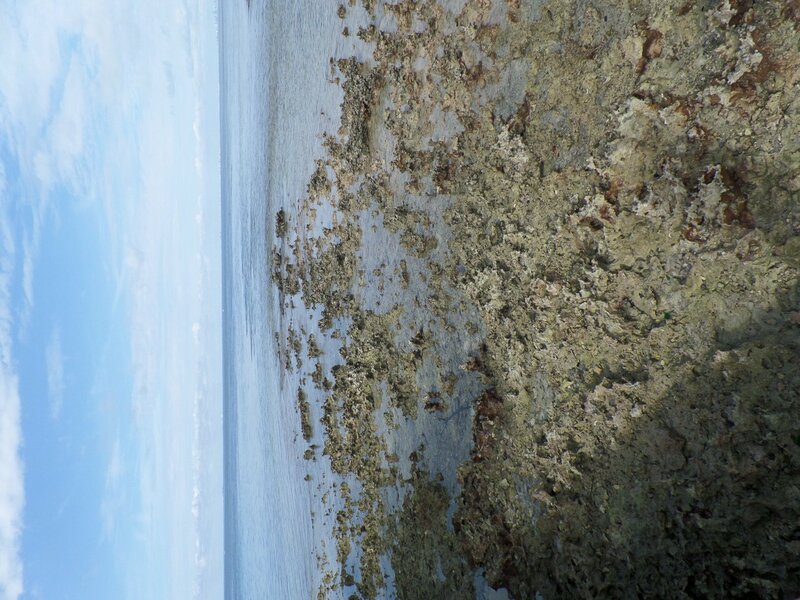 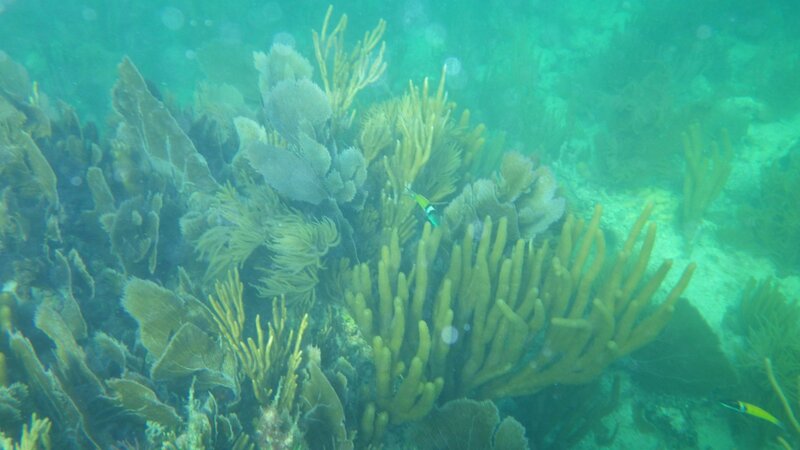 Snorkeled, and had some chance to try my underwater camera (need some practice and figure out best settings). 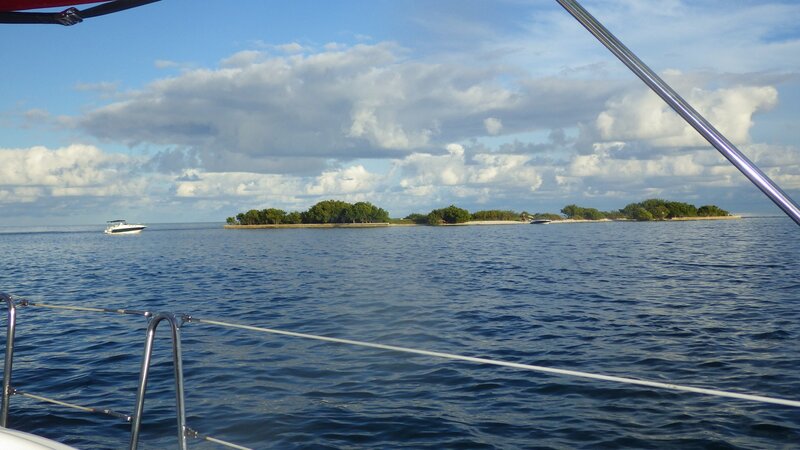 A few overnight anchorages along the Florida Keys, following the Hawk Channel, on the way to Boot Key Harbor / Marathon, FL and back to Miami. 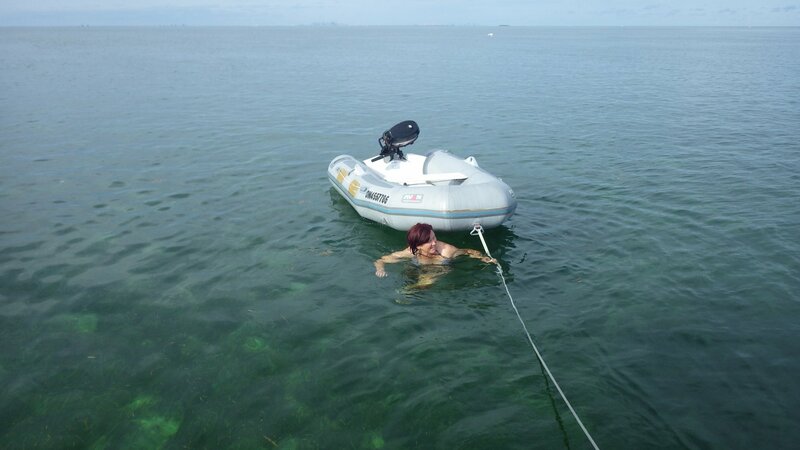 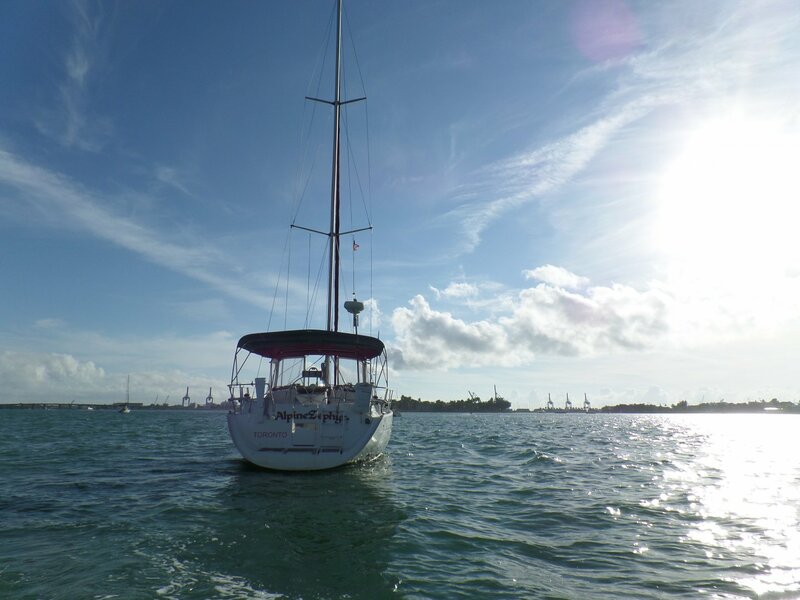 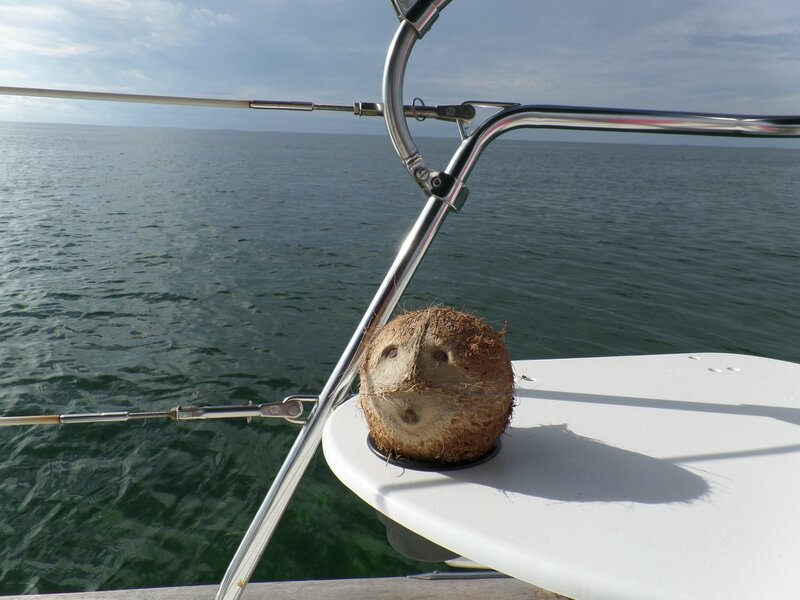 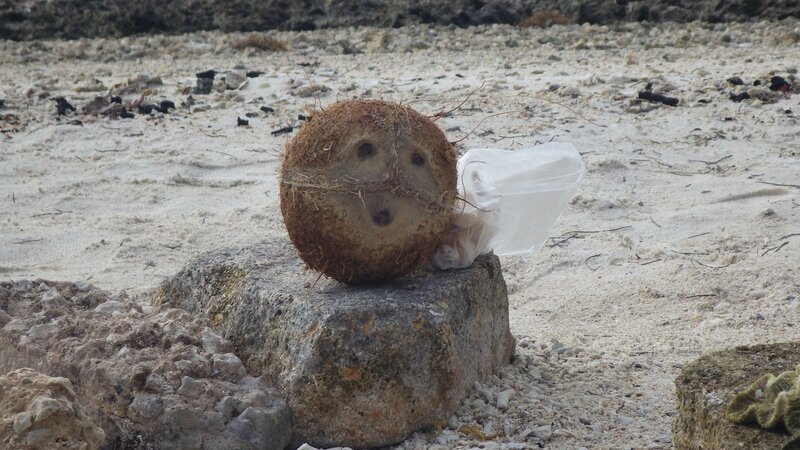 Anchored in Caesar Creek for a night, and then picked up a free mooring ball at Indian Key. 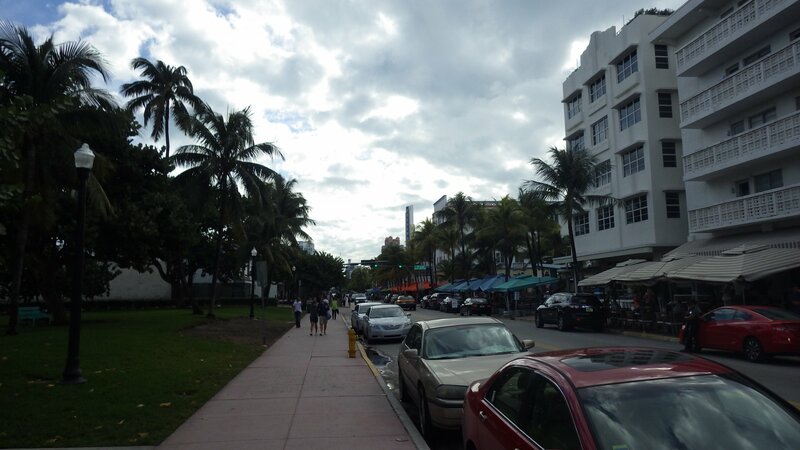 That one was really open and rolly � didn�t sleep well. 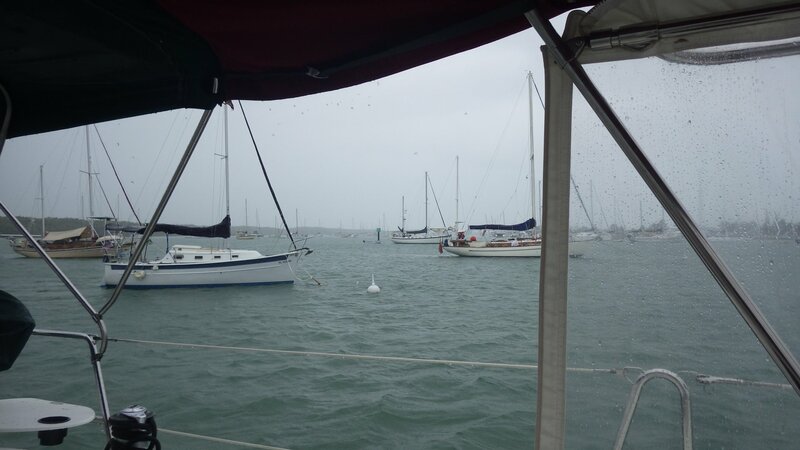 Unfortunately, the weather forecast called for strong northern front, so we had to move quickly to a safer harbor. 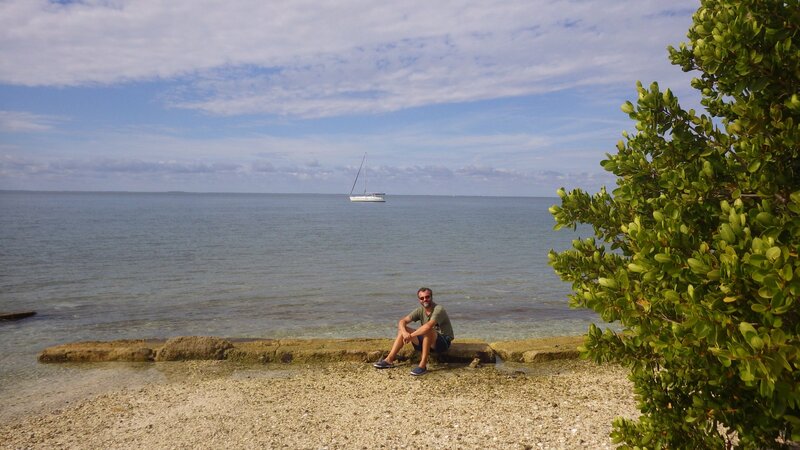 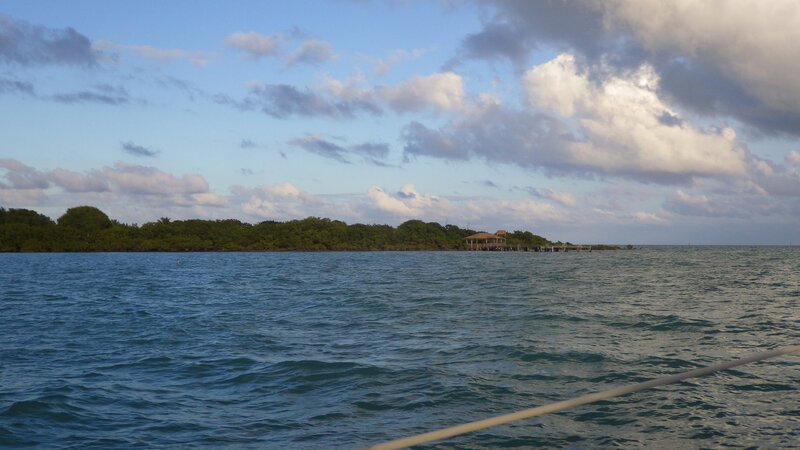 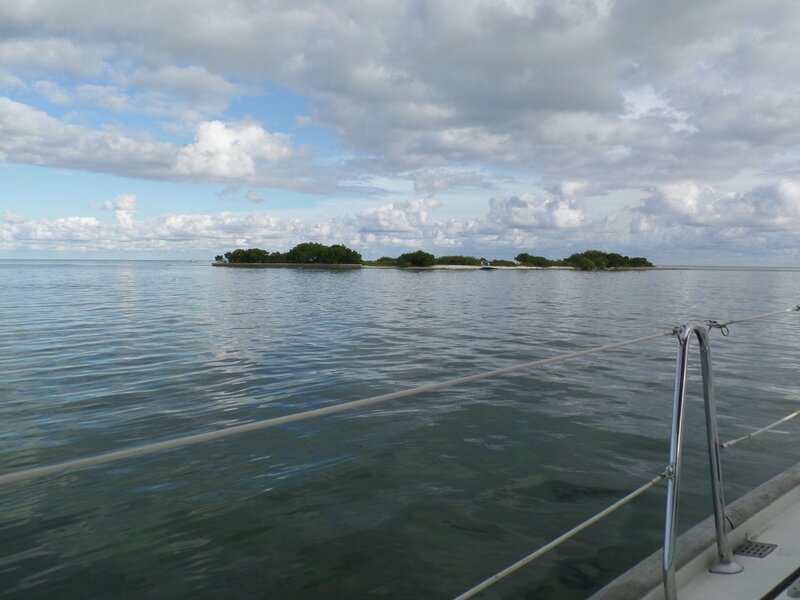 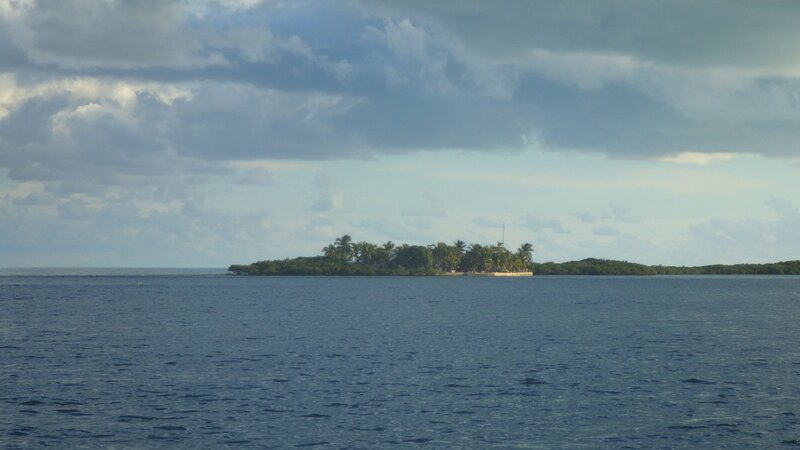 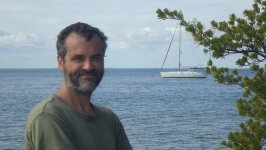 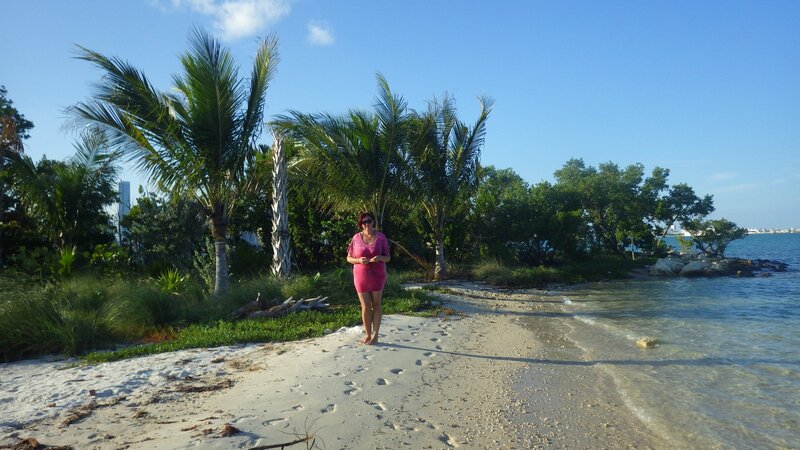 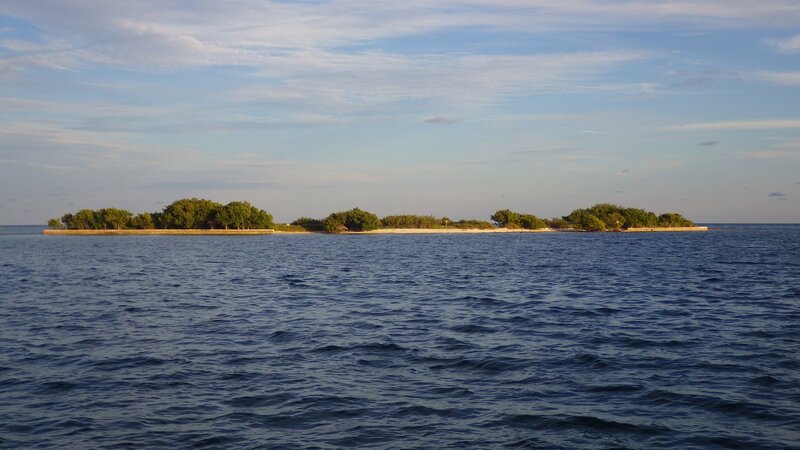 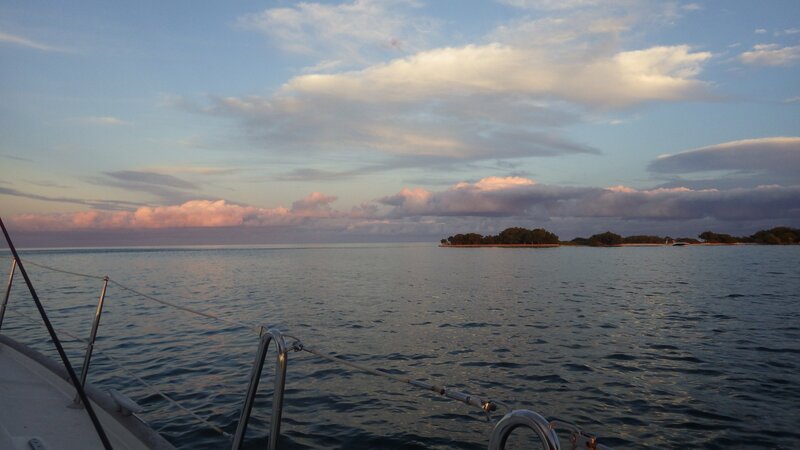 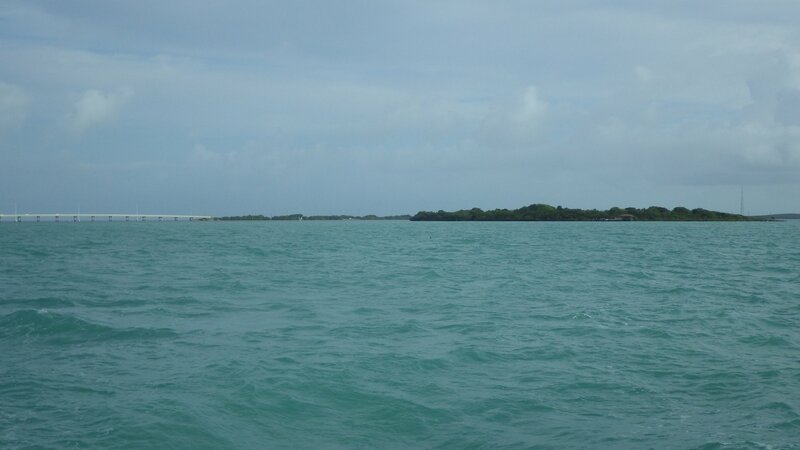 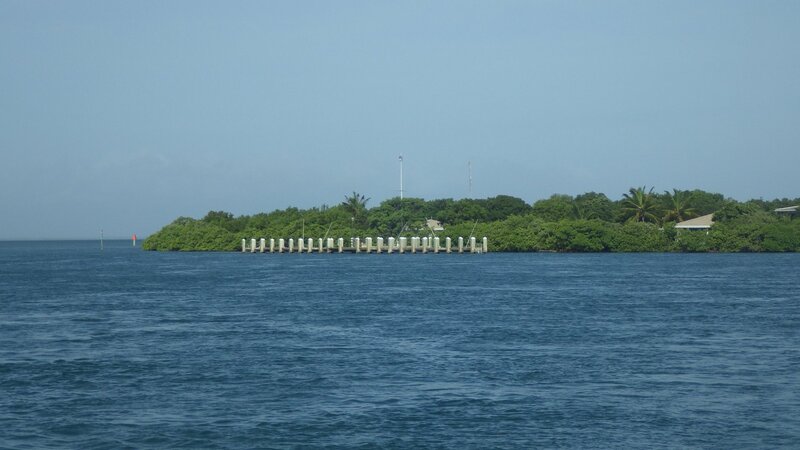 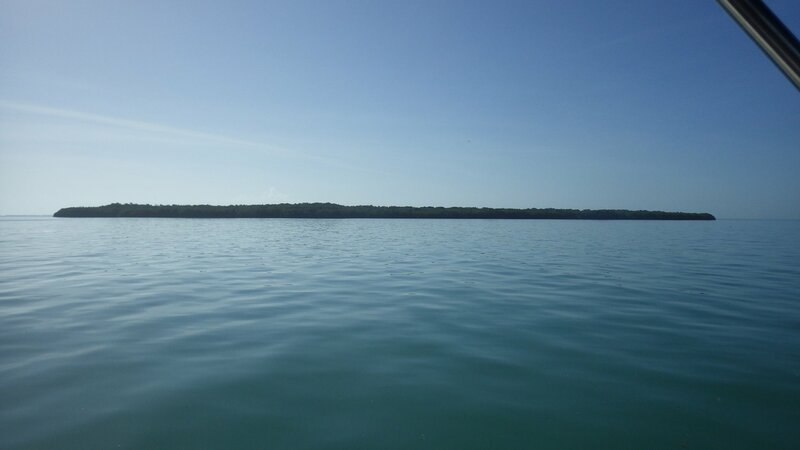 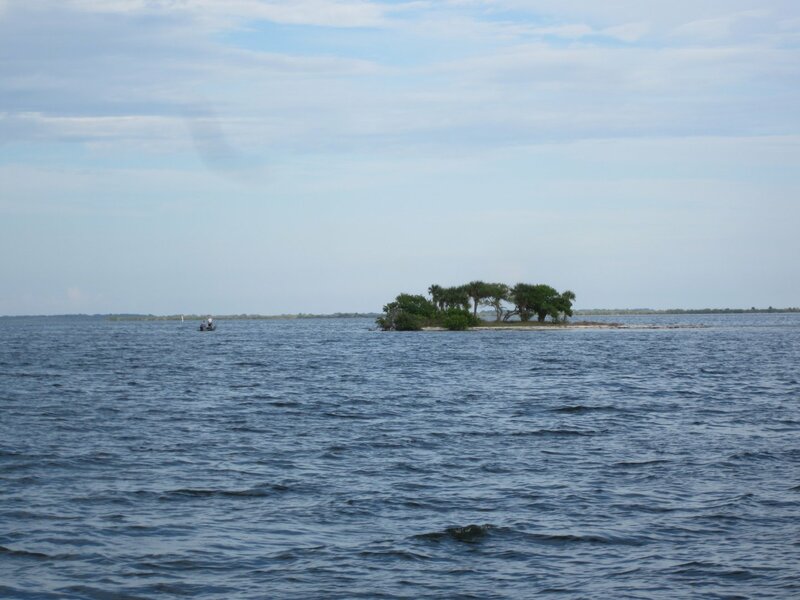 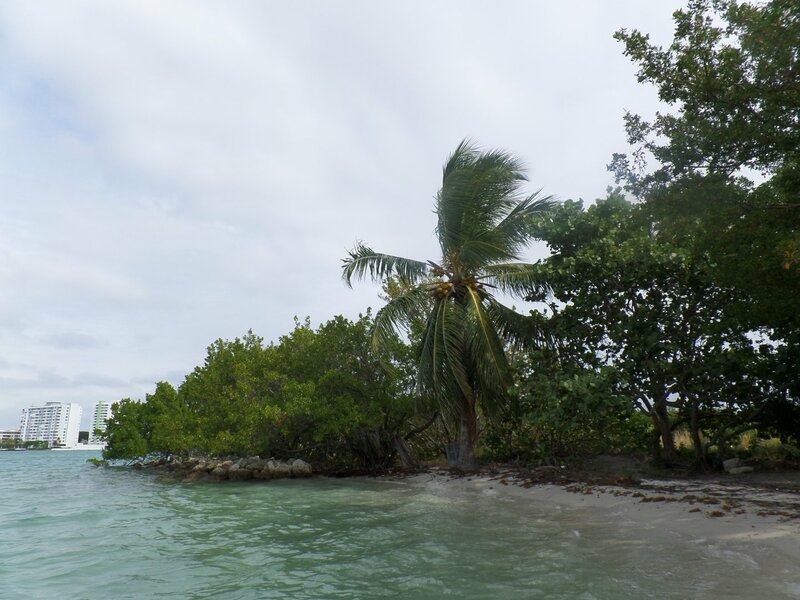 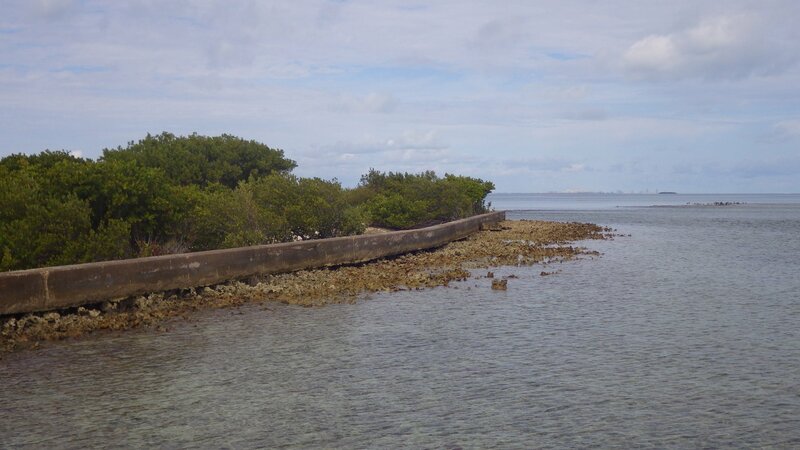 Anchored in Tavernier Key and again in Caesar Key. 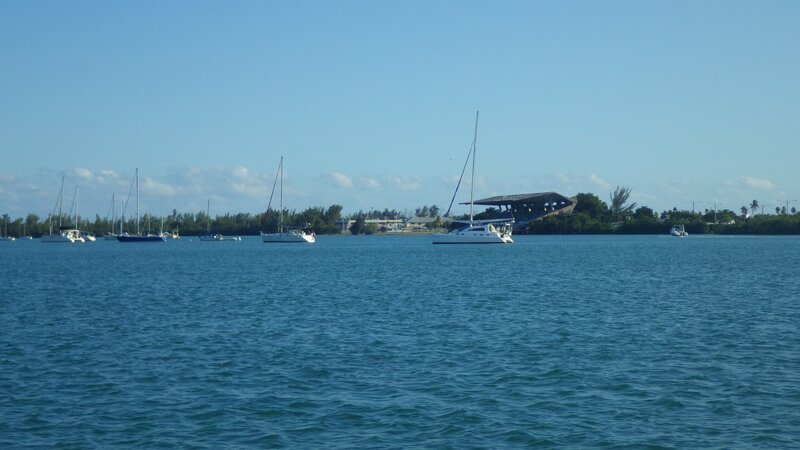 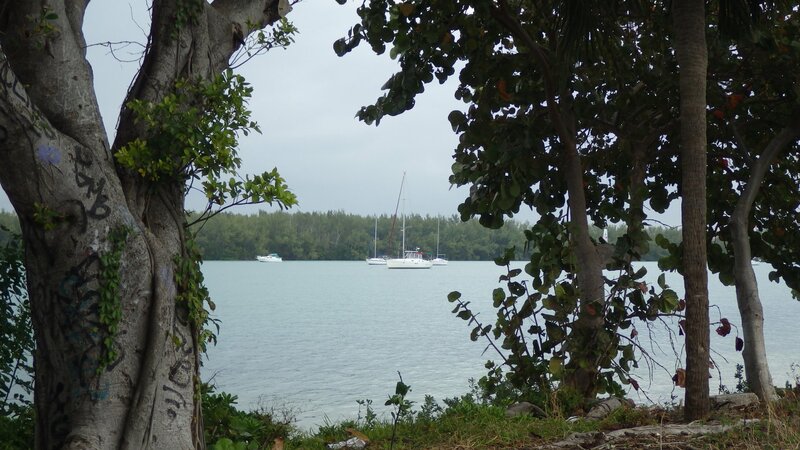 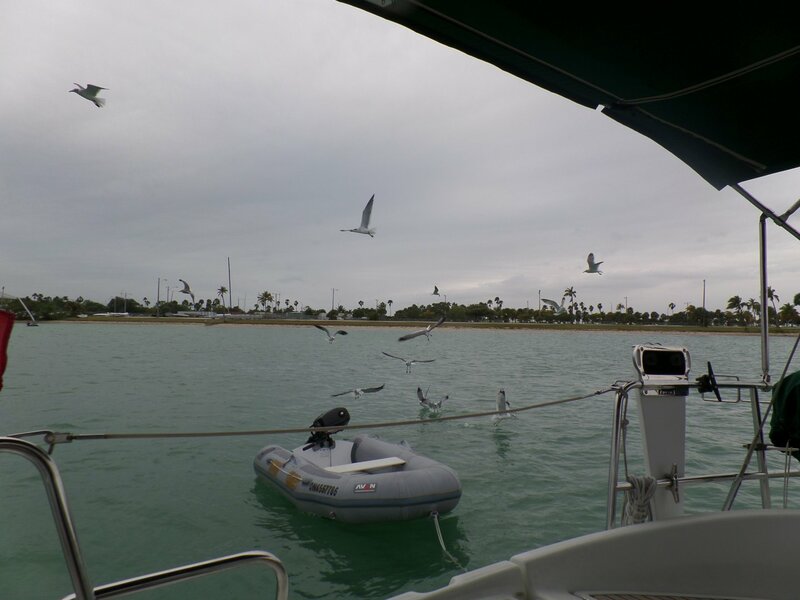 At Caesar Key, tried to anchor at another spot � run aground briefly, so anchored in the same spot as we anchored the previous time. 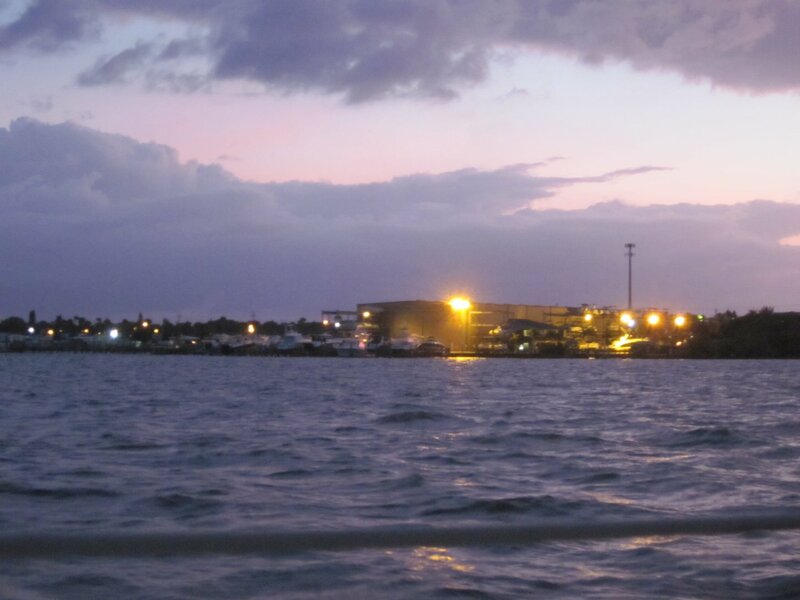 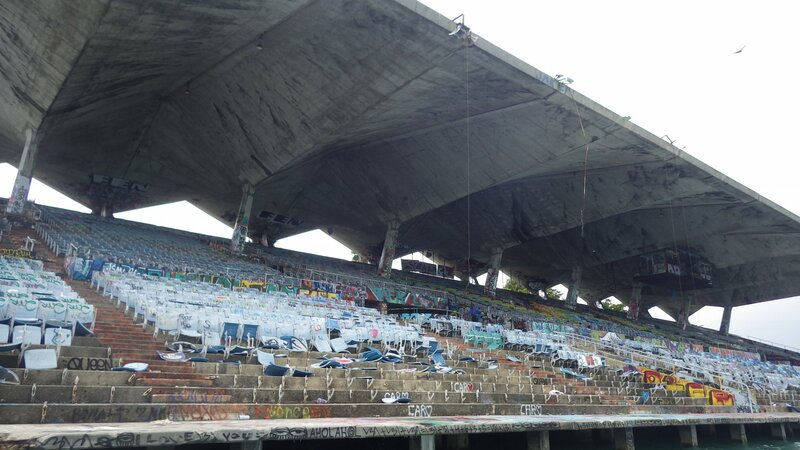 The place have very nasty mosquitoes � had to put mosquito nets on all ports and rush inside at sunset. 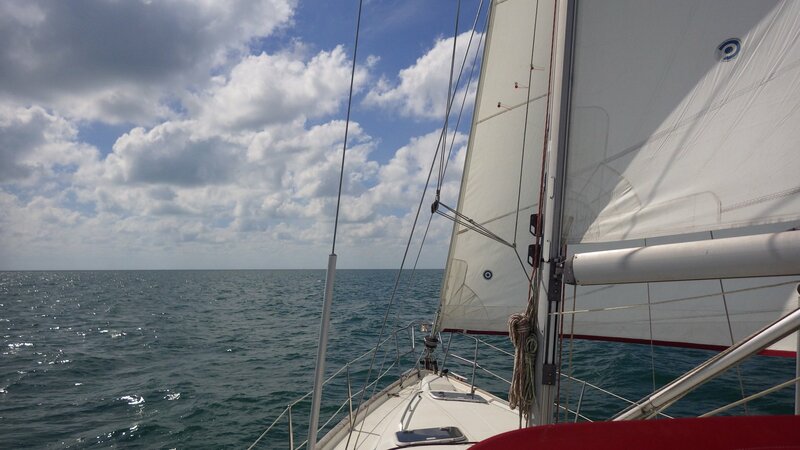 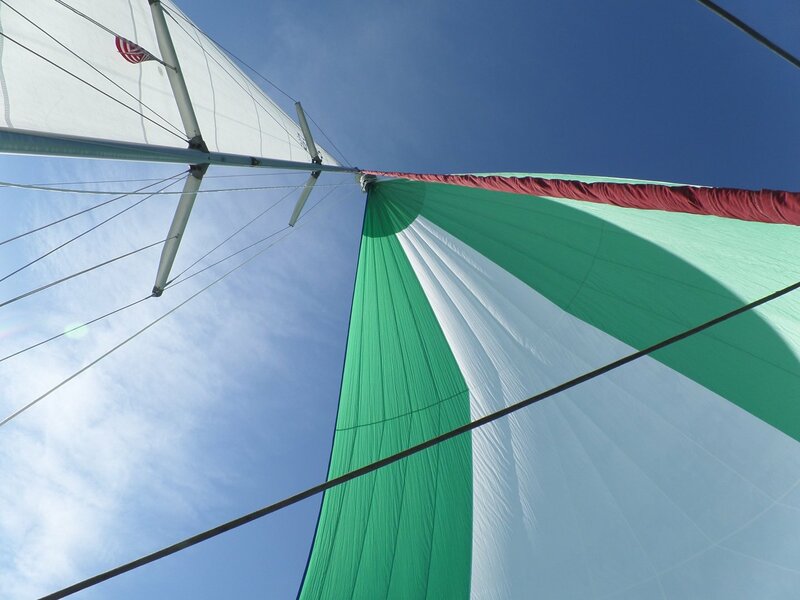 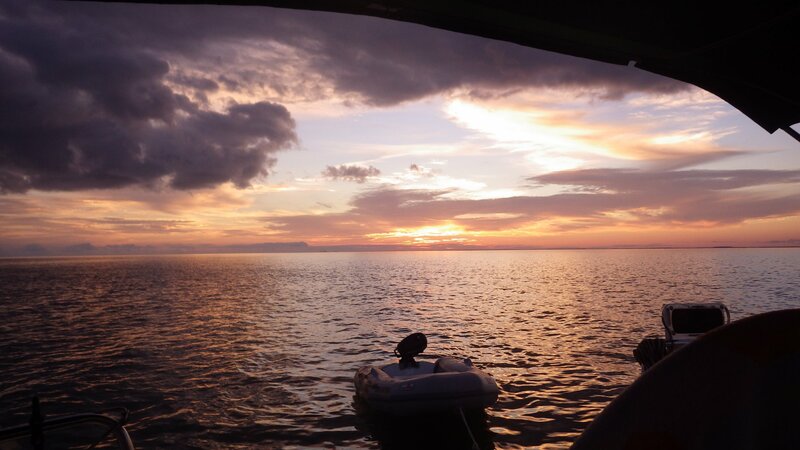 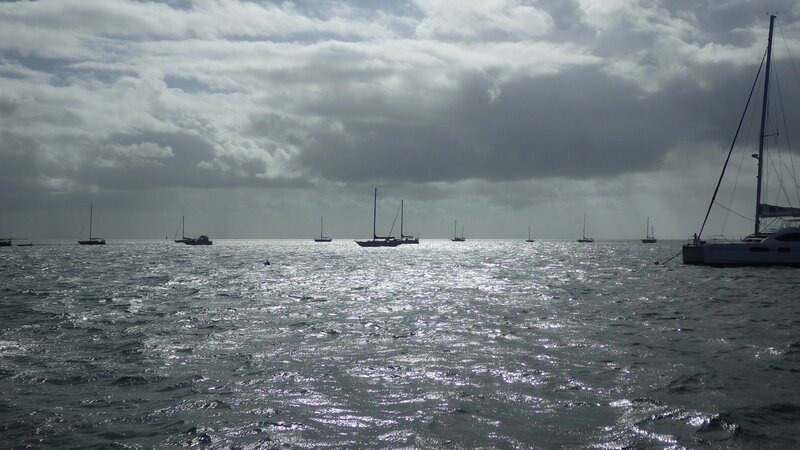 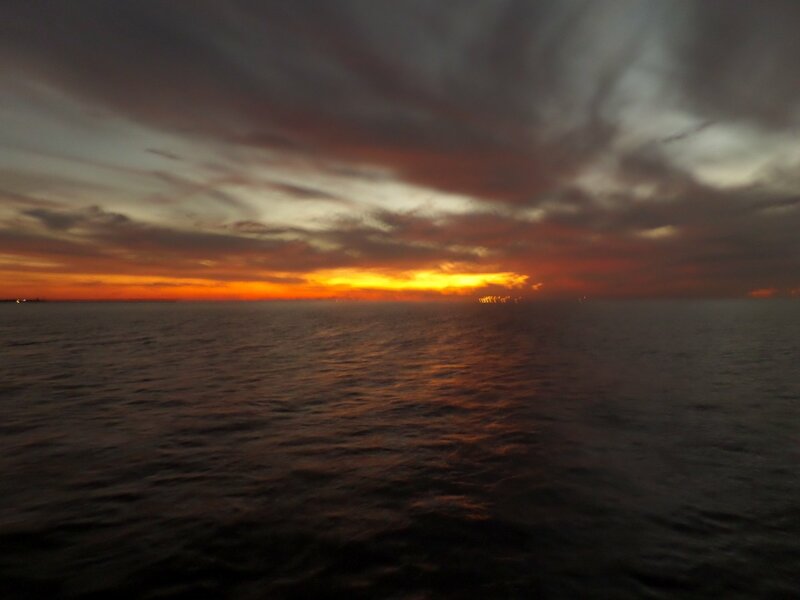 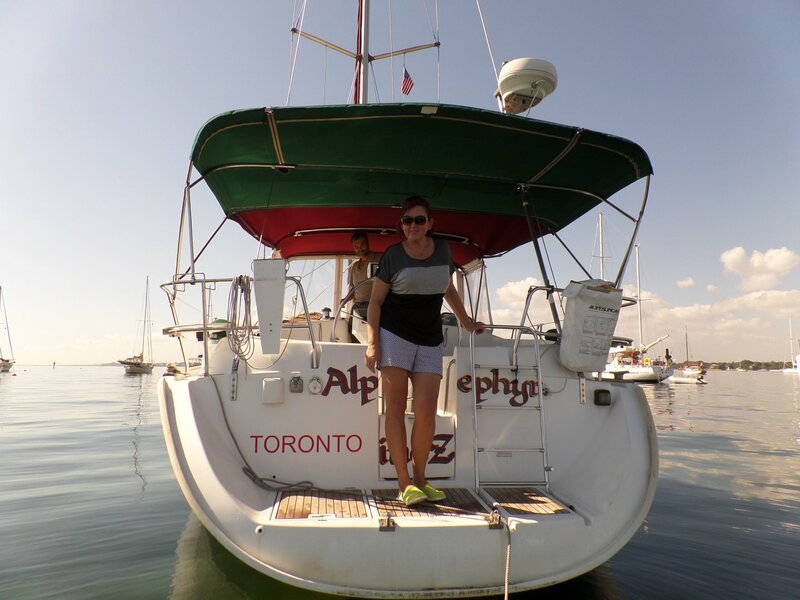 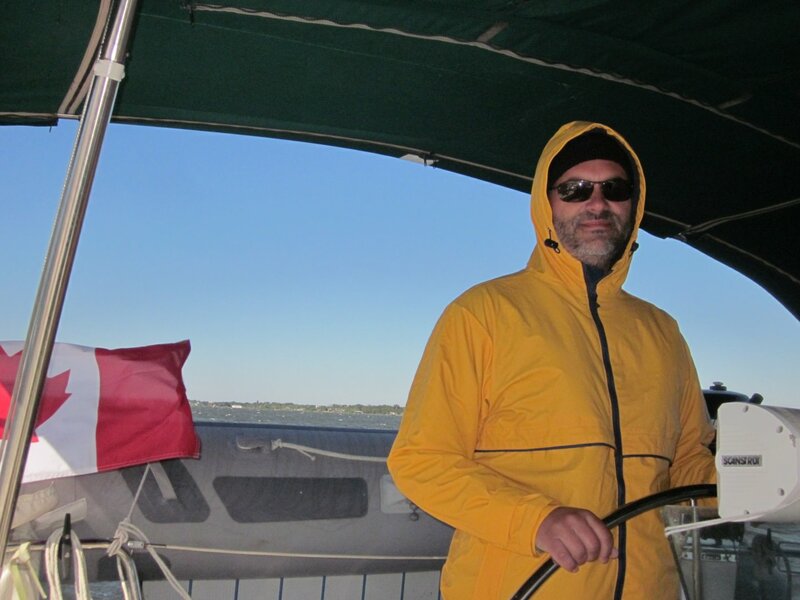 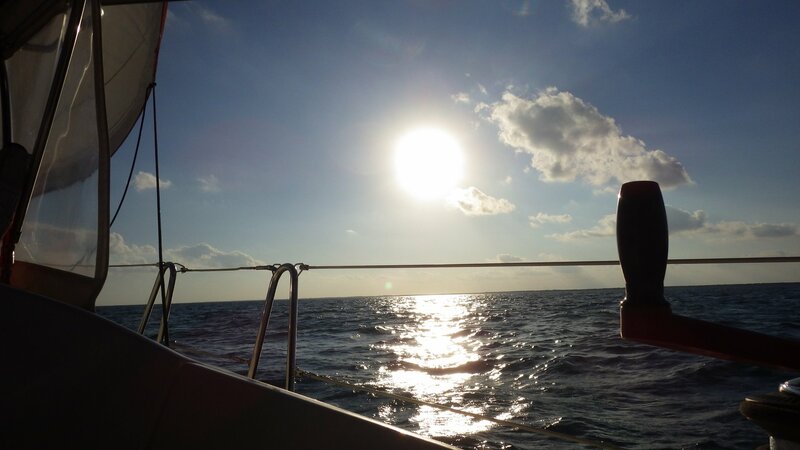 Weather either too rough with wind and waves on the nose or calm with no wind � mostly motoring, with some rough sailing. 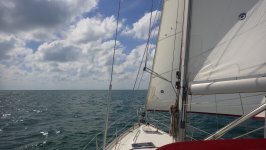 Spent several days moored in a well protected Boot Key harbor along the Florida Keys, also known as Marathon - waiting for the strong northern front to pass. 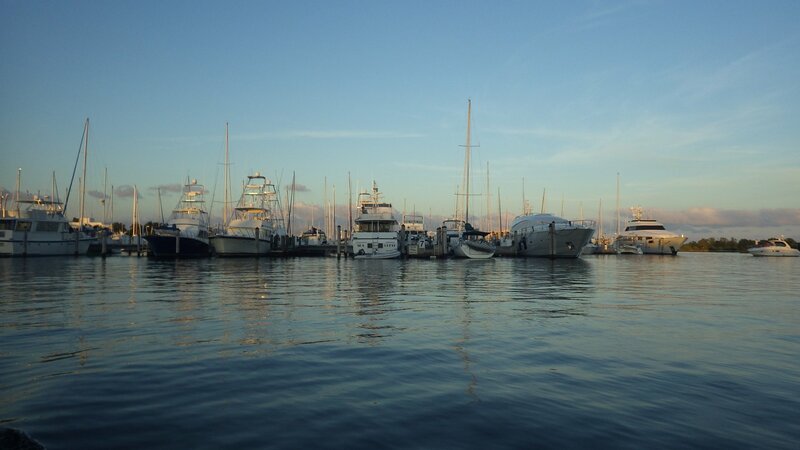 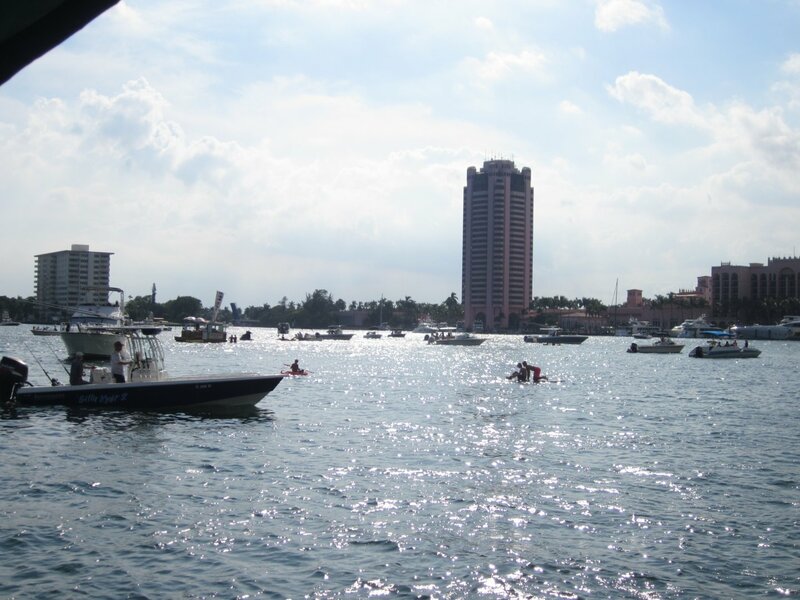 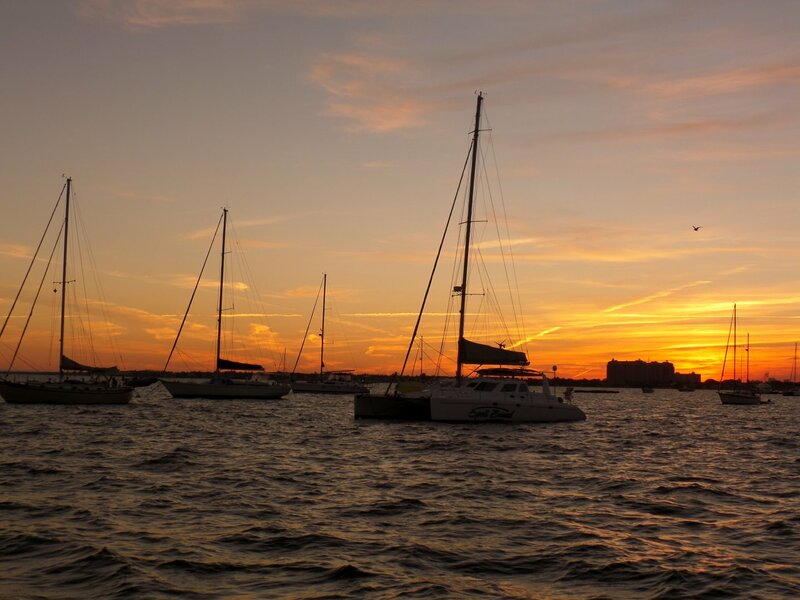 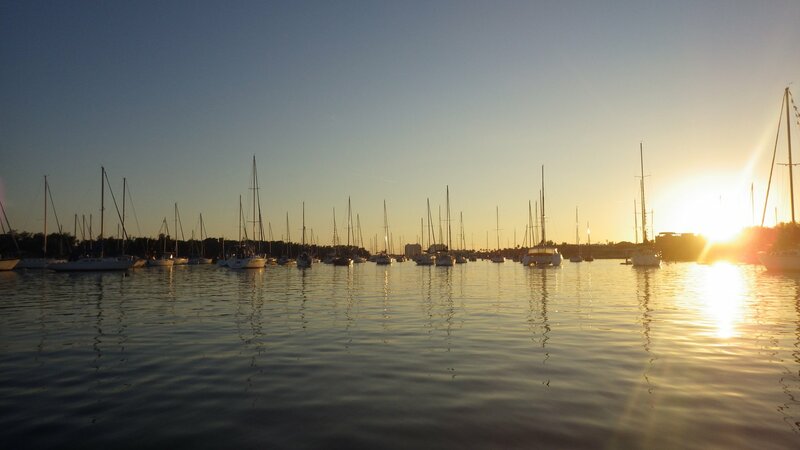 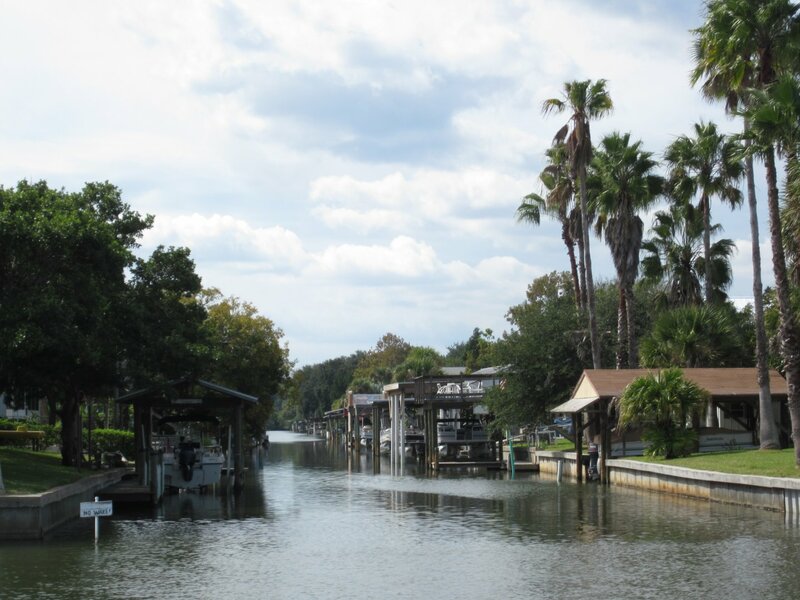 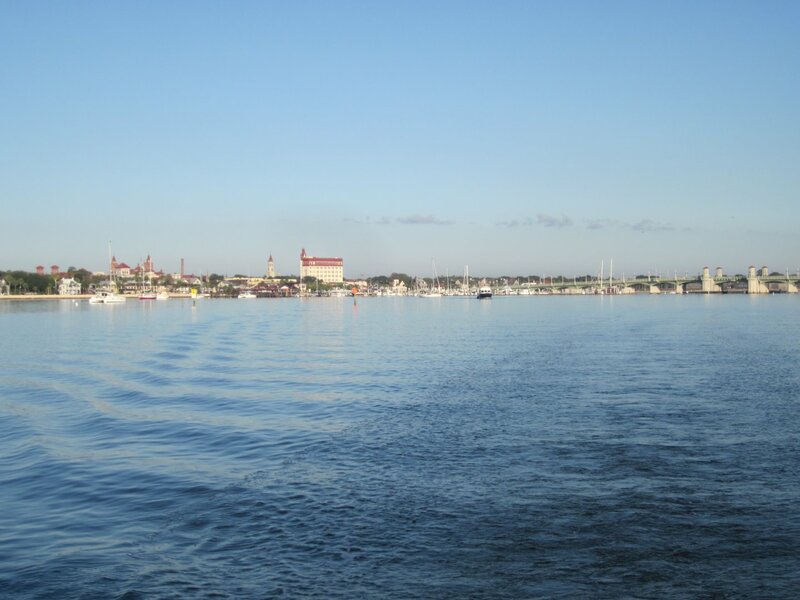 The pace is blanketed with moored boats � a popular winter destinations for many. 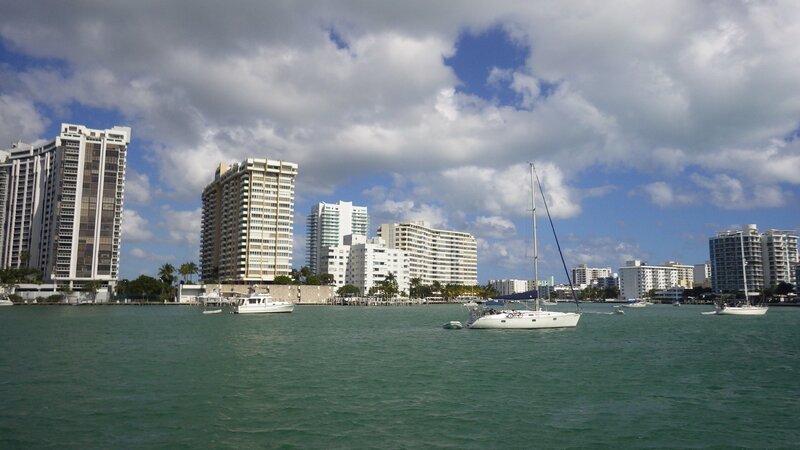 Taking some time to explore the town and area � in short, overrated. 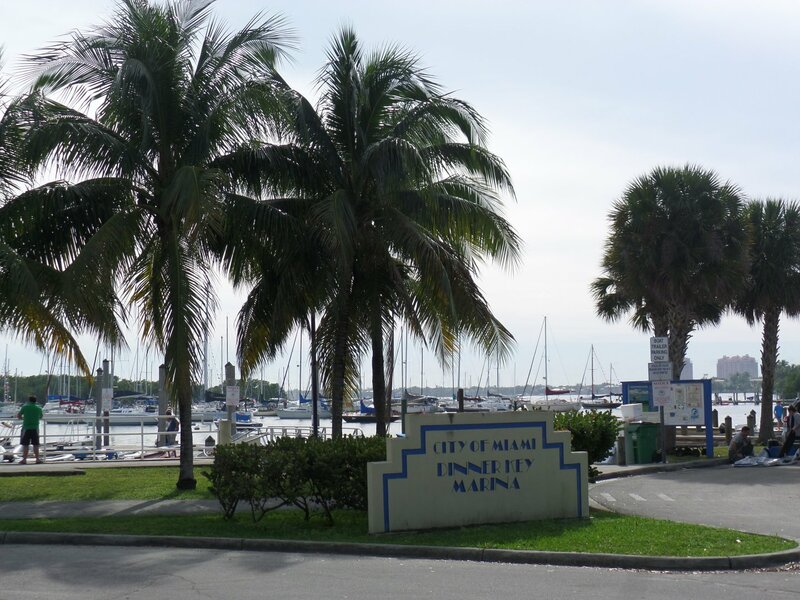 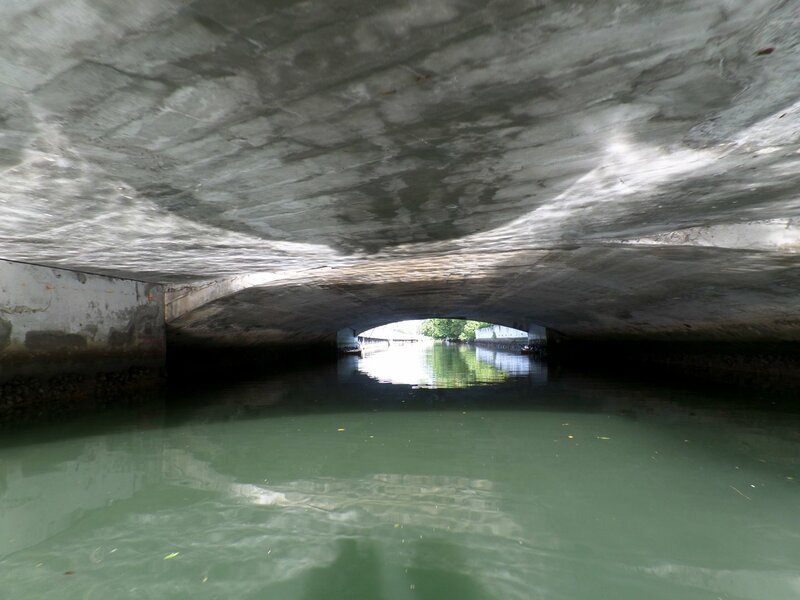 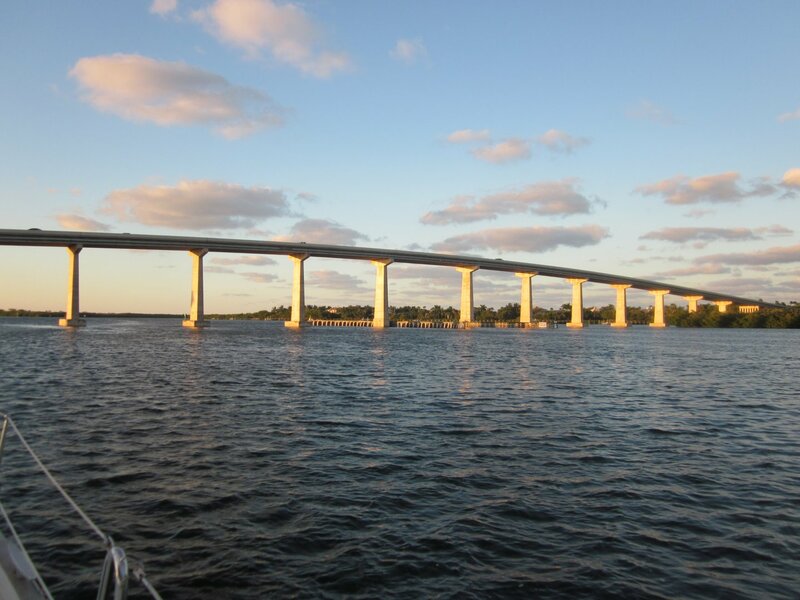 Expected to see one of the top spots for cruisers in the country... not impressed � mooring only (vey limited anchorages, if can find any), and the whole area is just a strip along the busy highway. 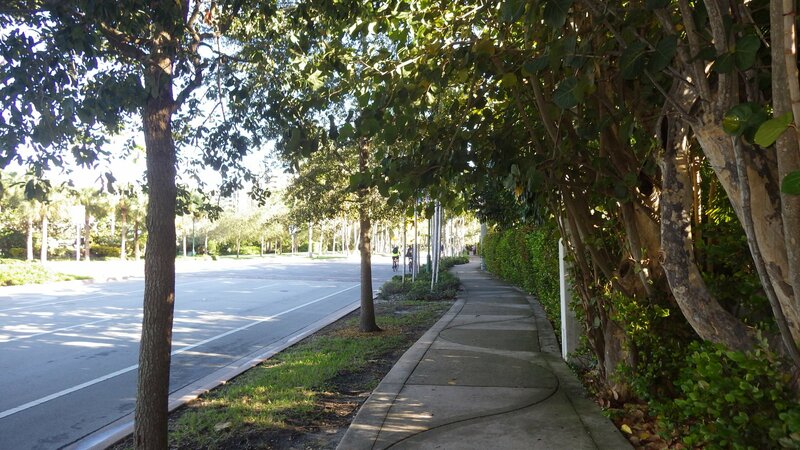 Although there is a good choice of services, shops and establishments nearby, the walking distances between them are long (most bike). 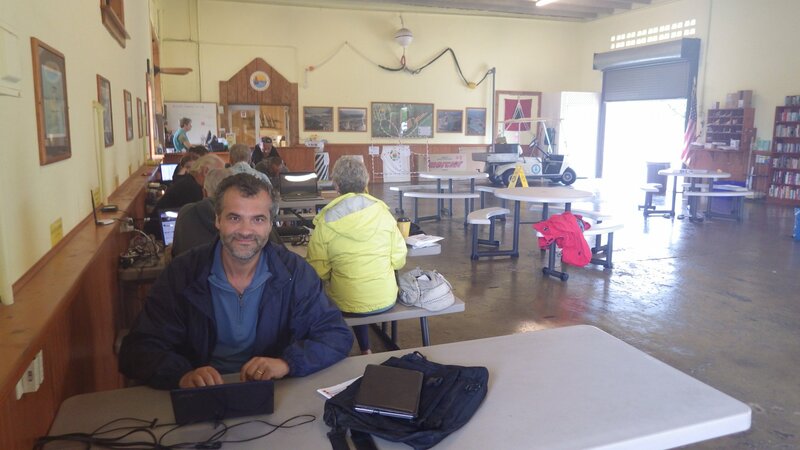 There is a fairly active Cruisers Net (VHF 68 @ 09:00) and social events. 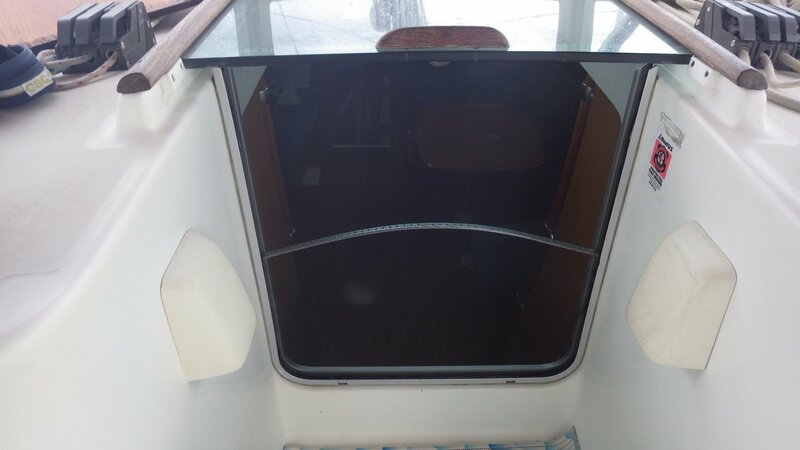 Had a chance to do some boat maintenance � re-bedded sanctions and sealed ports to fix water leaks, replaced the freezer thermostat. 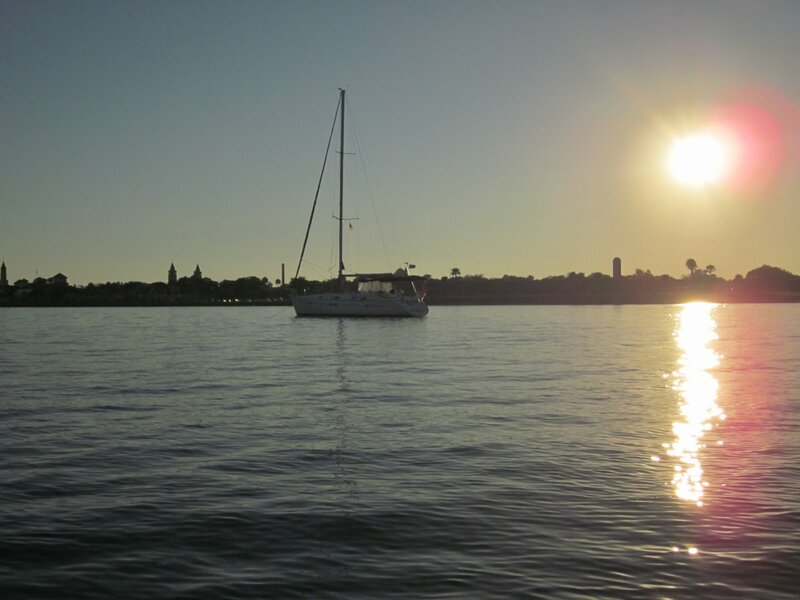 Anchored near Belle Isle. 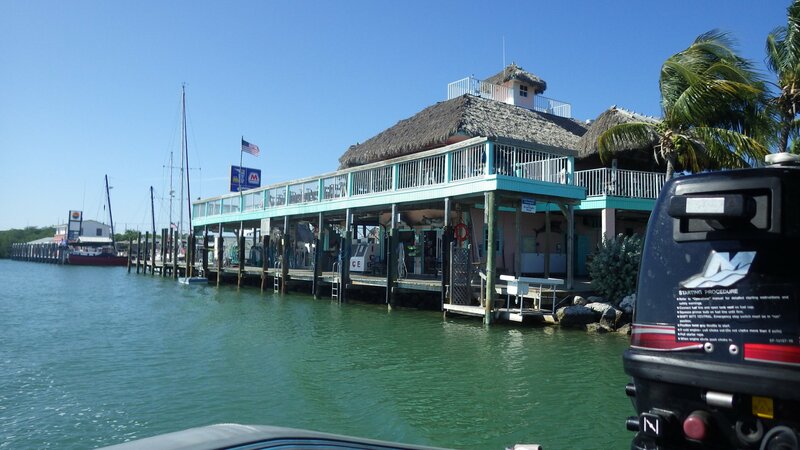 Stayed here on several occasions. 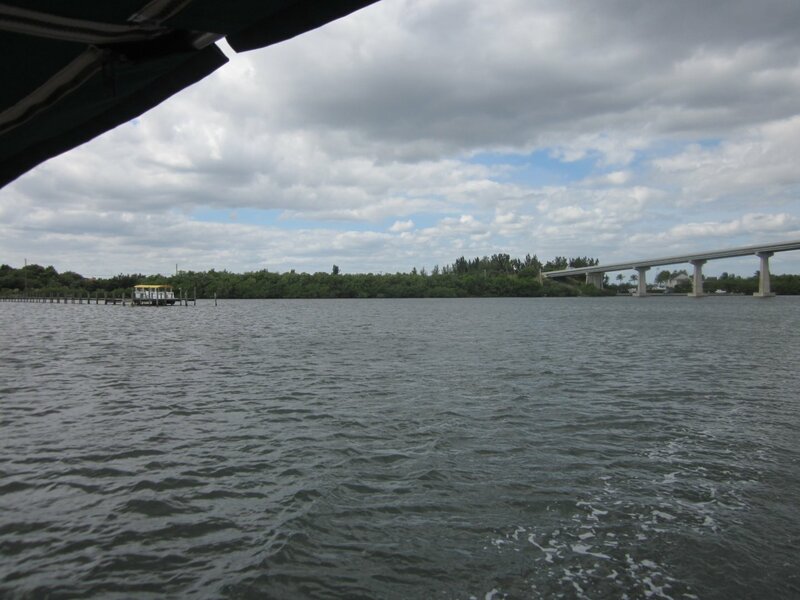 Unexpectedly, very rolly and uncomfortable place (due to passing bridge traffic). 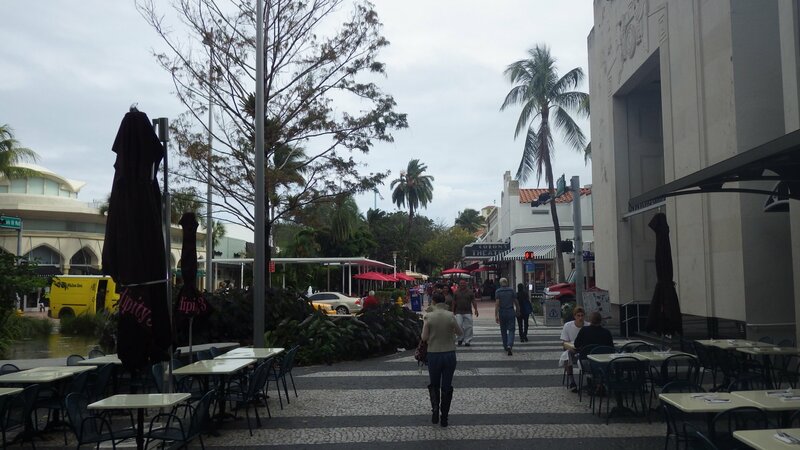 On the plus side, a very convenient access to tourist shopping area (Lincoln), some walk to Miami Beach, hardware store, restaurants, post office (dysfunctional! 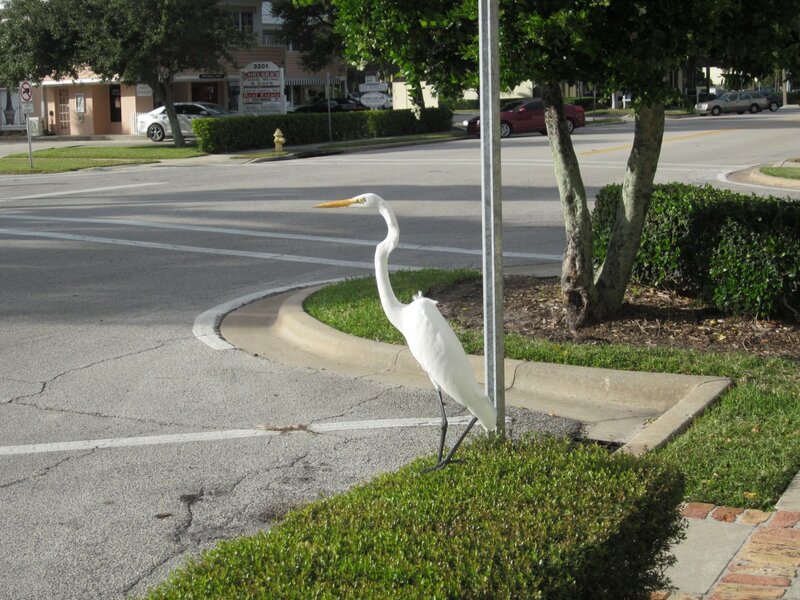 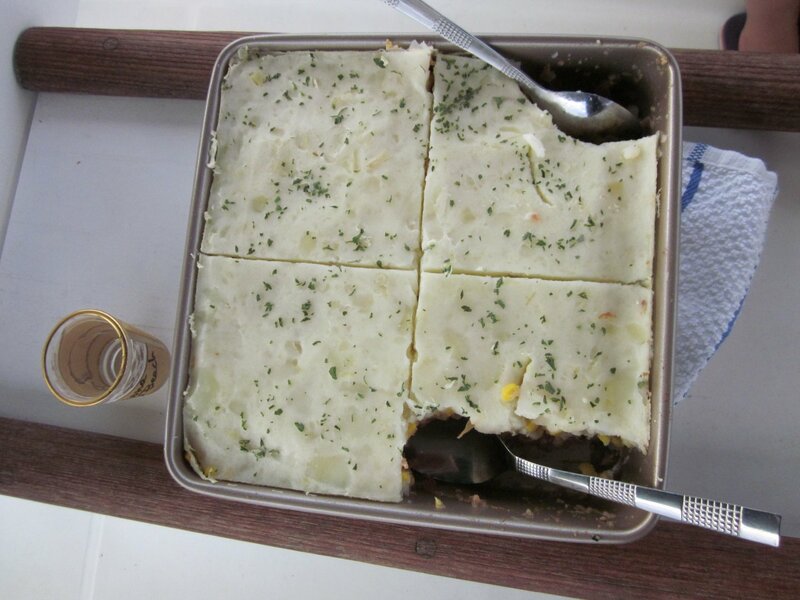 ), and dinghy + walk across the street to the Publix's provisioning. 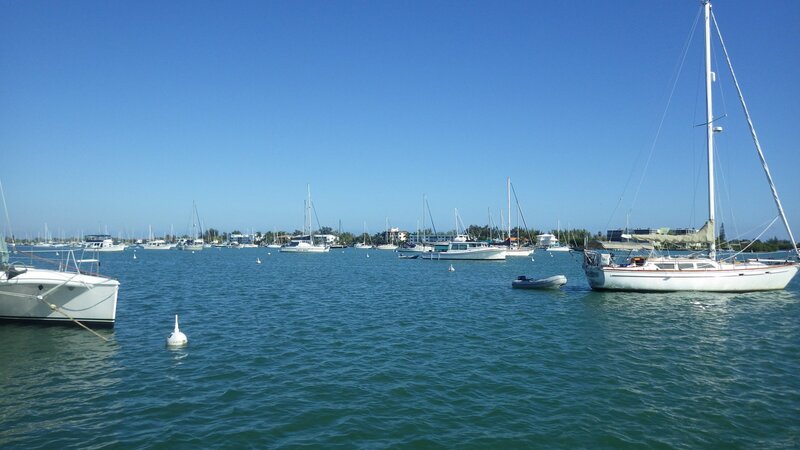 Arranged to replace boat's house batteries while here as well. 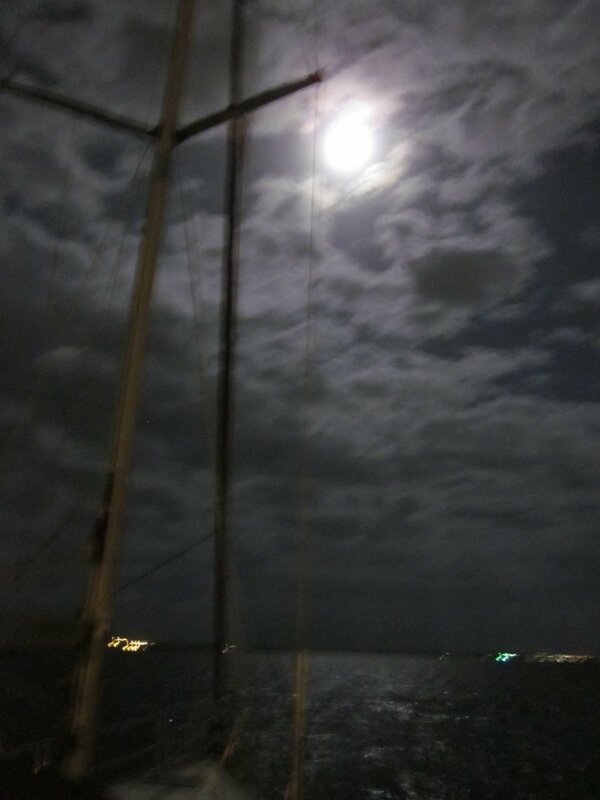 One night a big trawler anchored windward from us, without anyone on board, started to drag its anchor in the middle of the night towards us and other boats. 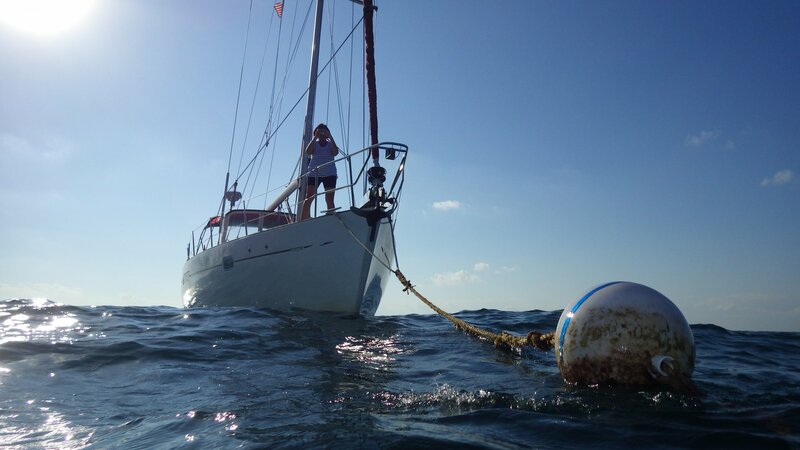 We had to re-anchor further away at 5am! 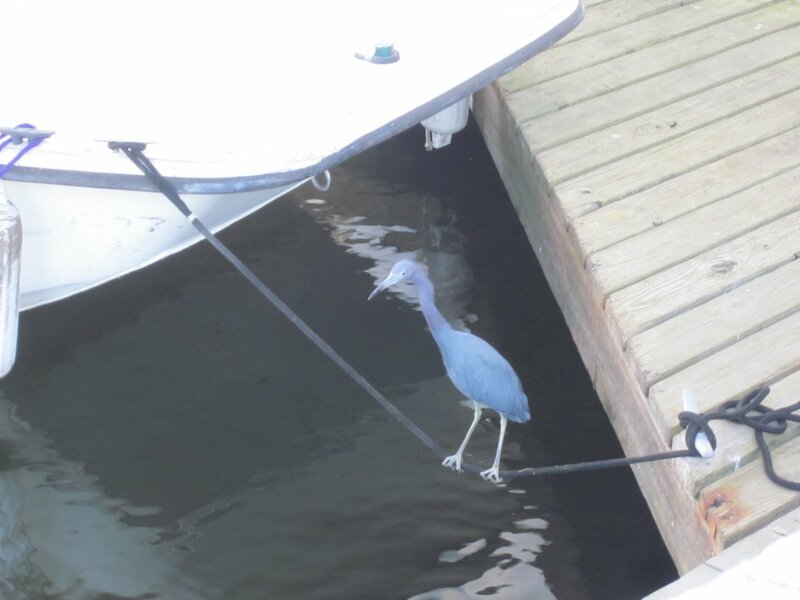 Owner showed up next day. 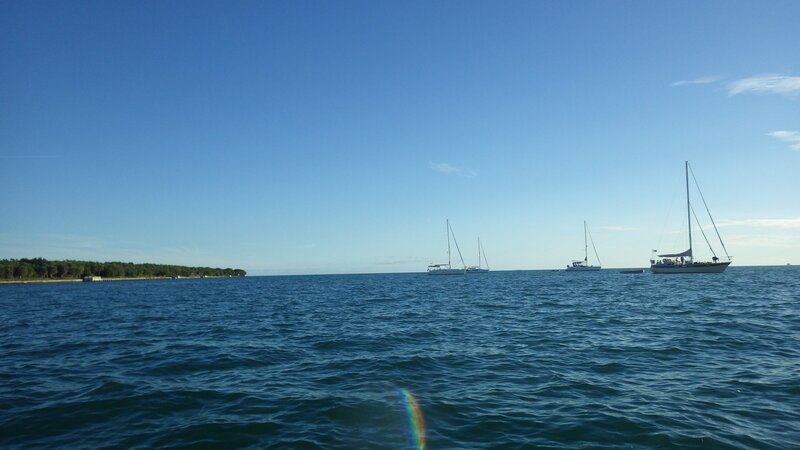 We dinghied over to him for a discussion � he was quite apologetic, and later moved his boat to another anchorage nearby. 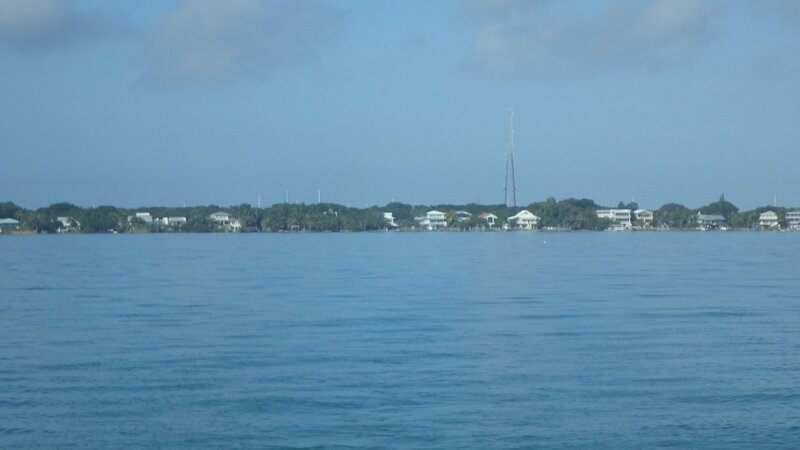 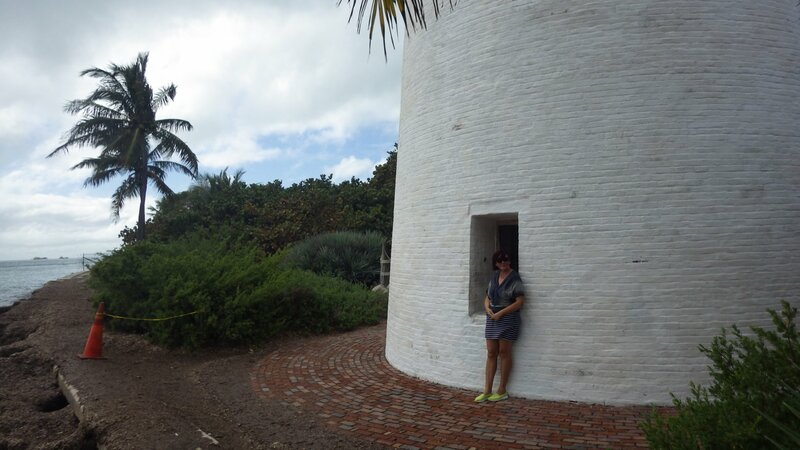 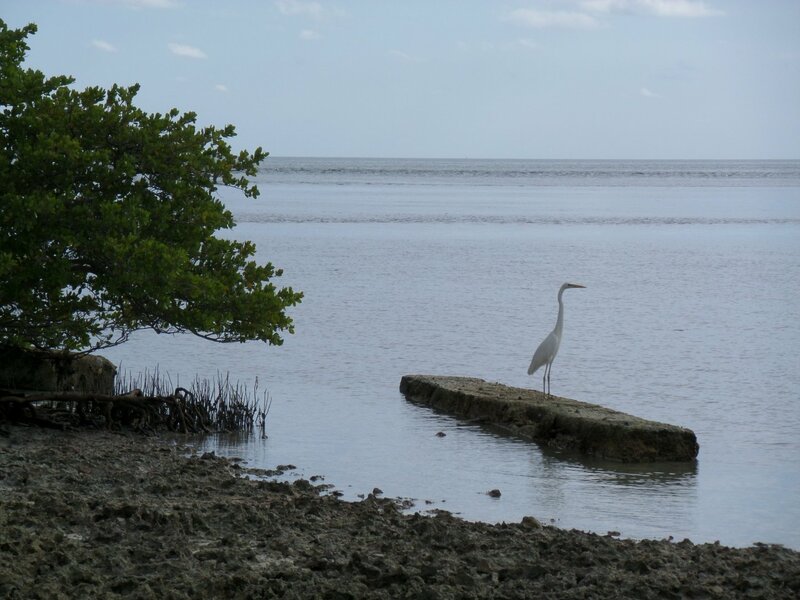 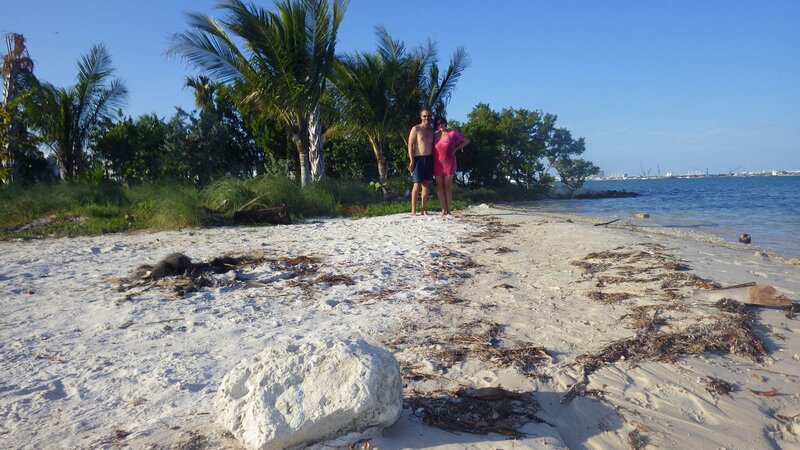 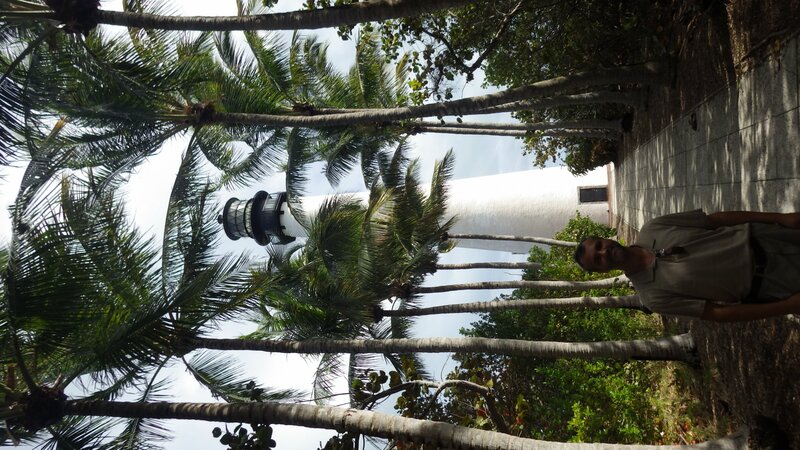 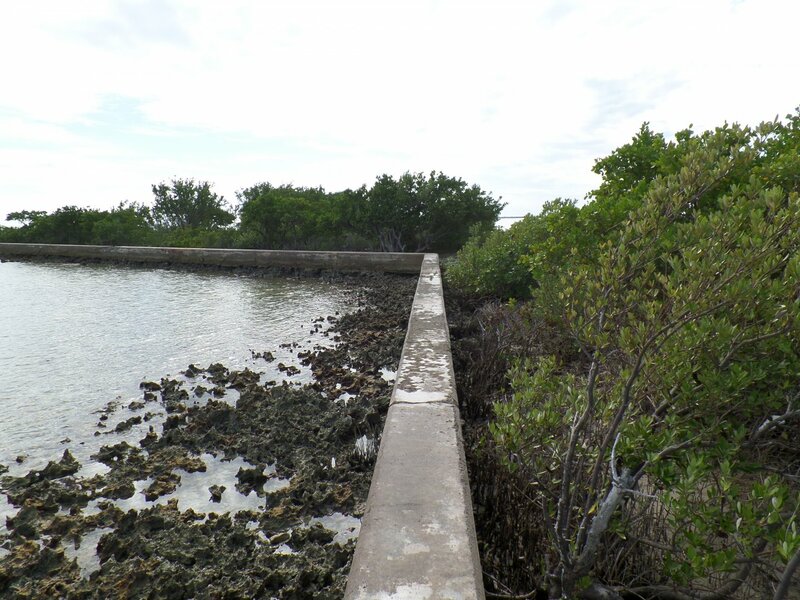 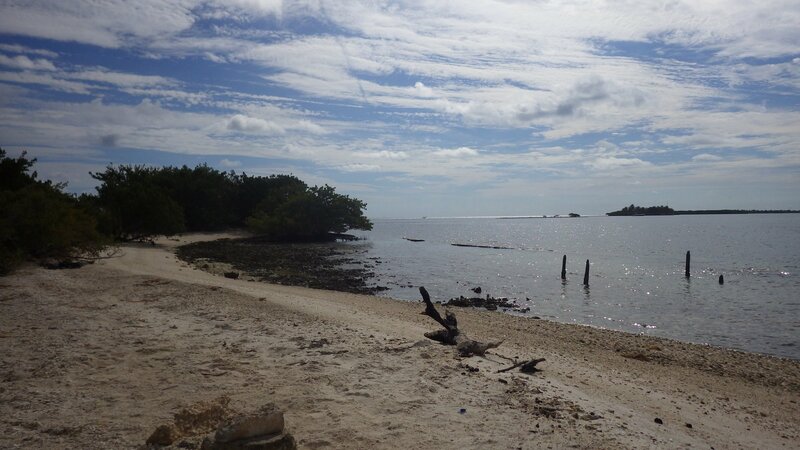 Stayed in the lee of Rugged Keys island for 2 days, during visit of our daughter. 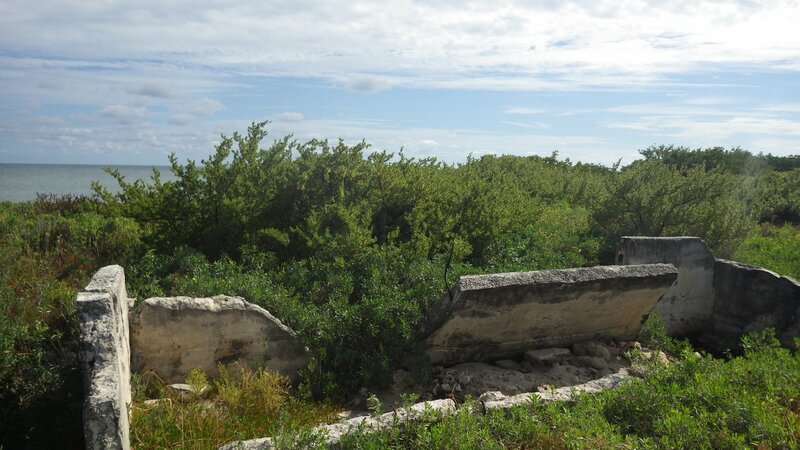 Small interesting island, with some ruins. 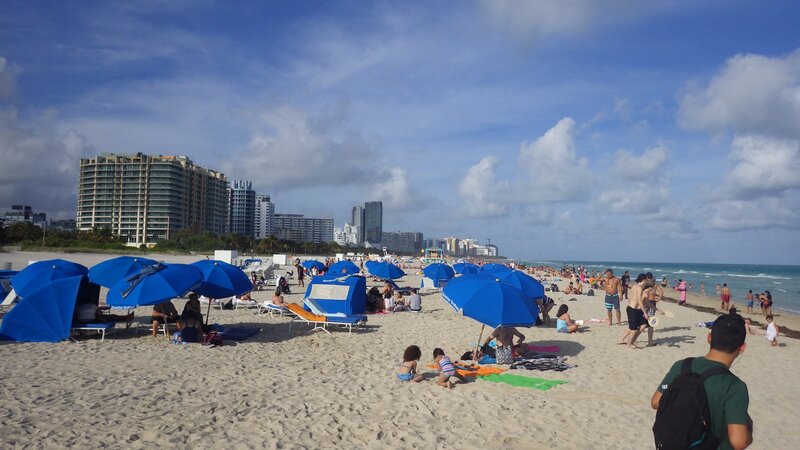 Popular spot on a weekend. 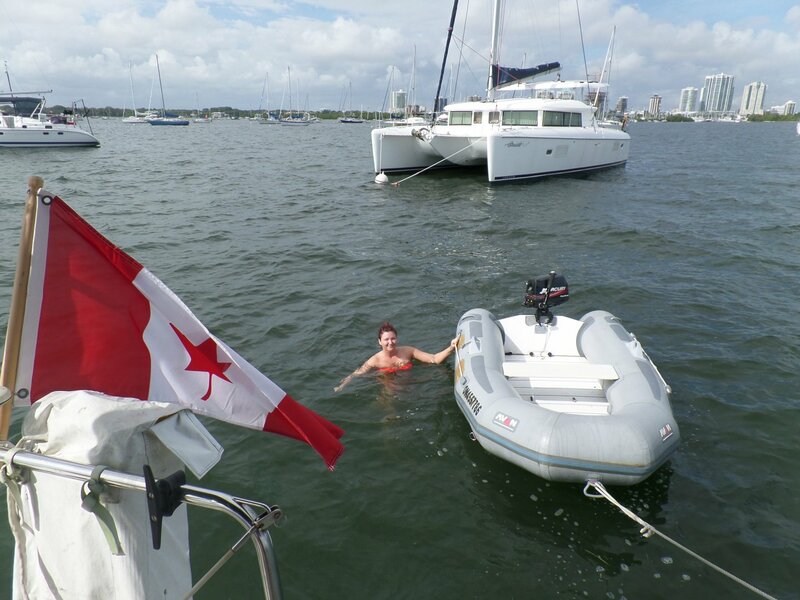 Making final preparations and waiting for a suitable weather window to cross the Gulf Stream to Bahamas. 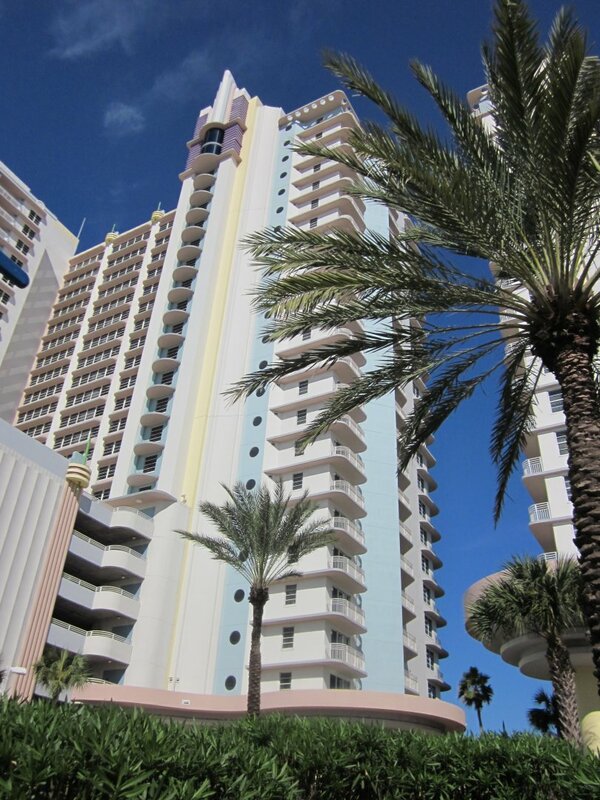 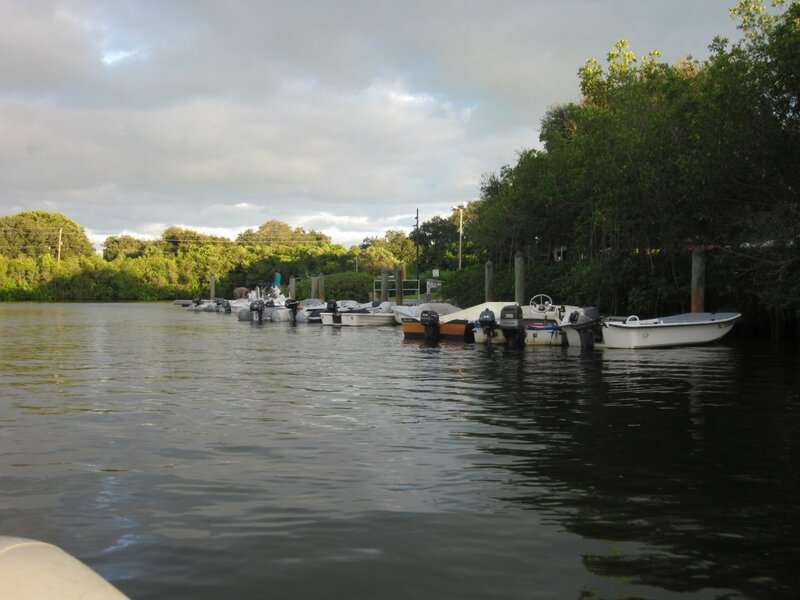 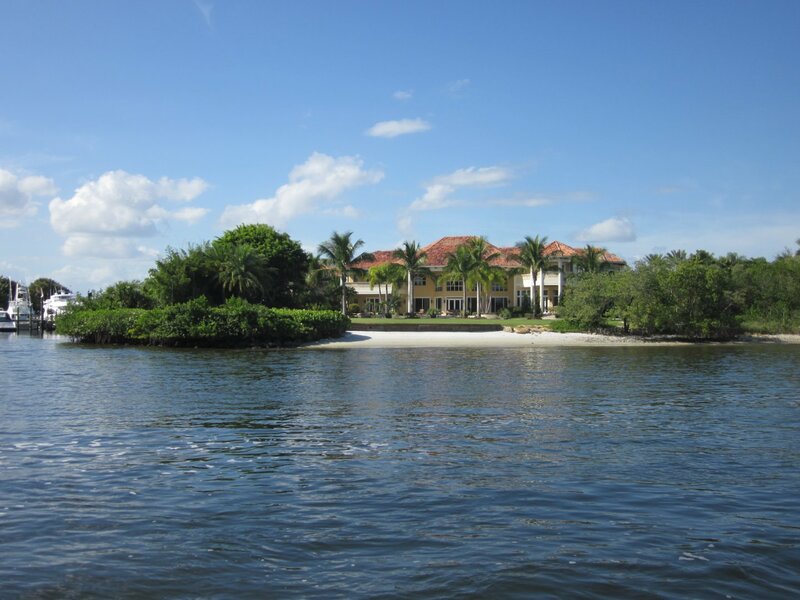 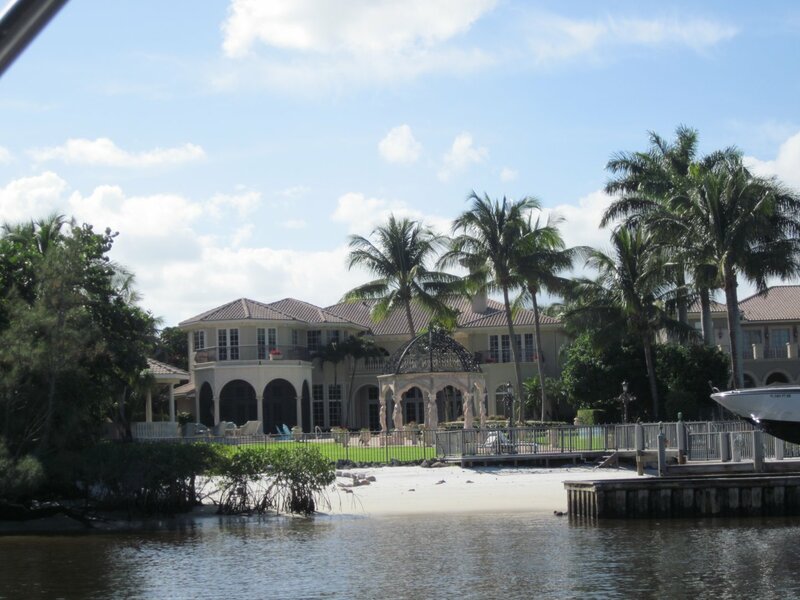 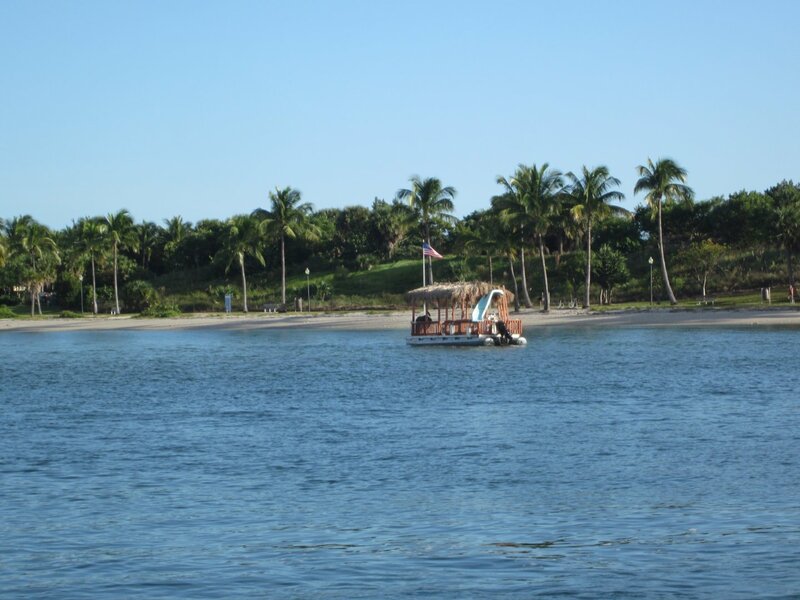 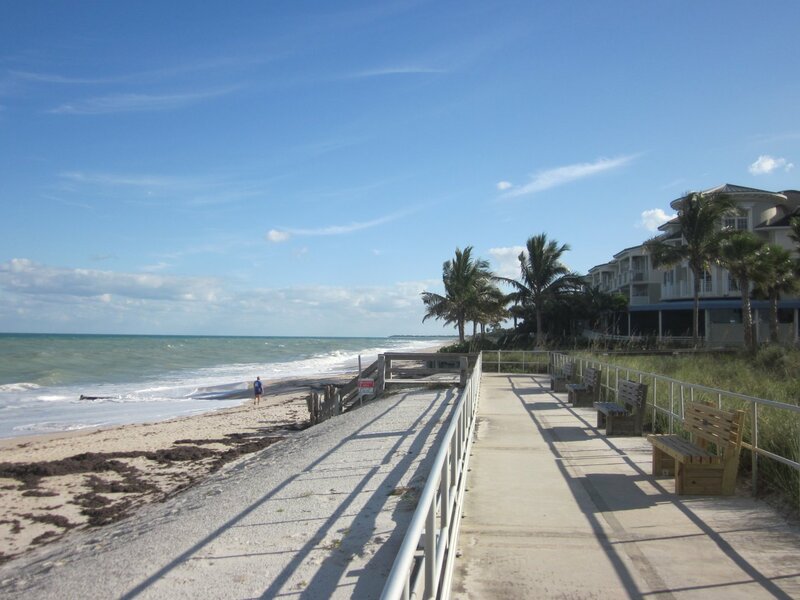 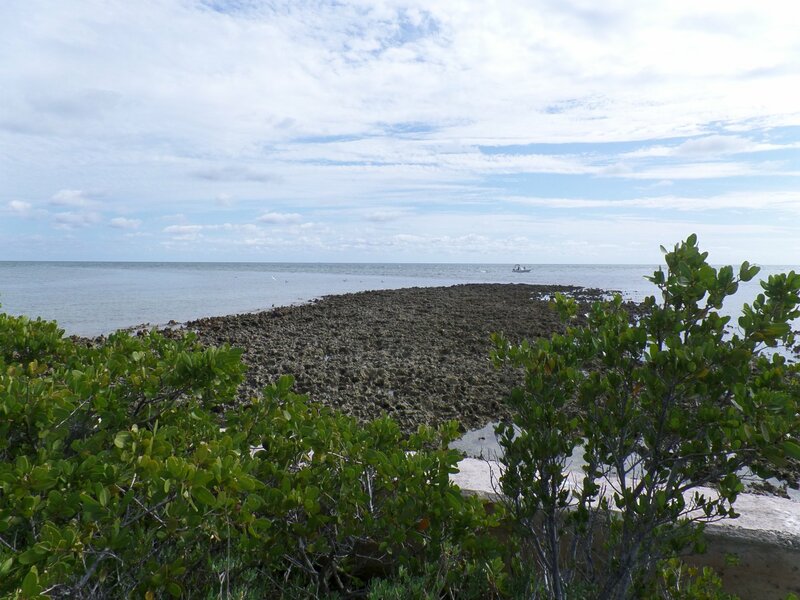 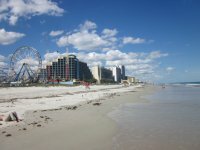 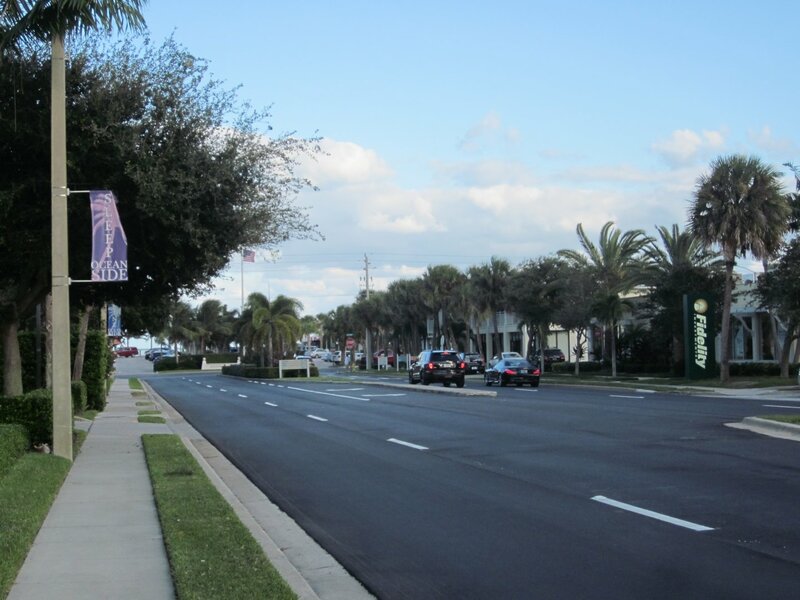 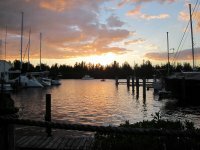 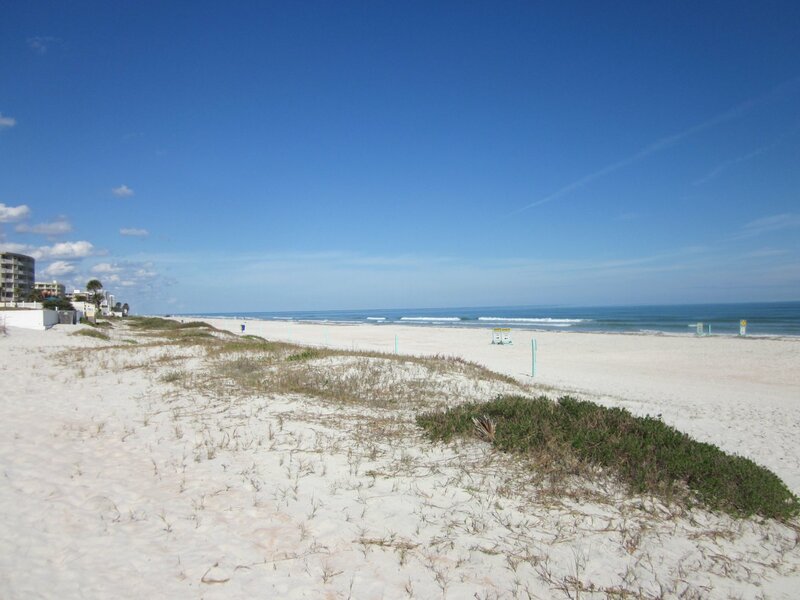 Stayed 2 nights at the Cape Florida near No Name Harbour � a convenient jump-off spot for the passage. 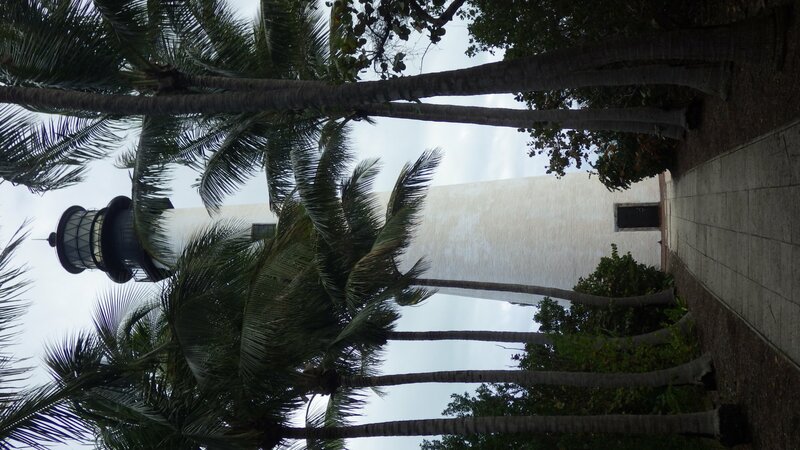 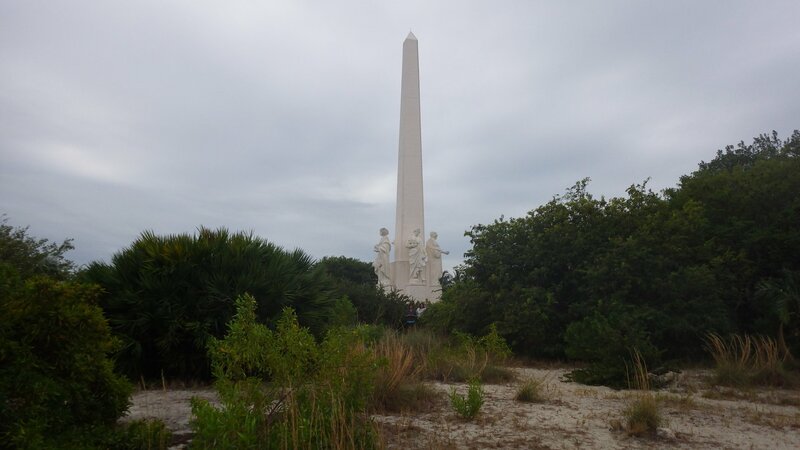 Did some laundry, walked around the park, visited Cape Florida Lighthouse, had a lunch in a local restaurant, picked up some last minute groceries, checked weather reports.